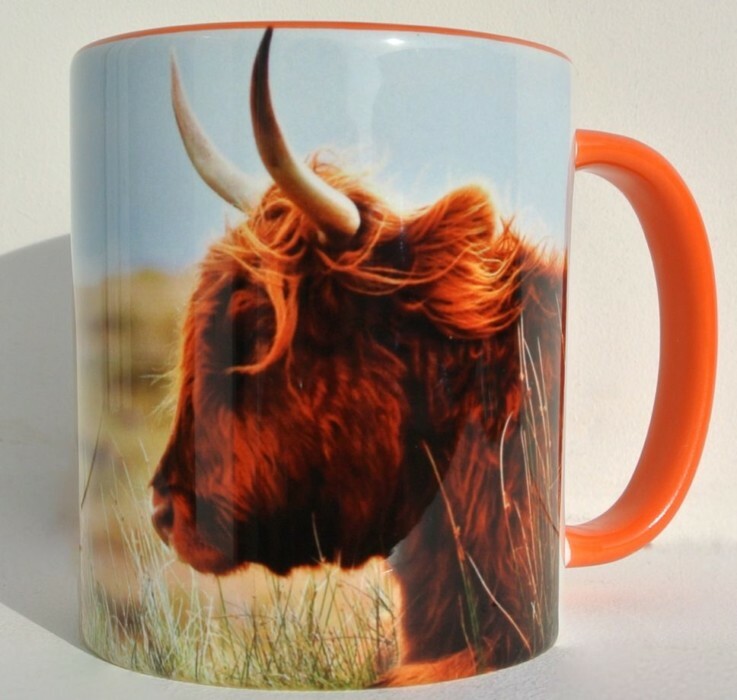 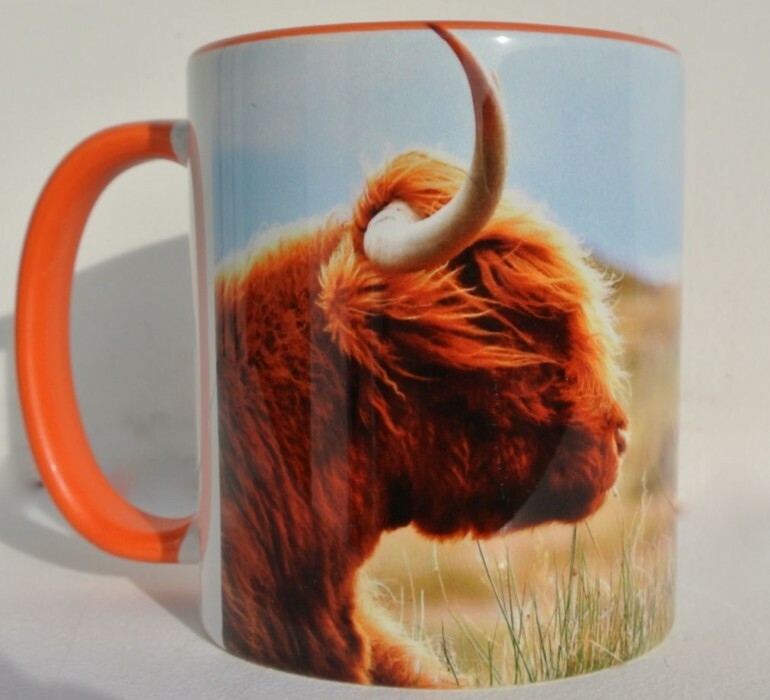 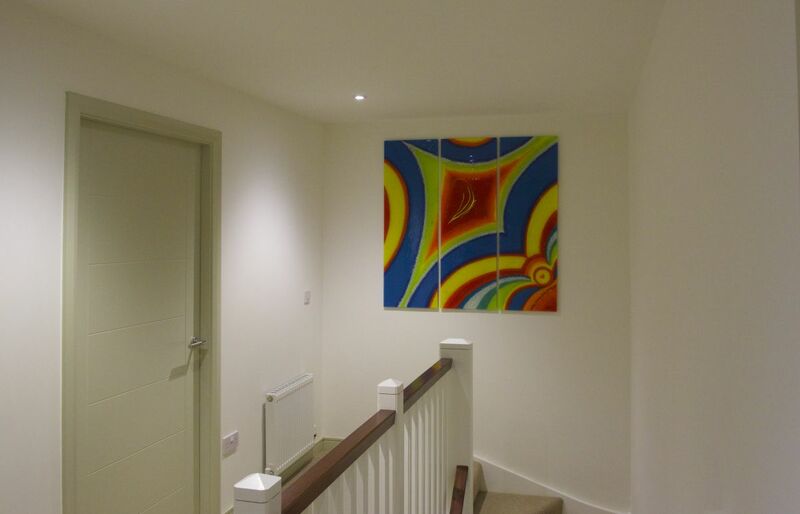 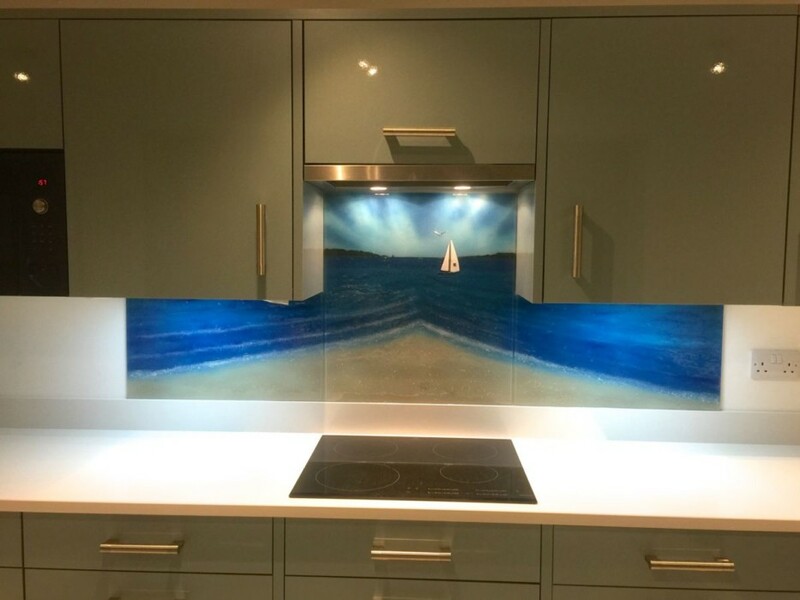 We owe this particular feature to the client who ordered it in Saltcoats, Ayrshire. 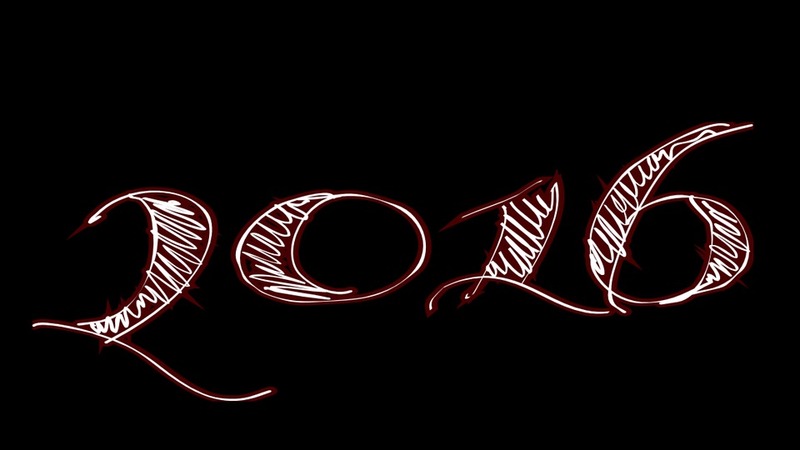 While a picture is worth more than a thousand words, we thought we’d take the chance to add just a few more on top of that. 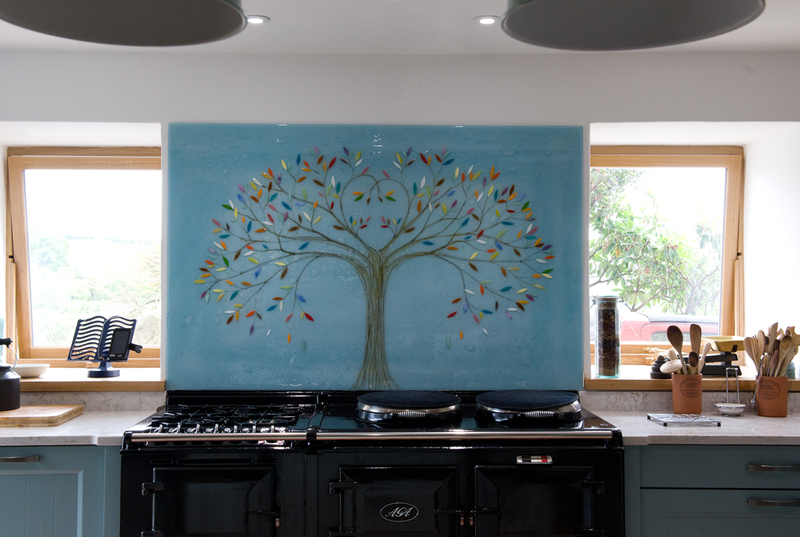 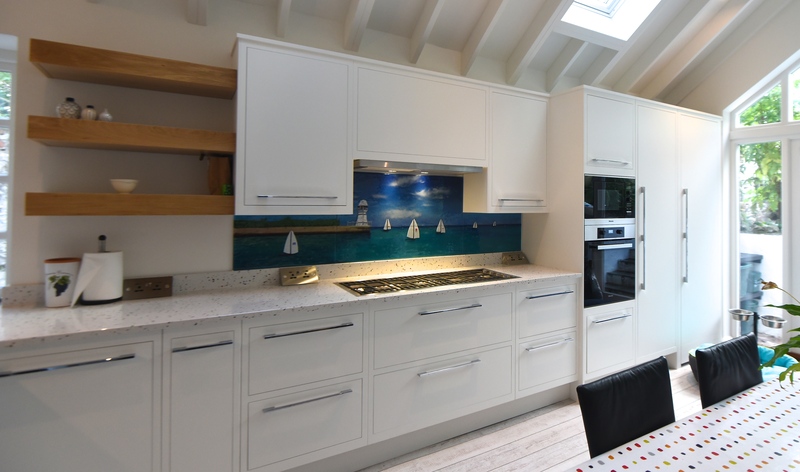 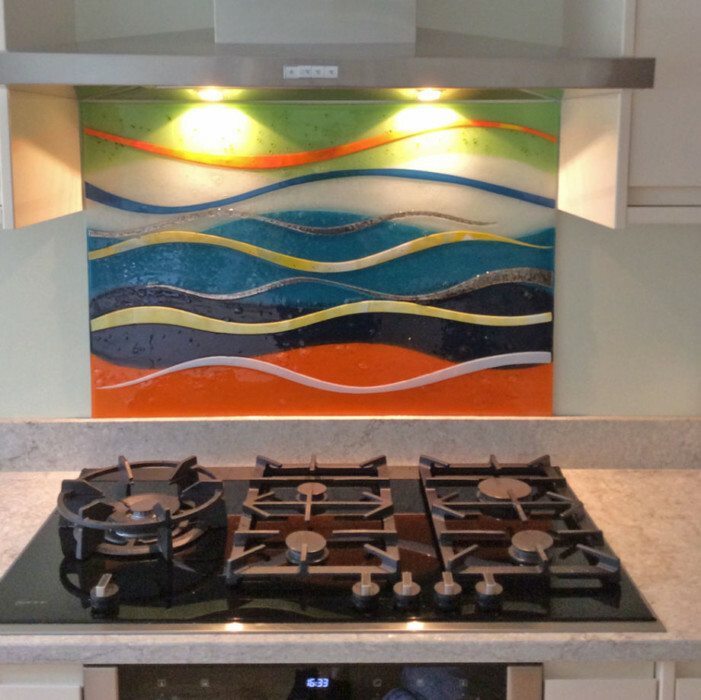 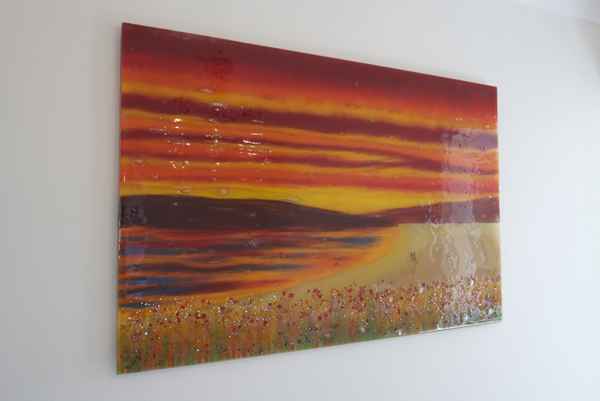 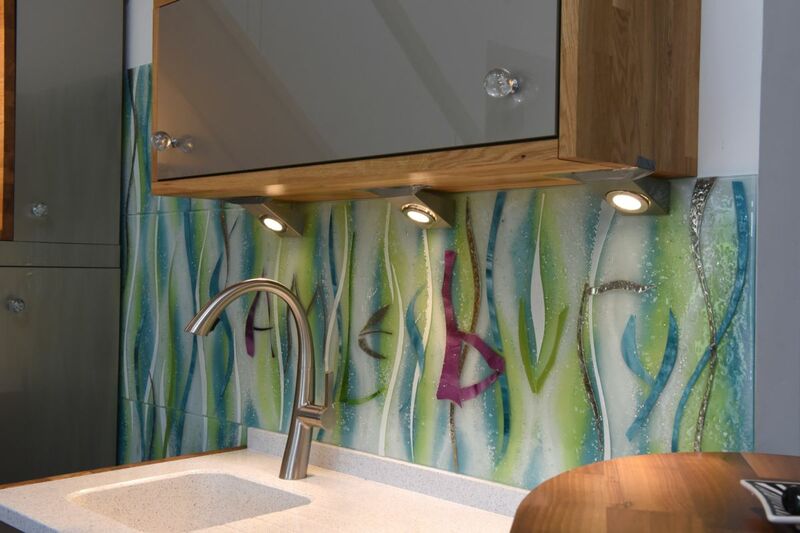 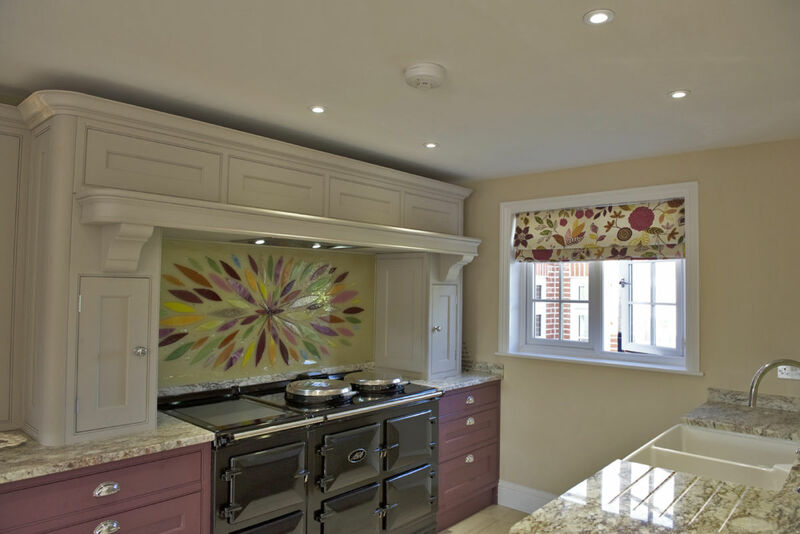 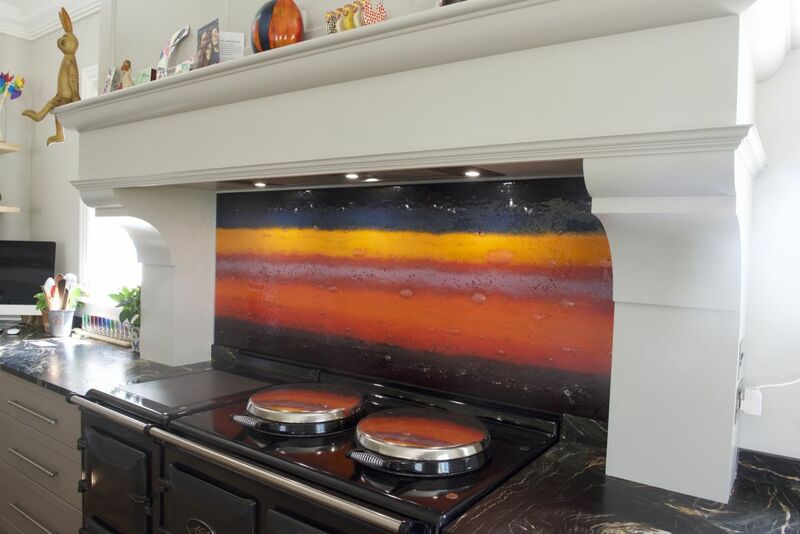 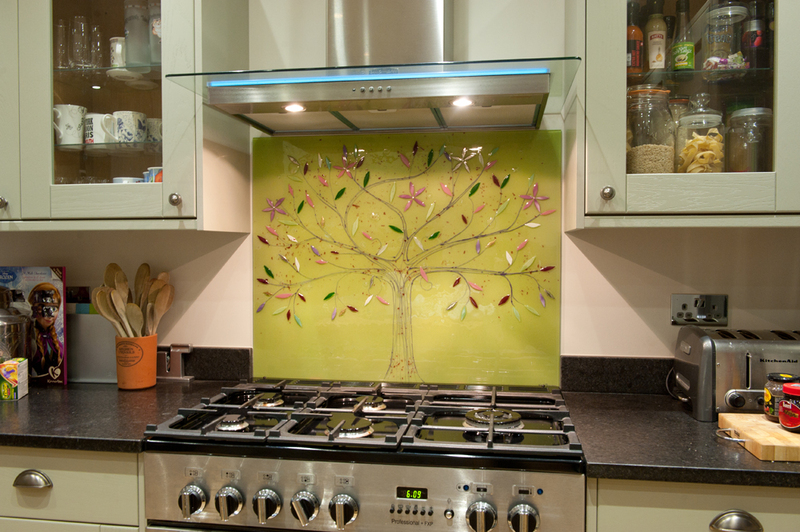 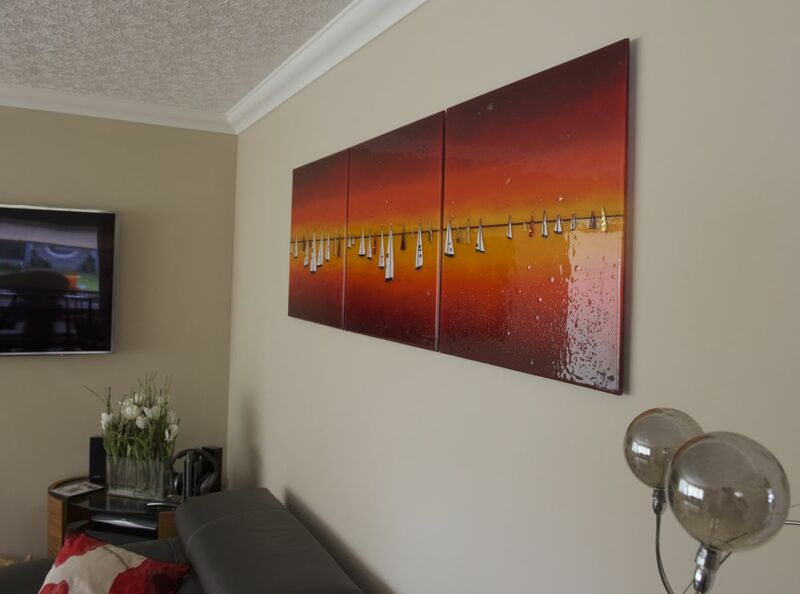 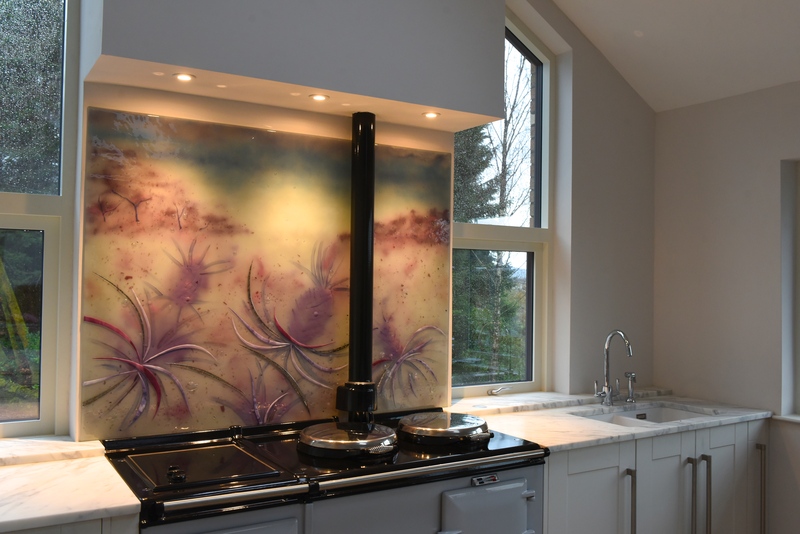 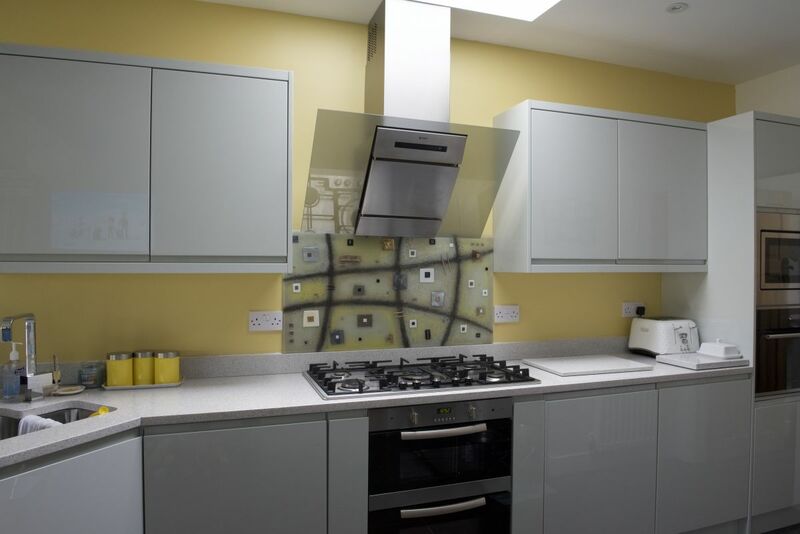 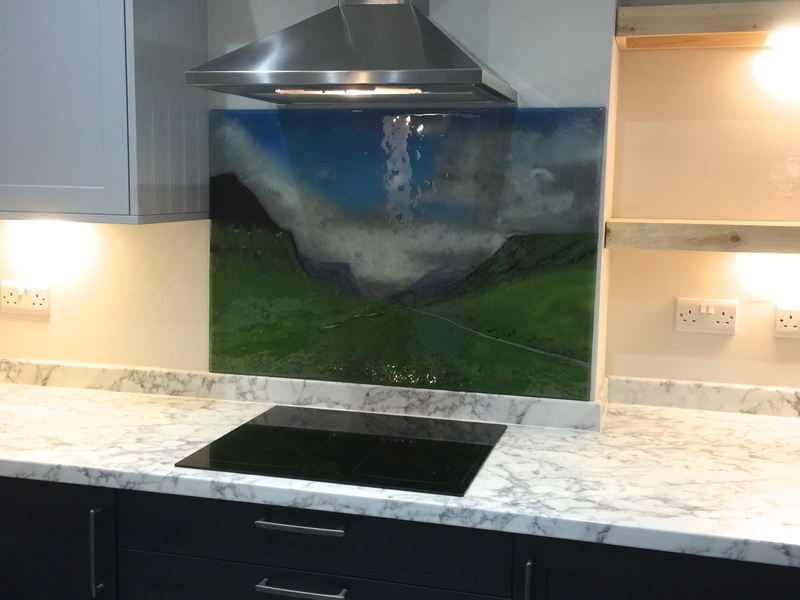 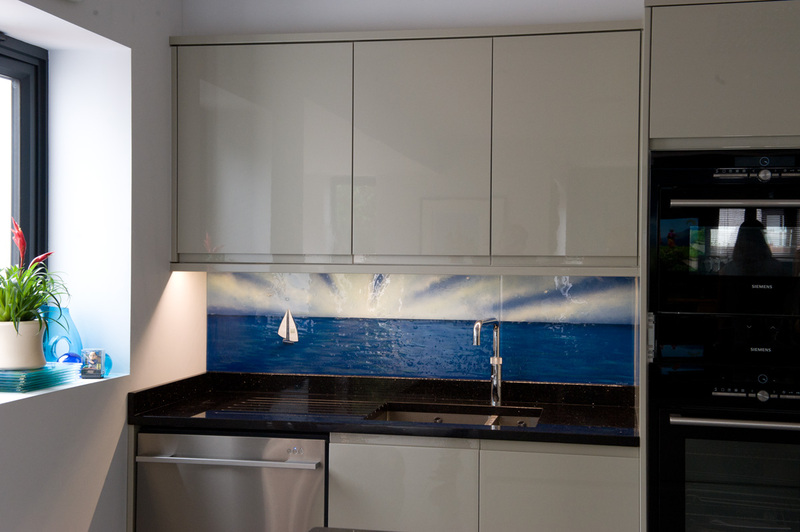 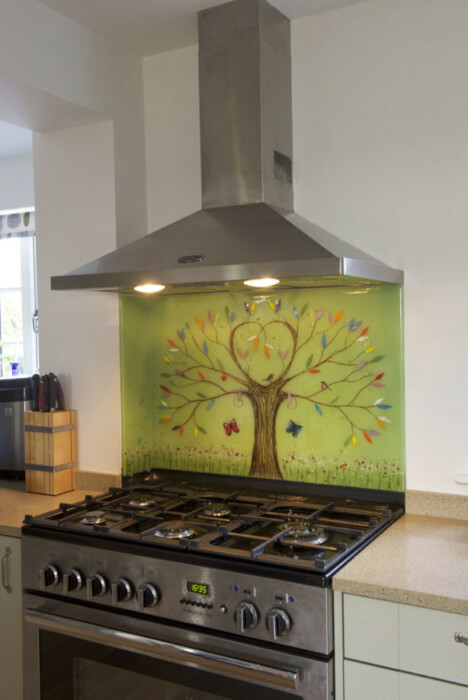 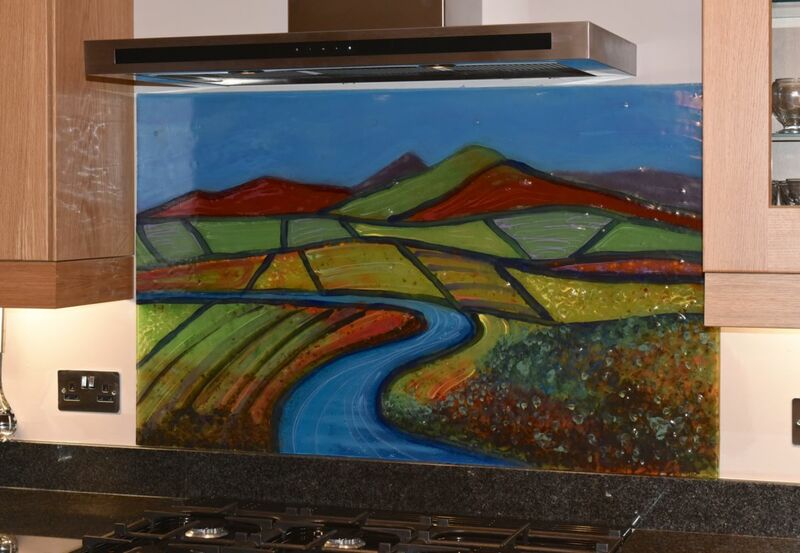 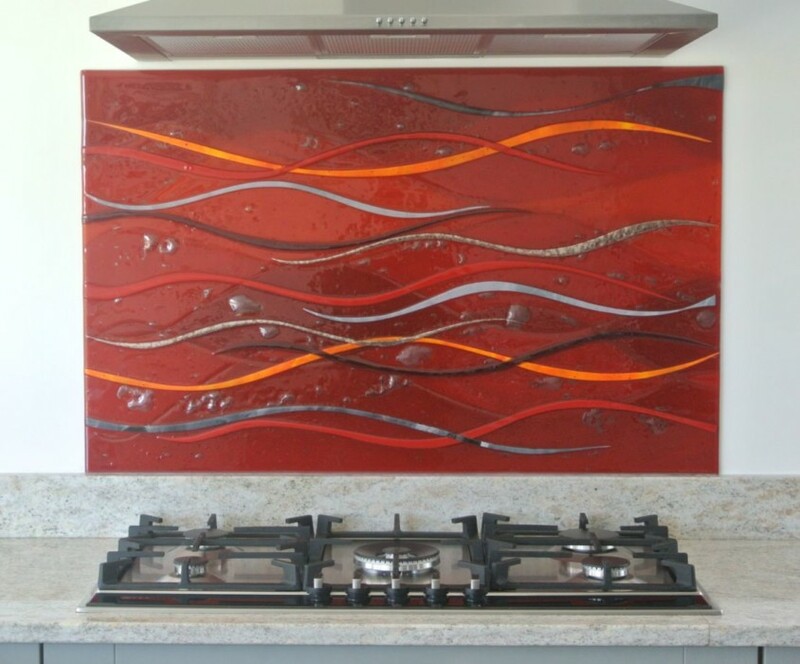 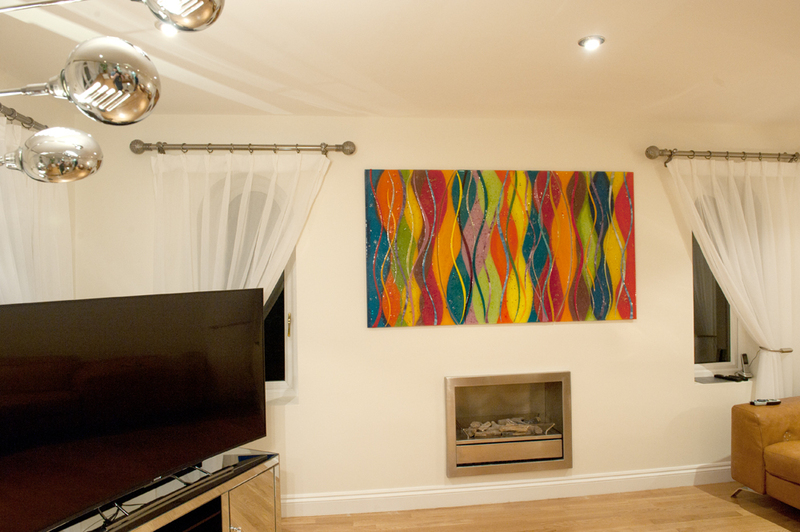 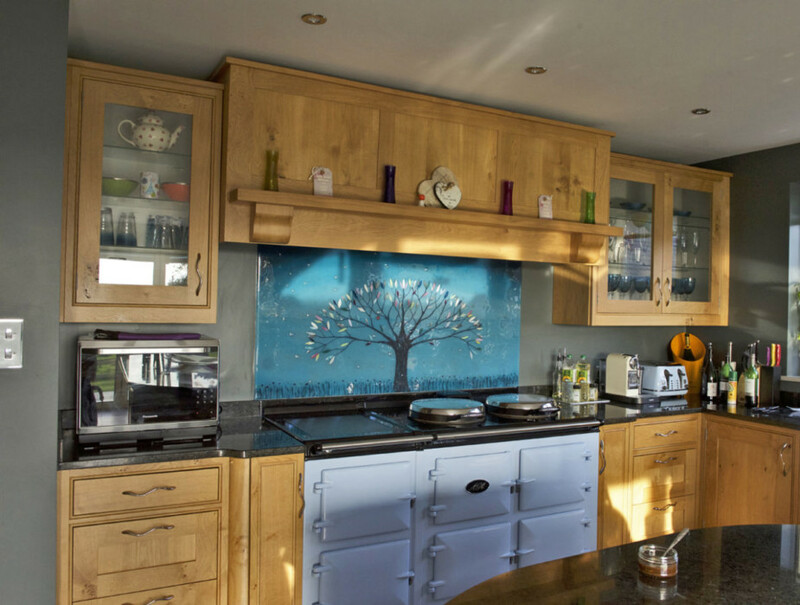 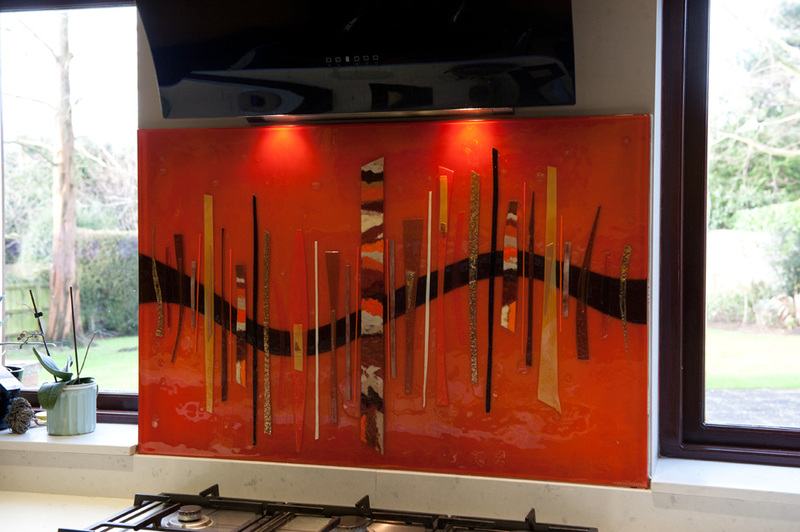 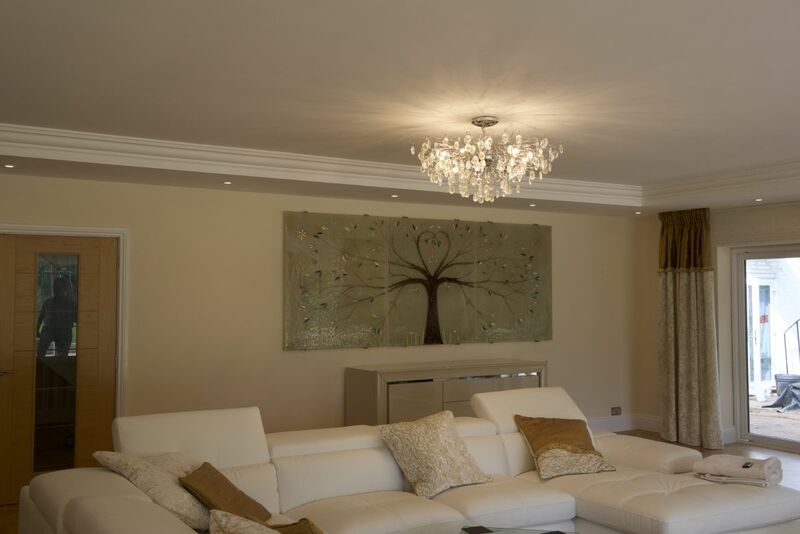 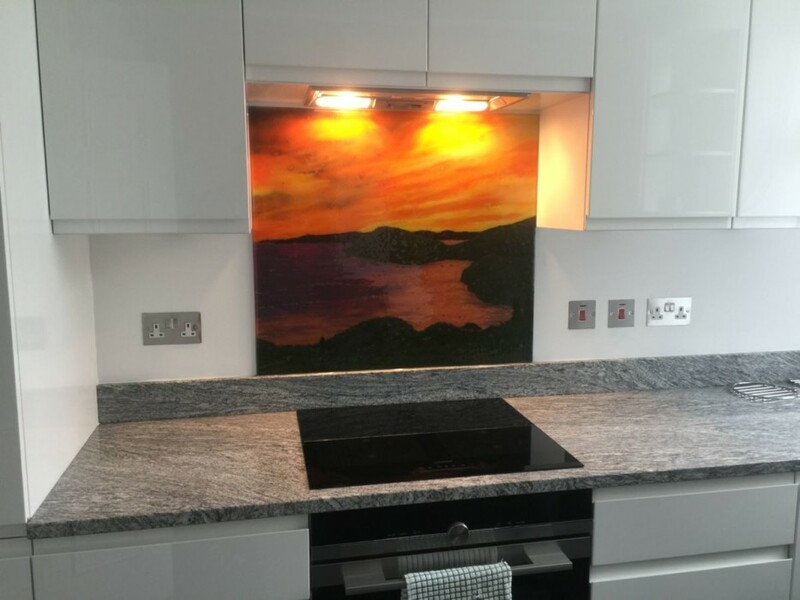 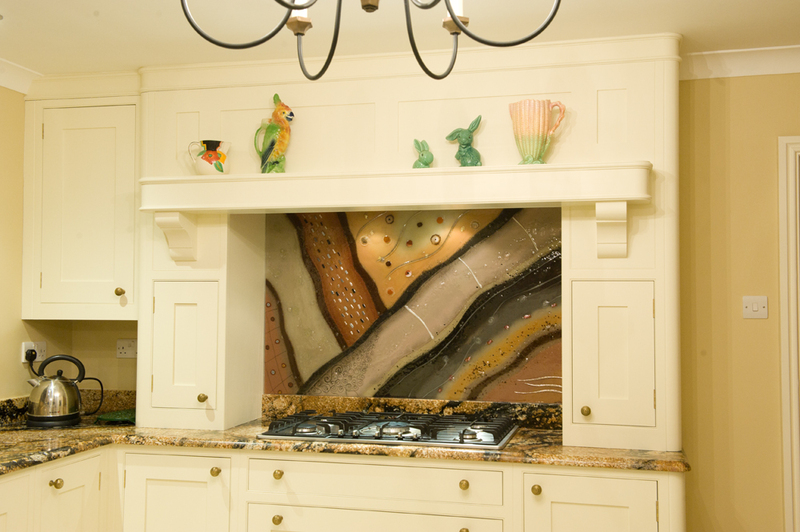 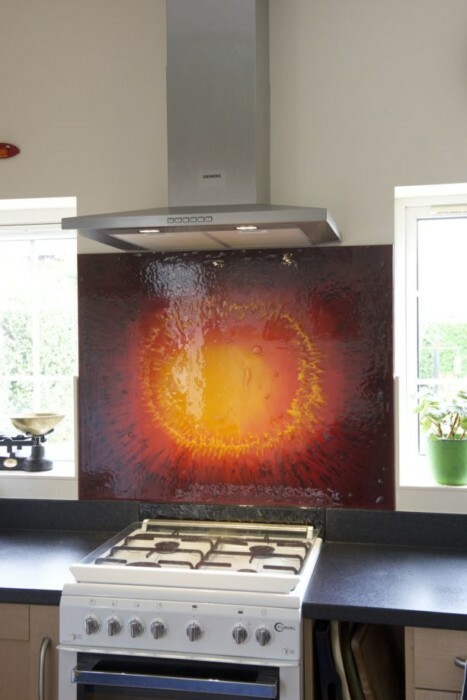 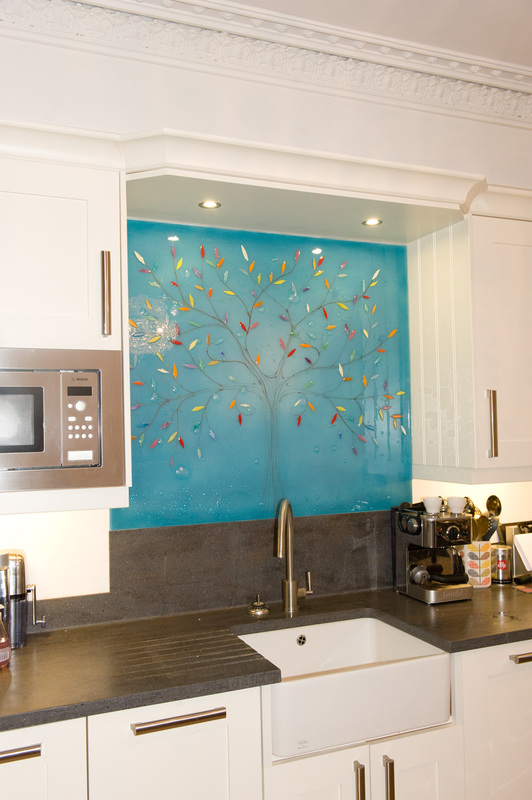 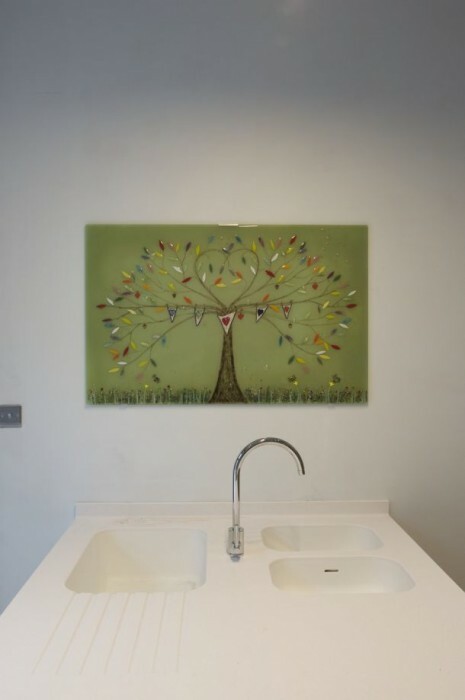 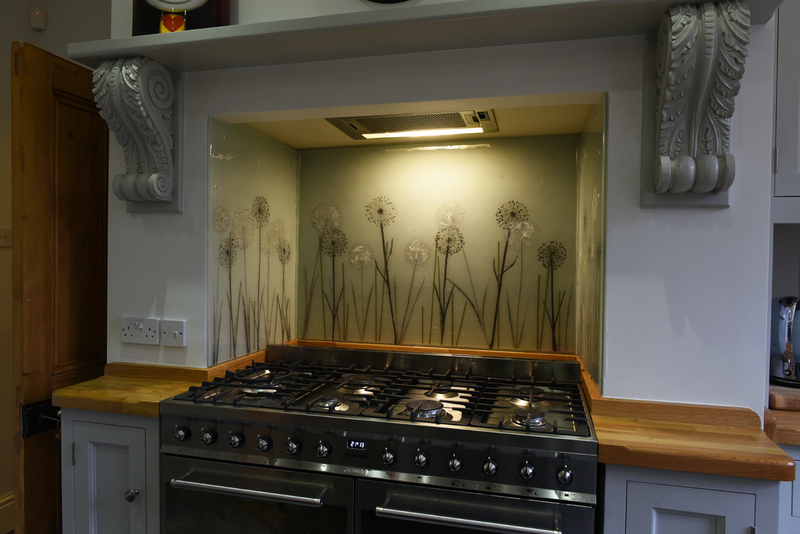 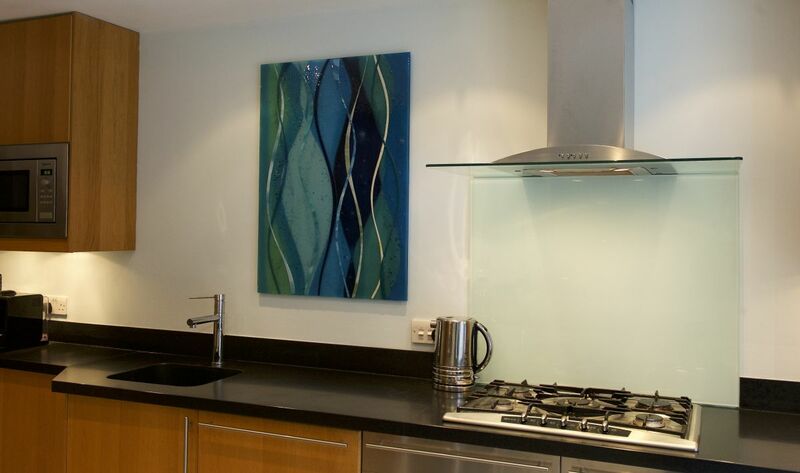 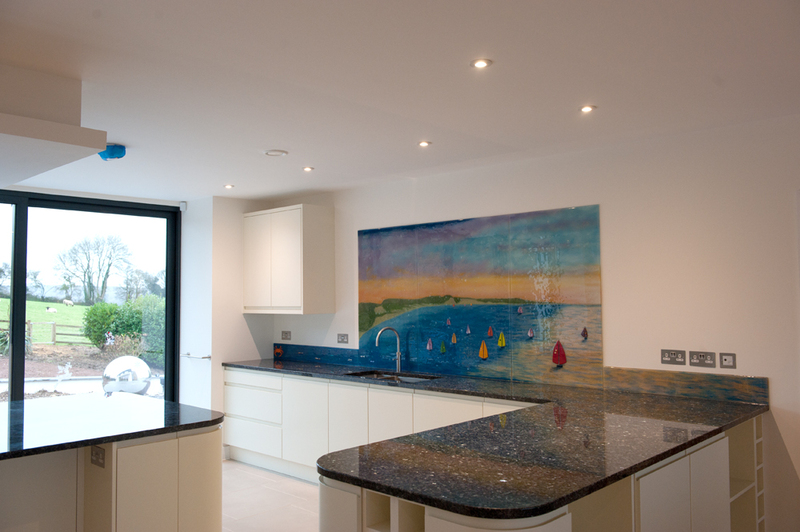 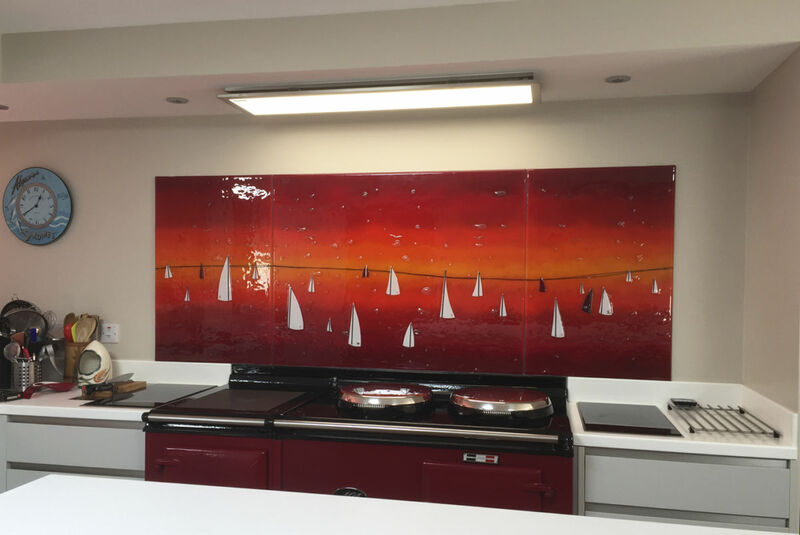 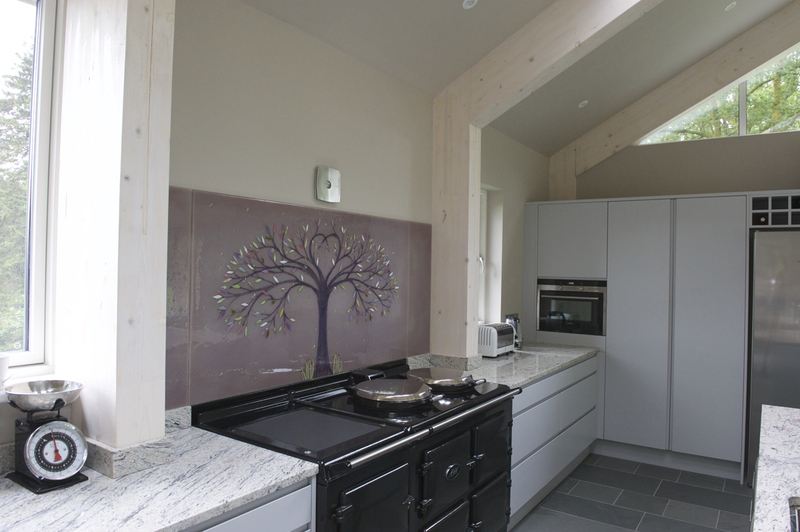 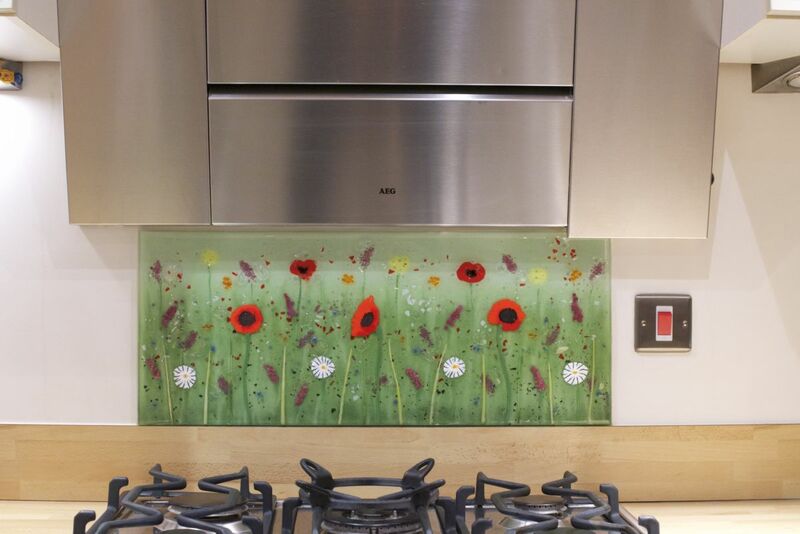 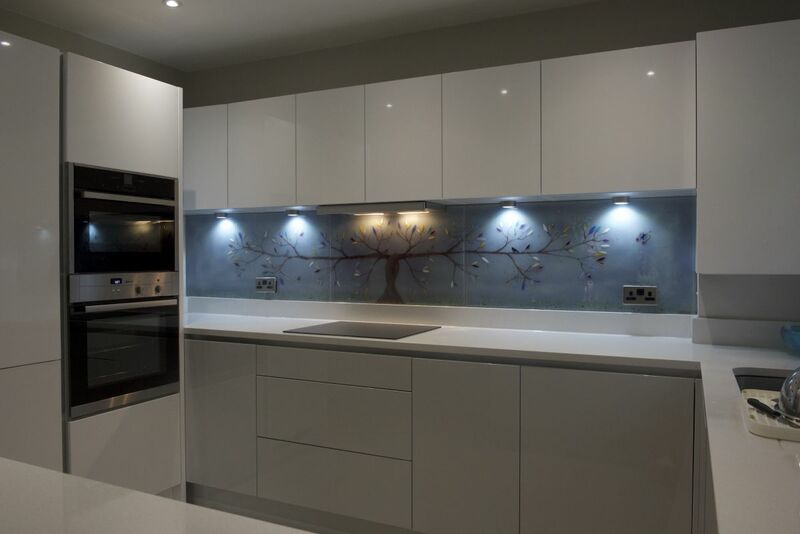 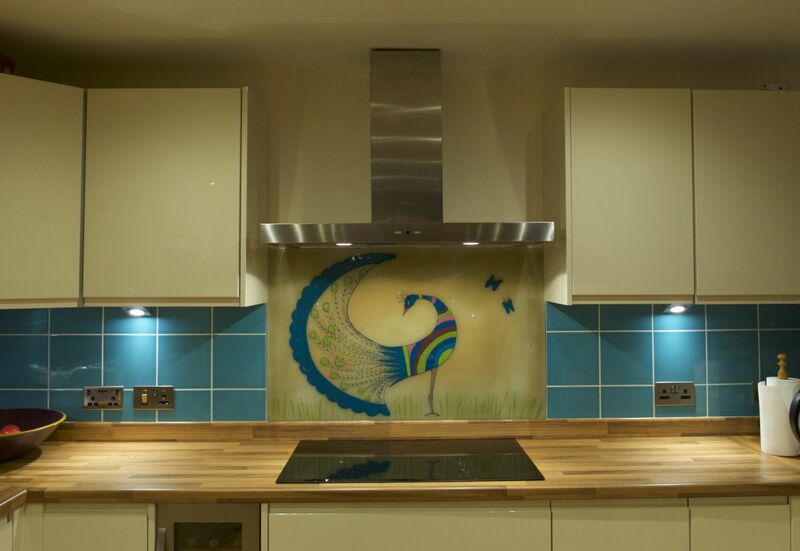 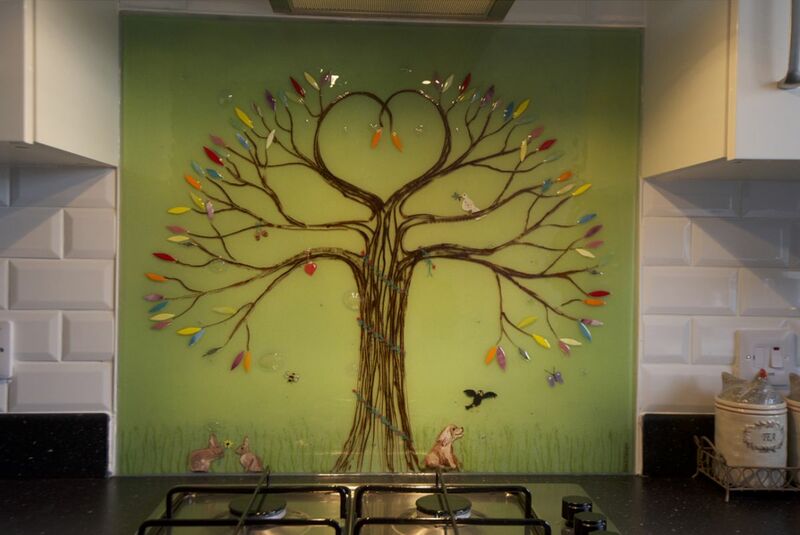 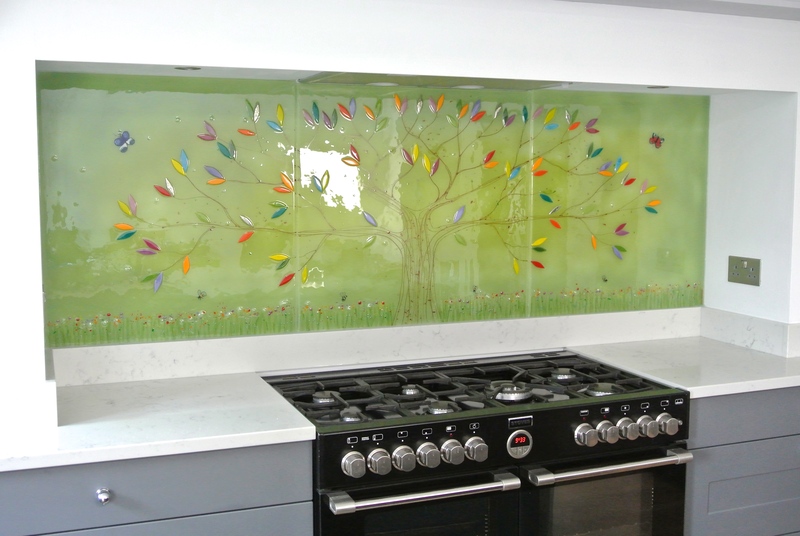 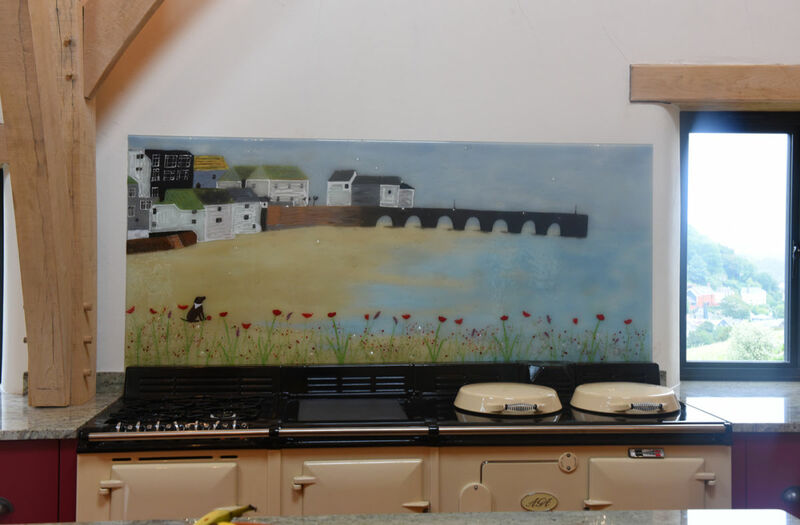 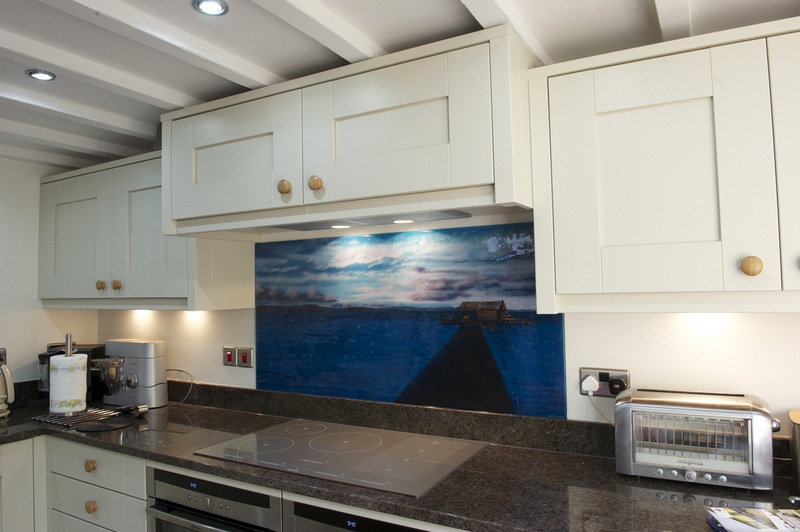 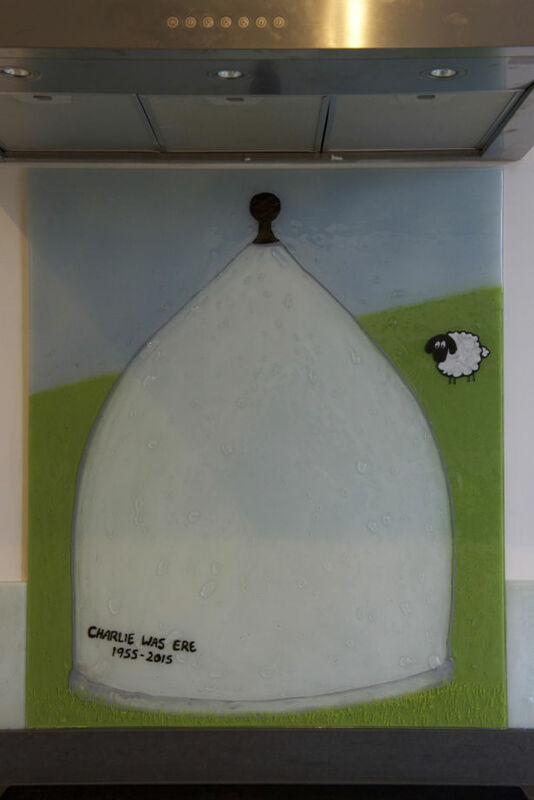 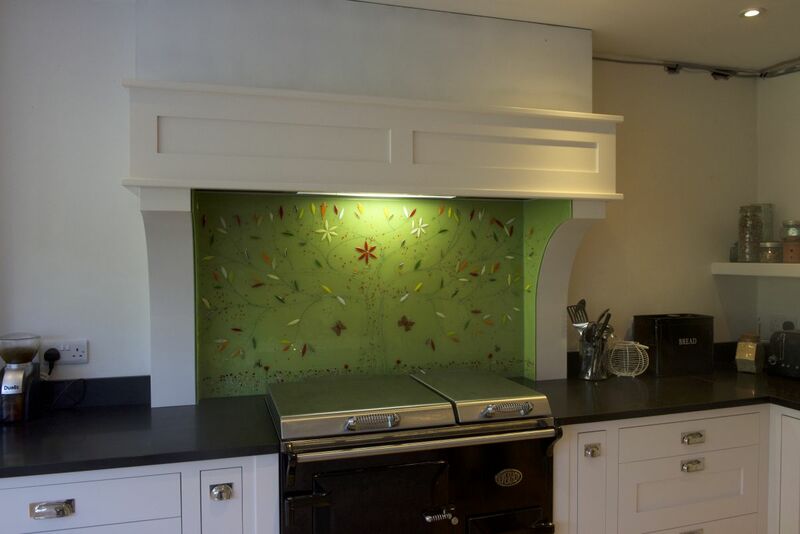 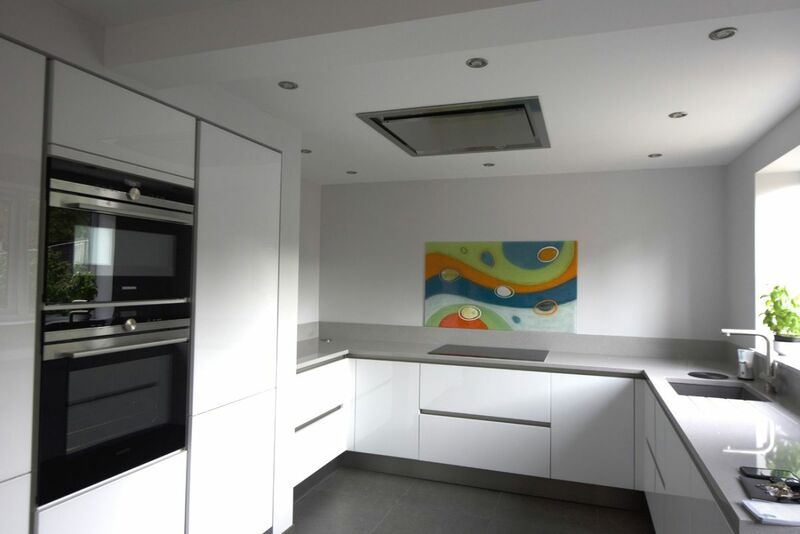 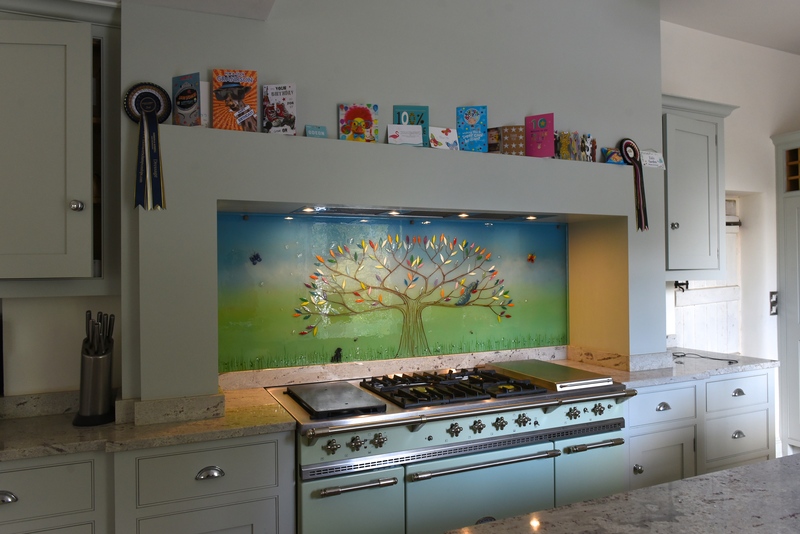 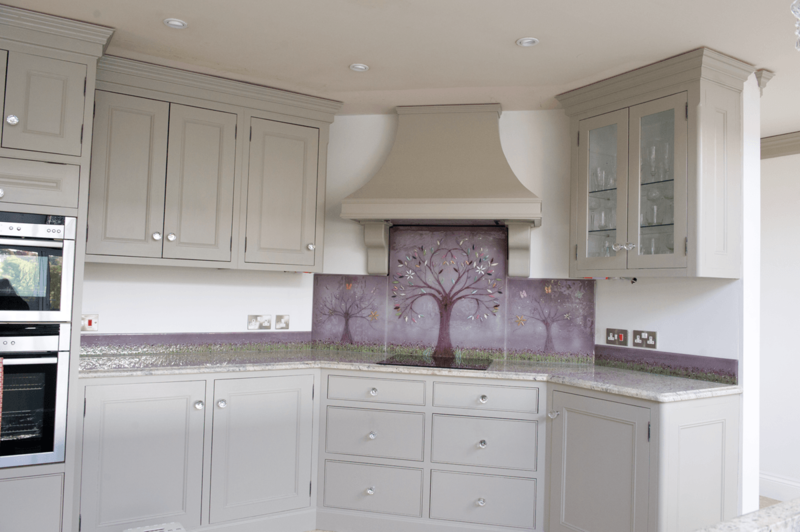 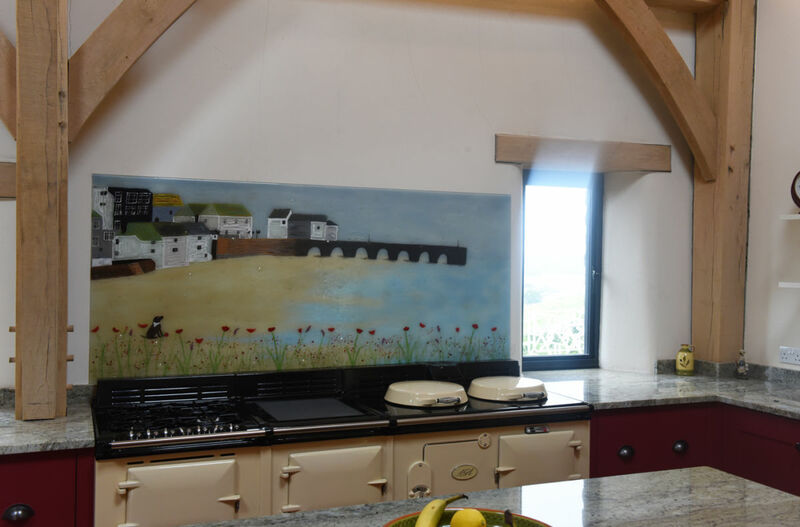 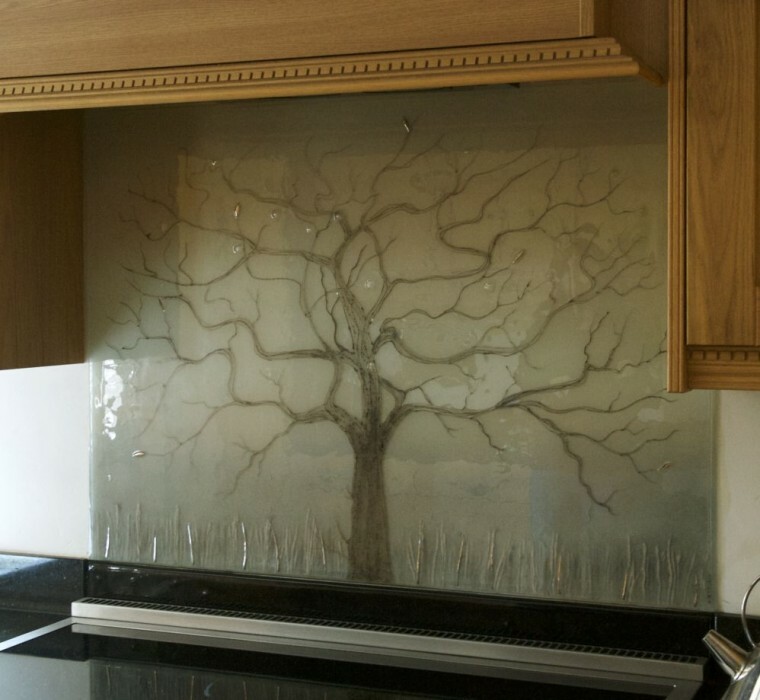 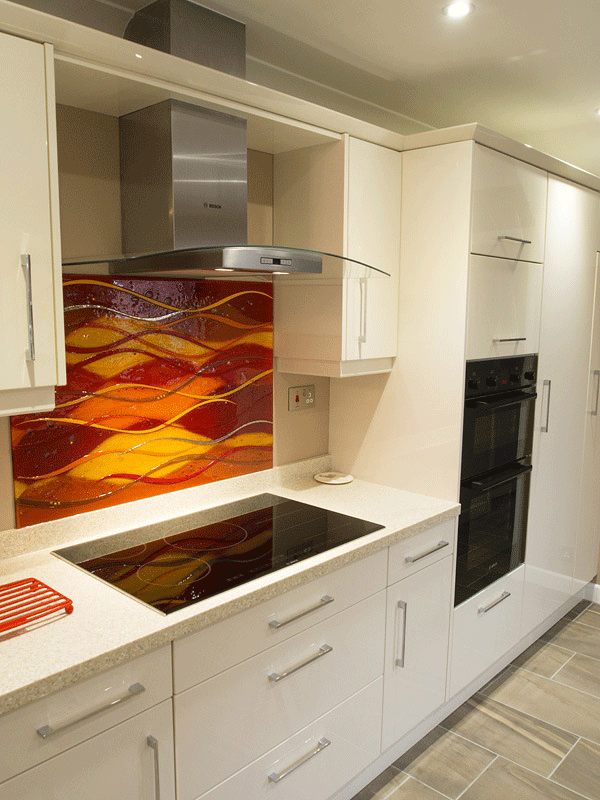 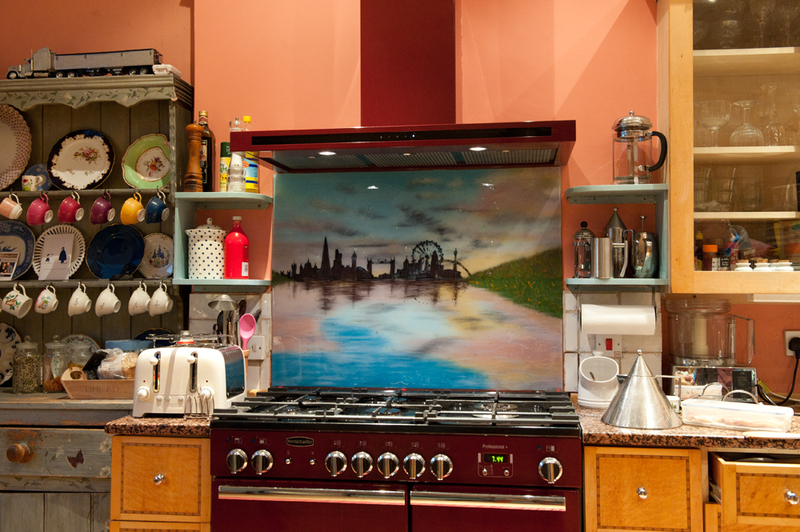 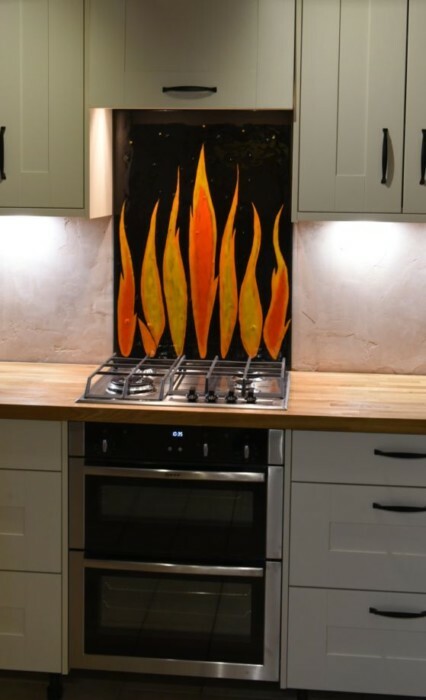 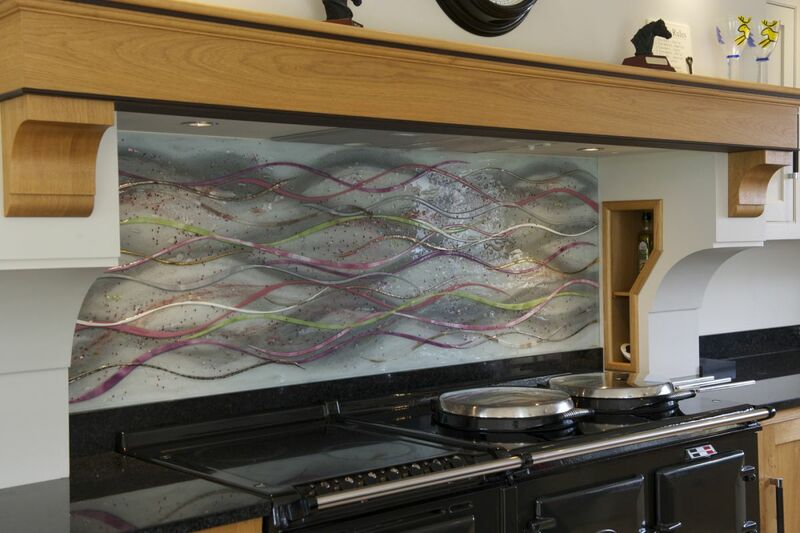 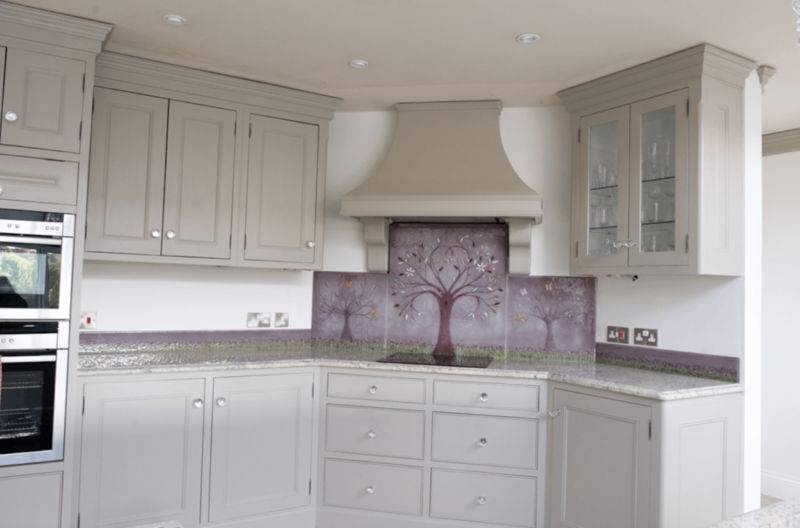 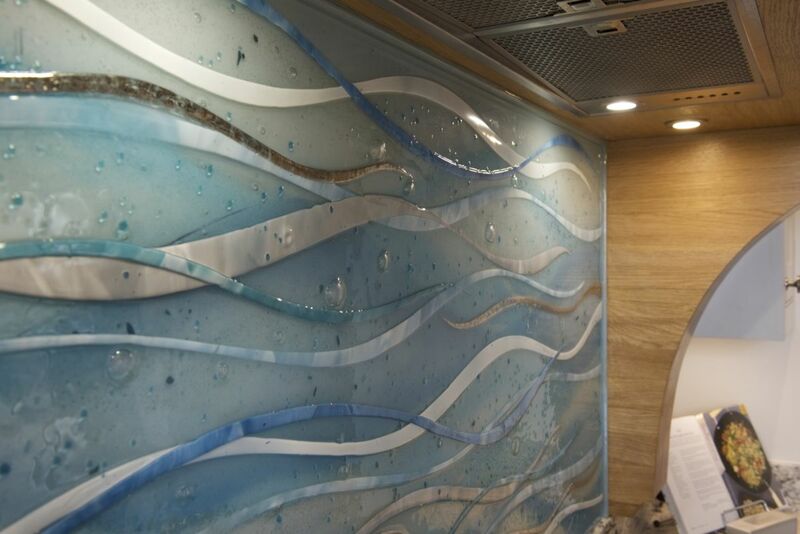 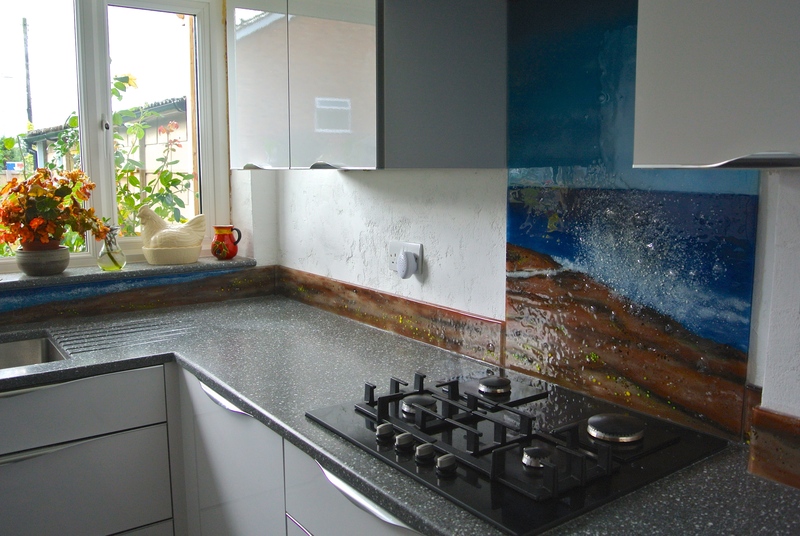 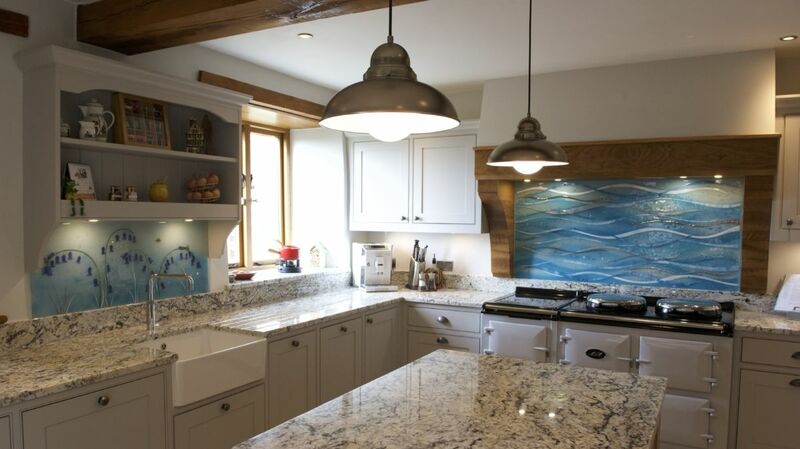 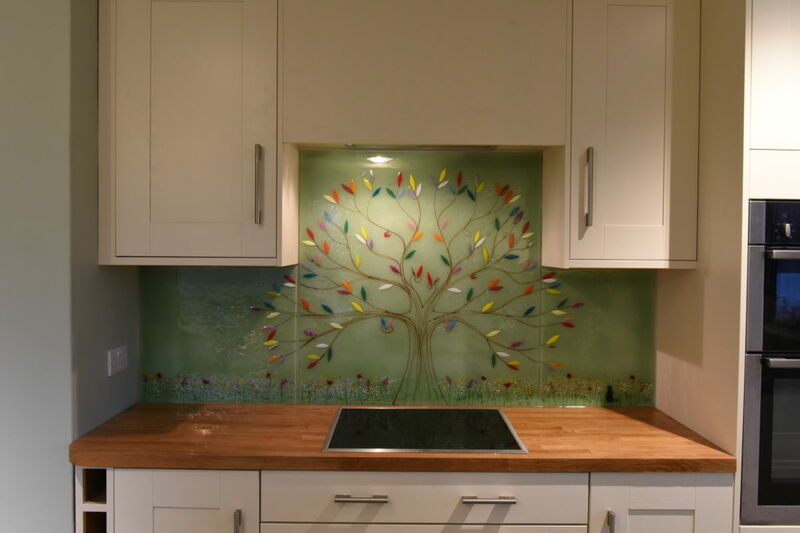 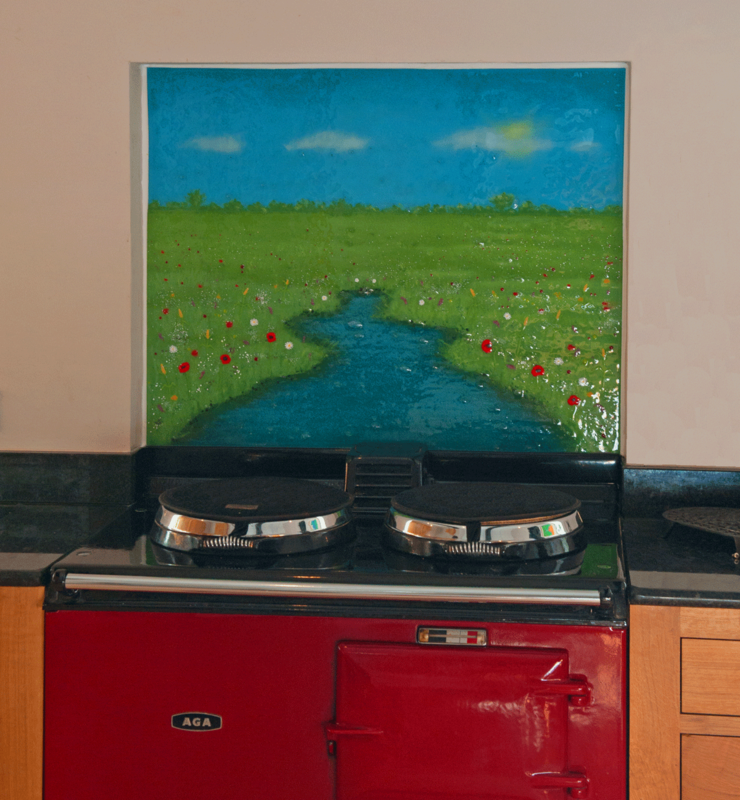 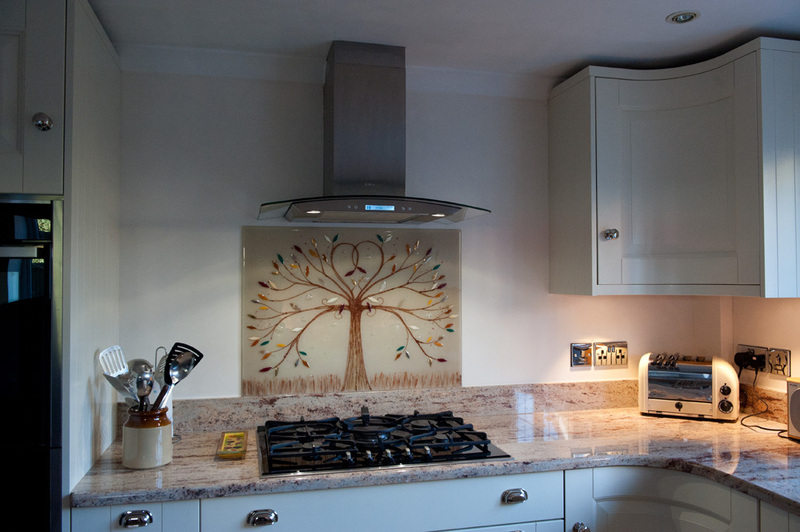 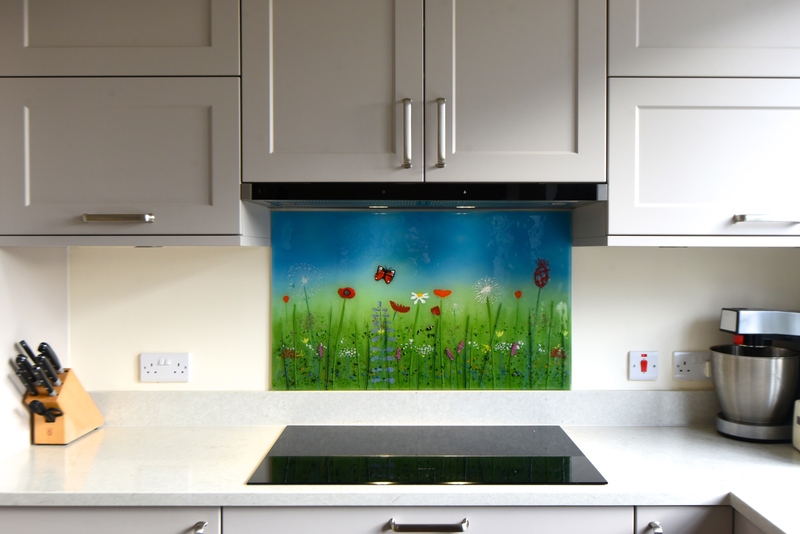 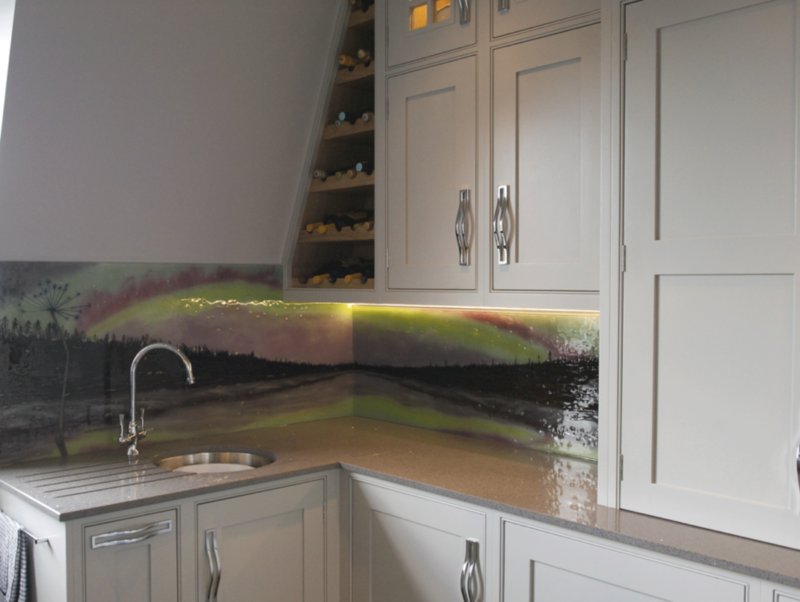 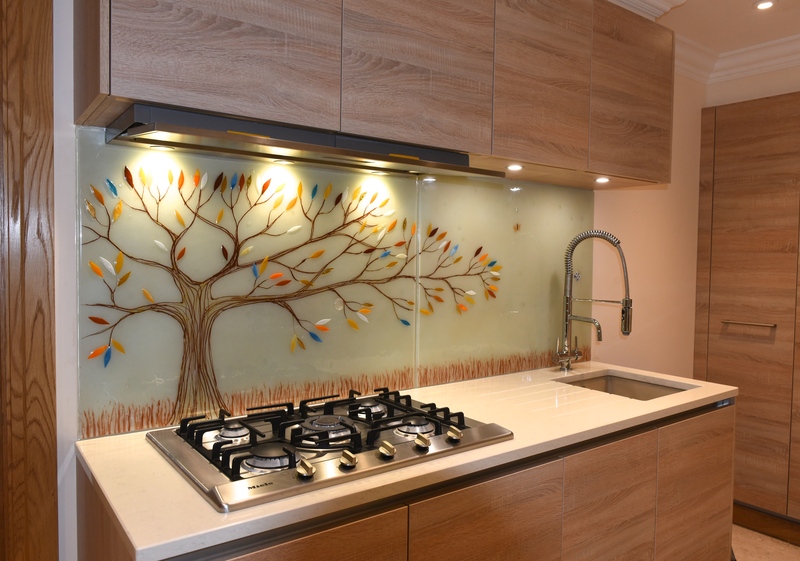 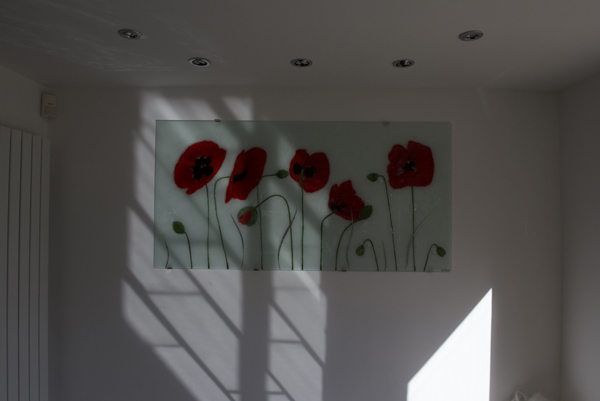 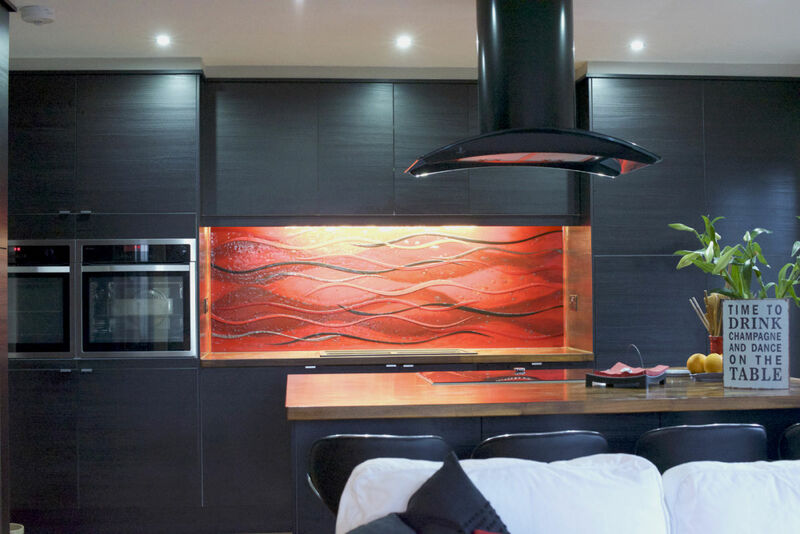 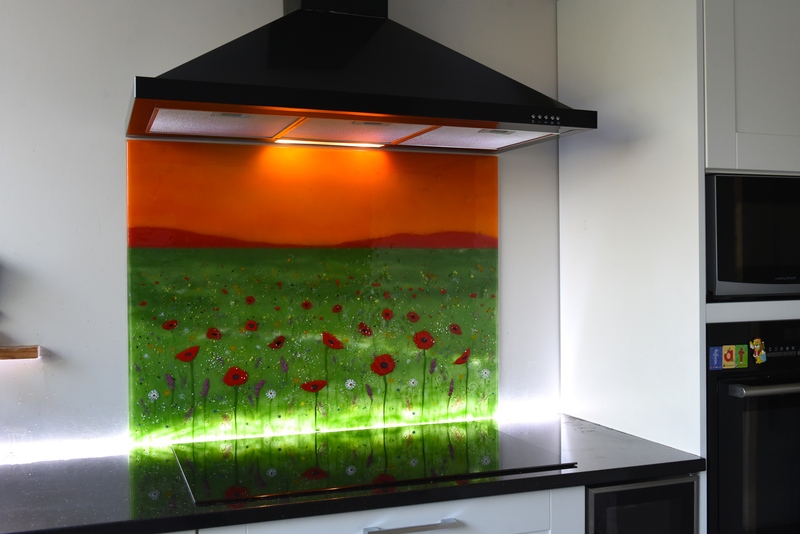 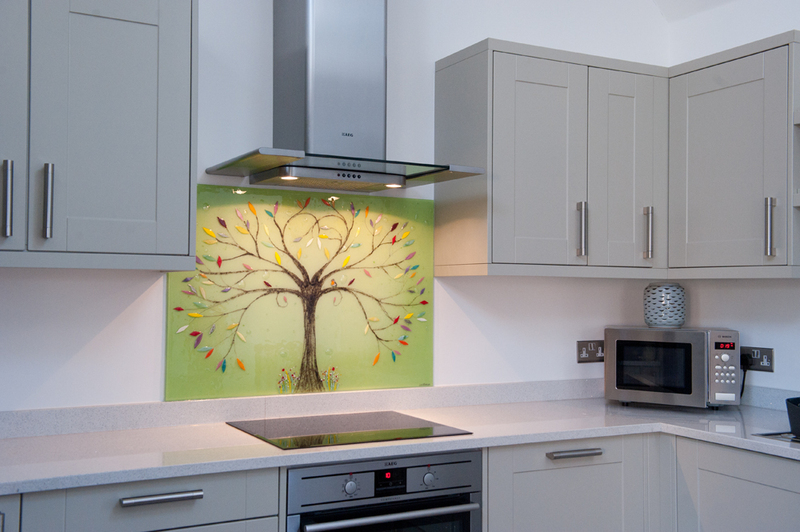 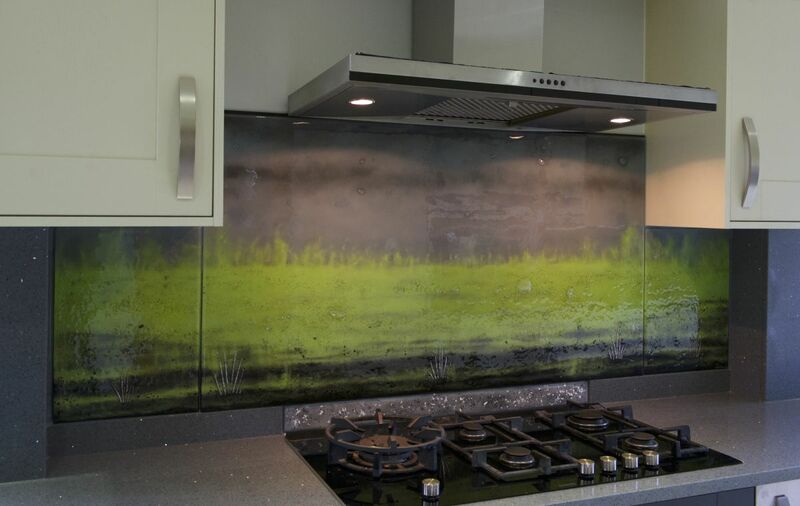 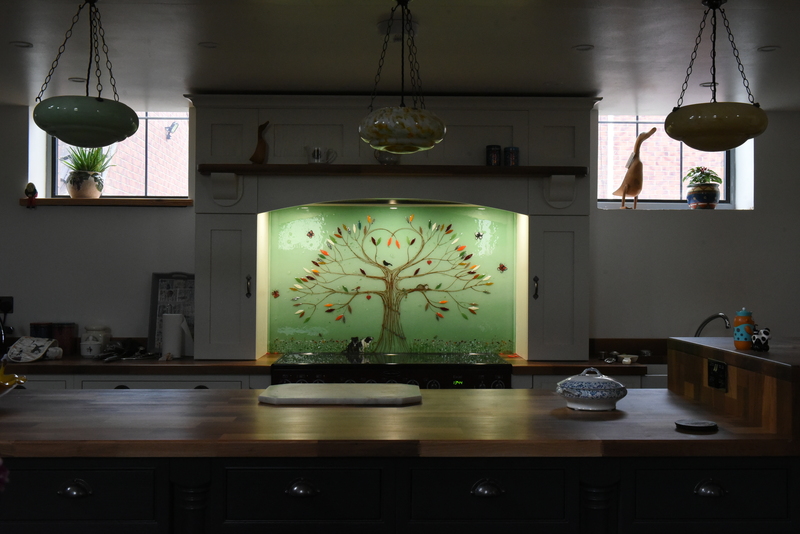 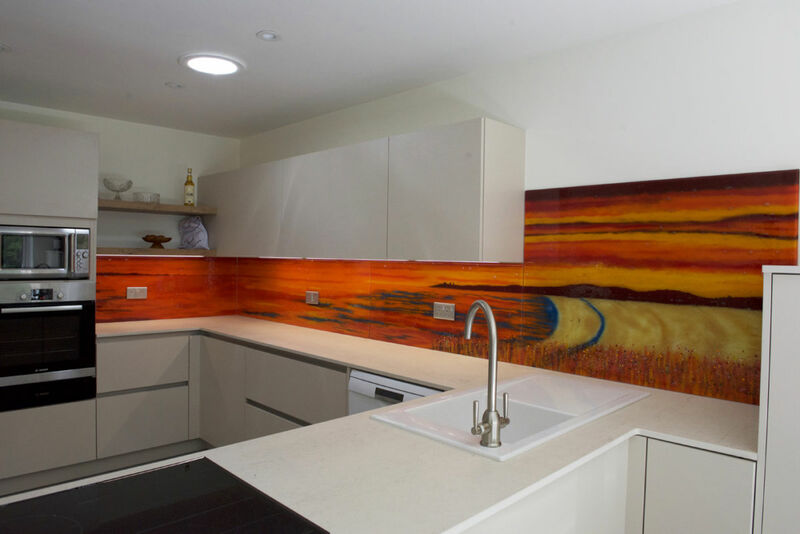 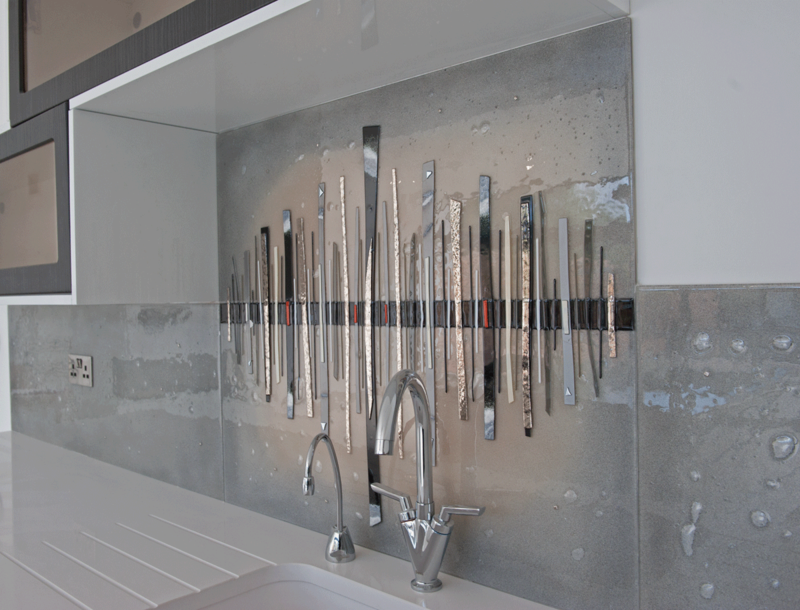 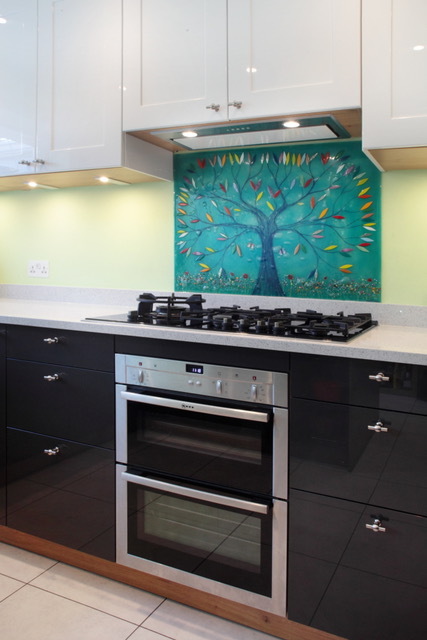 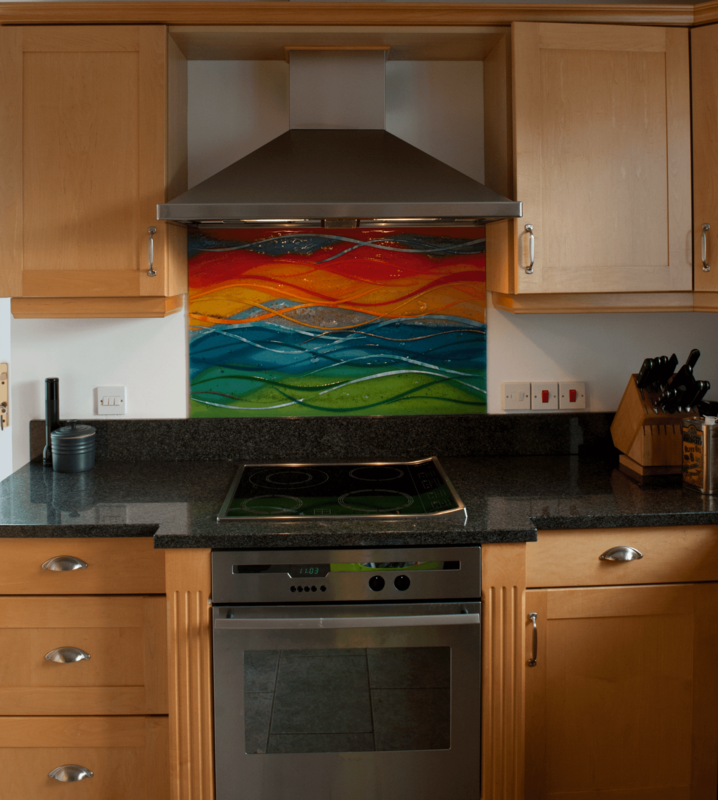 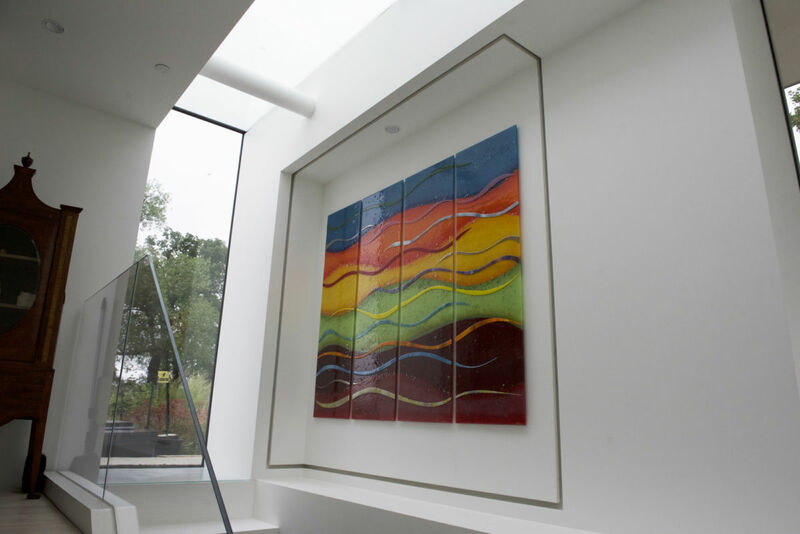 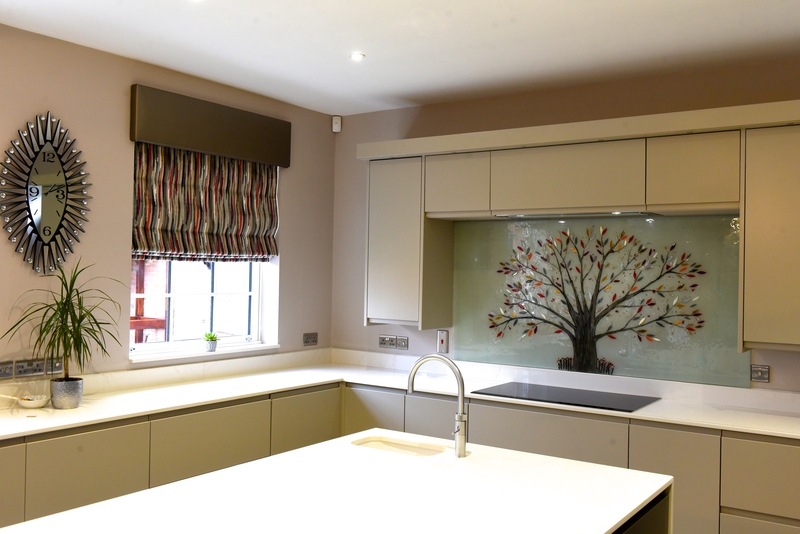 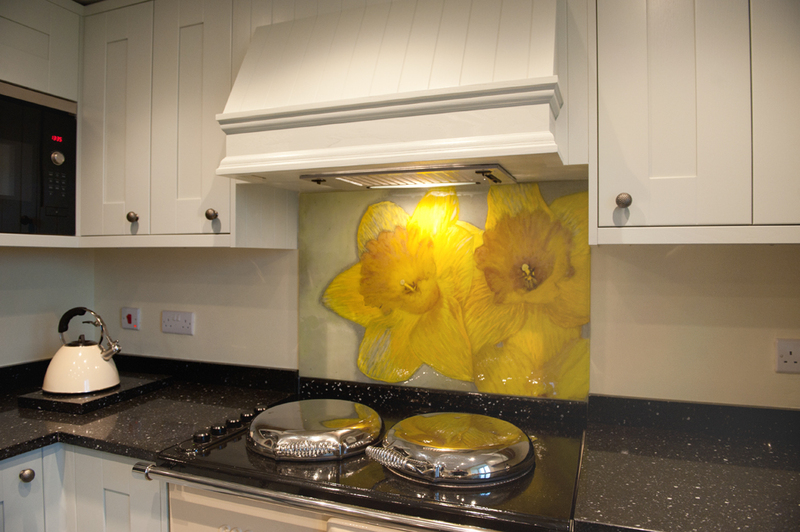 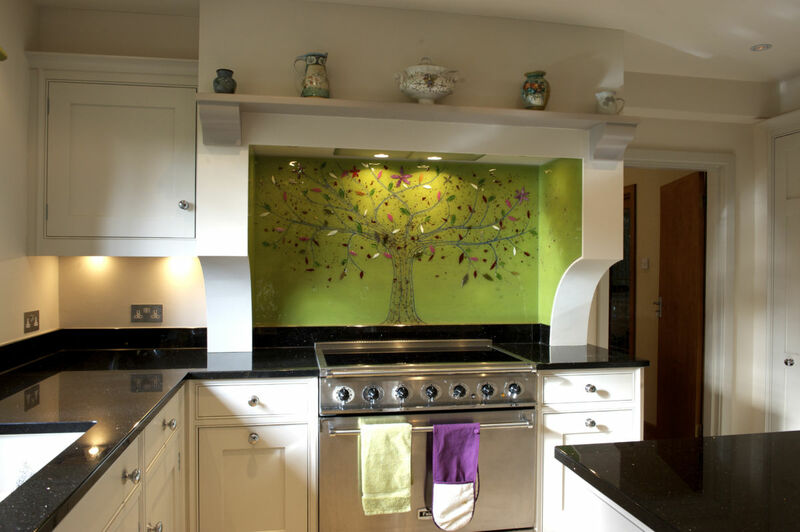 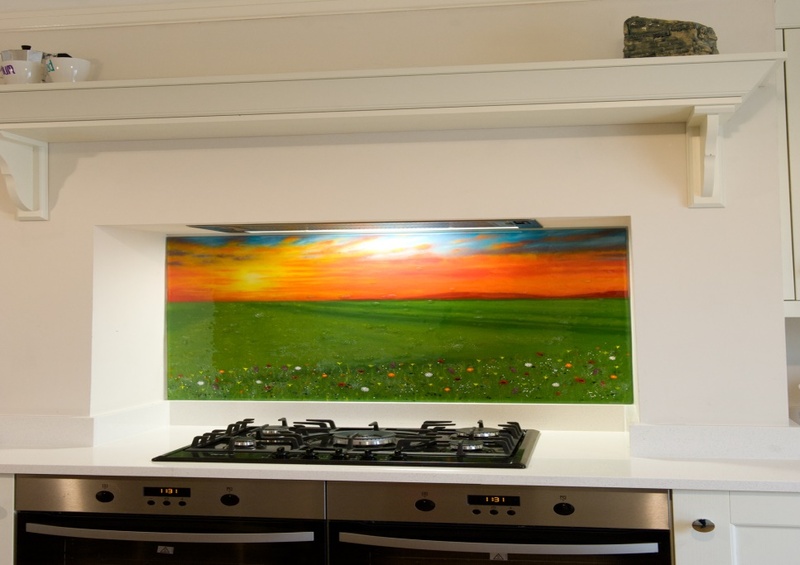 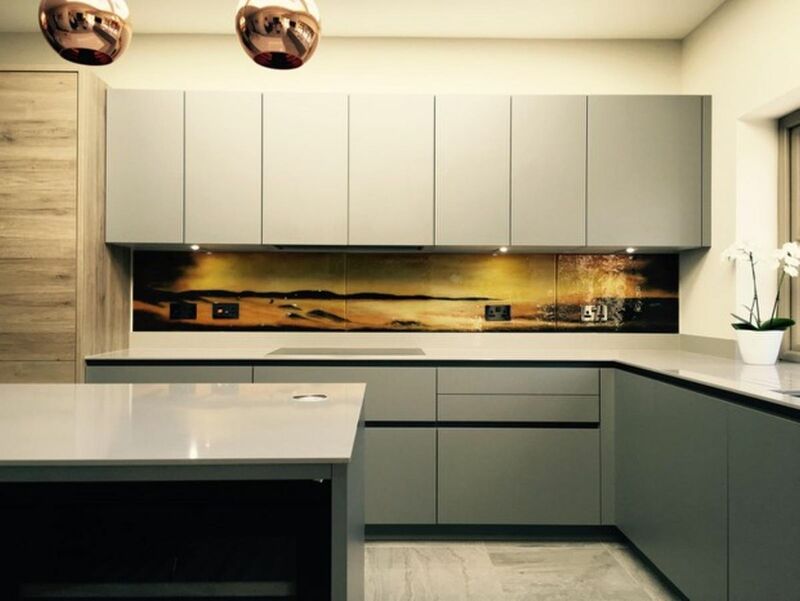 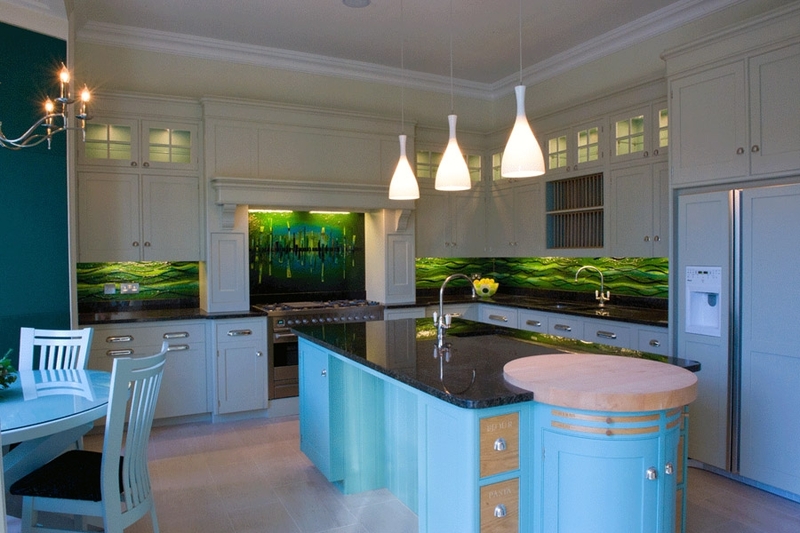 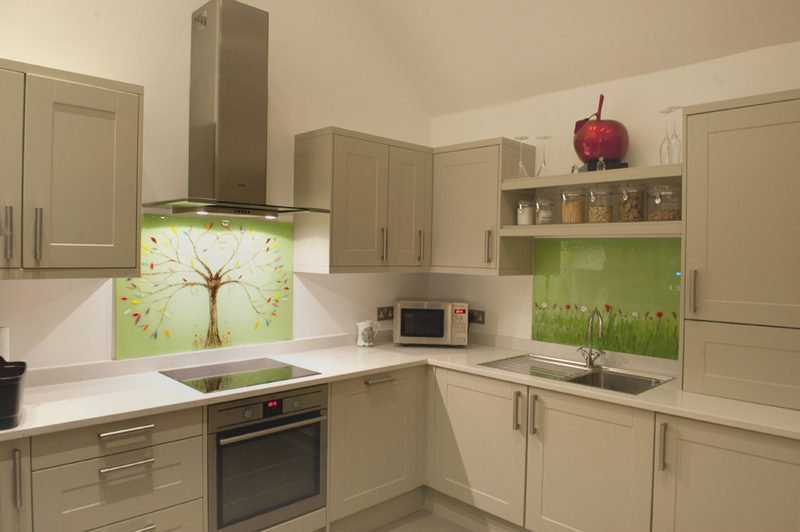 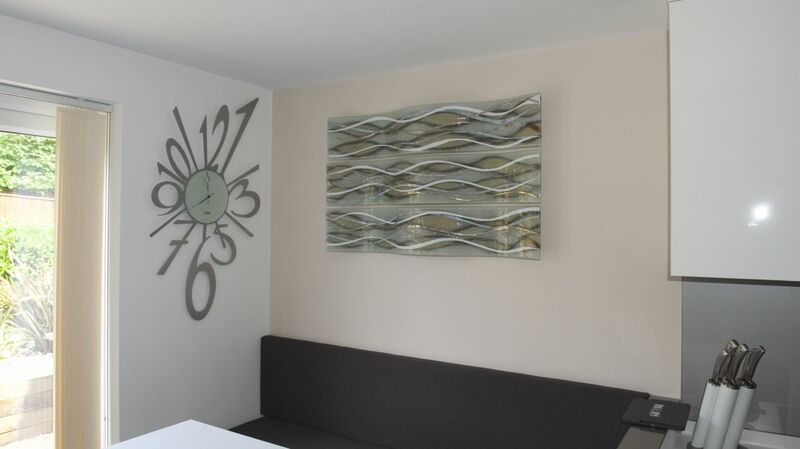 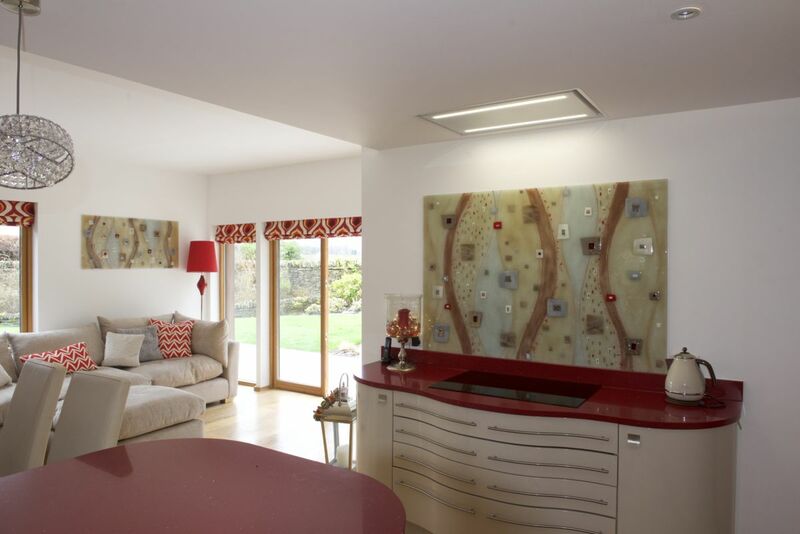 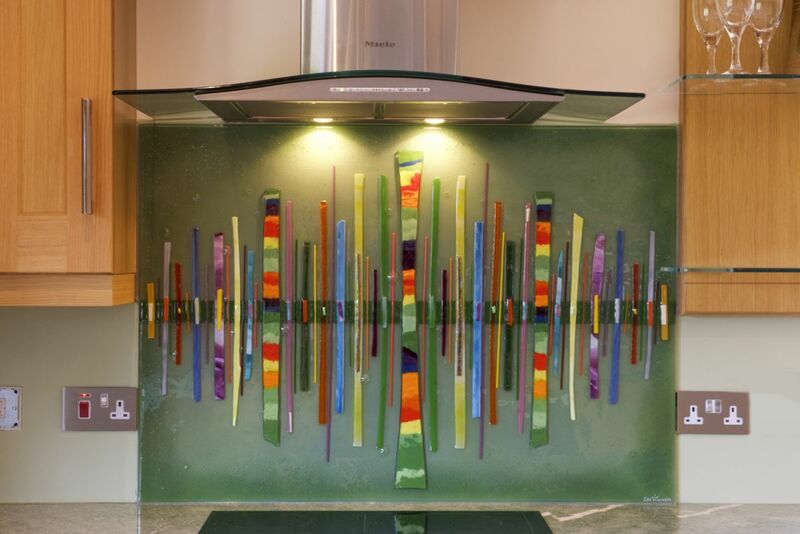 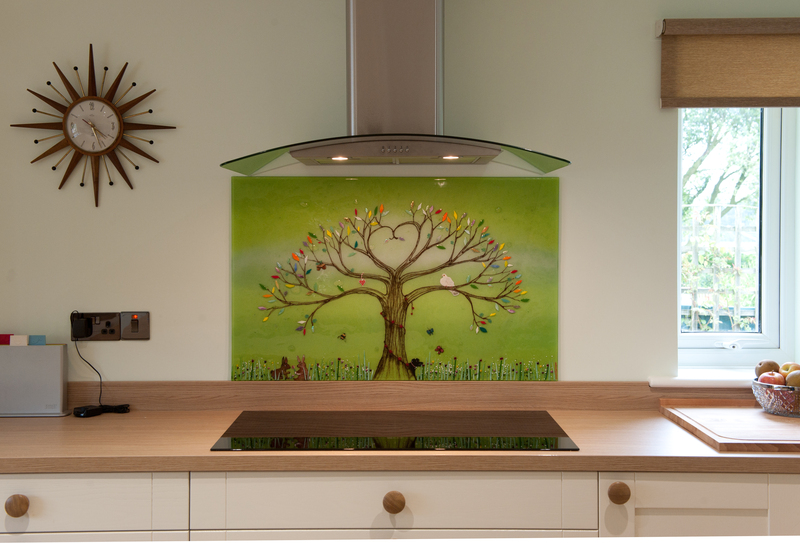 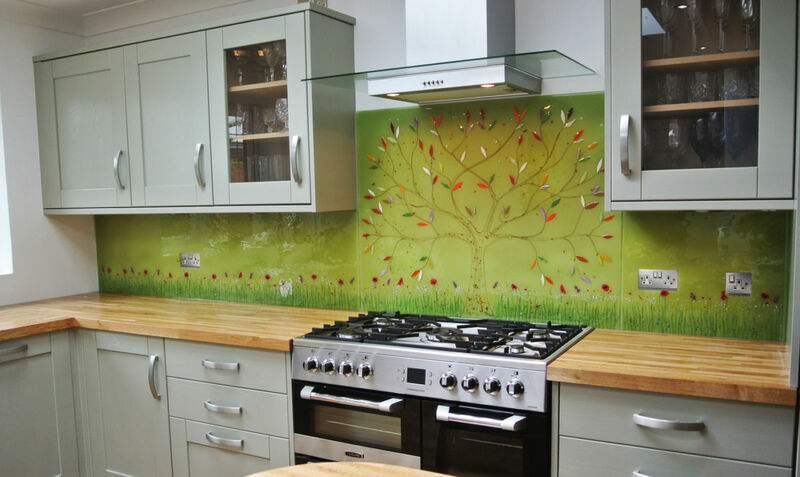 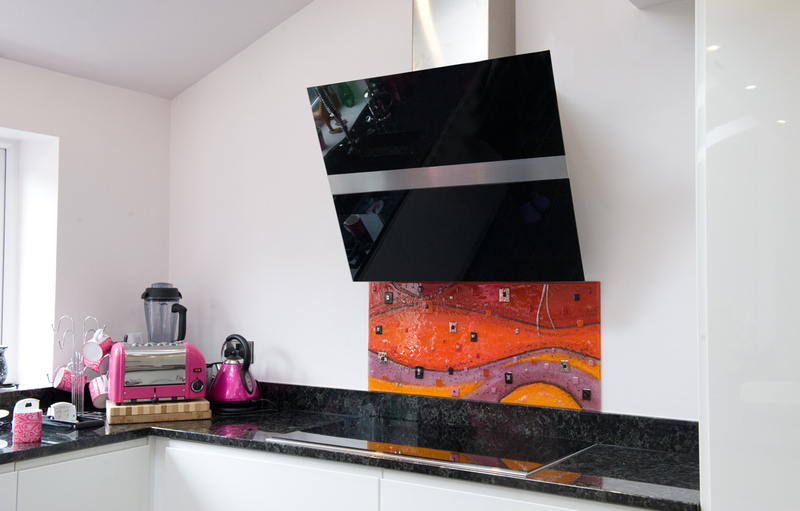 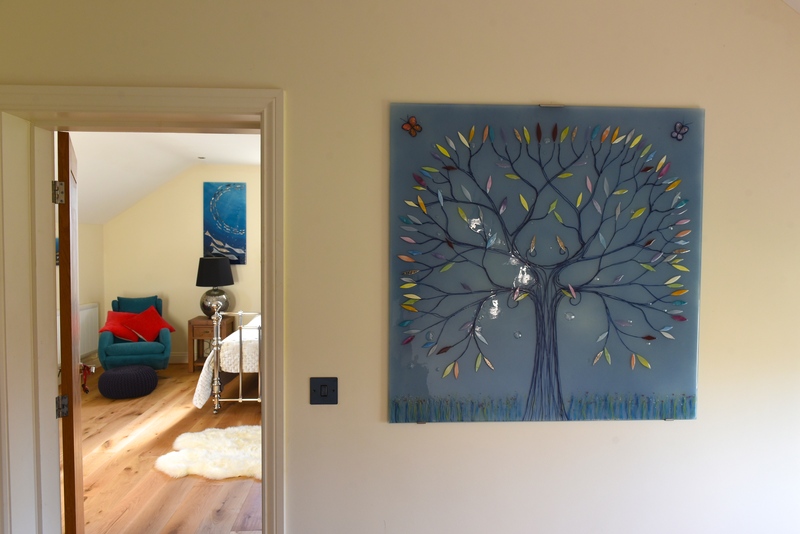 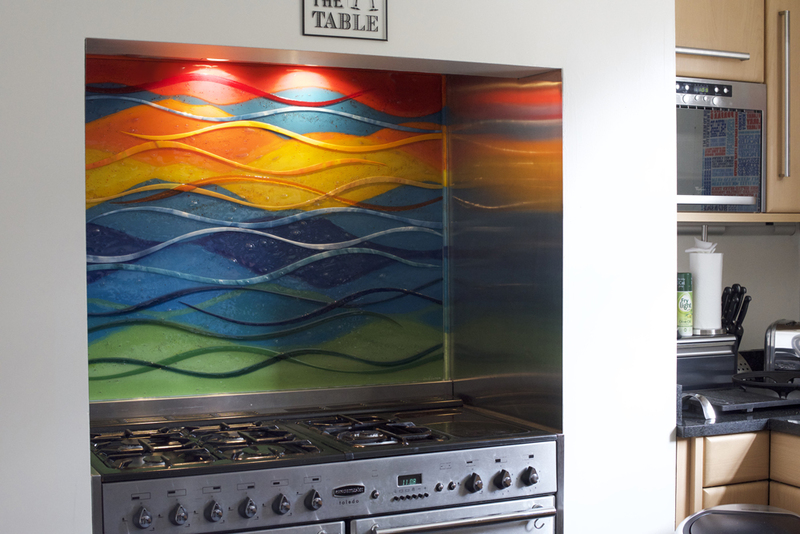 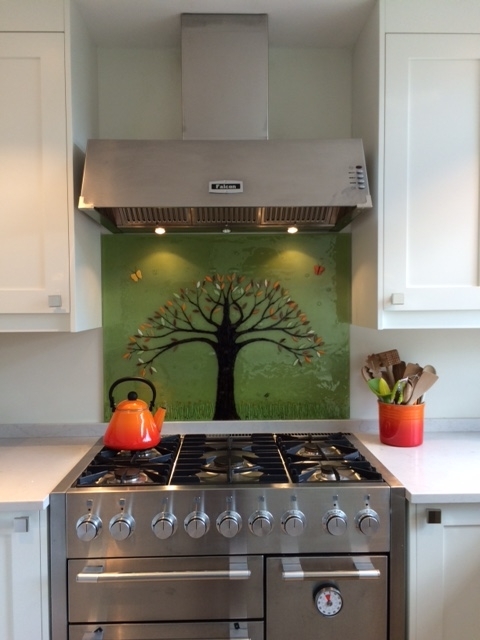 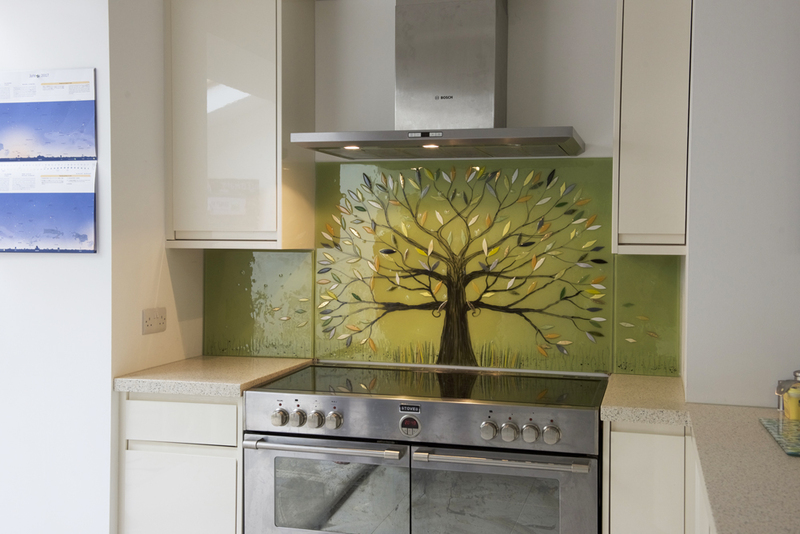 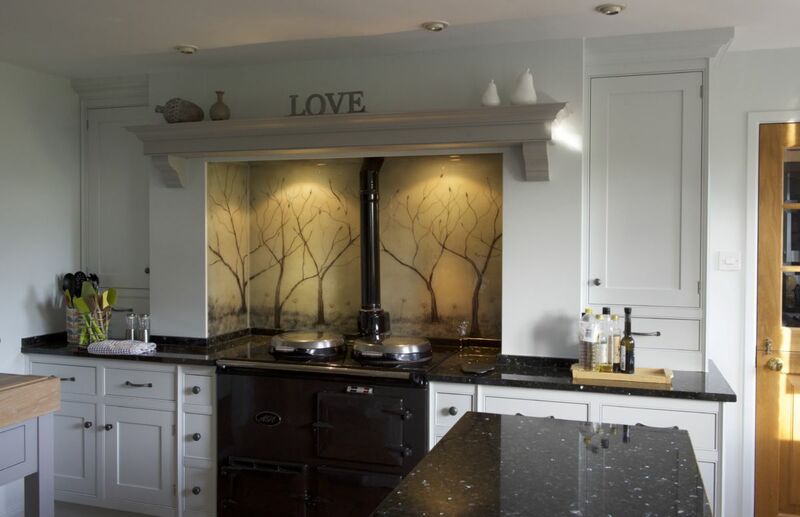 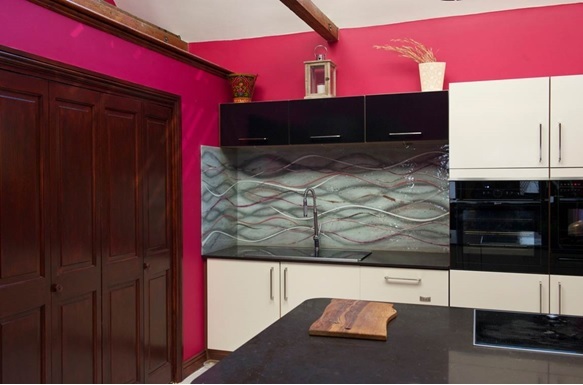 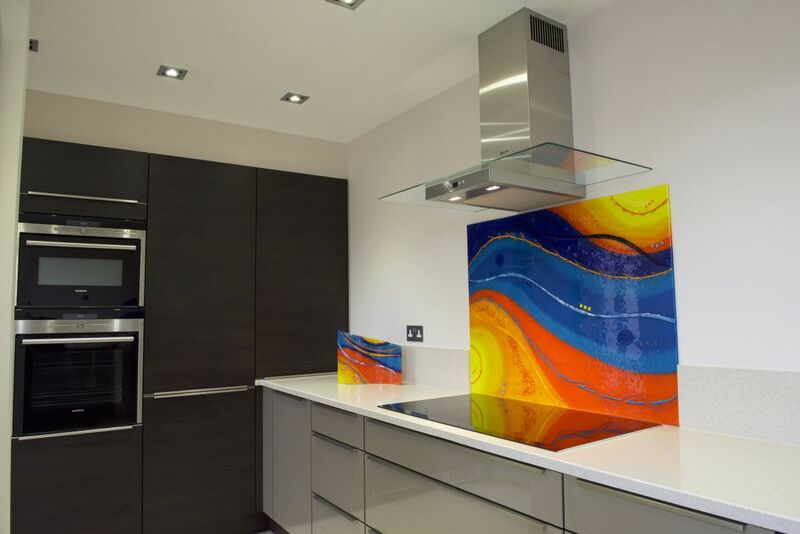 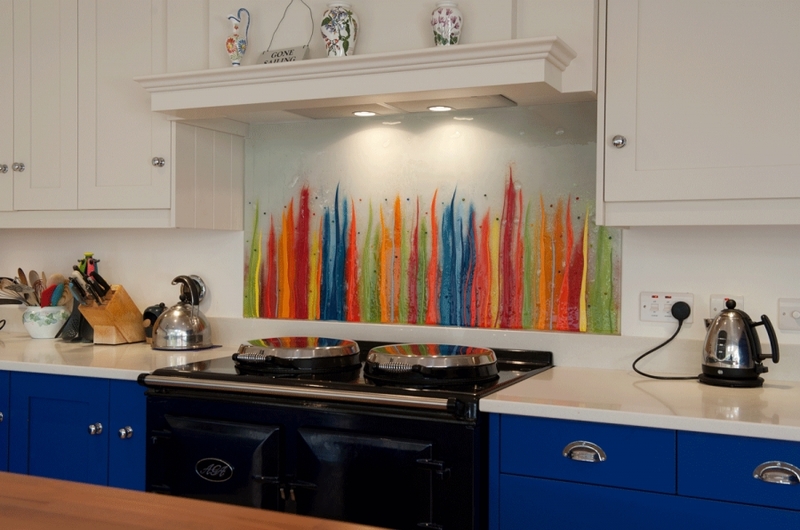 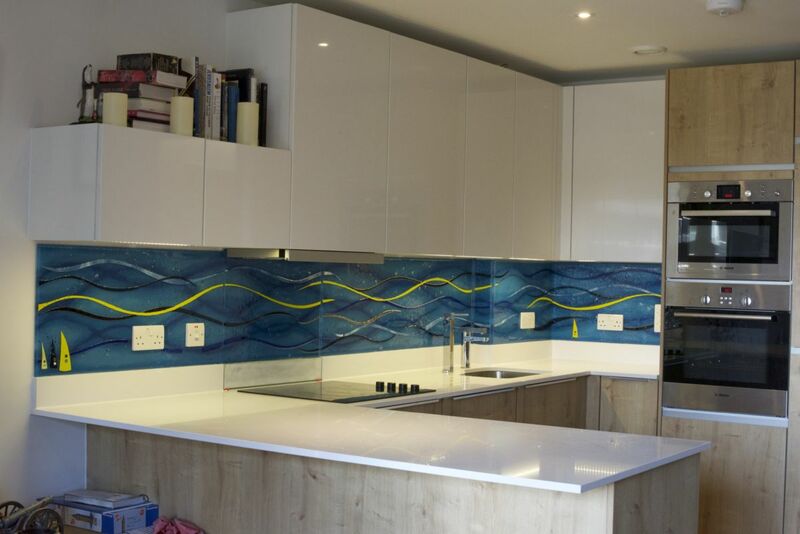 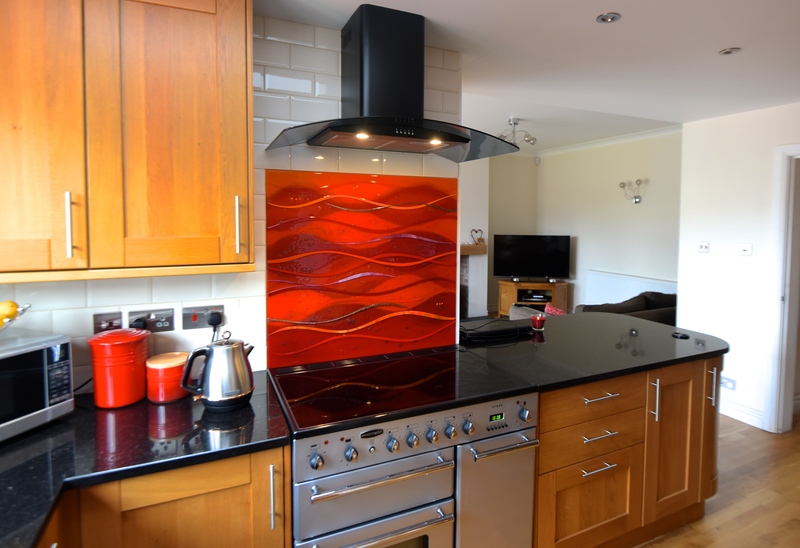 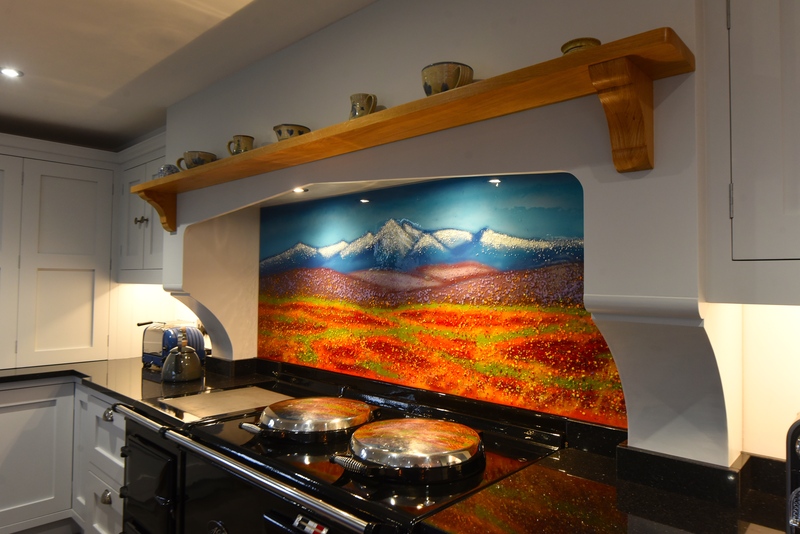 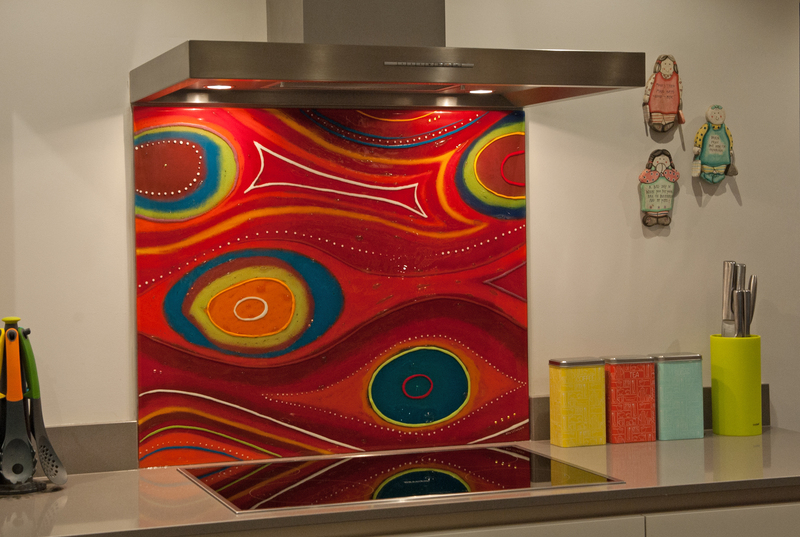 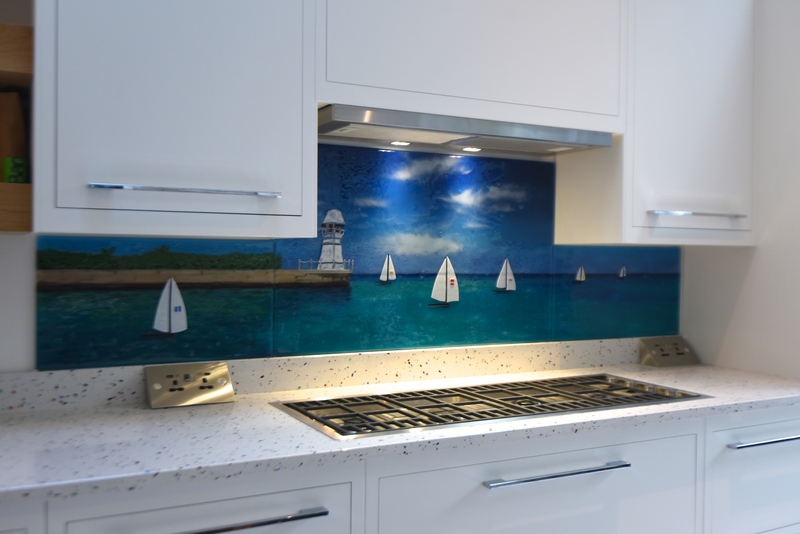 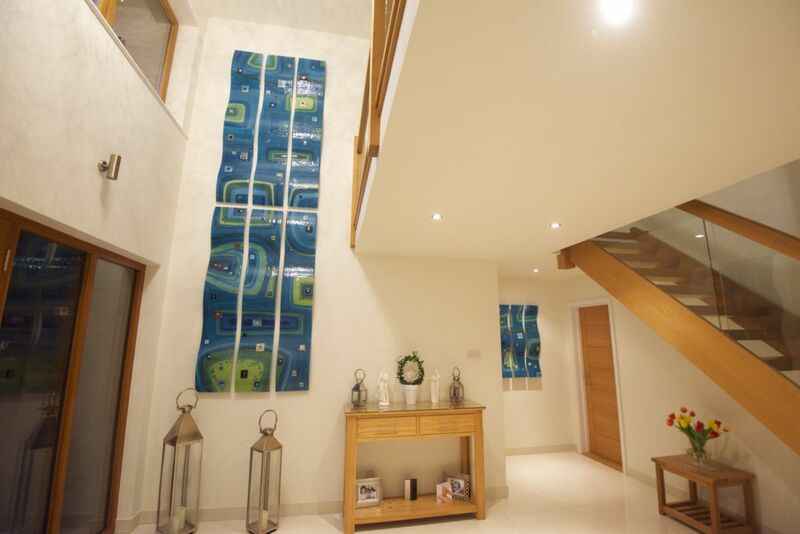 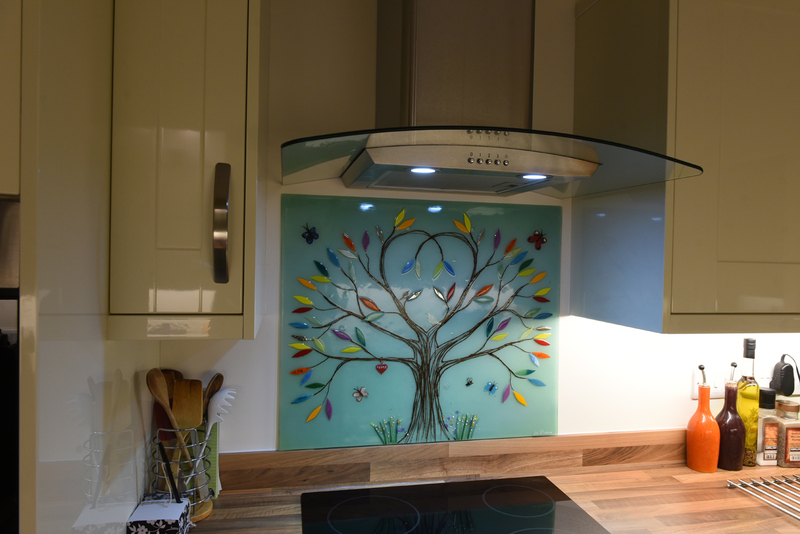 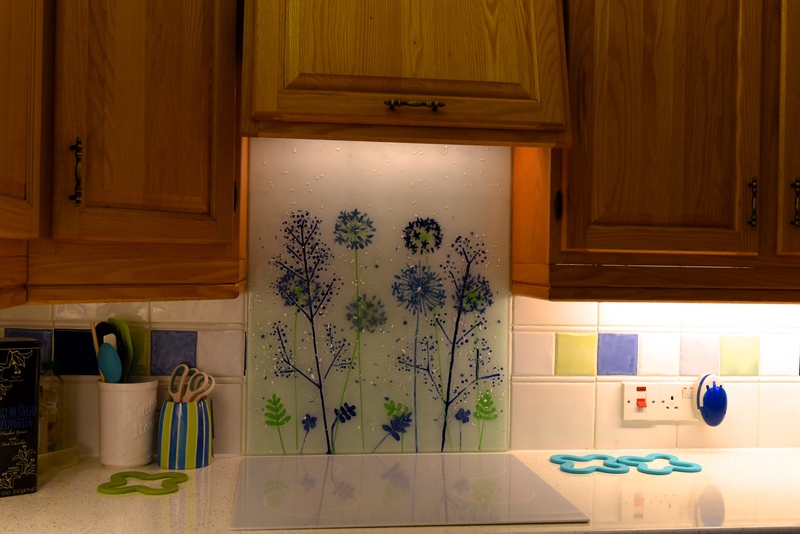 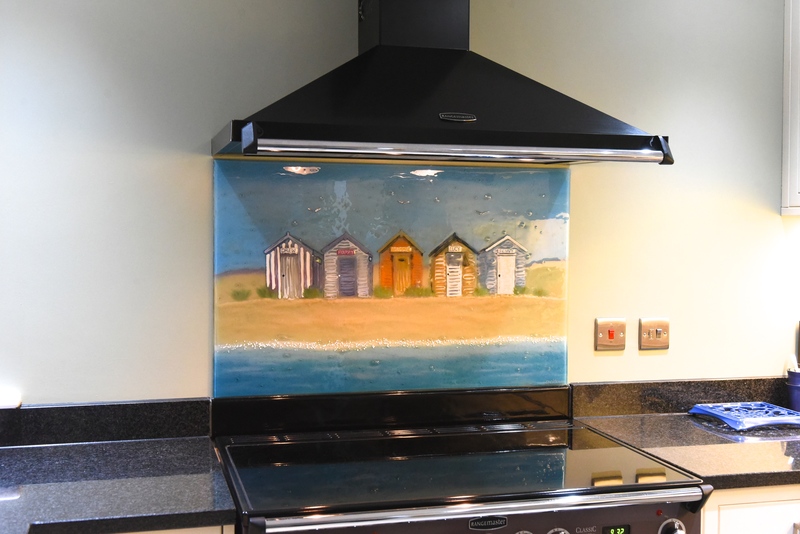 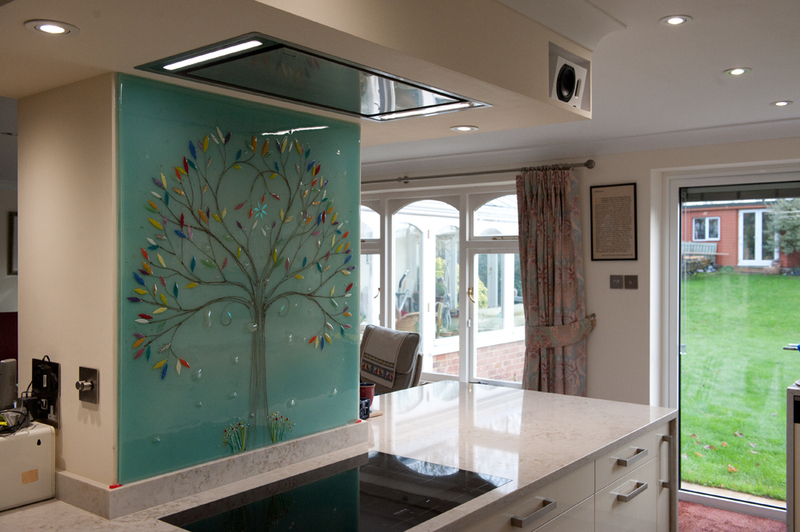 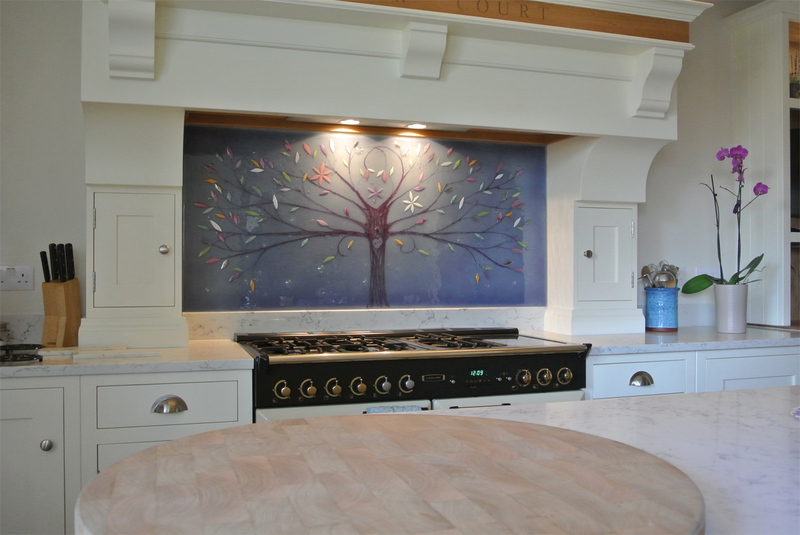 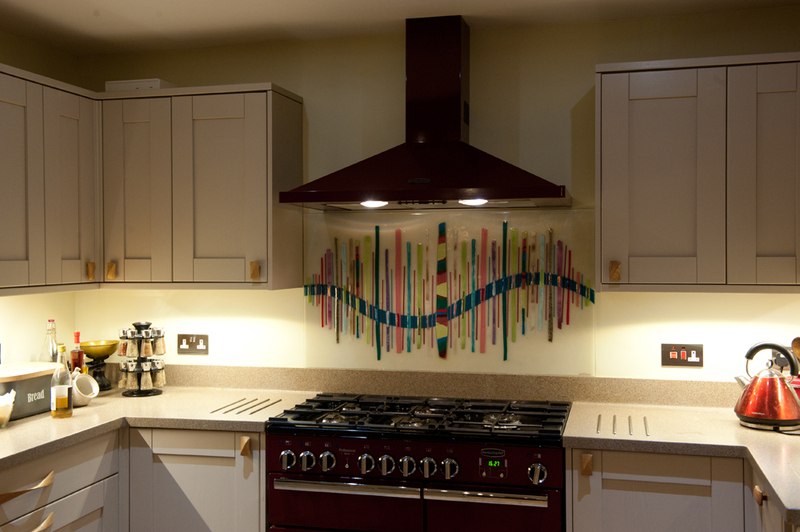 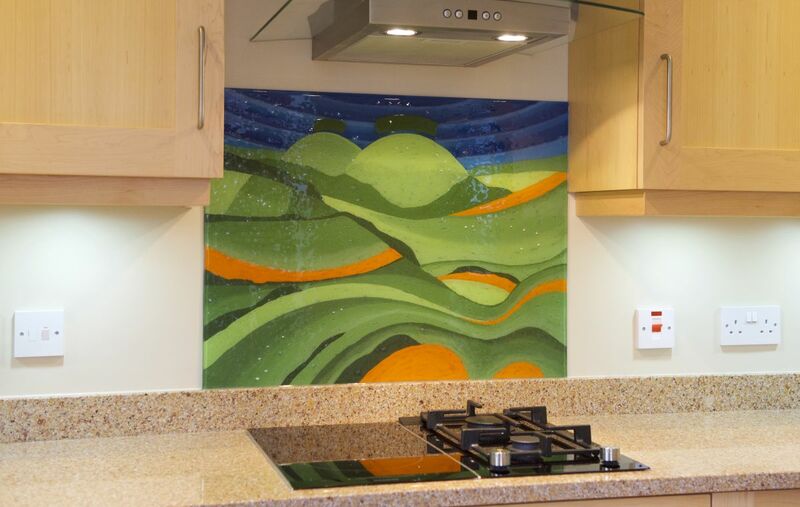 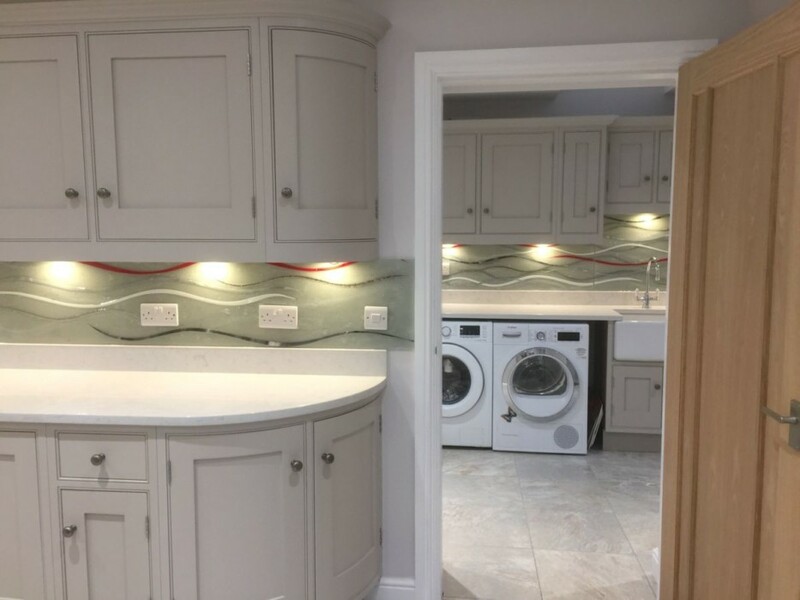 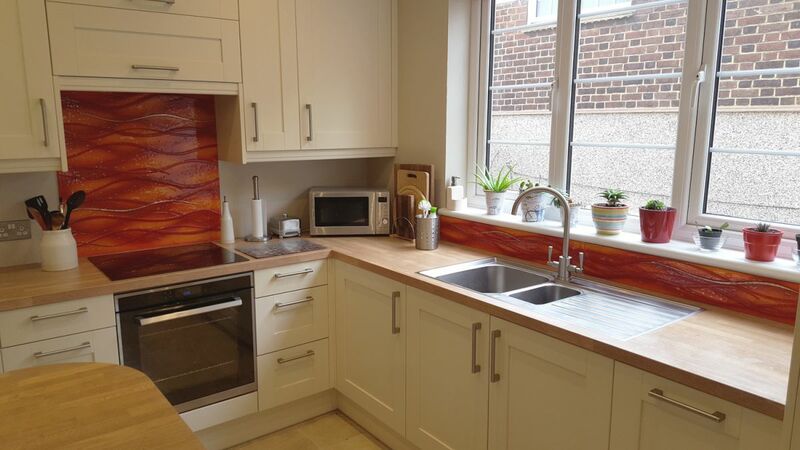 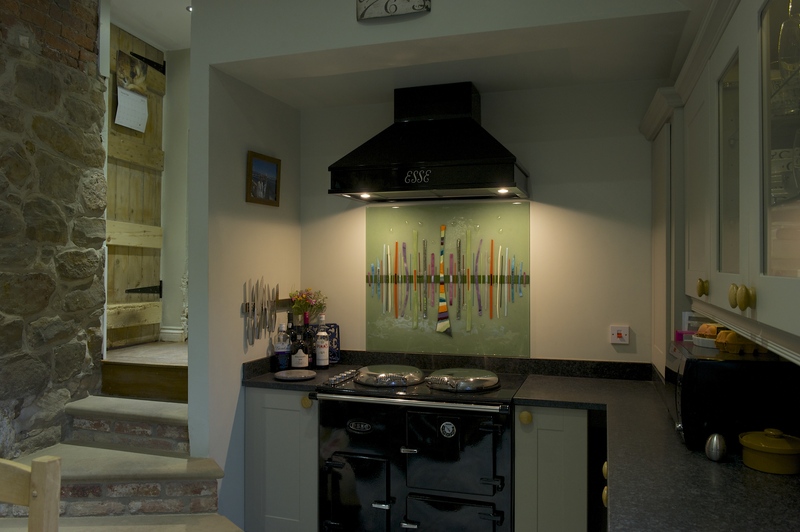 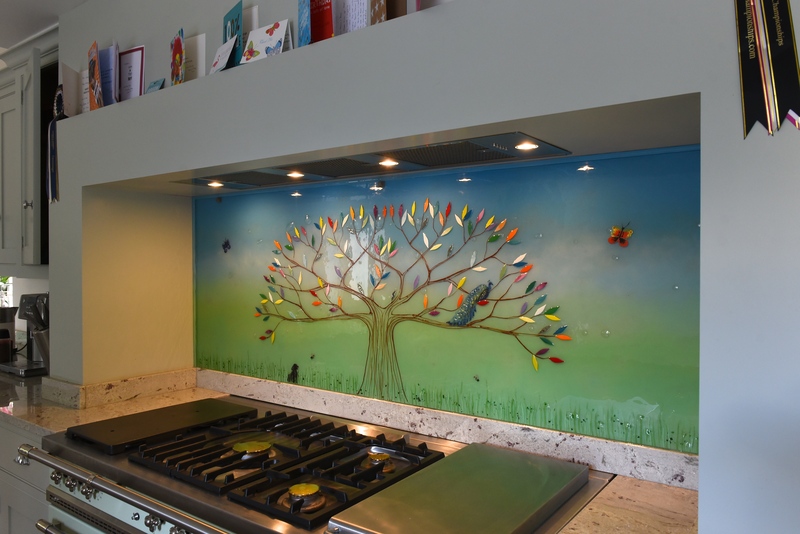 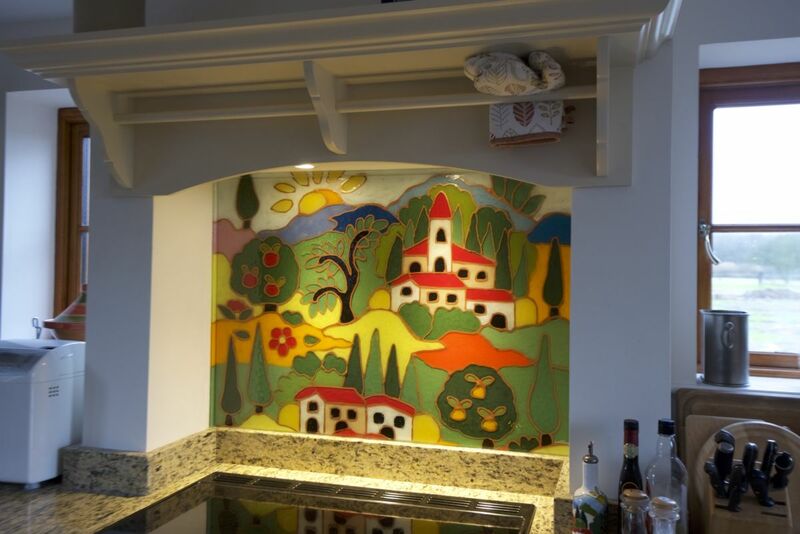 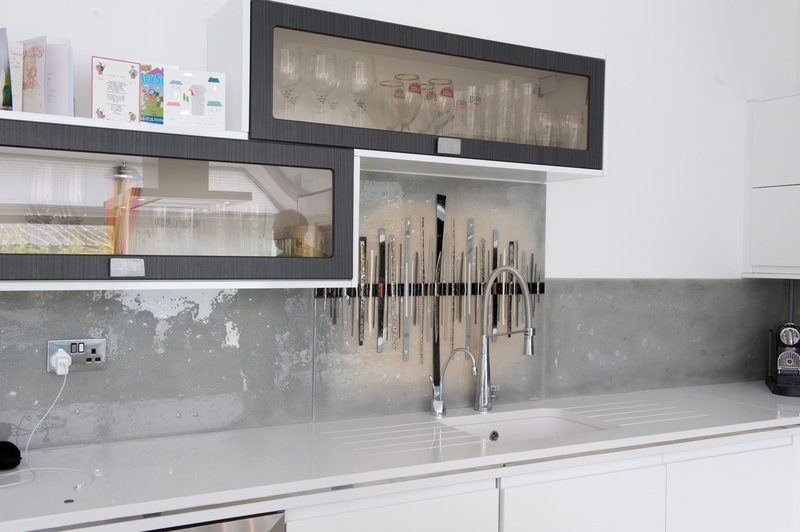 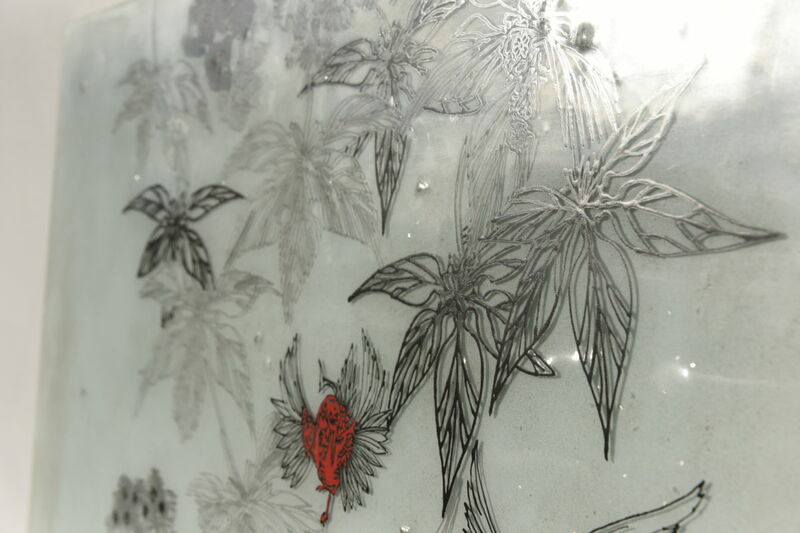 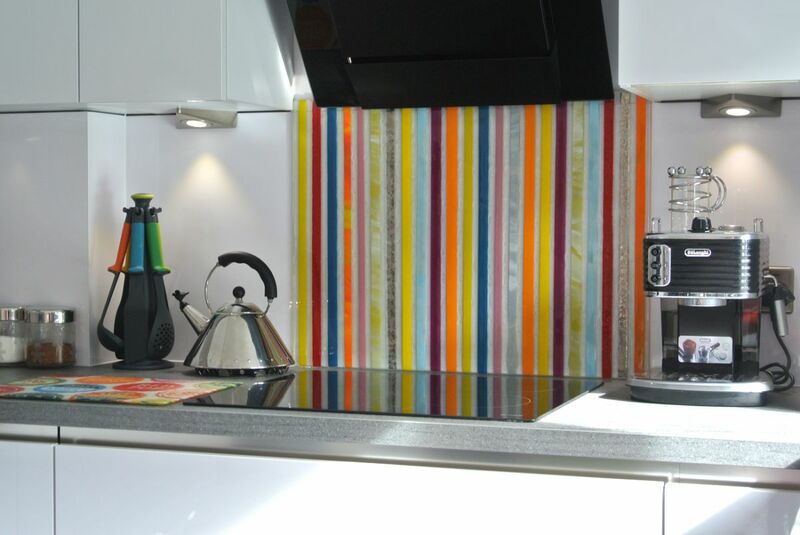 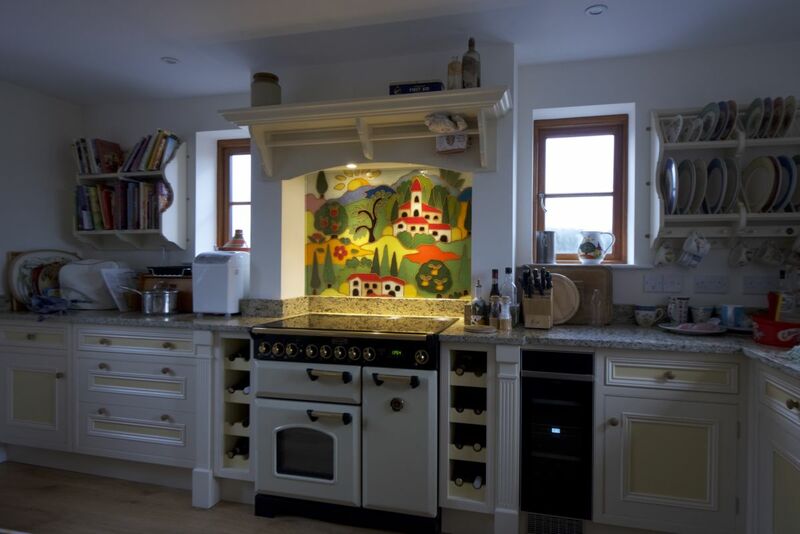 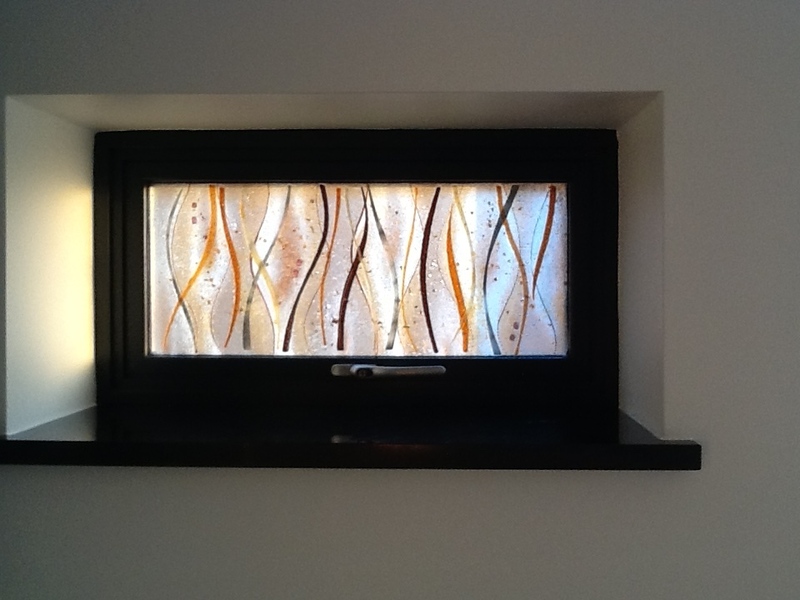 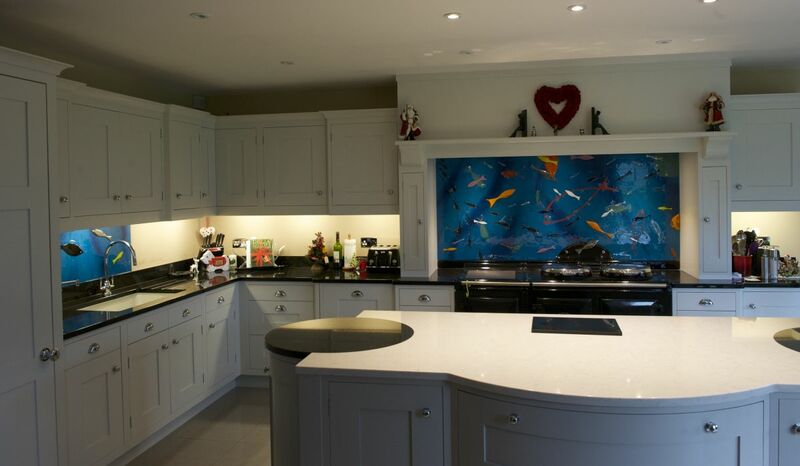 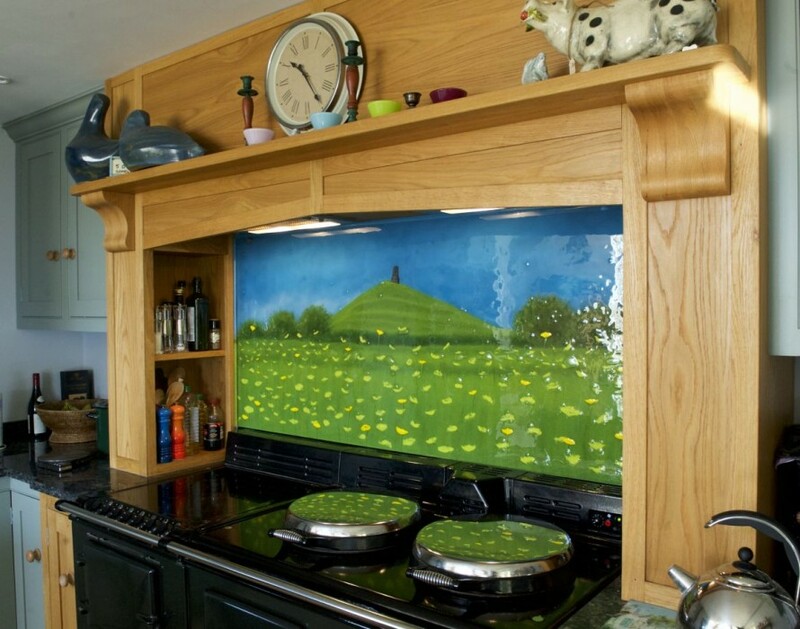 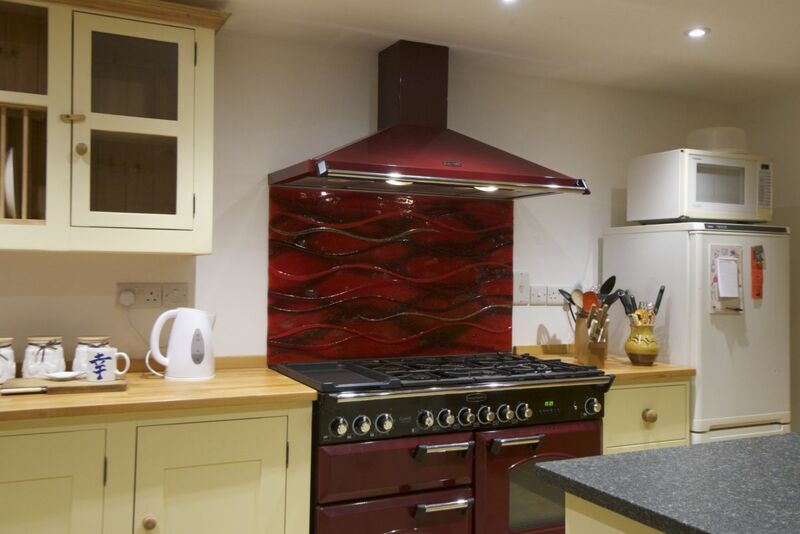 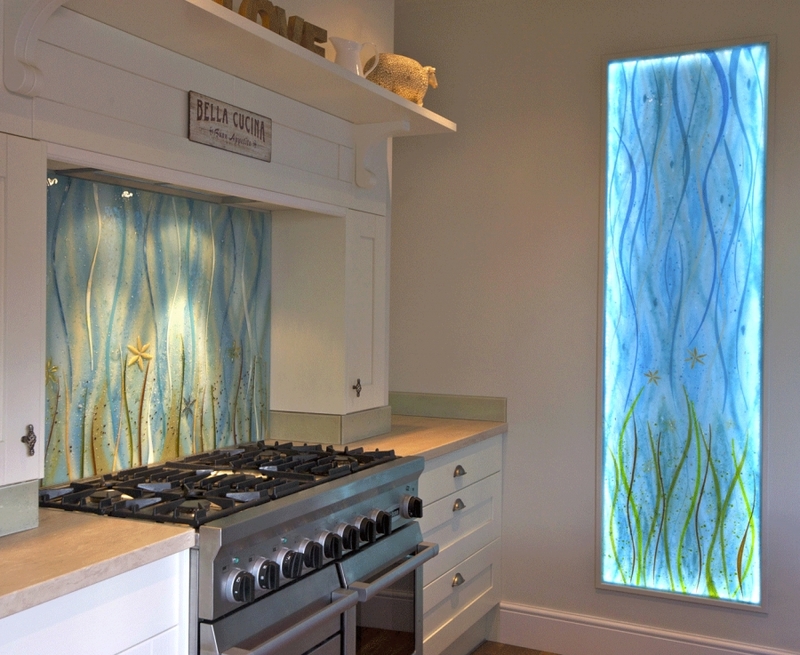 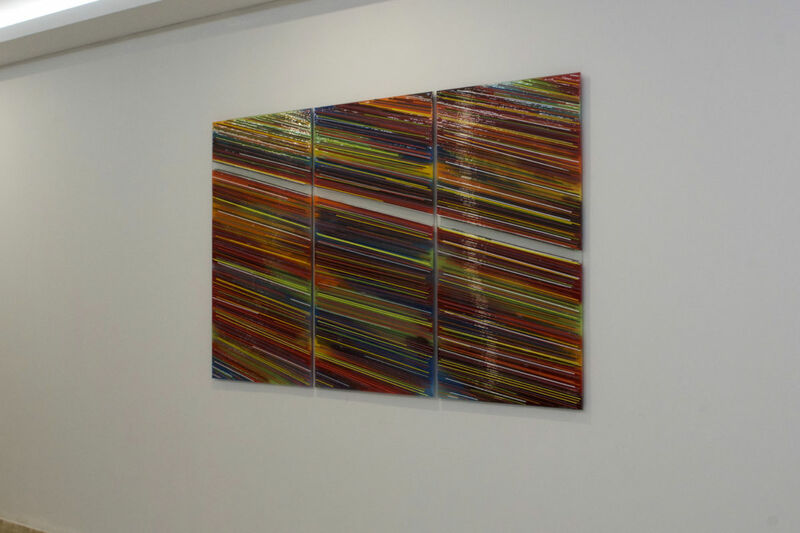 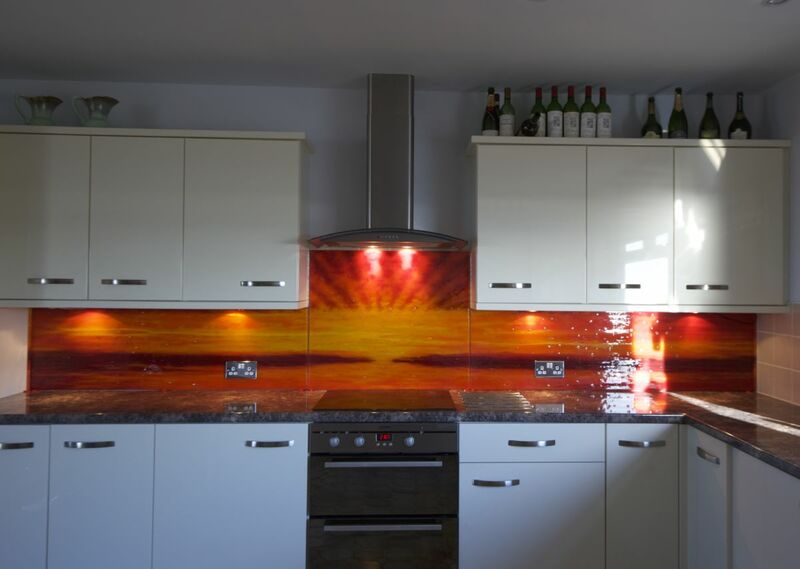 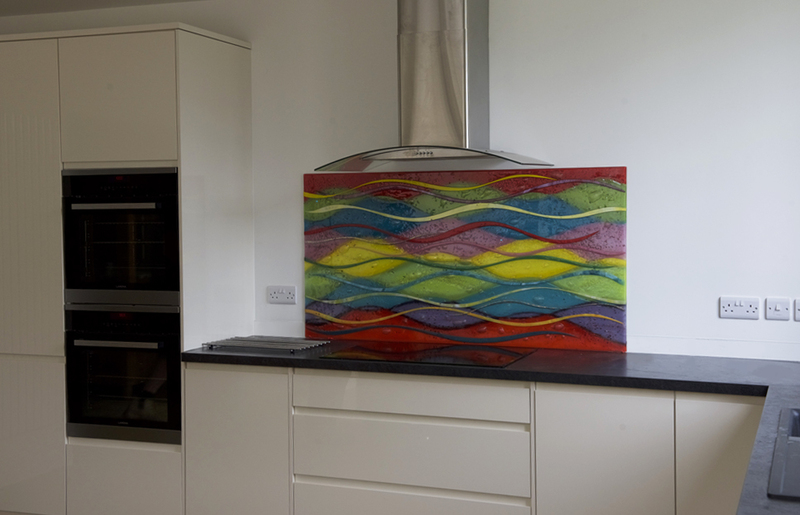 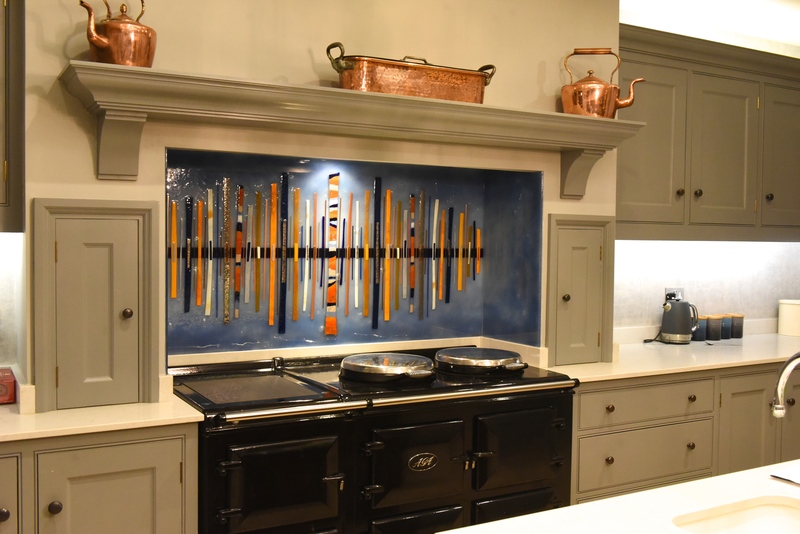 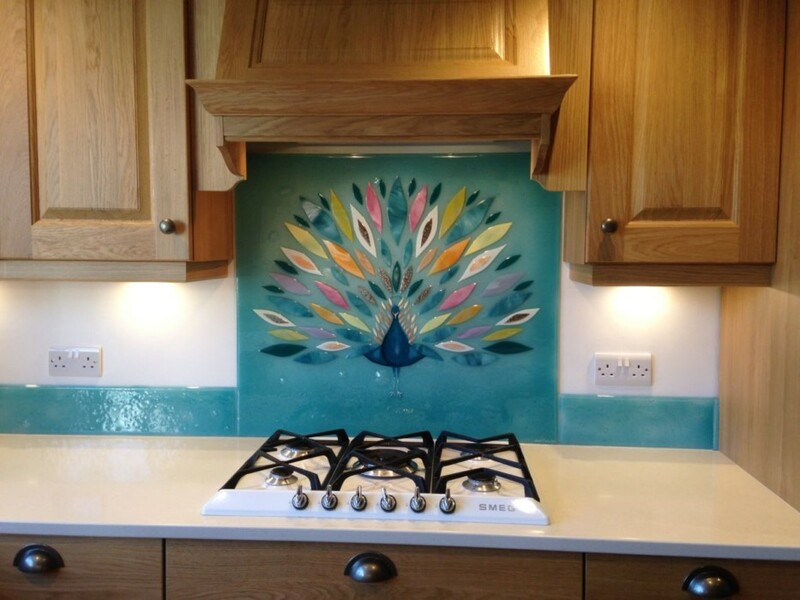 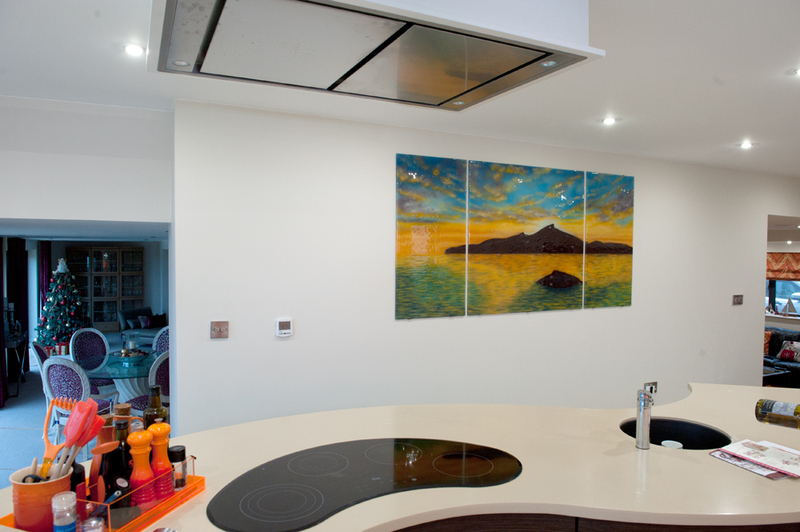 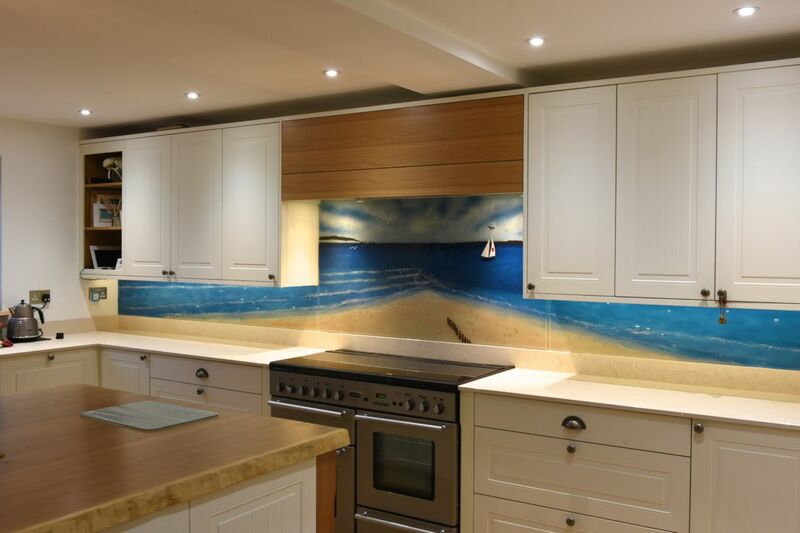 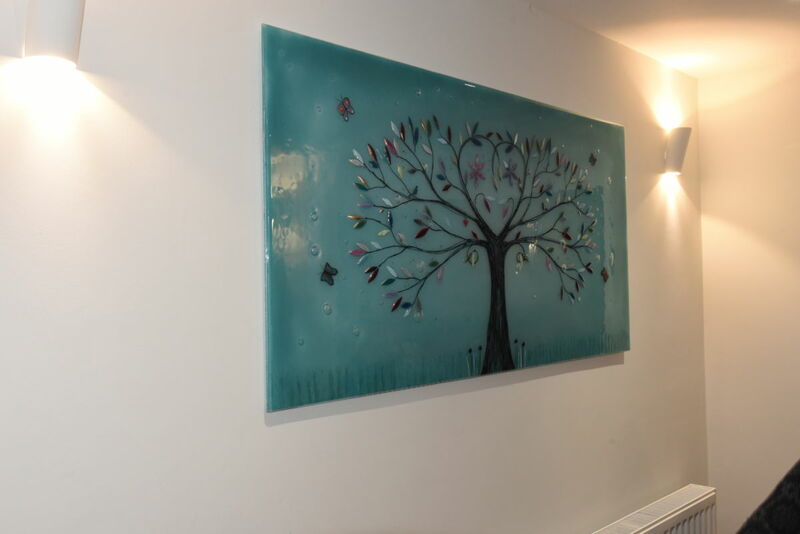 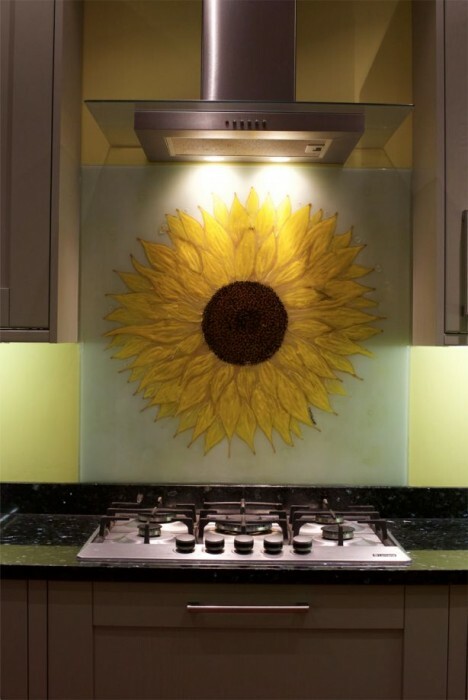 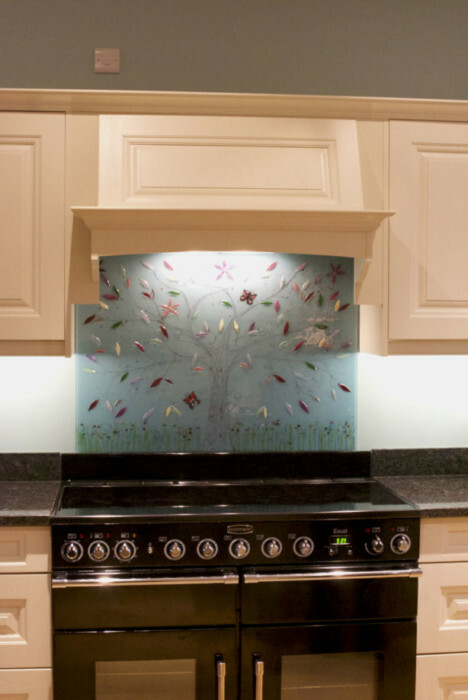 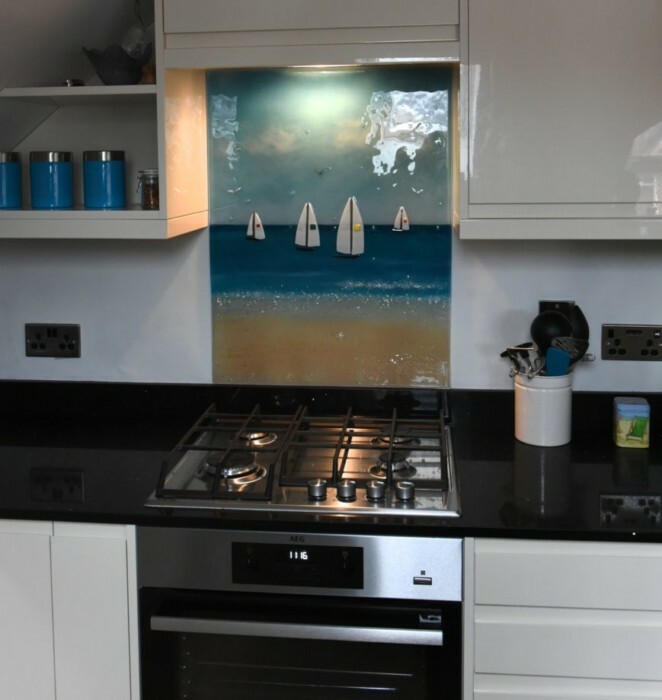 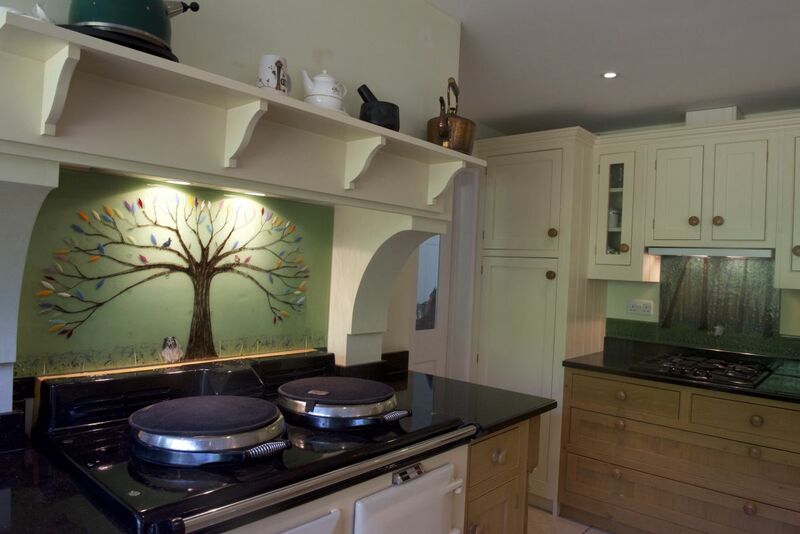 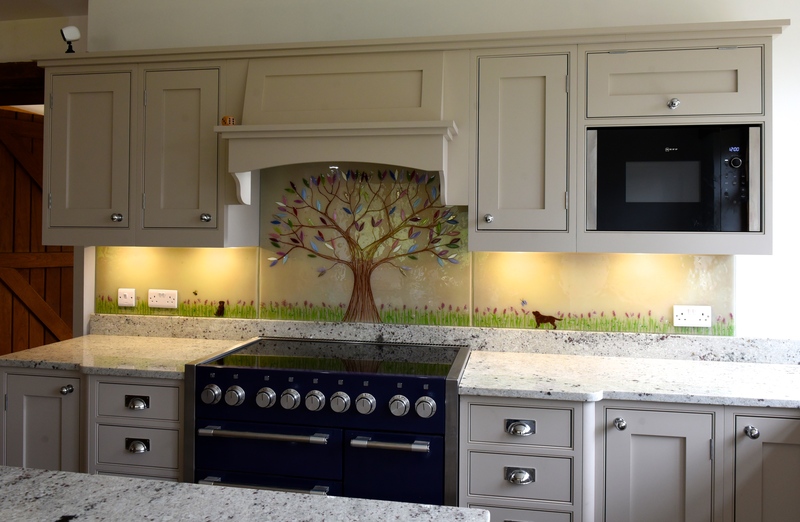 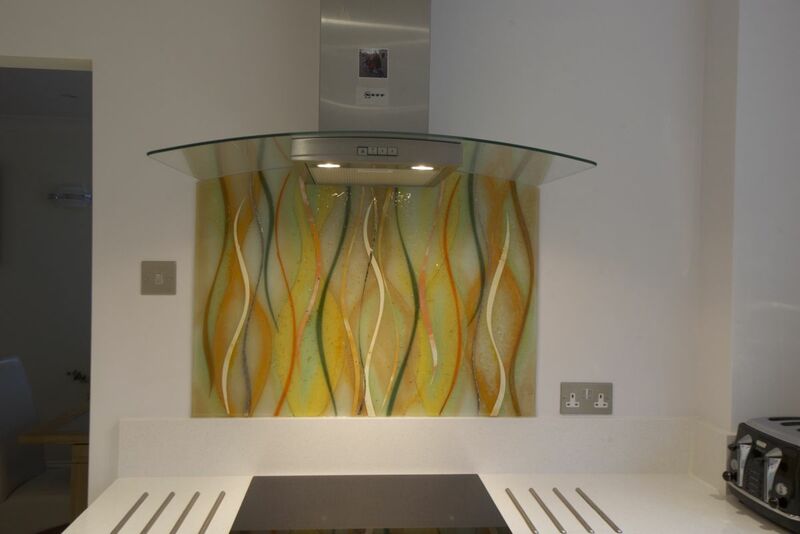 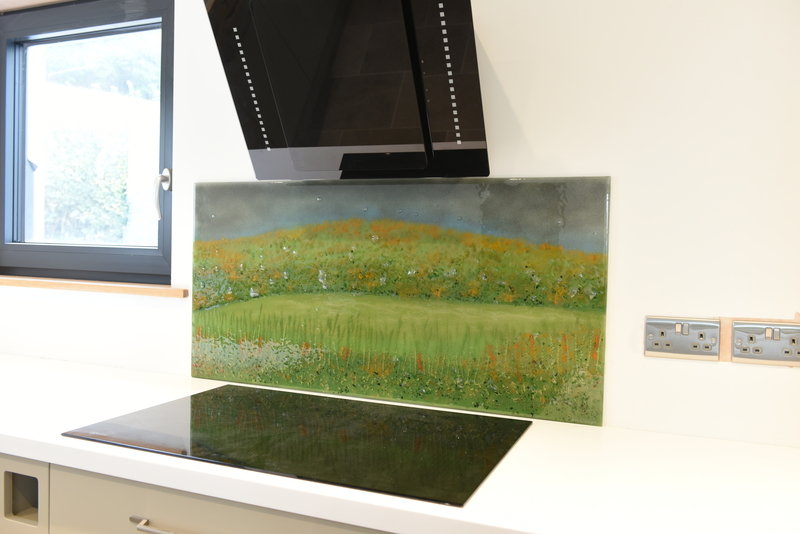 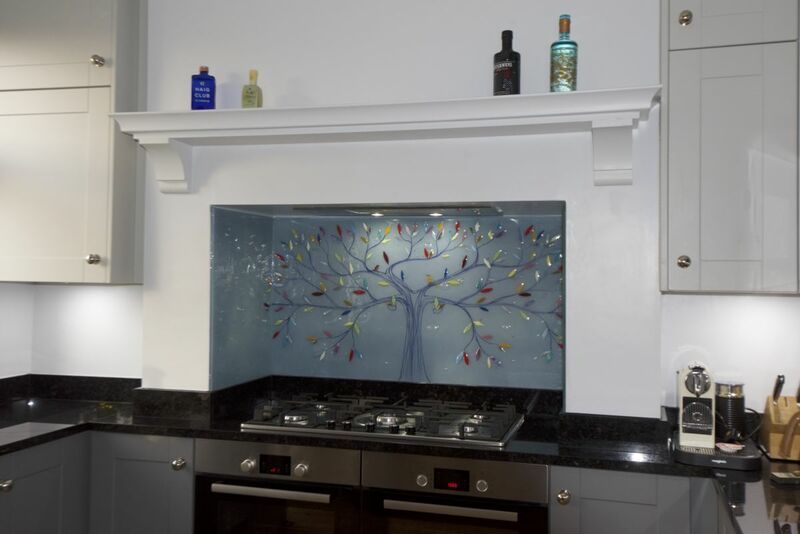 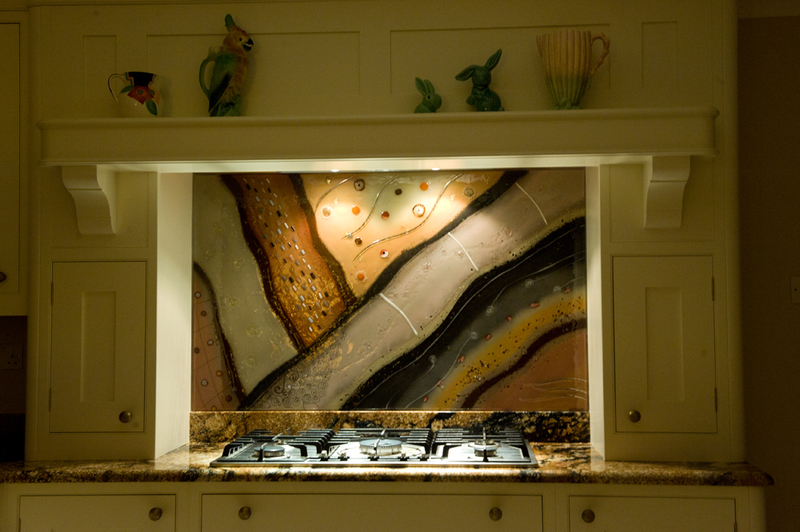 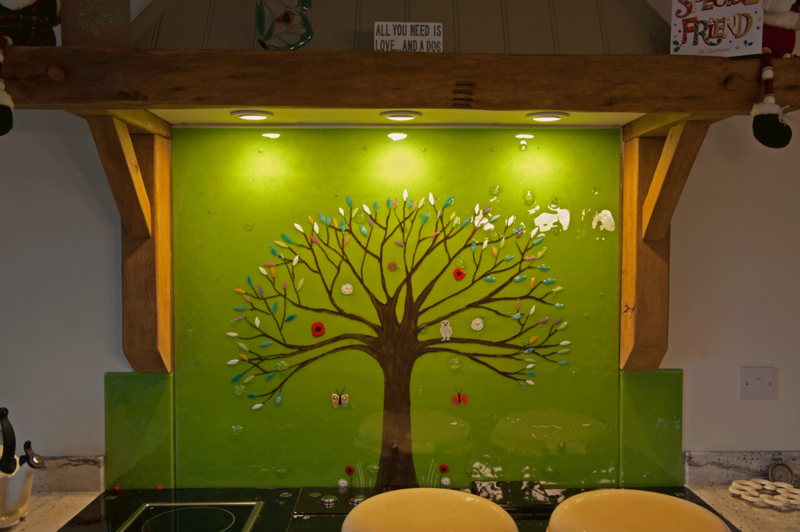 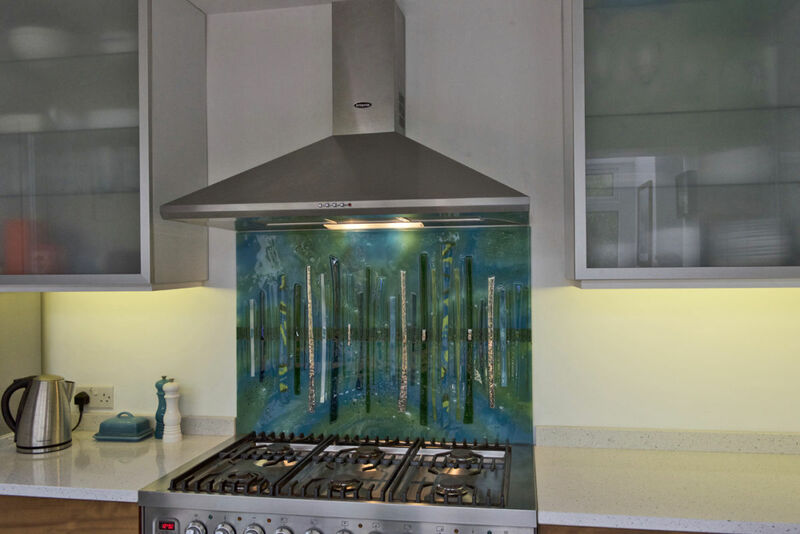 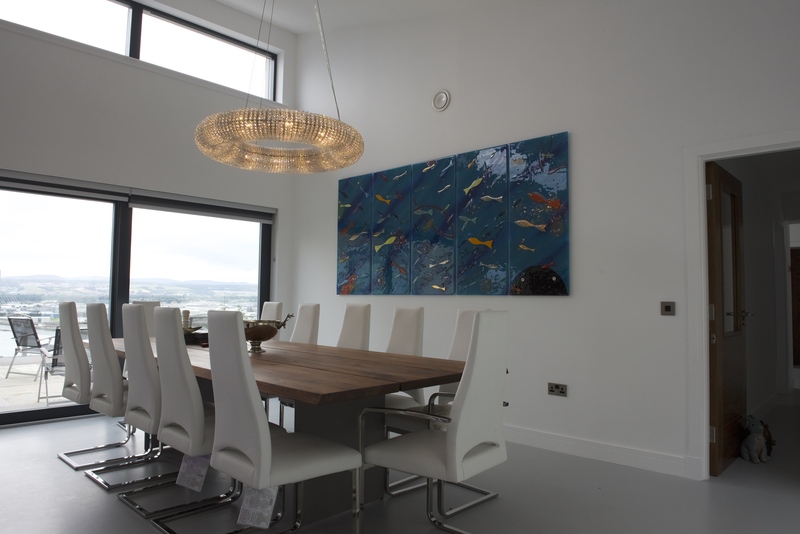 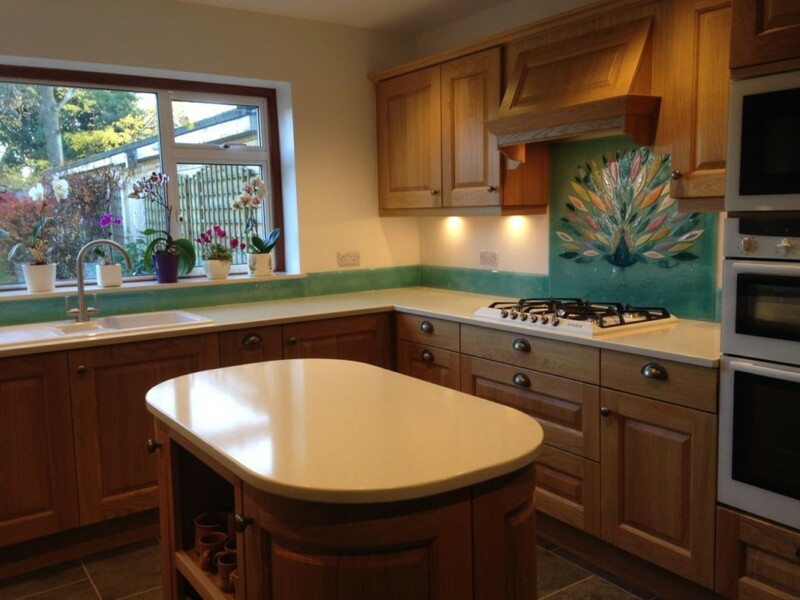 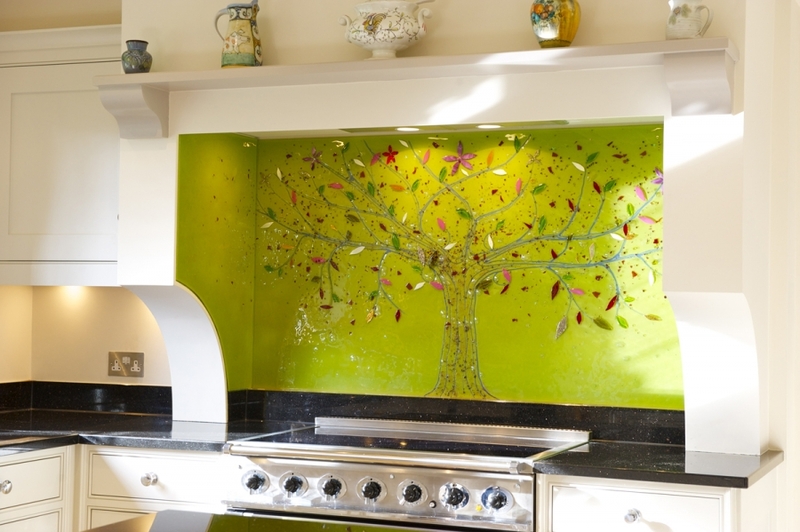 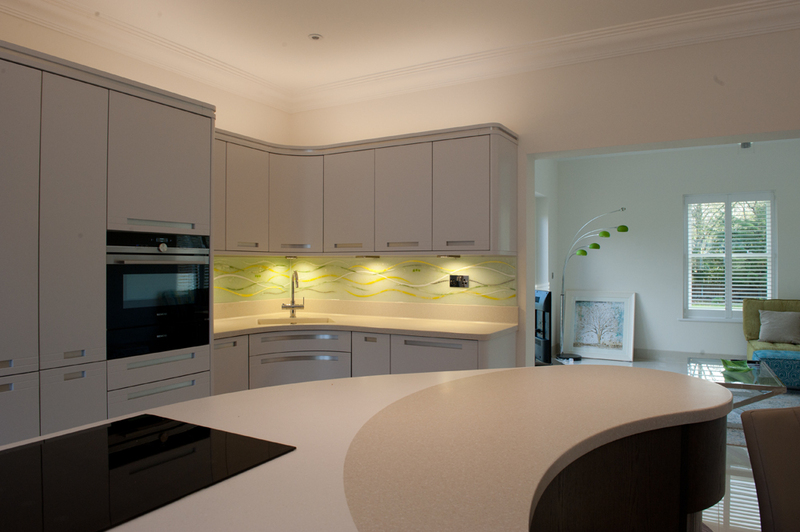 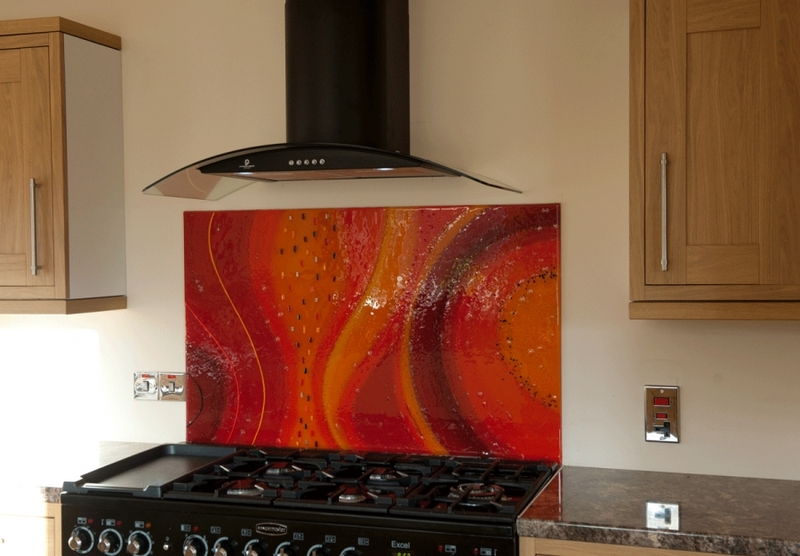 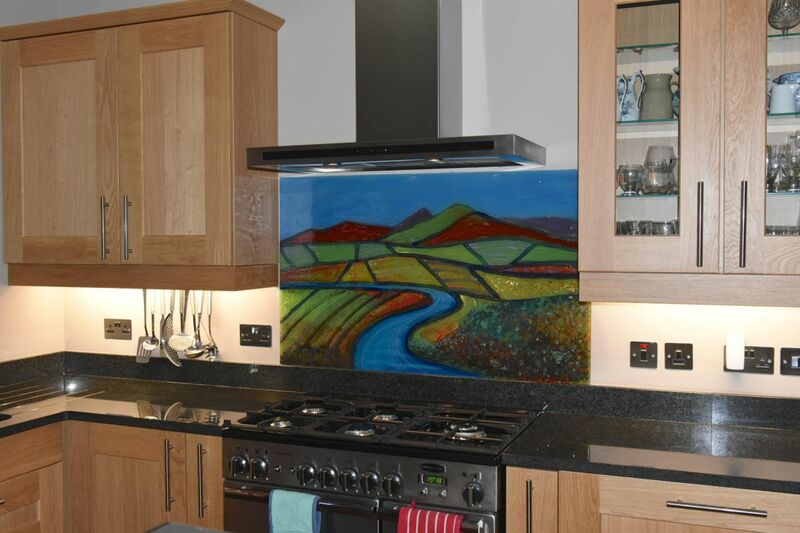 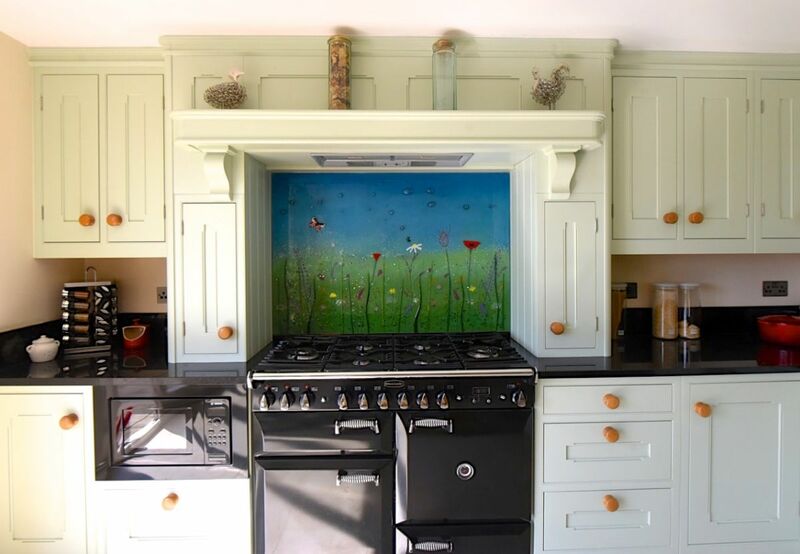 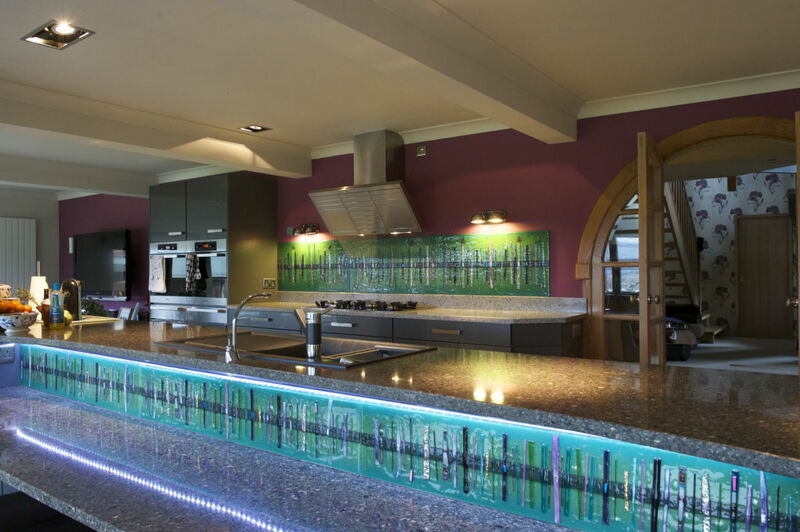 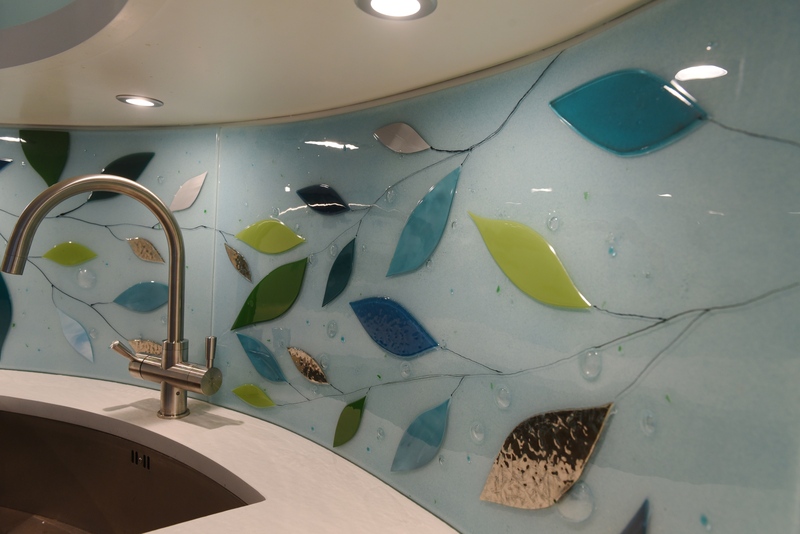 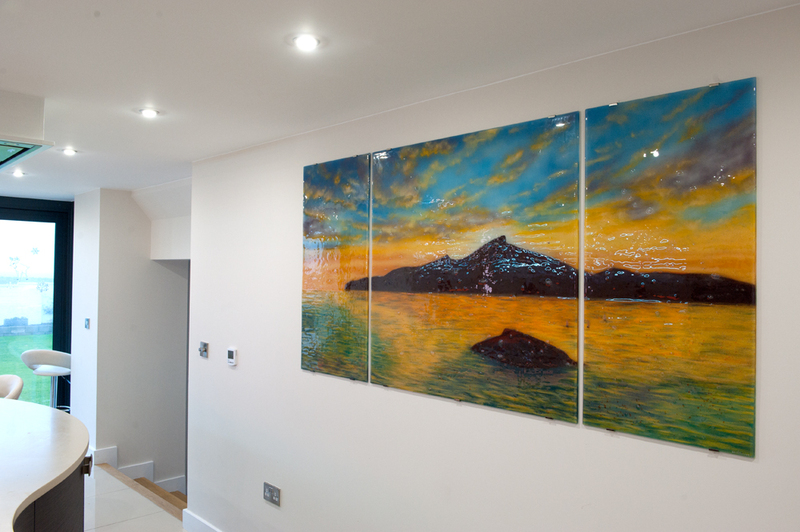 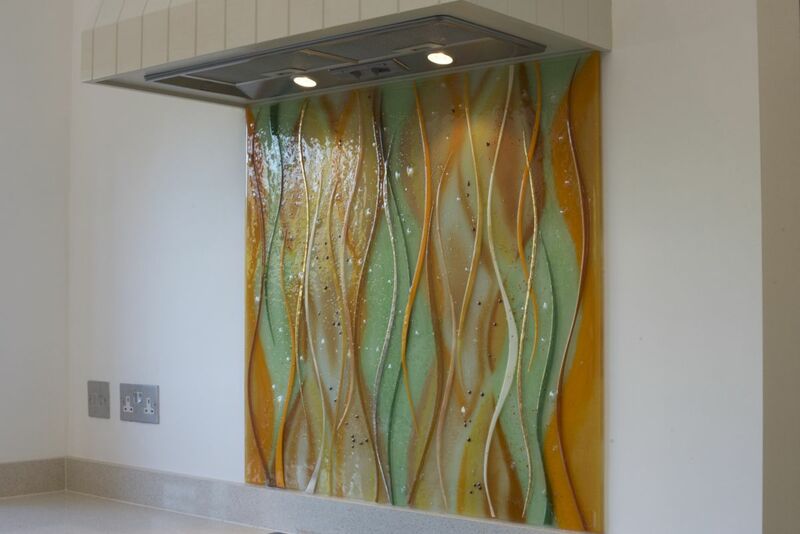 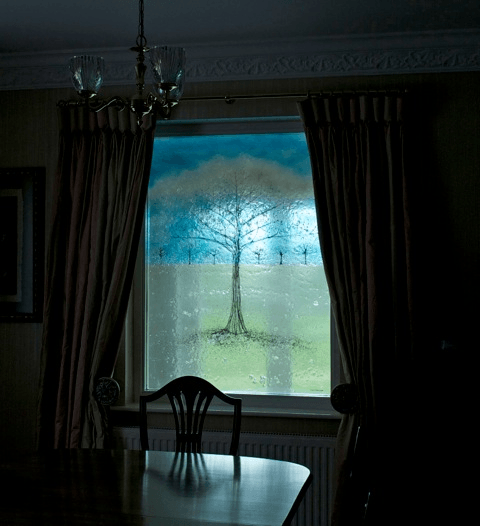 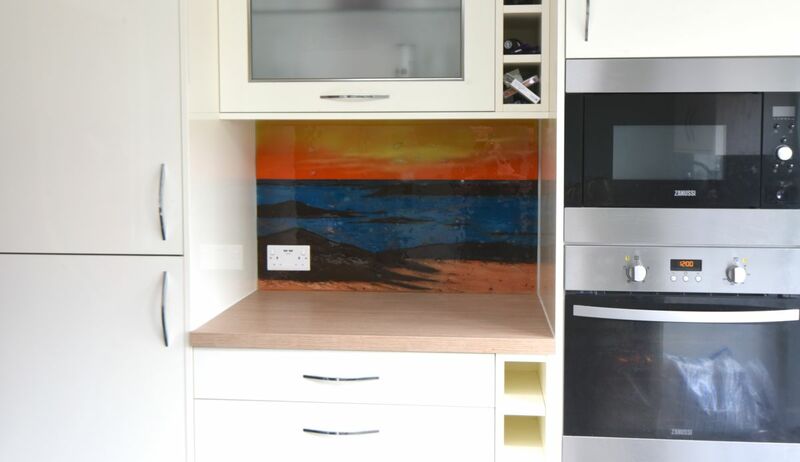 After all, this is one of our favourite bespoke fused glass splashbacks to date. 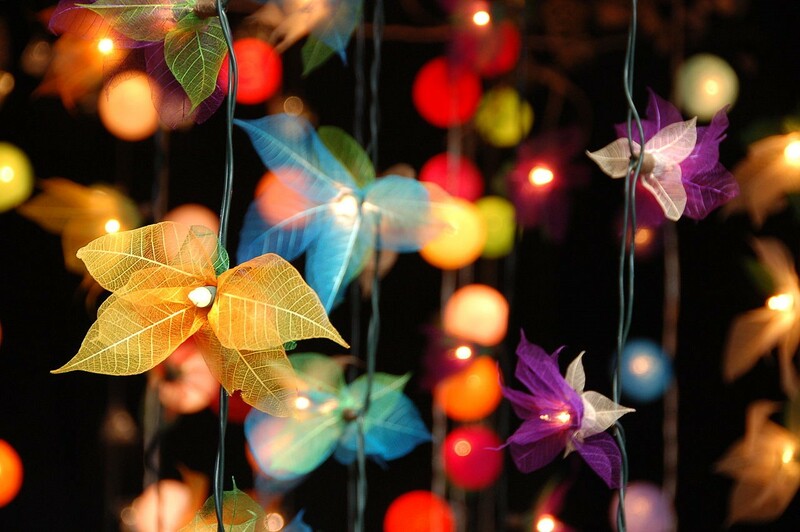 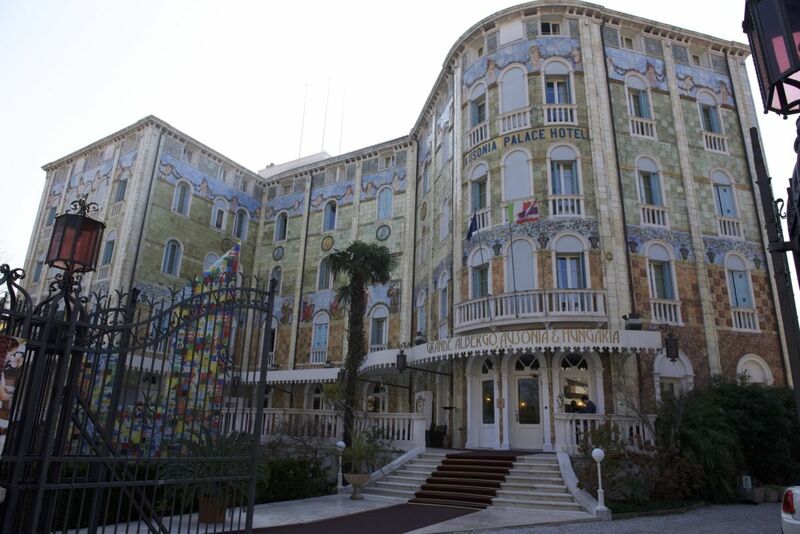 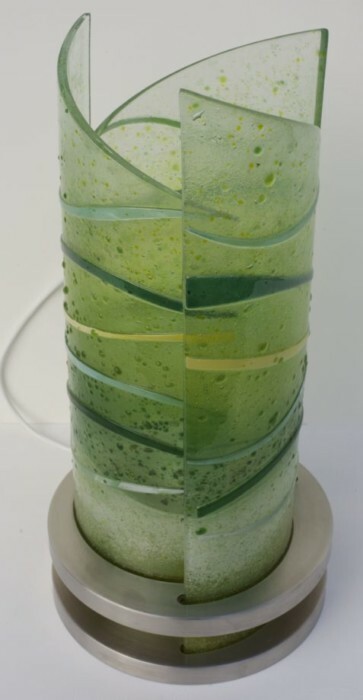 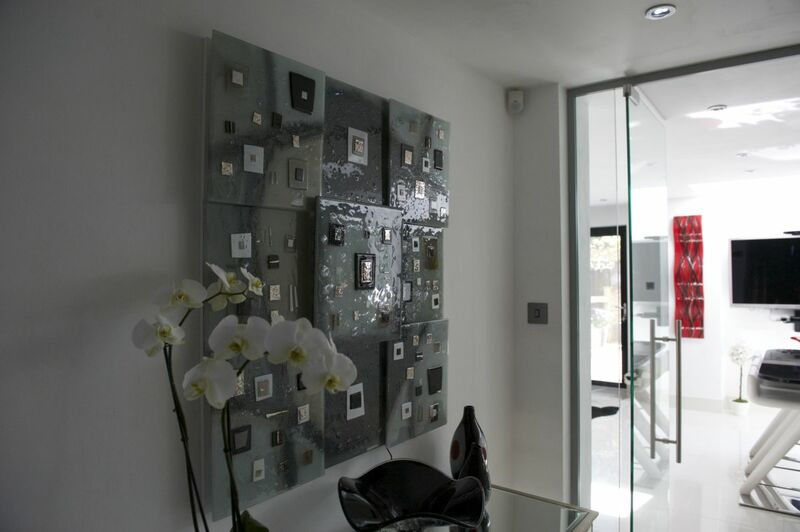 The design of the piece is certainly worth mentioning! 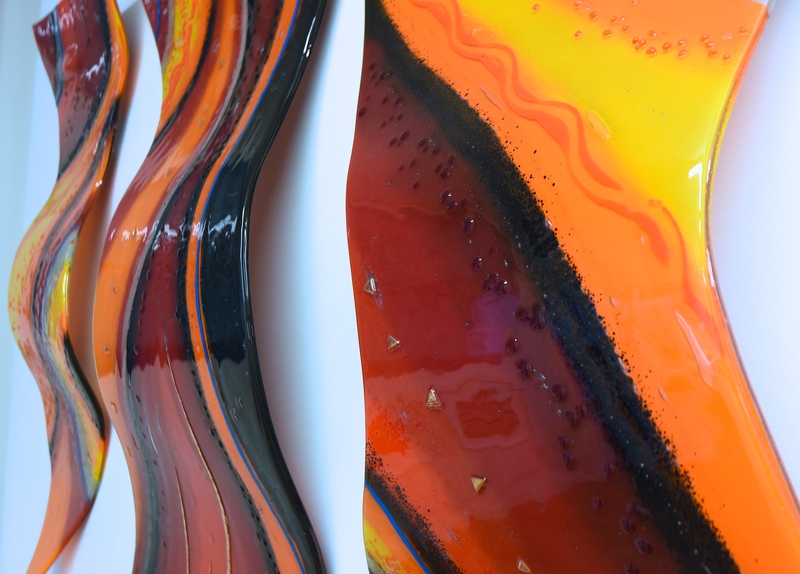 The blue hues and orange shades within the piece really come together as both hot and cold, creating a unique visual effect and a healthy amount of contrast. 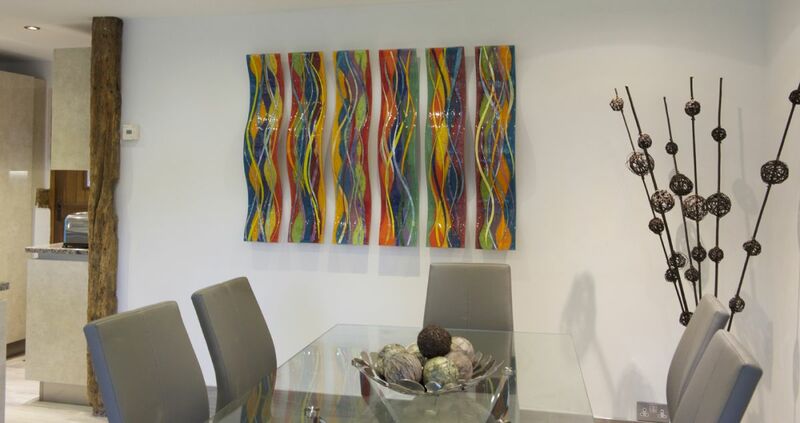 It really stands out in the space it’s set in, especially with the incredibly clean lines of the modern décor around it. 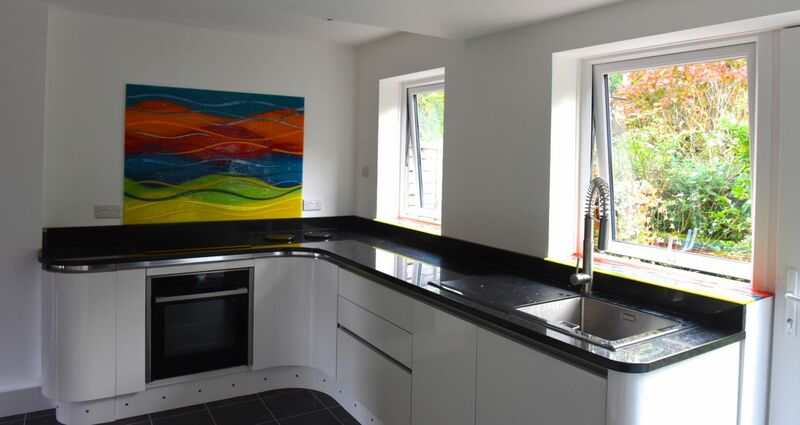 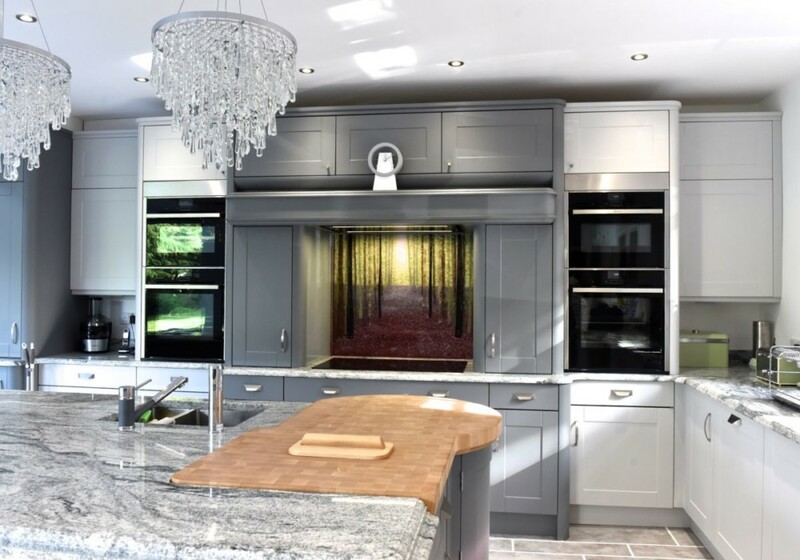 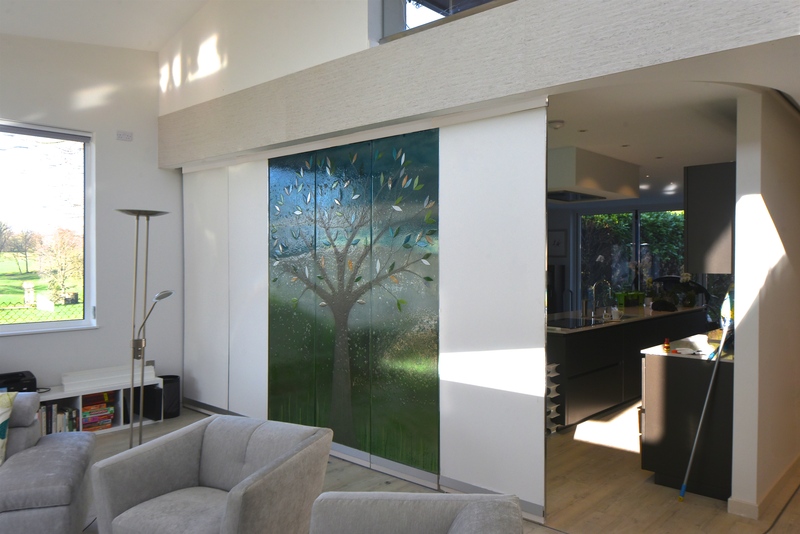 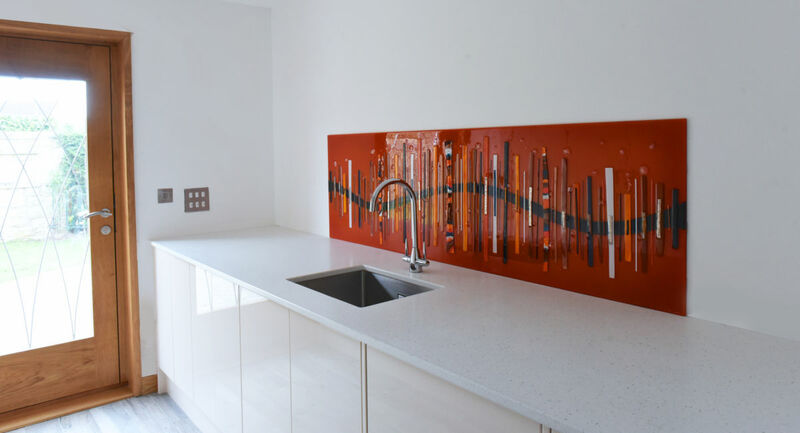 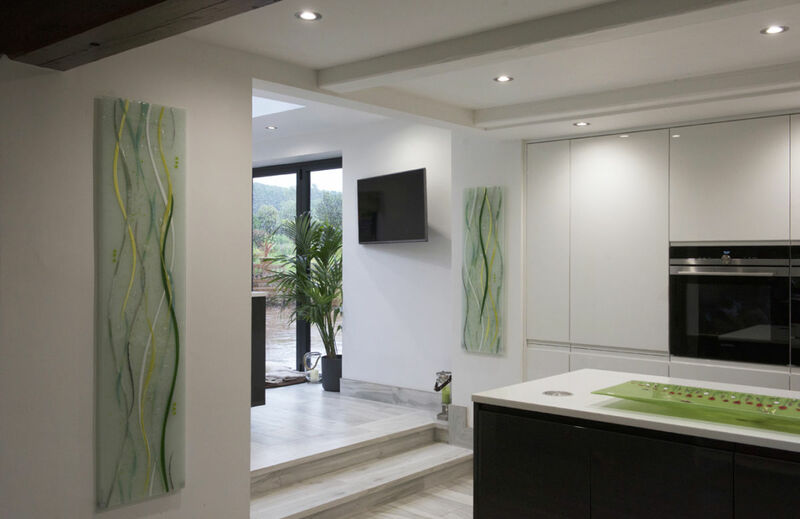 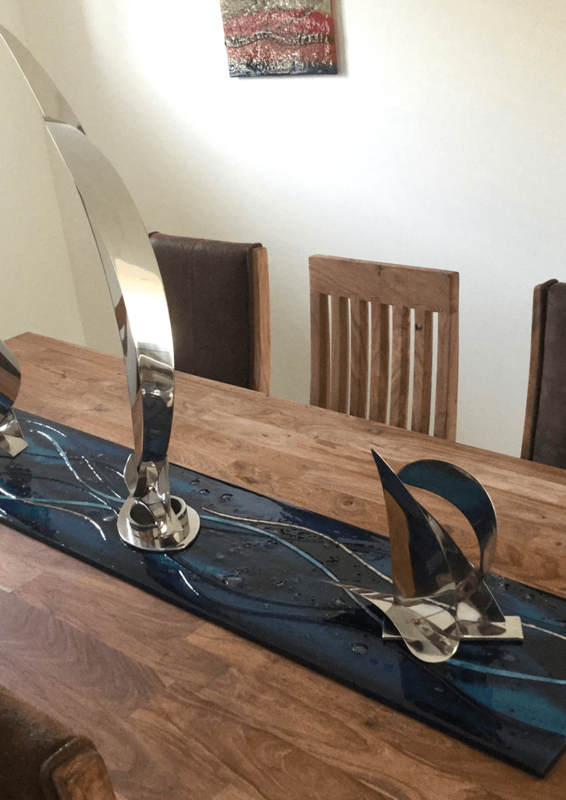 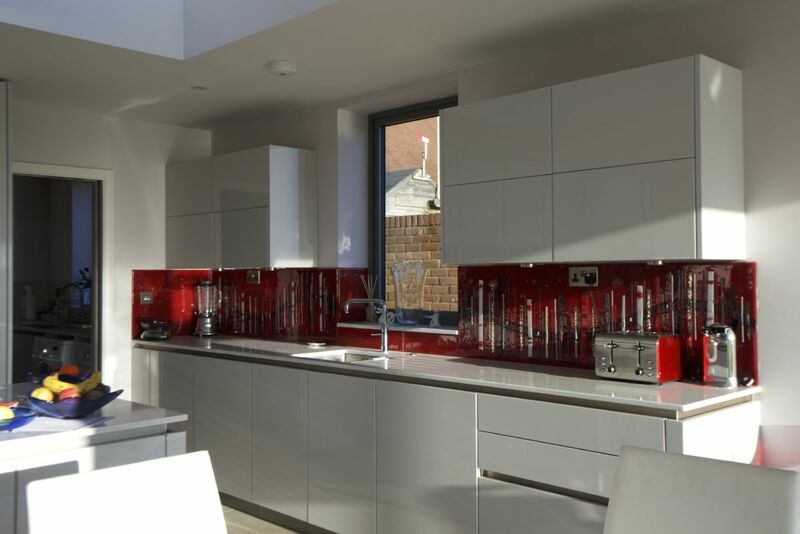 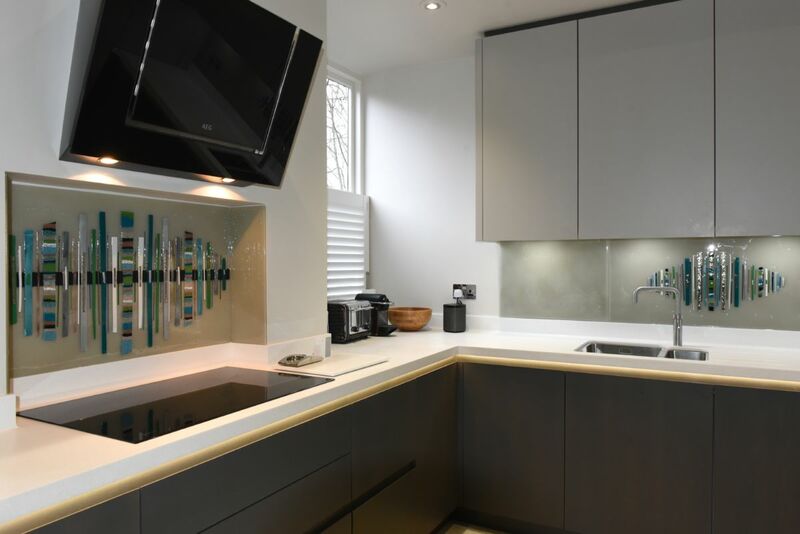 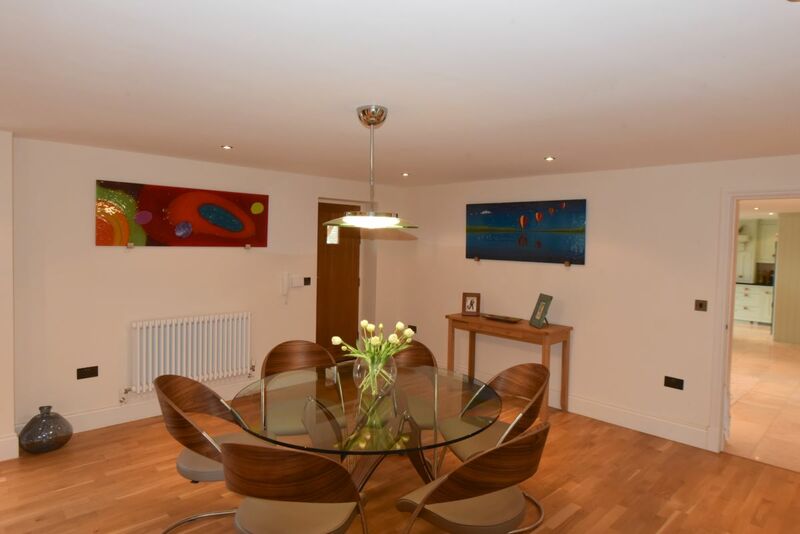 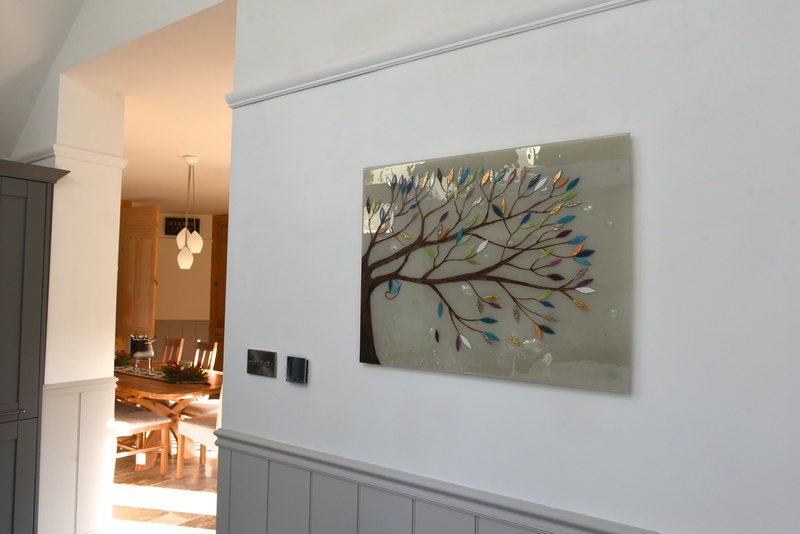 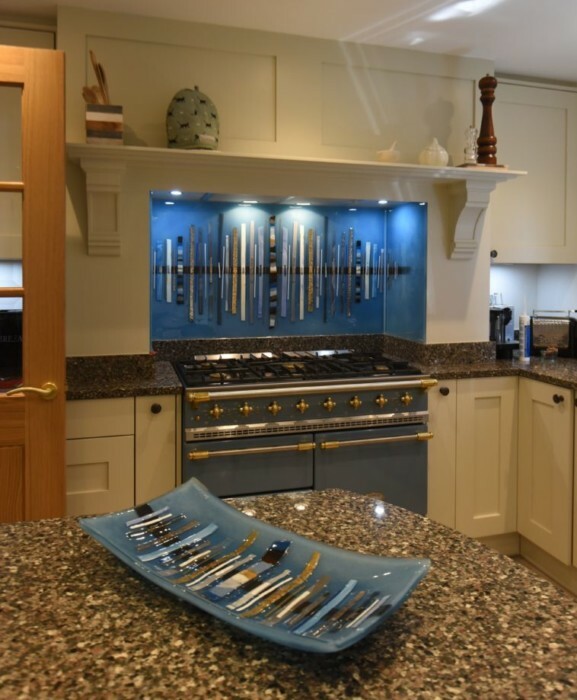 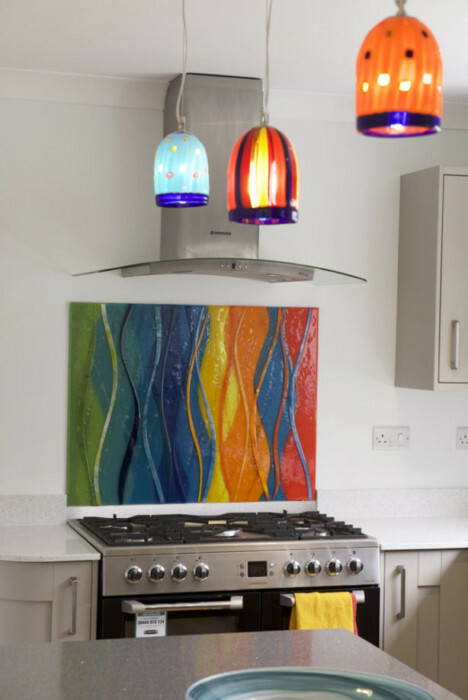 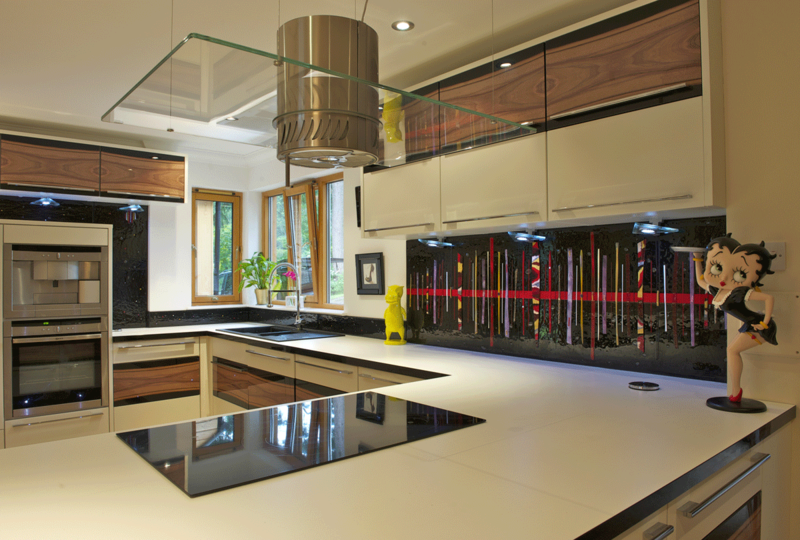 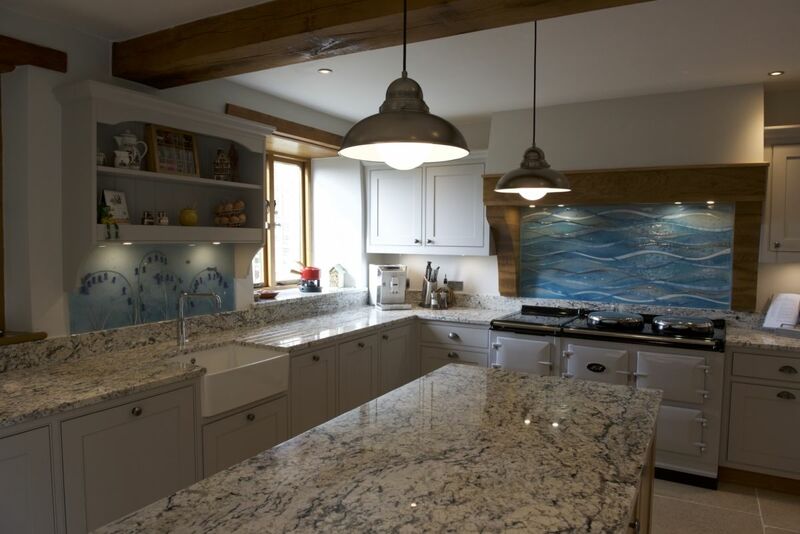 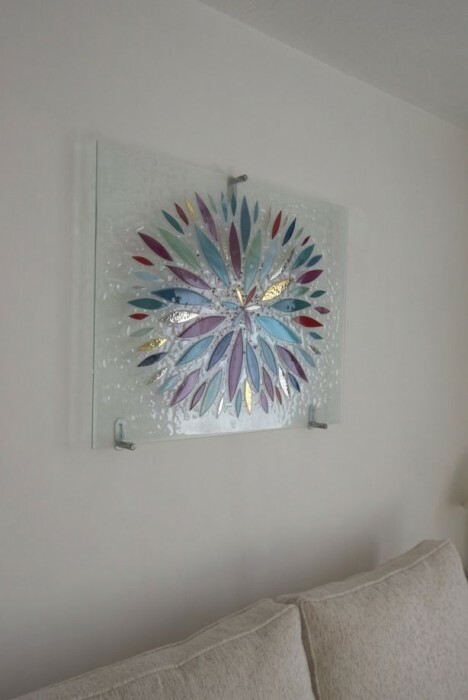 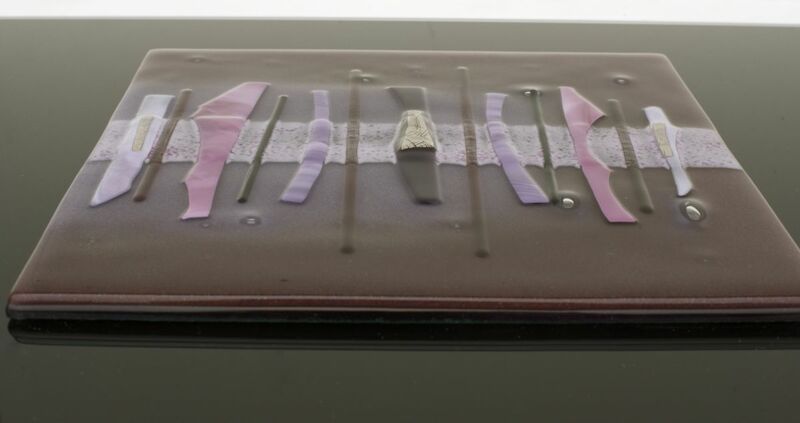 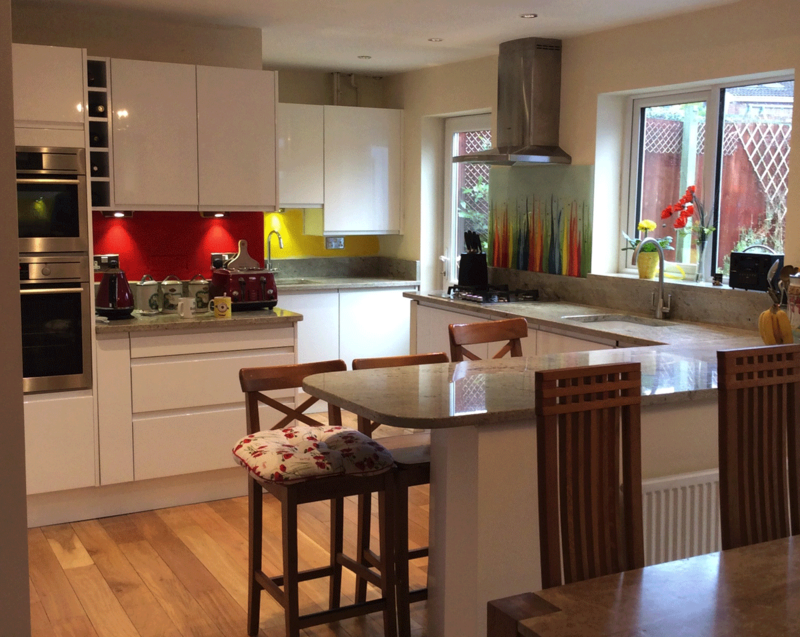 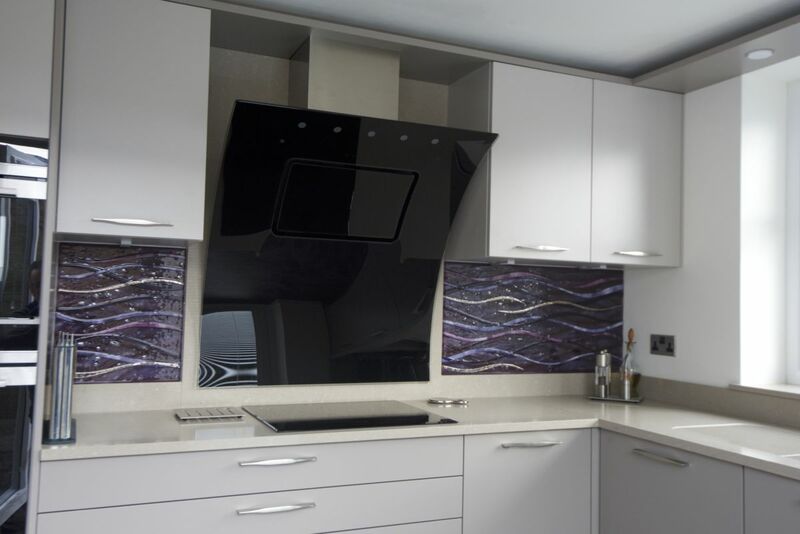 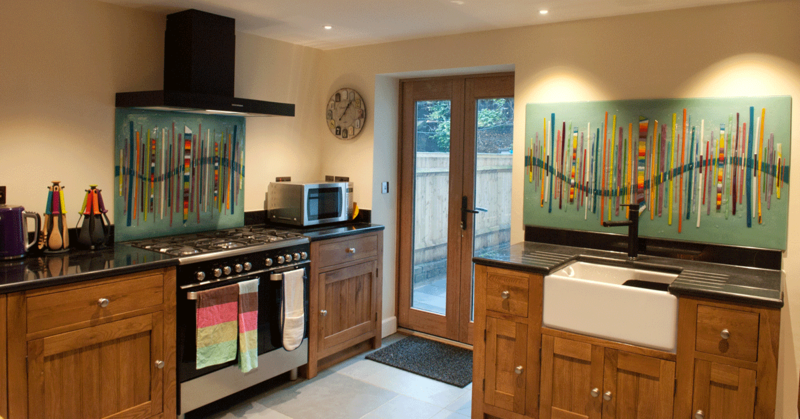 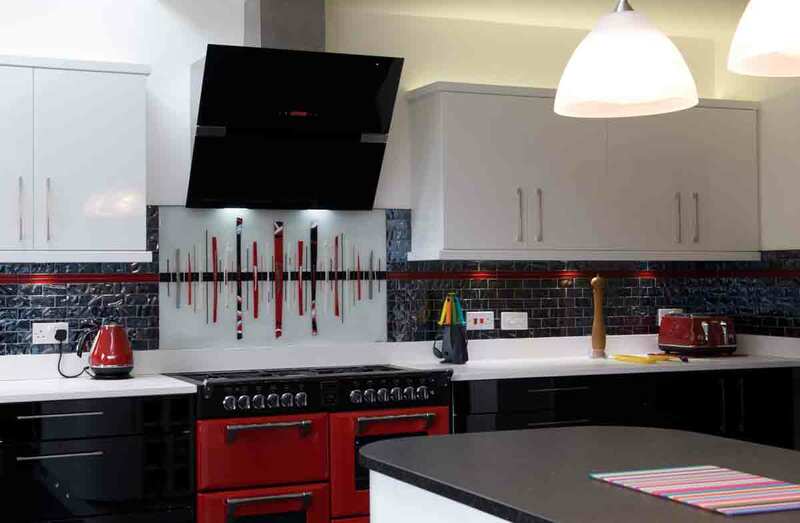 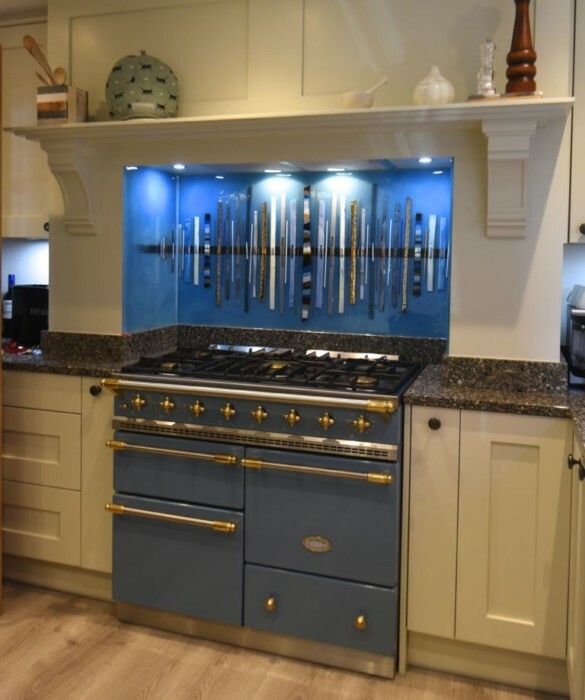 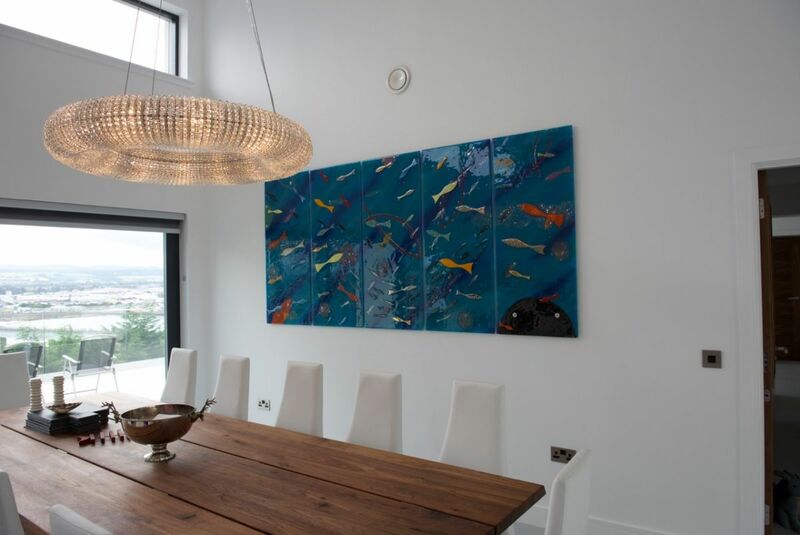 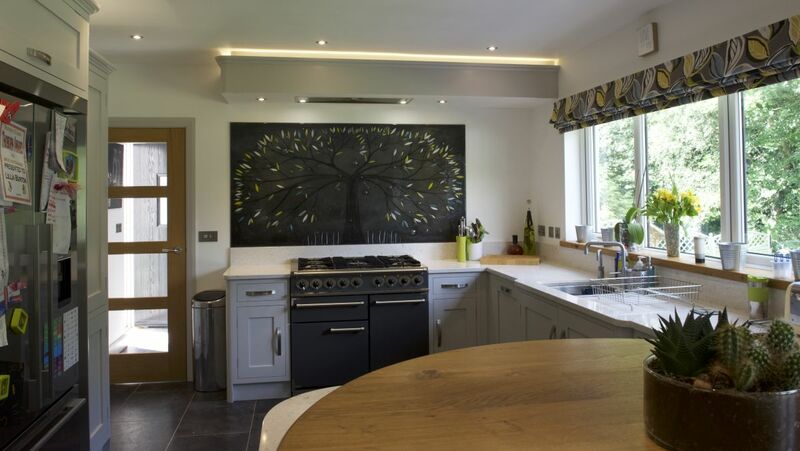 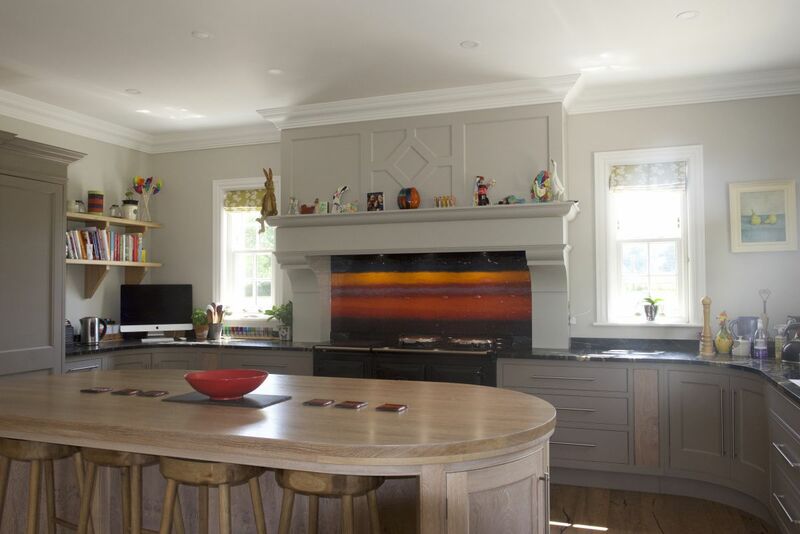 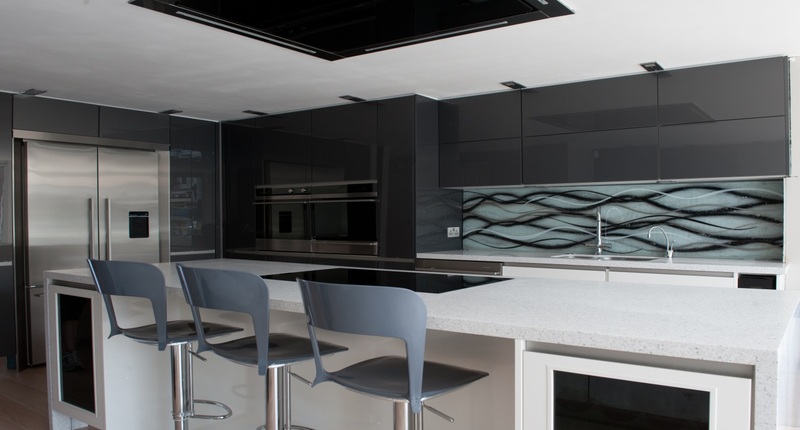 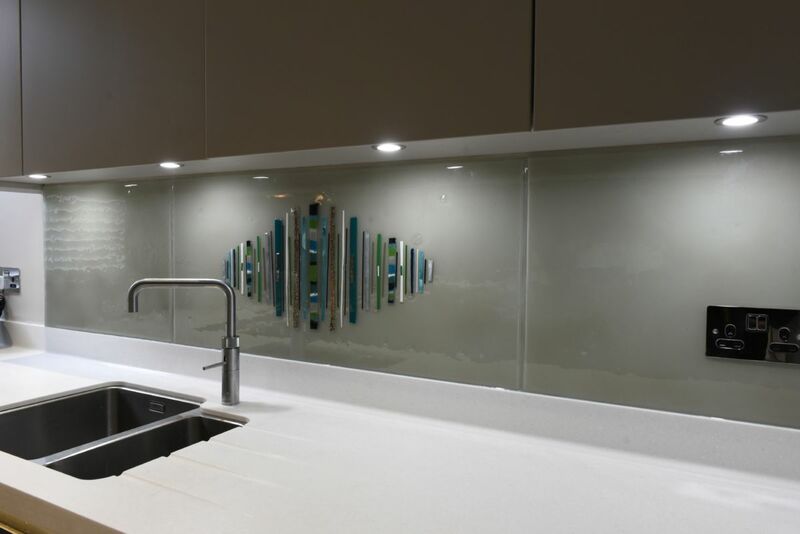 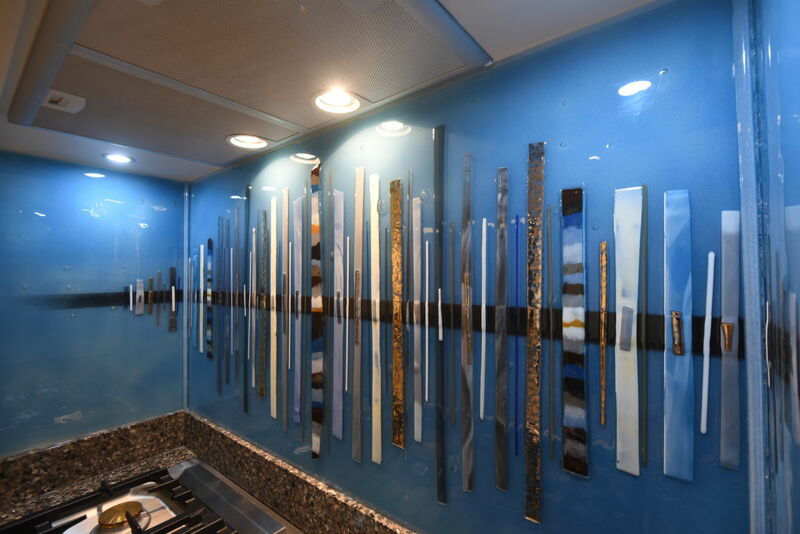 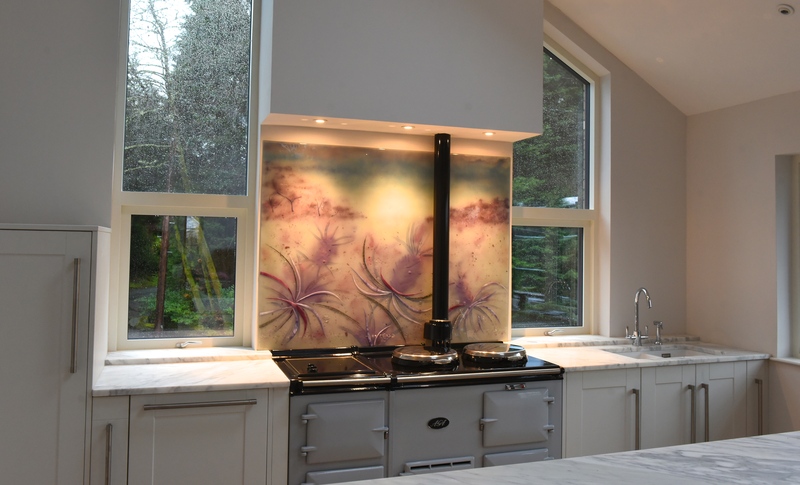 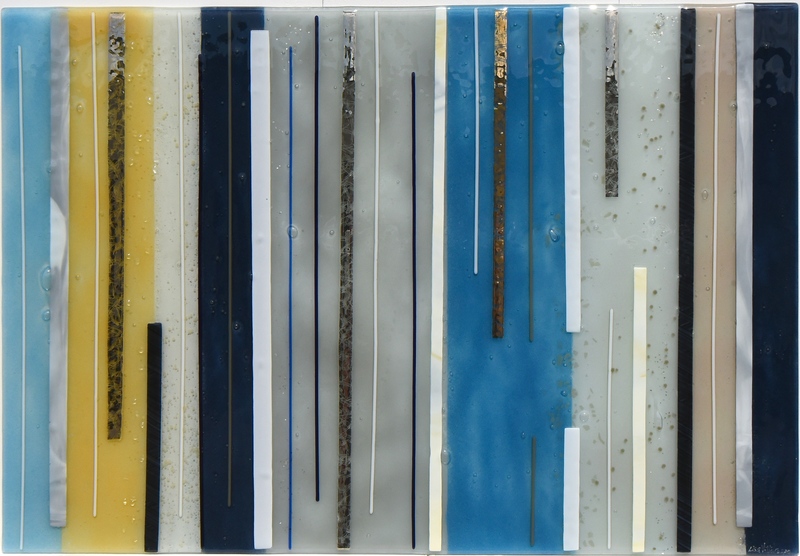 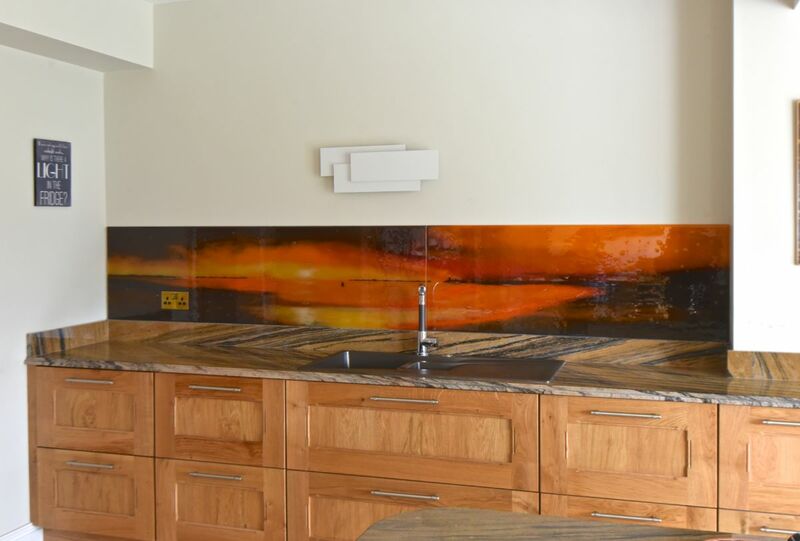 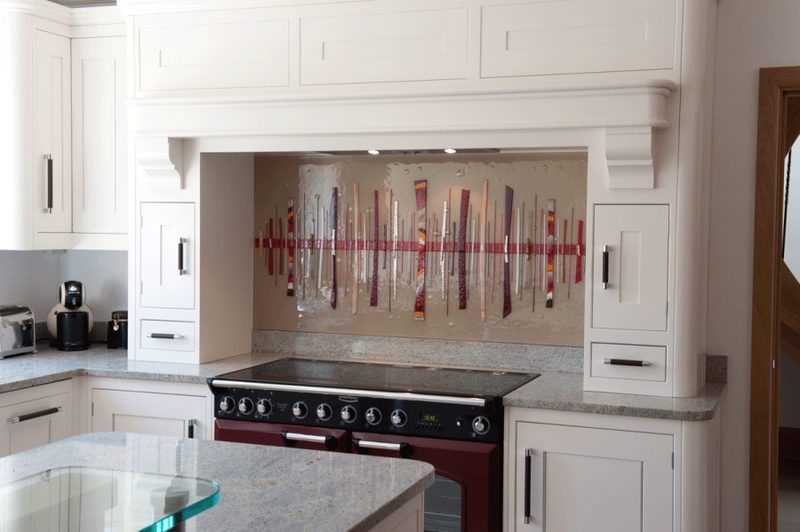 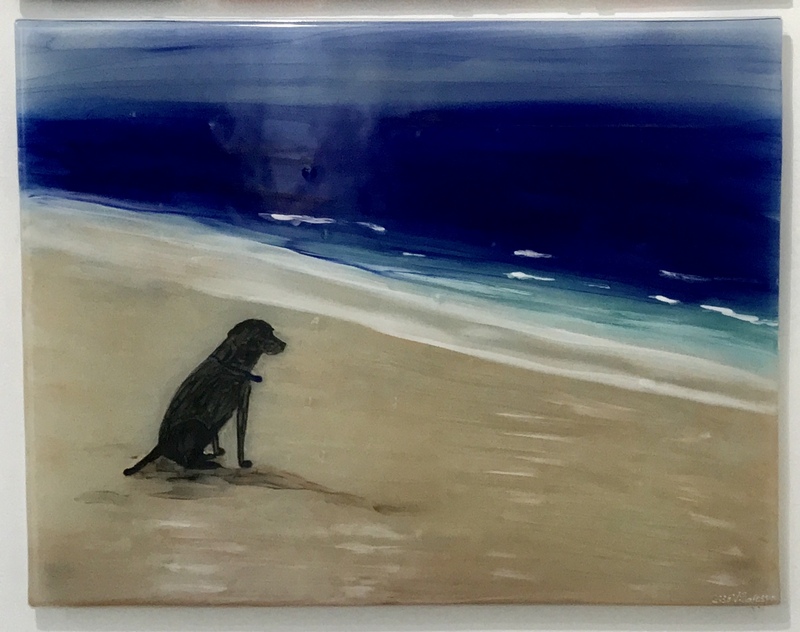 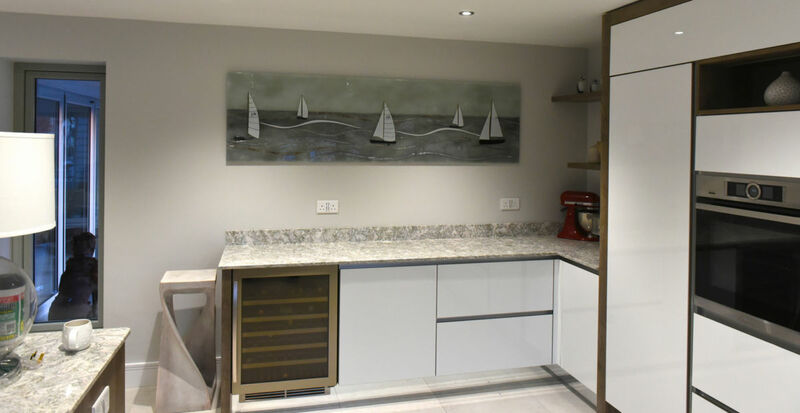 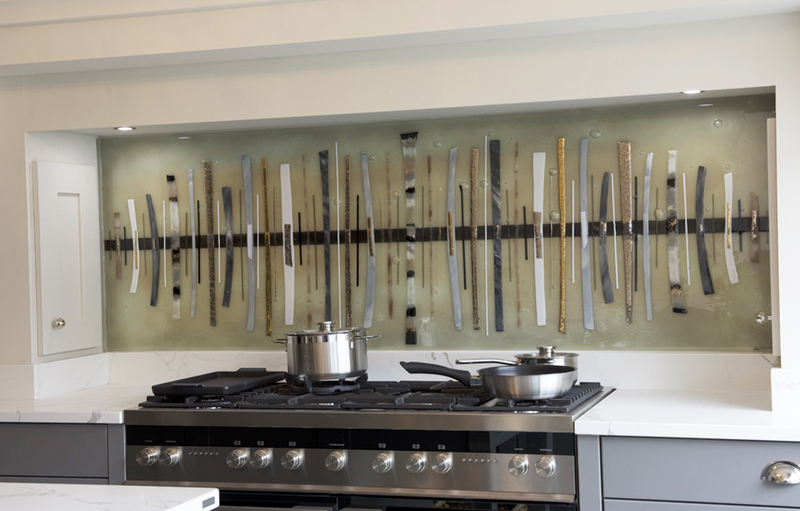 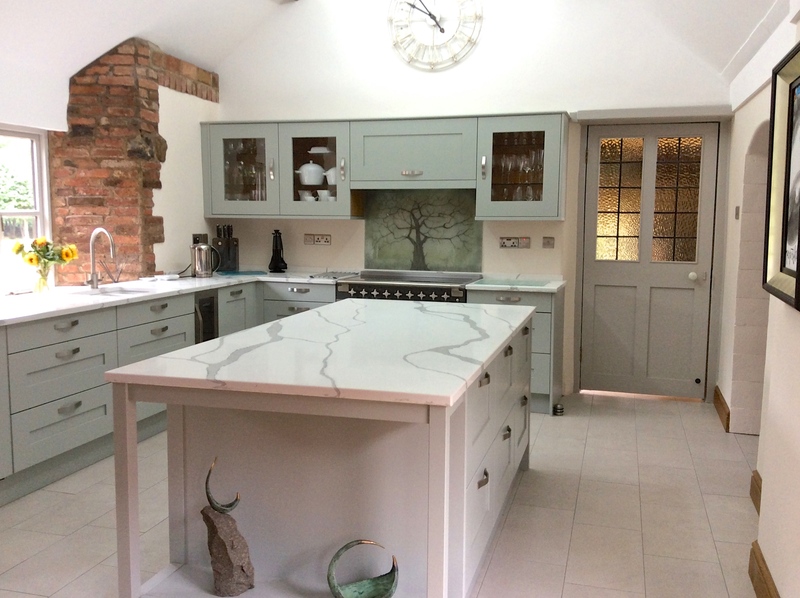 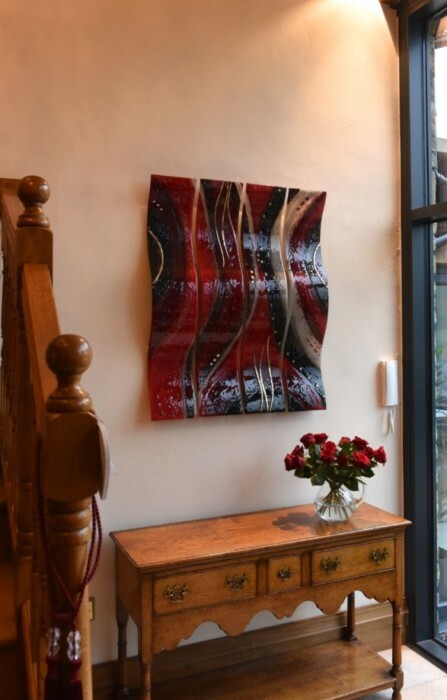 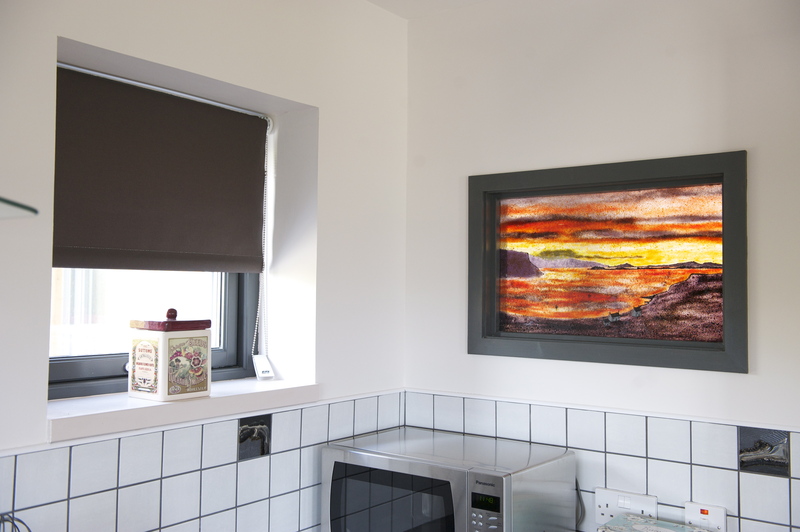 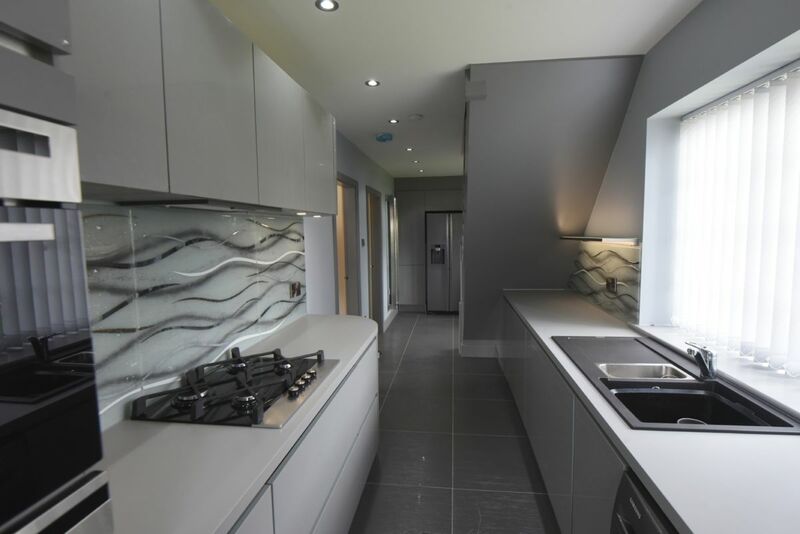 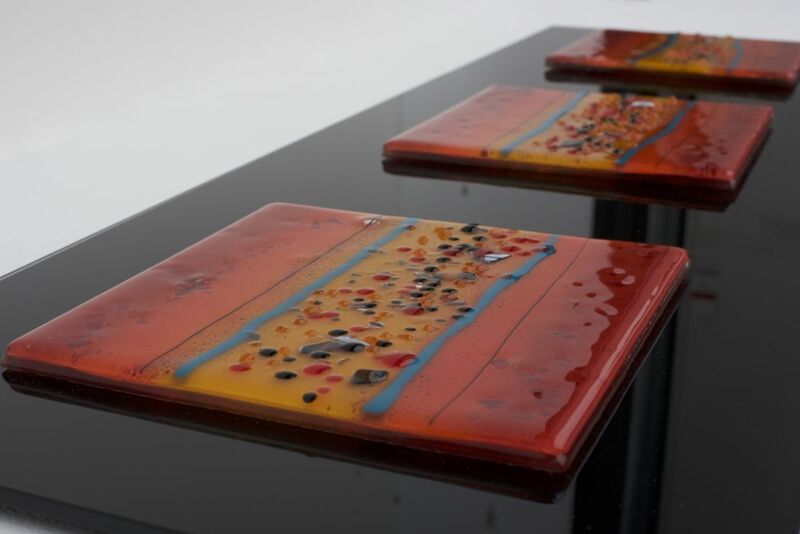 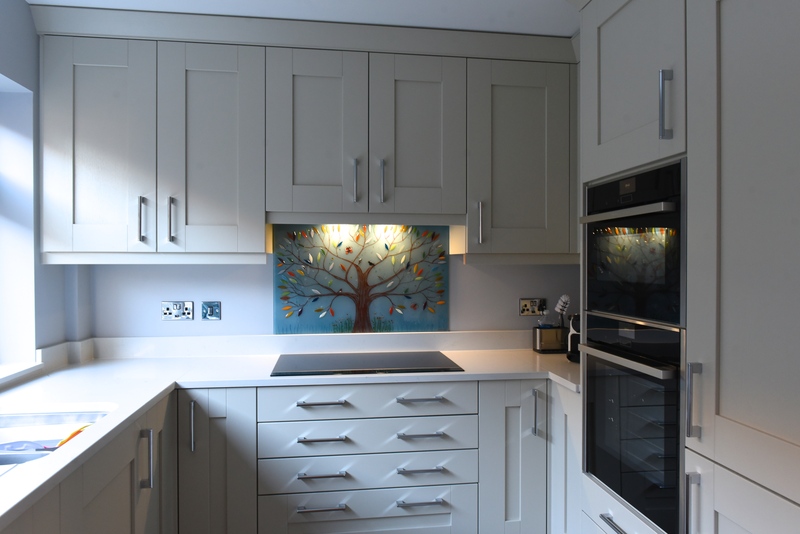 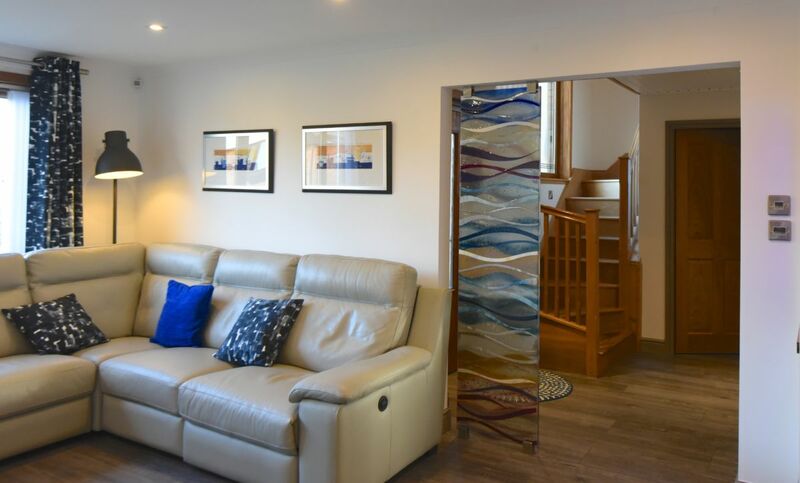 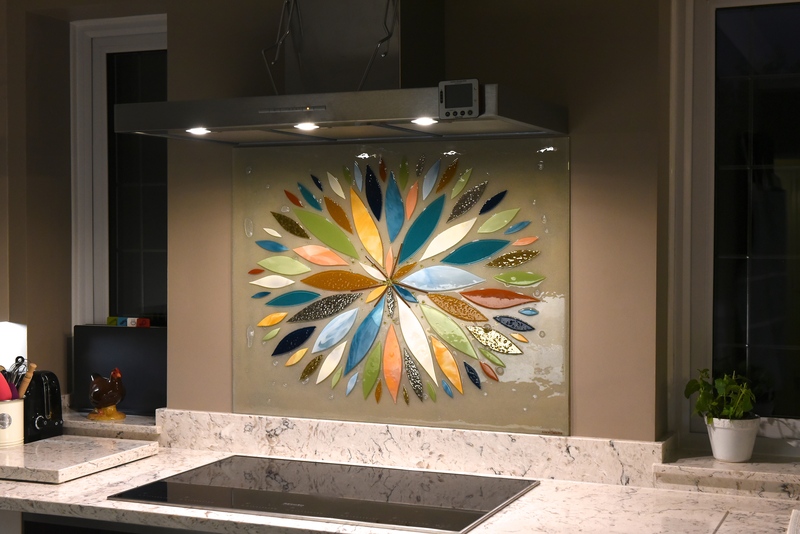 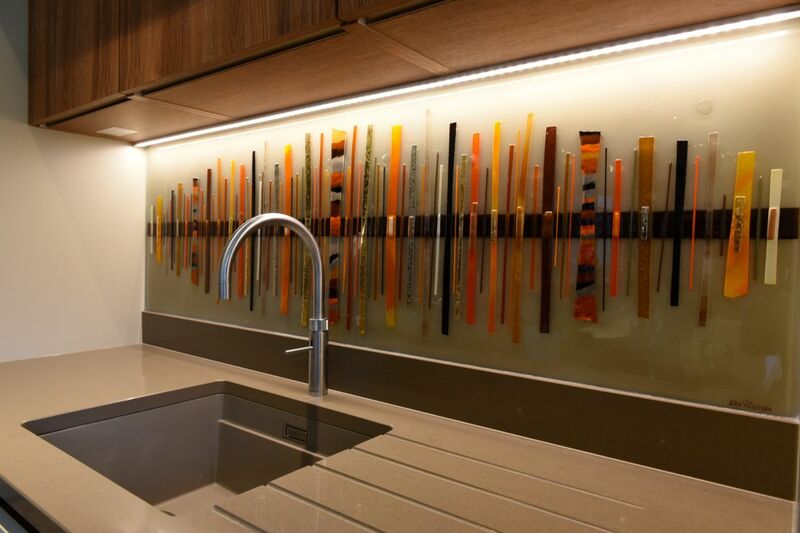 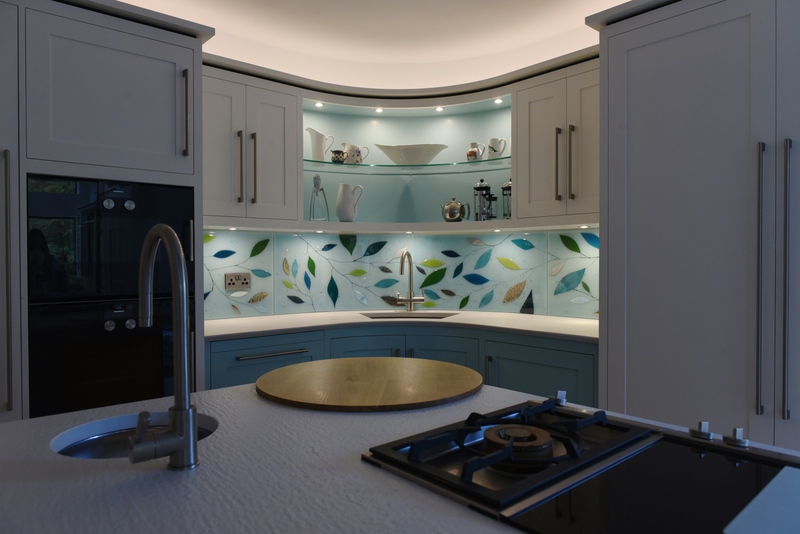 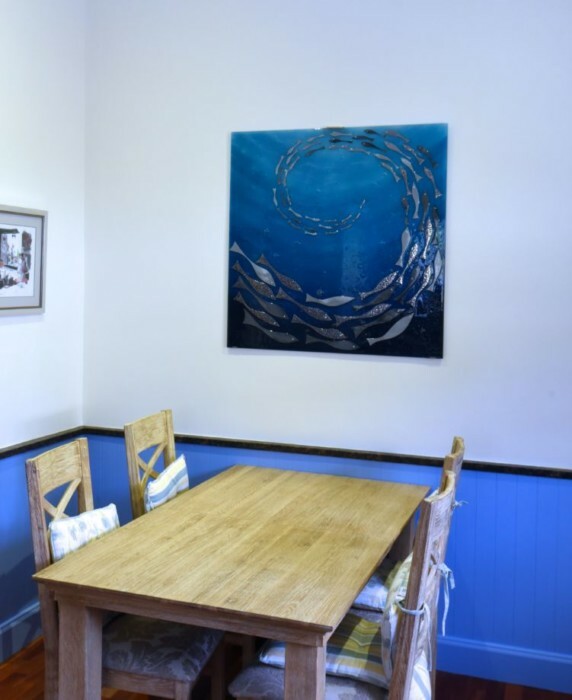 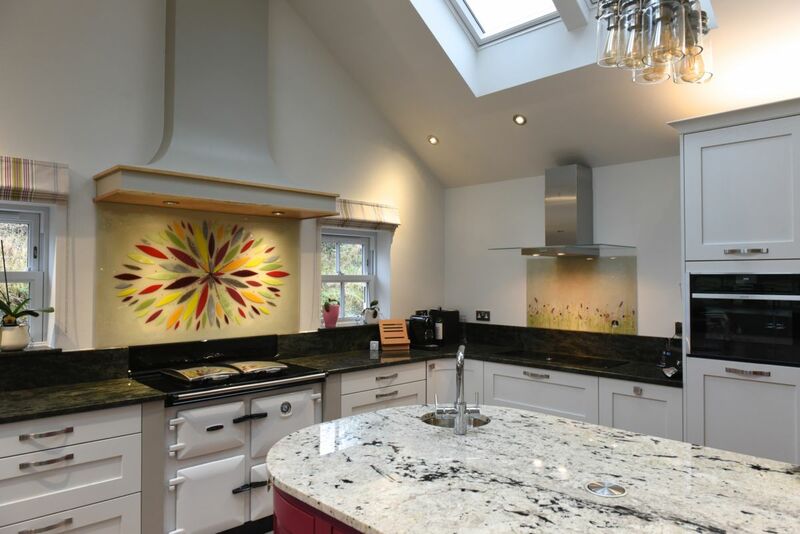 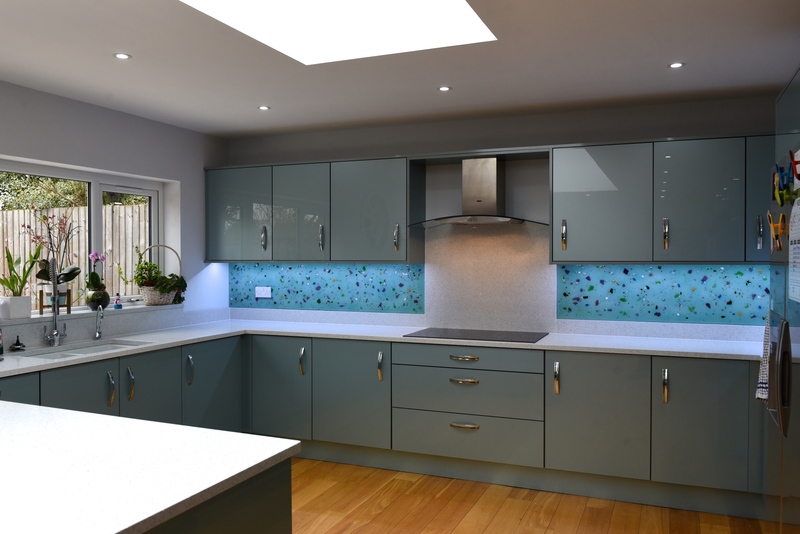 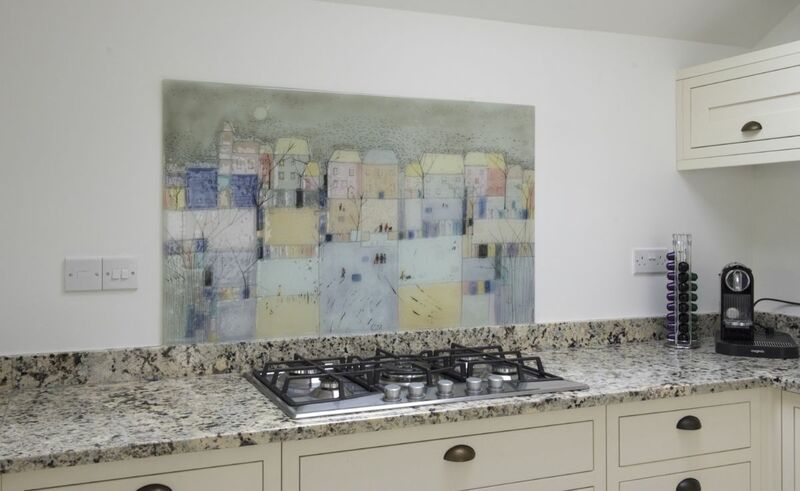 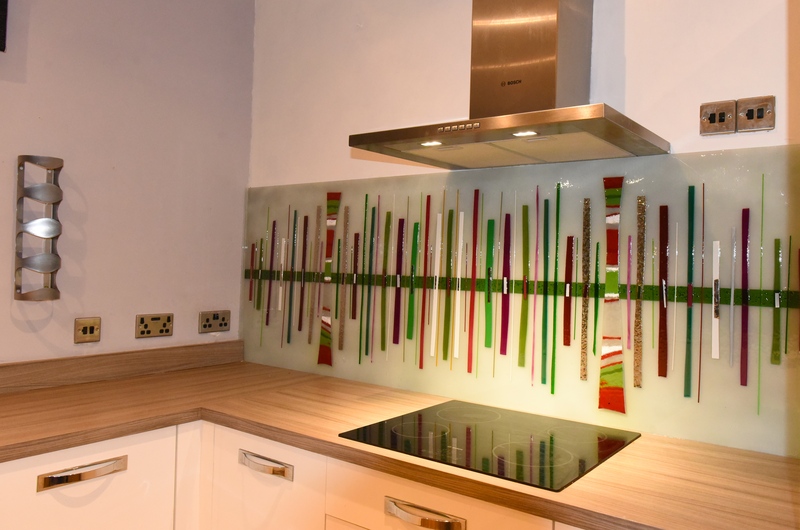 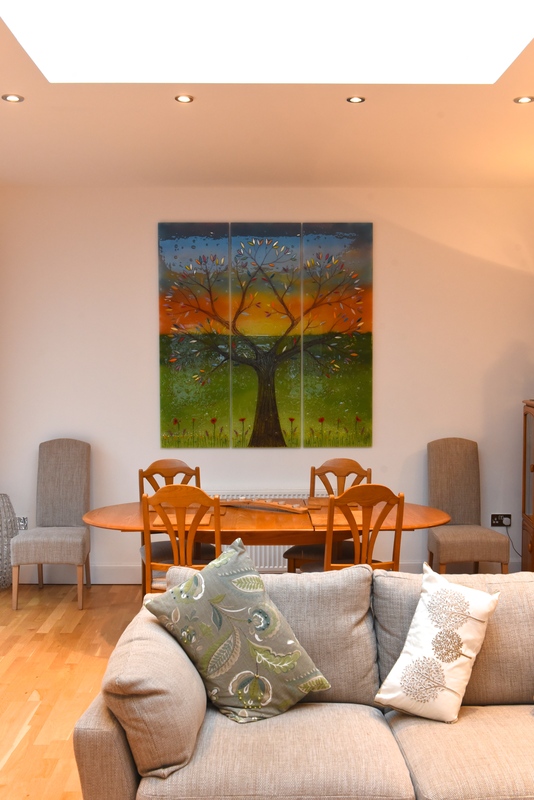 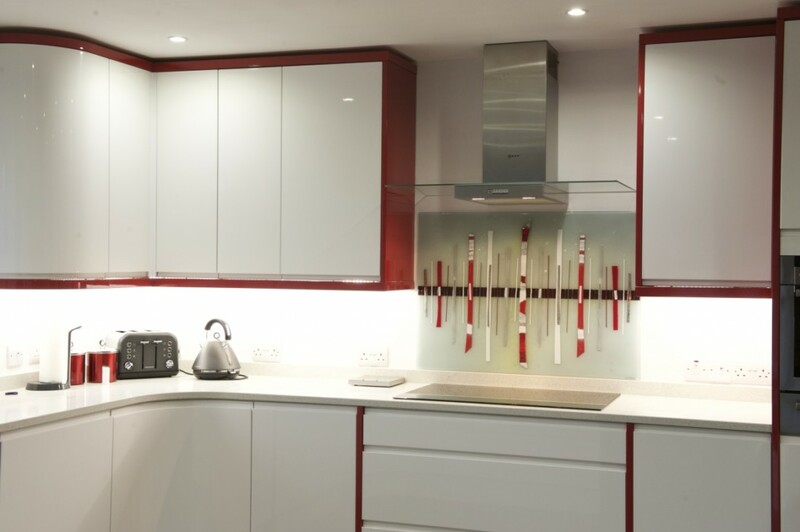 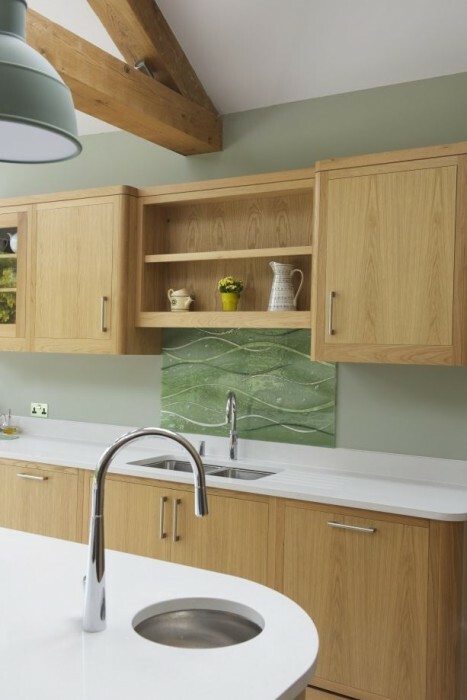 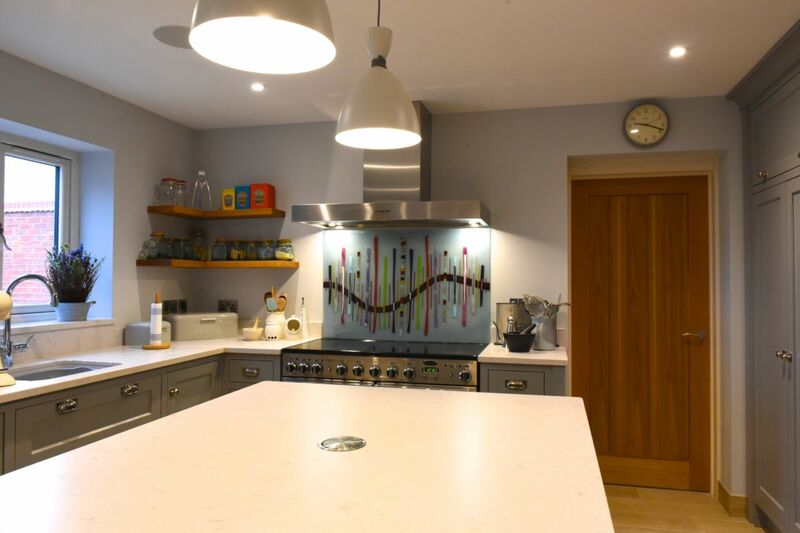 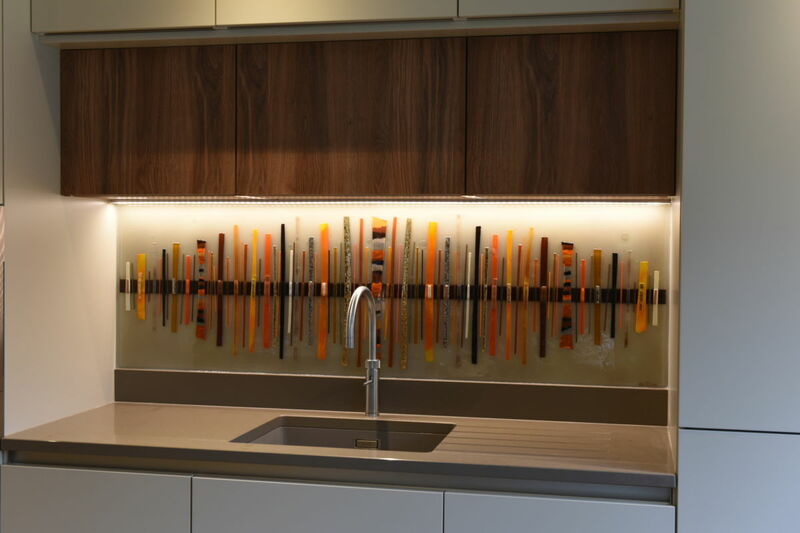 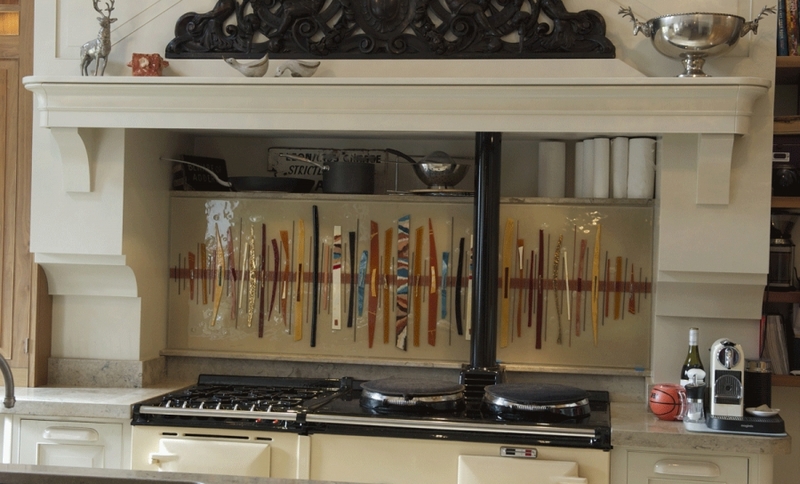 We love the sharp, polished look of the kitchen, but we have to say we like it more with an injection of excitement courtesy of fused glass art. 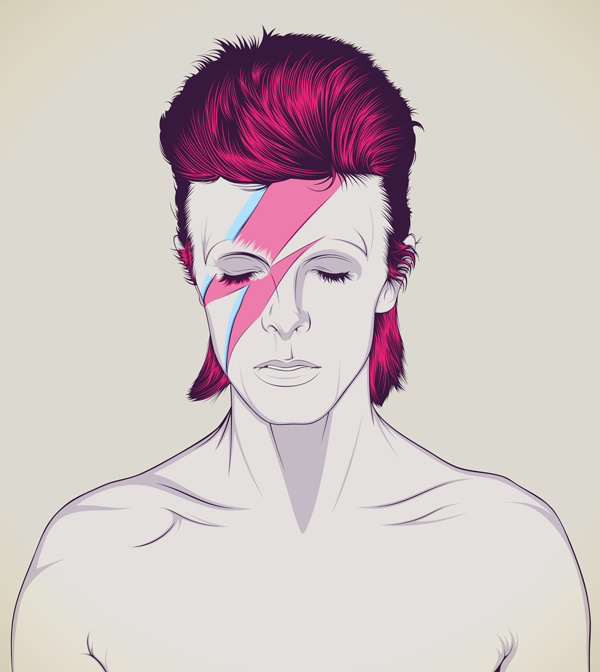 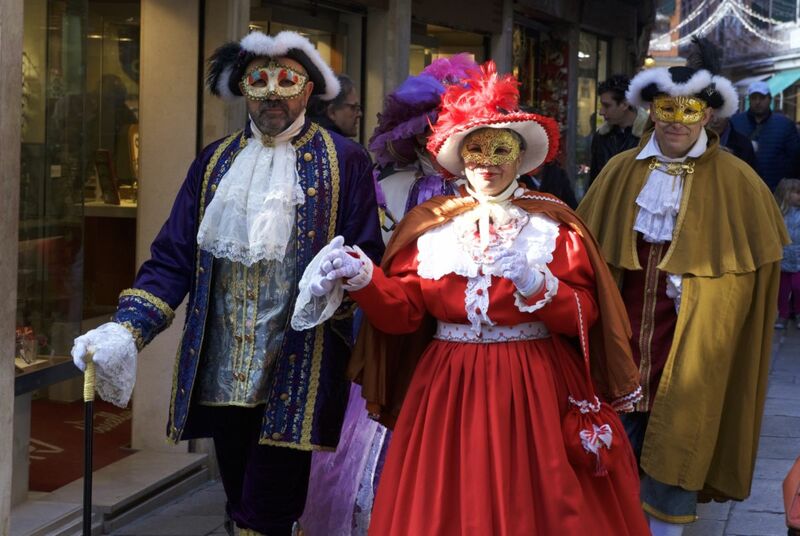 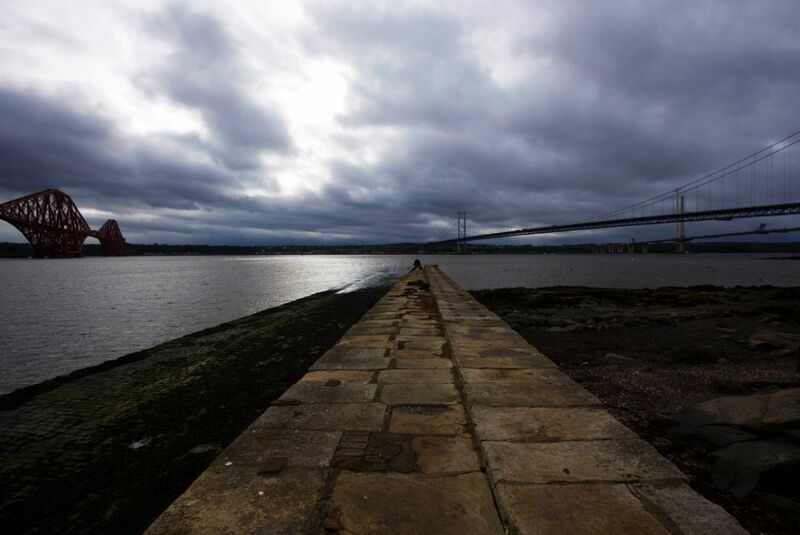 You may have spotted the accompanying piece sitting off just to the side. 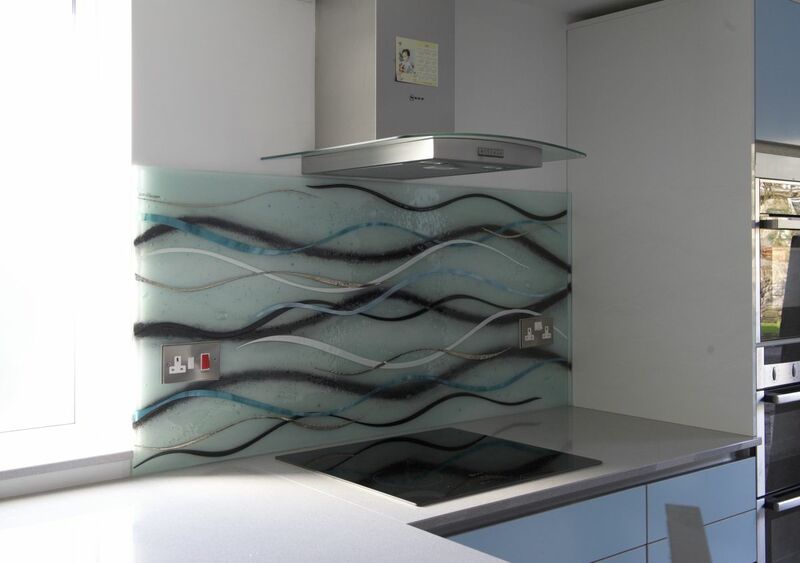 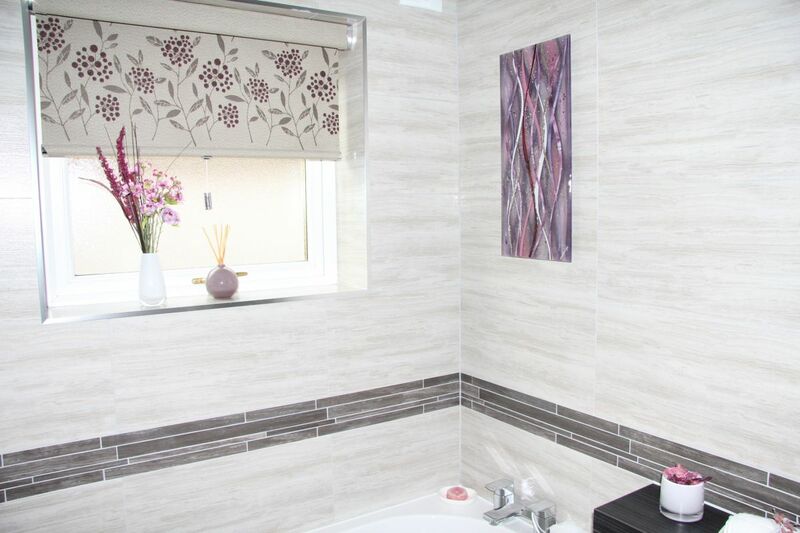 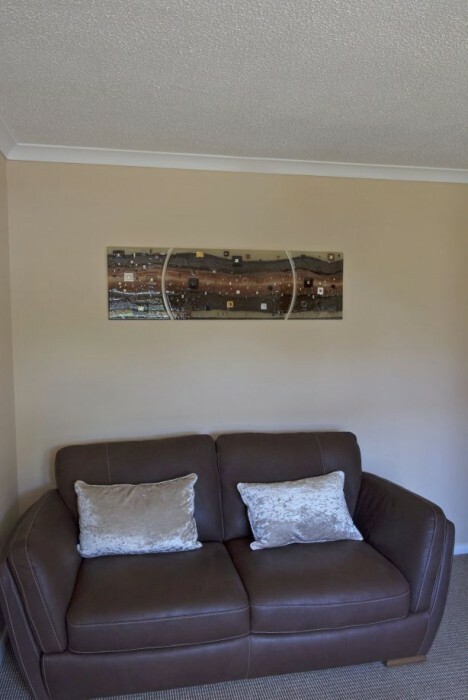 This matches the main splashback perfectly, and really helps to tie the room together. 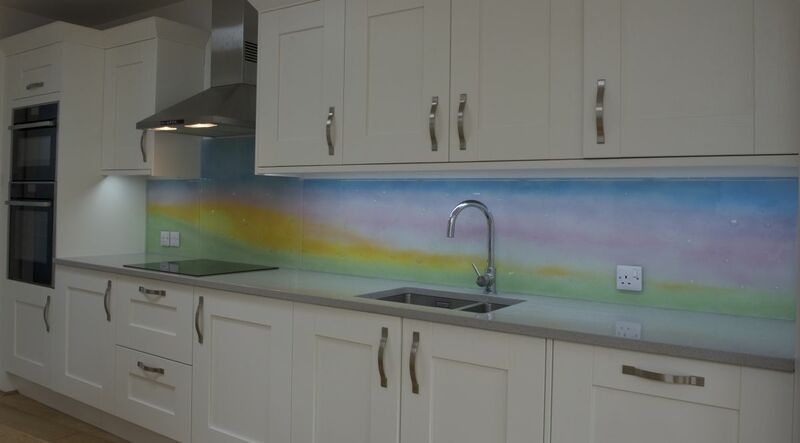 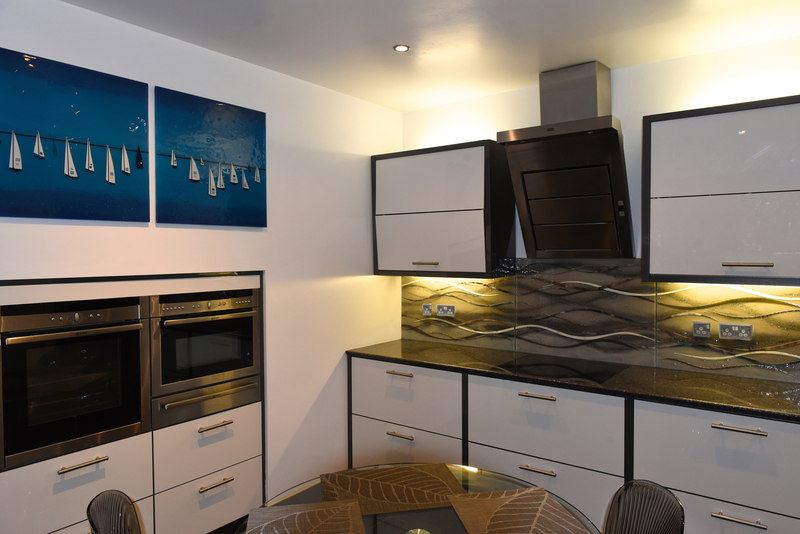 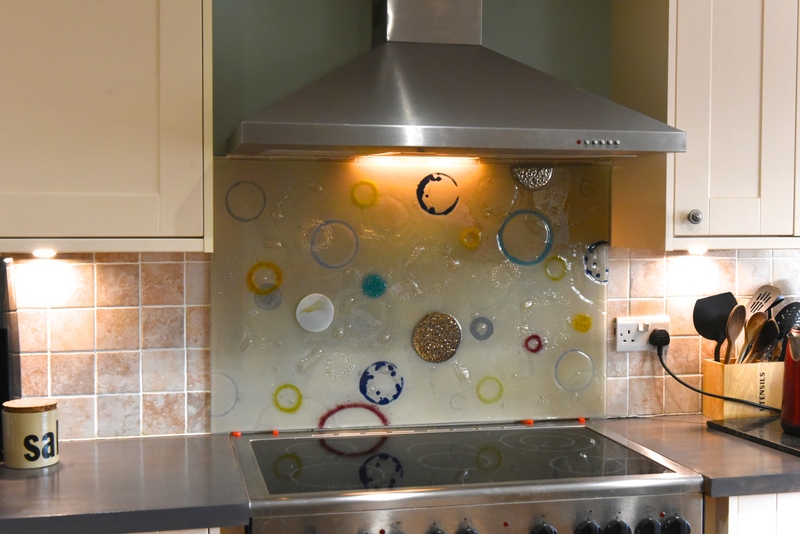 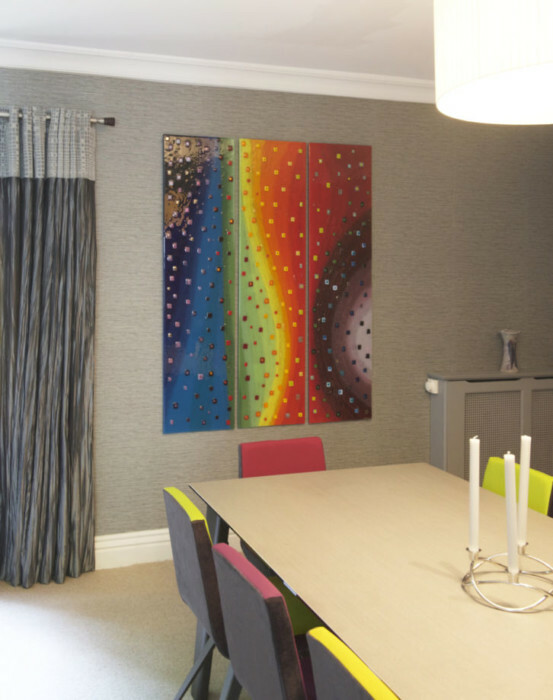 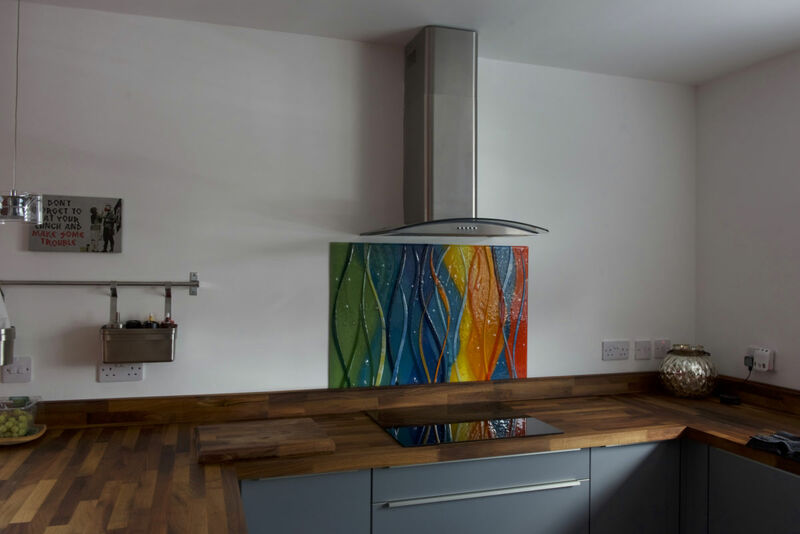 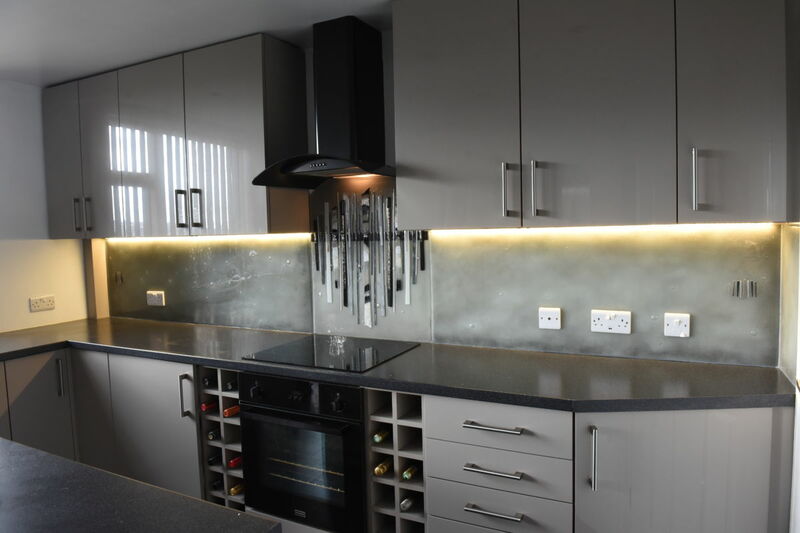 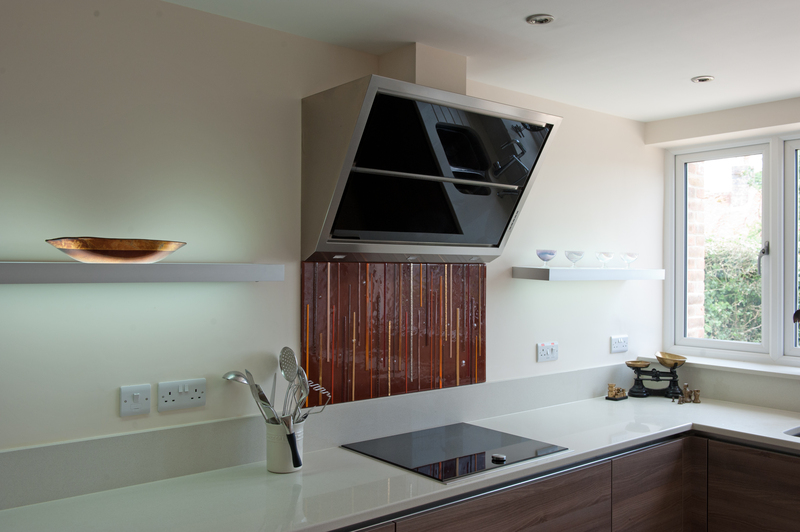 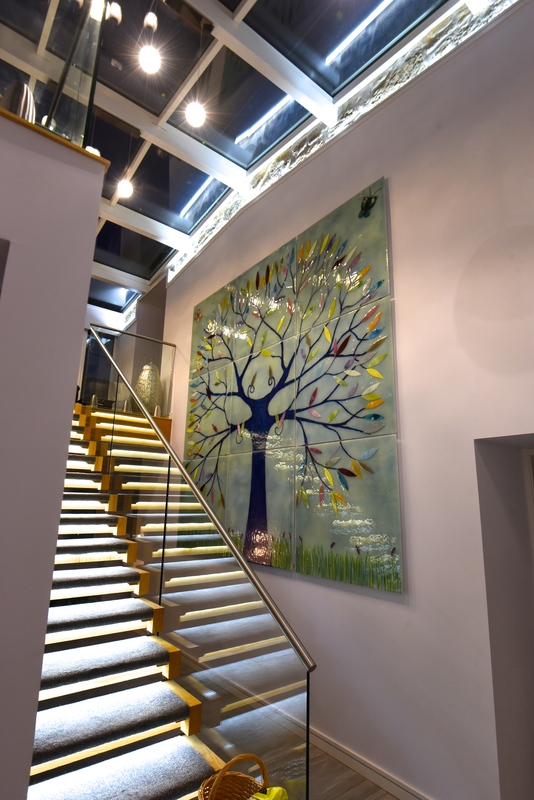 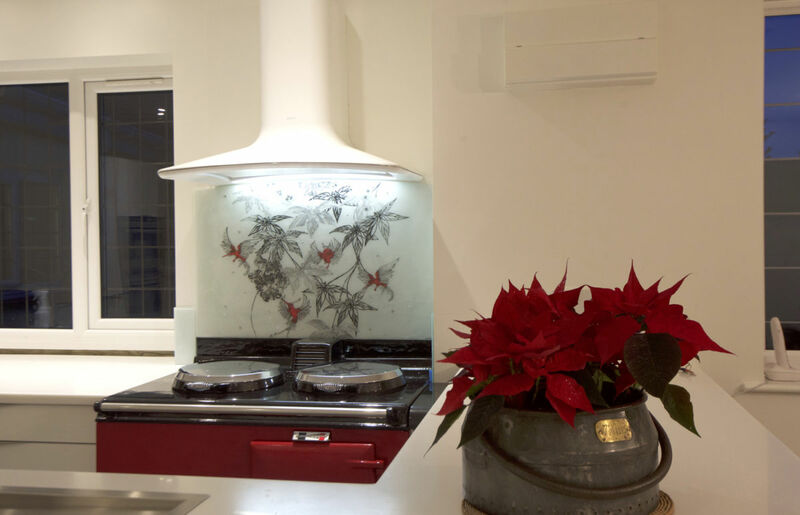 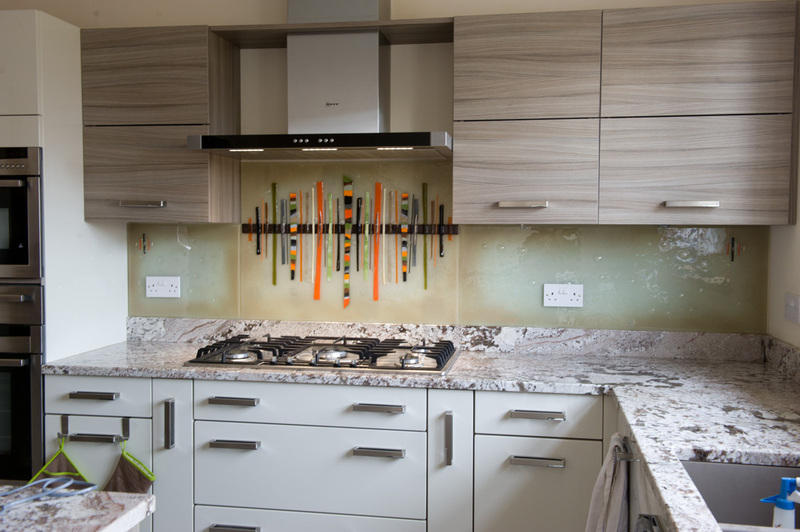 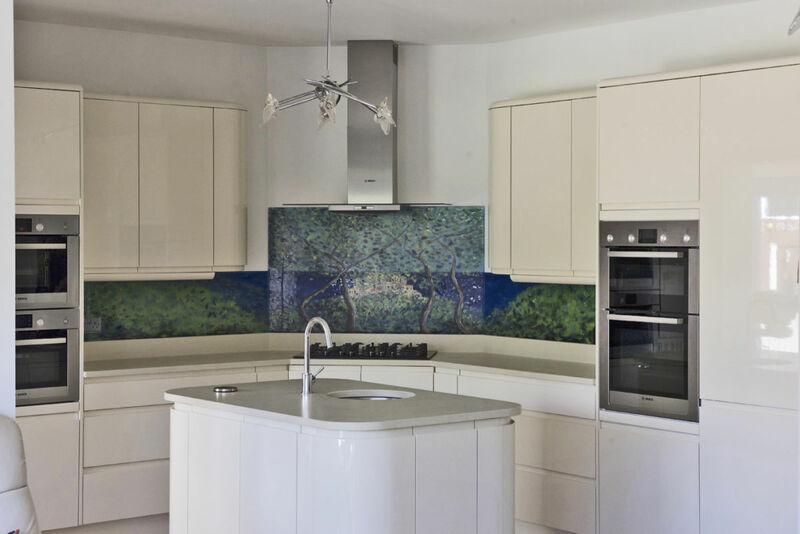 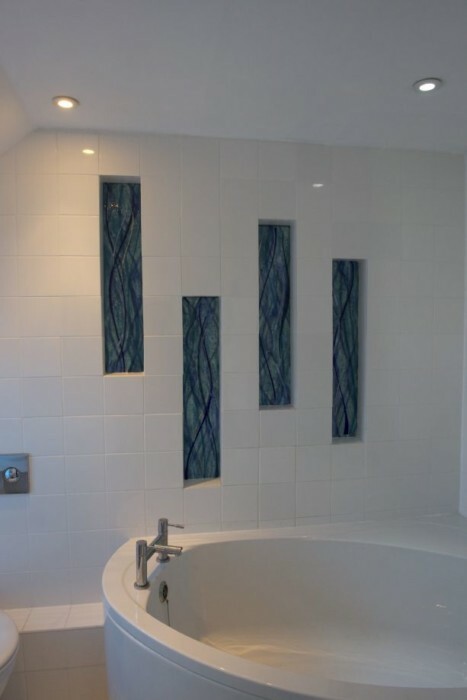 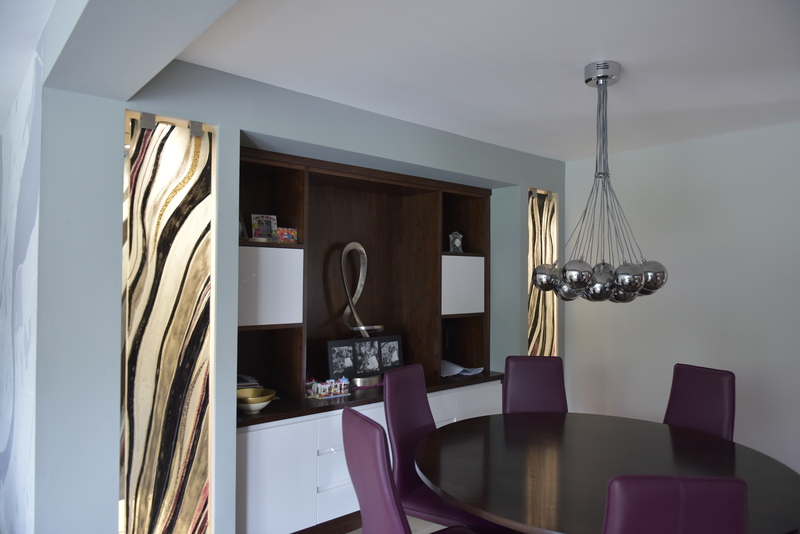 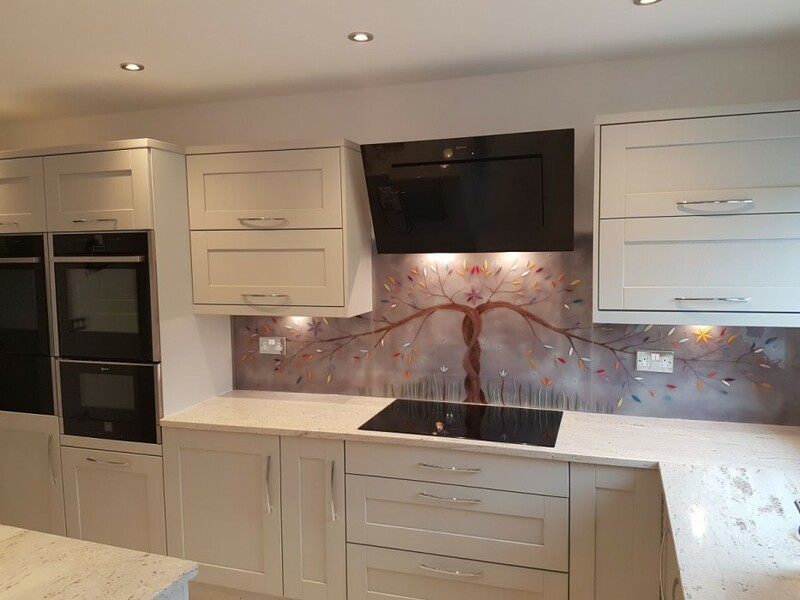 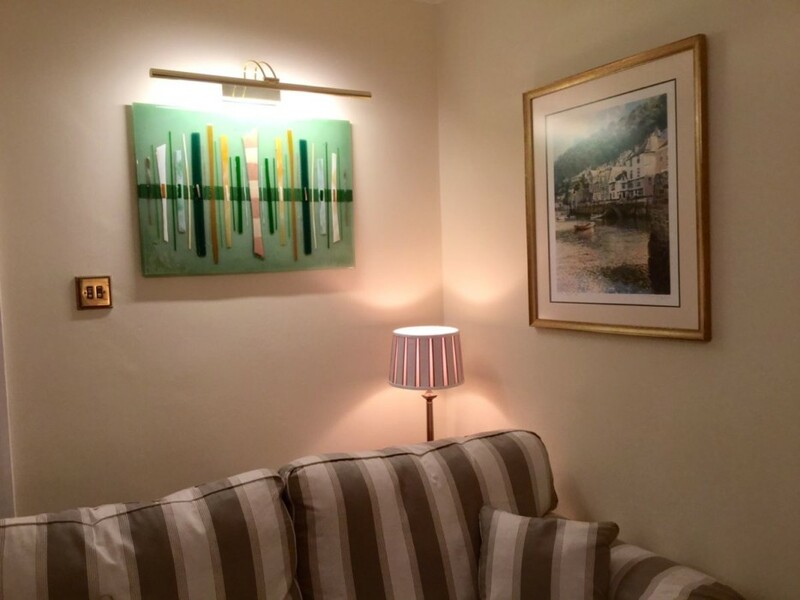 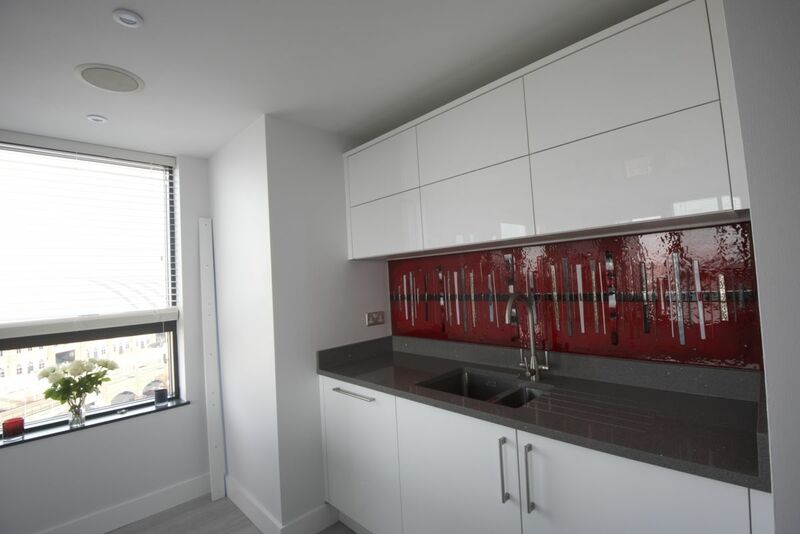 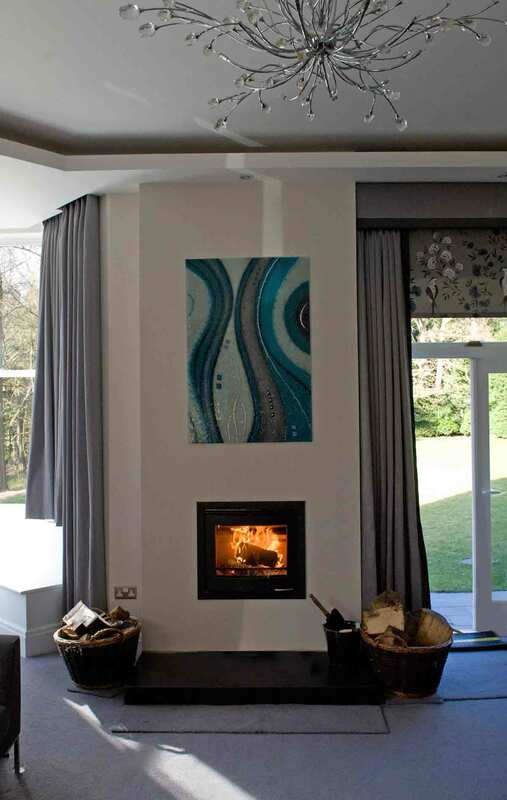 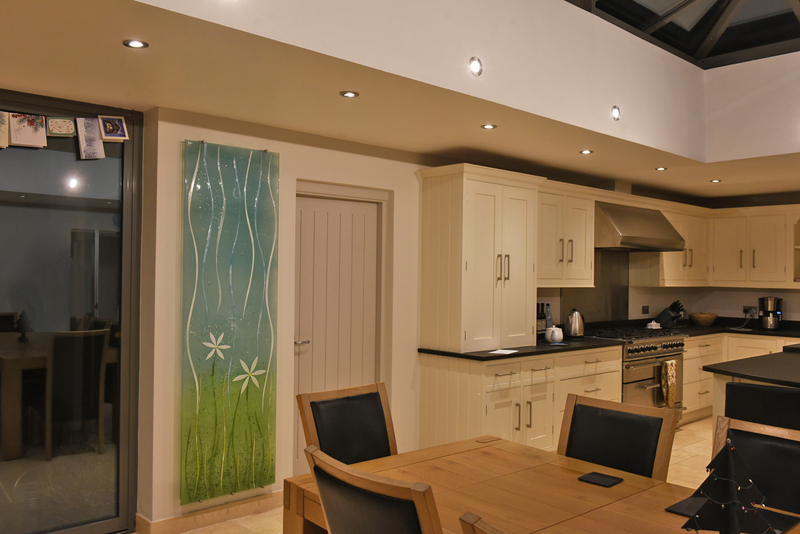 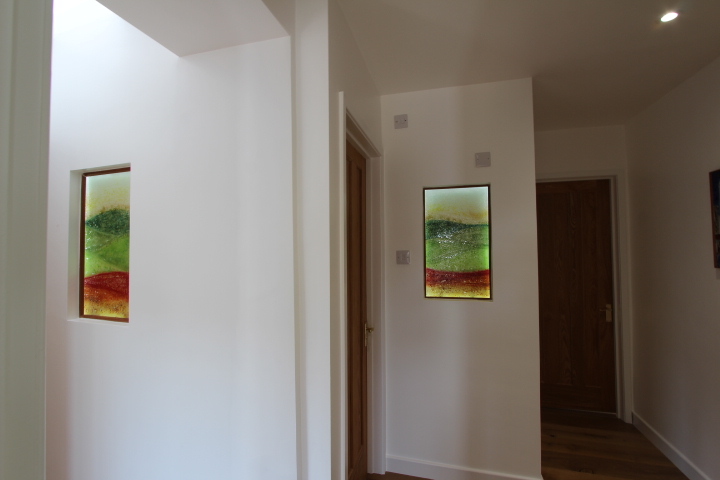 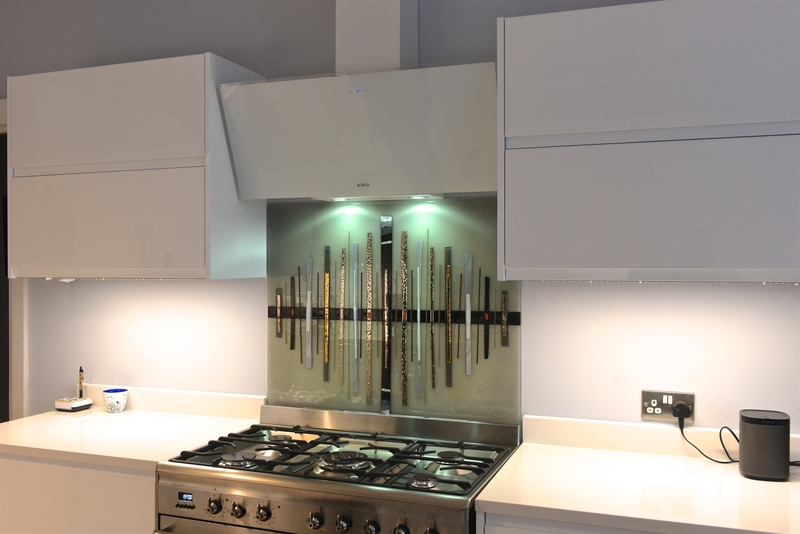 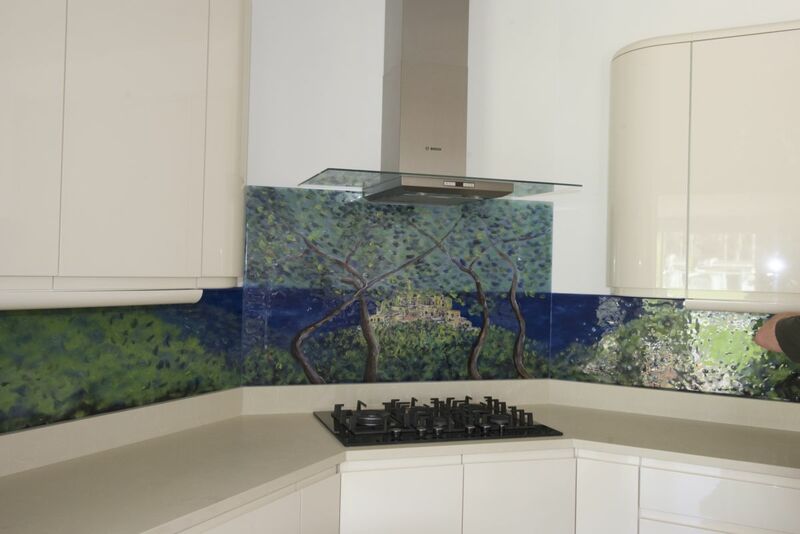 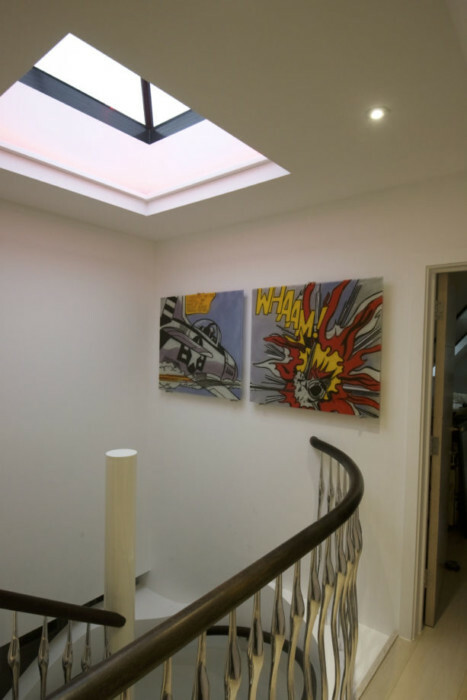 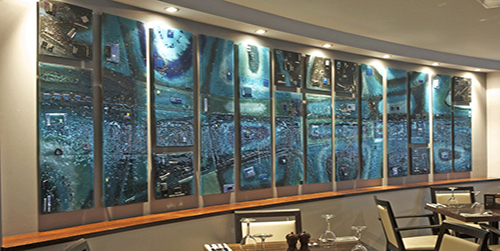 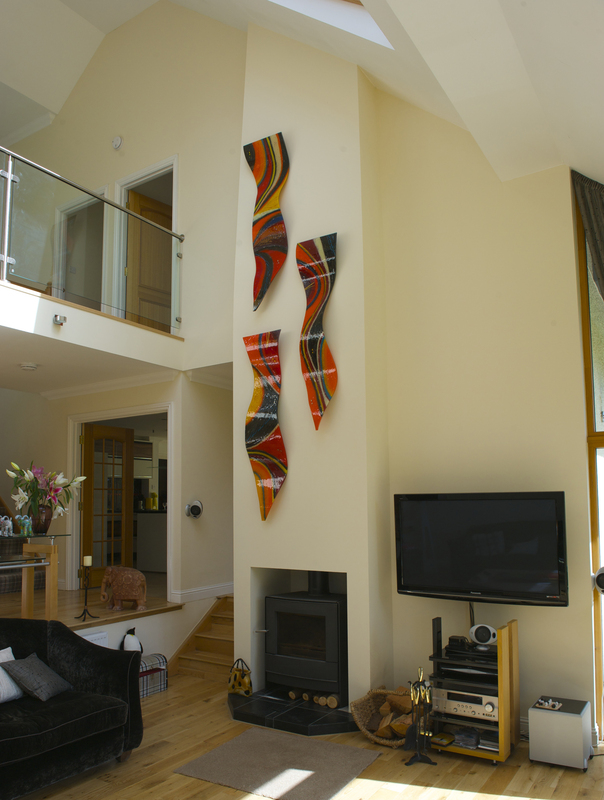 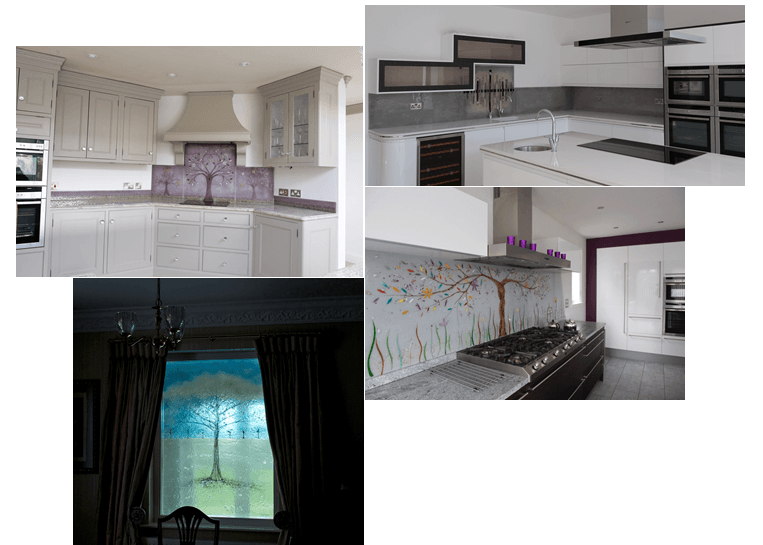 It also highlights one of the best strengths of our bespoke fused glass splashbacks, which lies in creating a theme in just about any room. 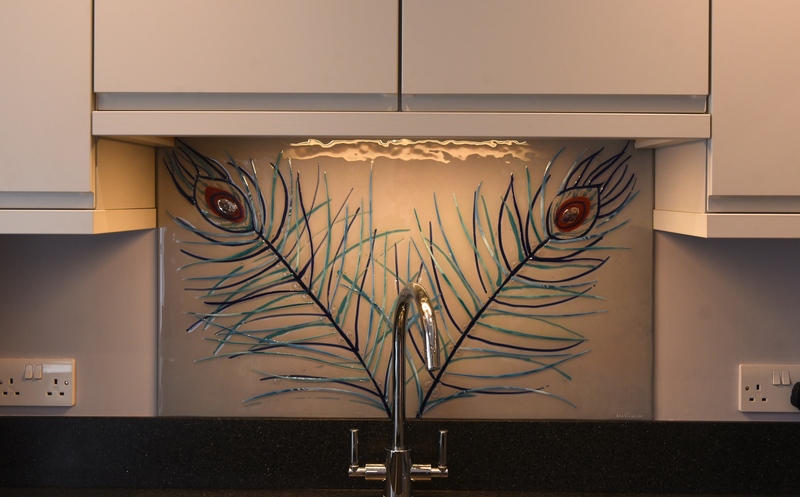 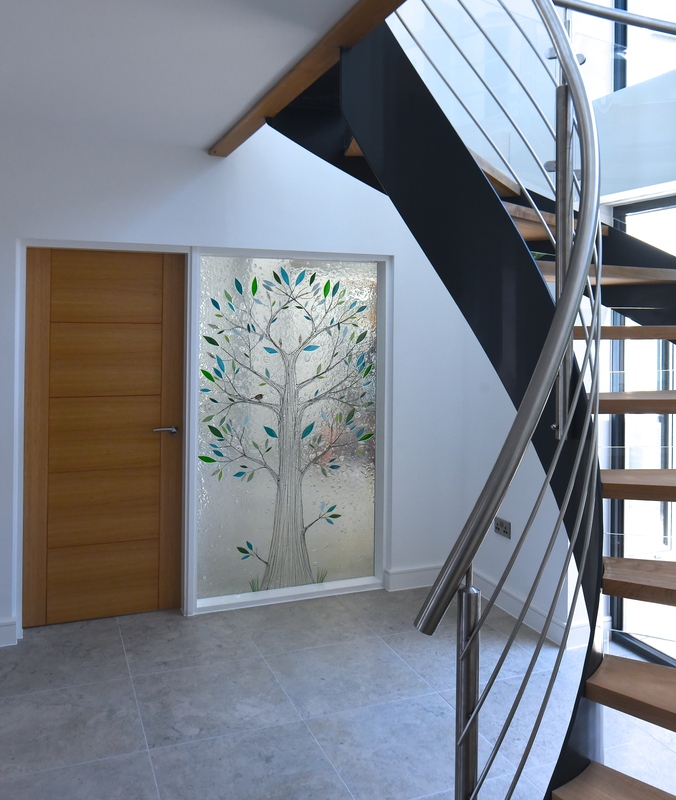 No matter what the style of decoration you’re aiming for might be, we’re sure to have glass that’ll complement your vision perfectly. 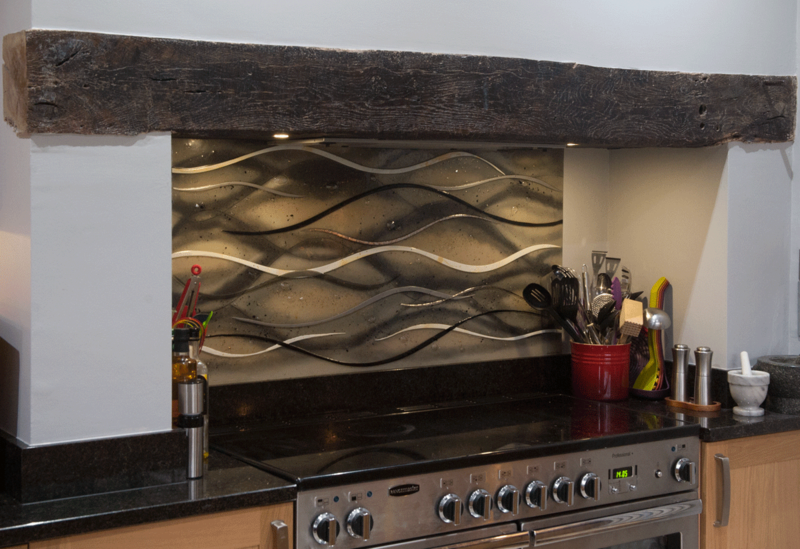 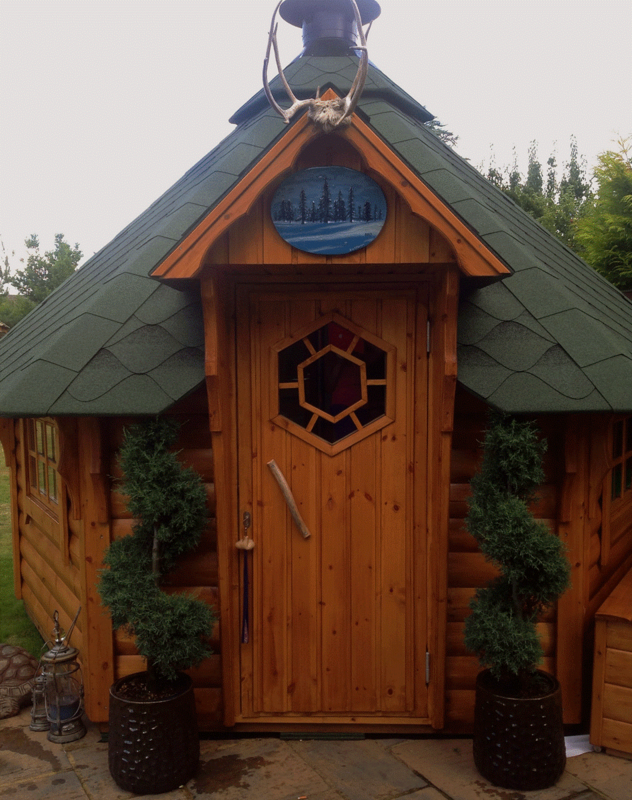 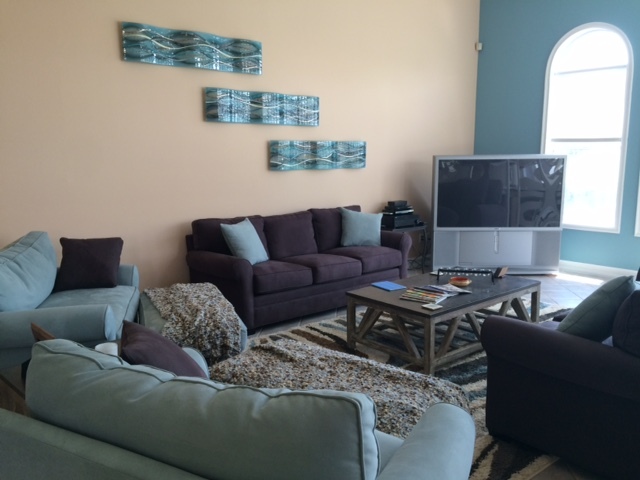 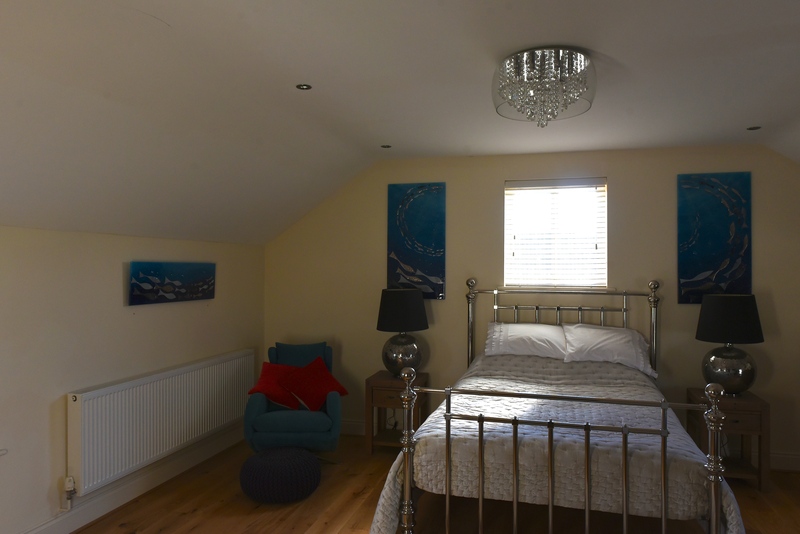 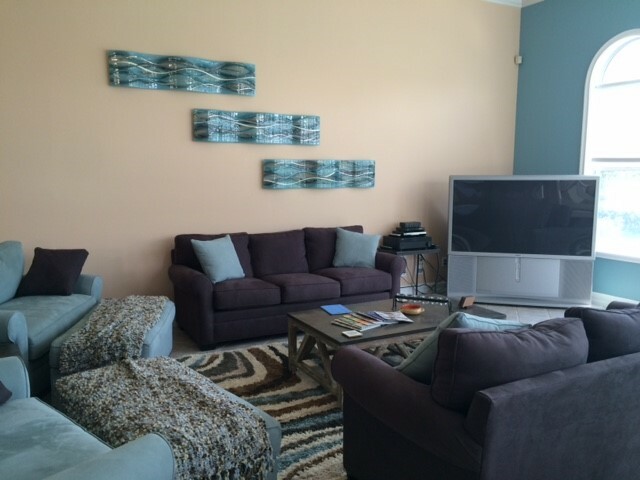 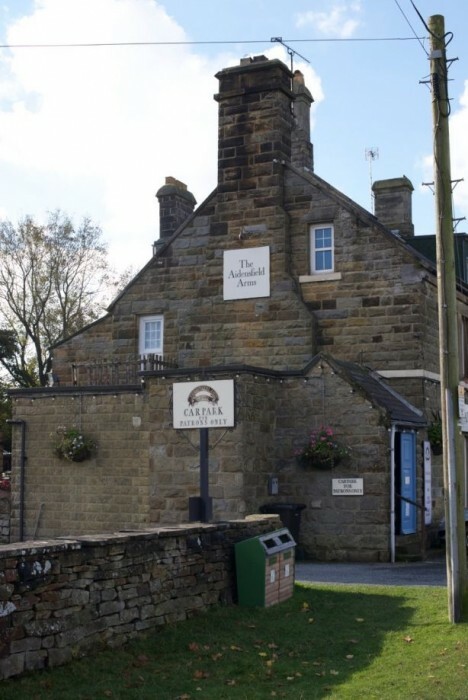 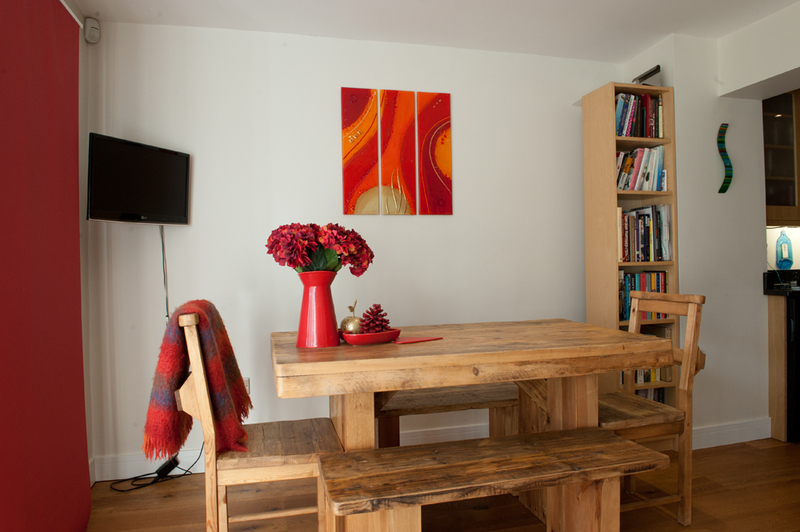 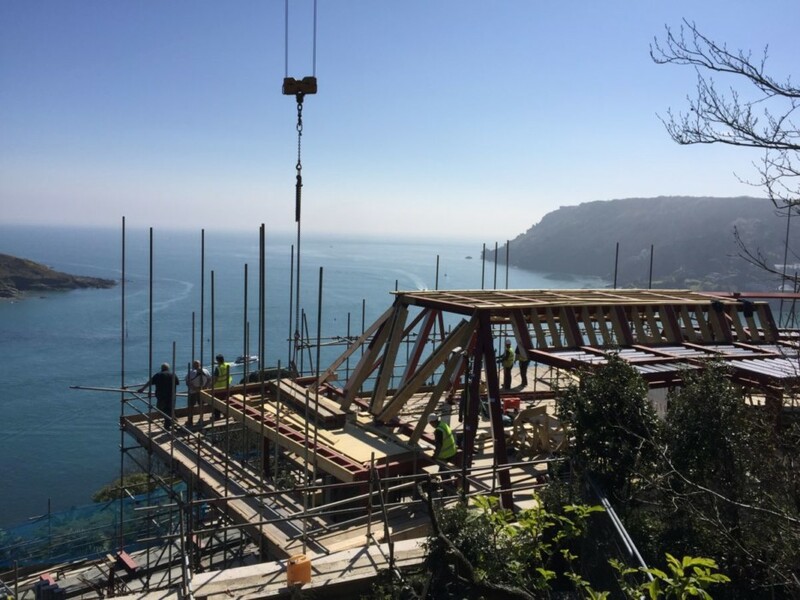 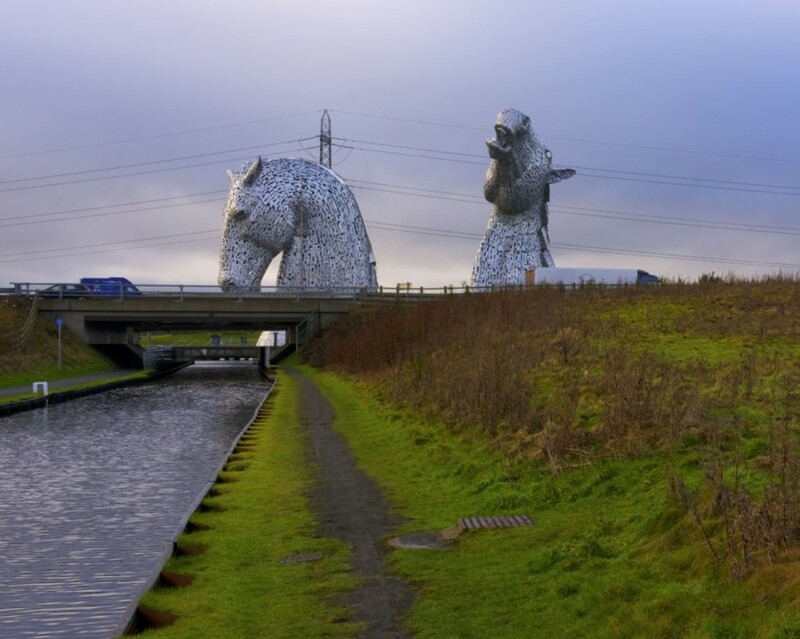 Contemporary, modern, rustic, you name it and we’ll make it! 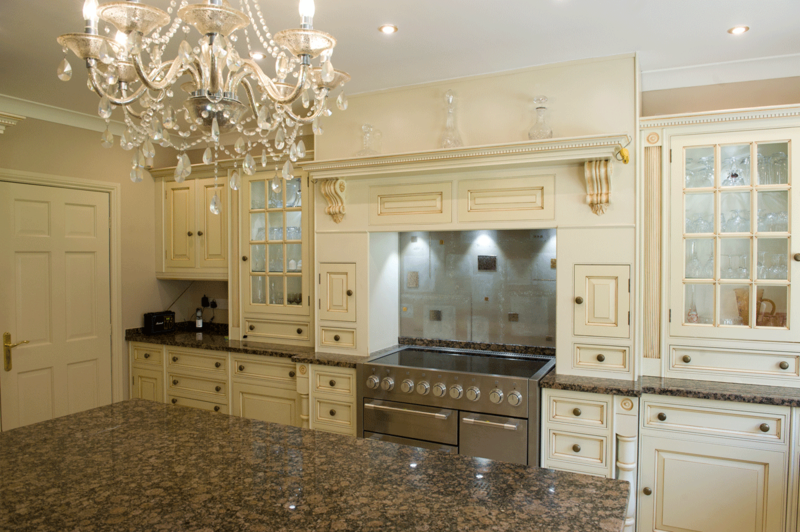 That’s what completely bespoke means, of course! 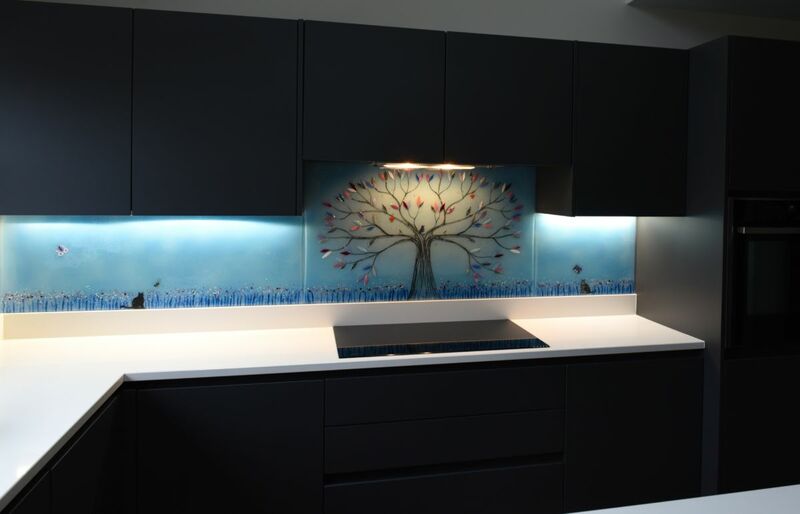 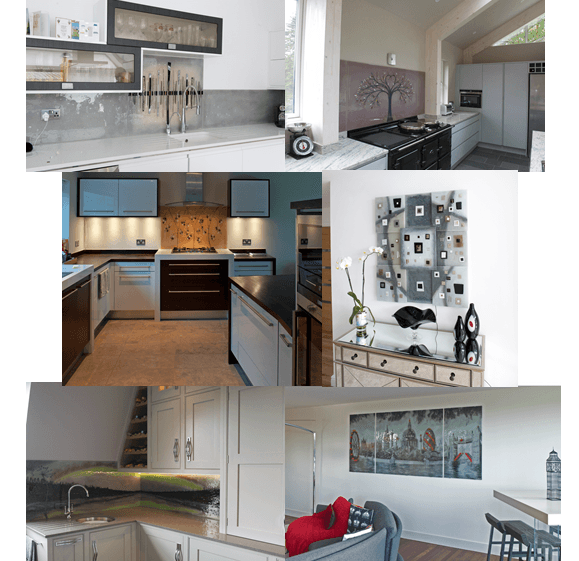 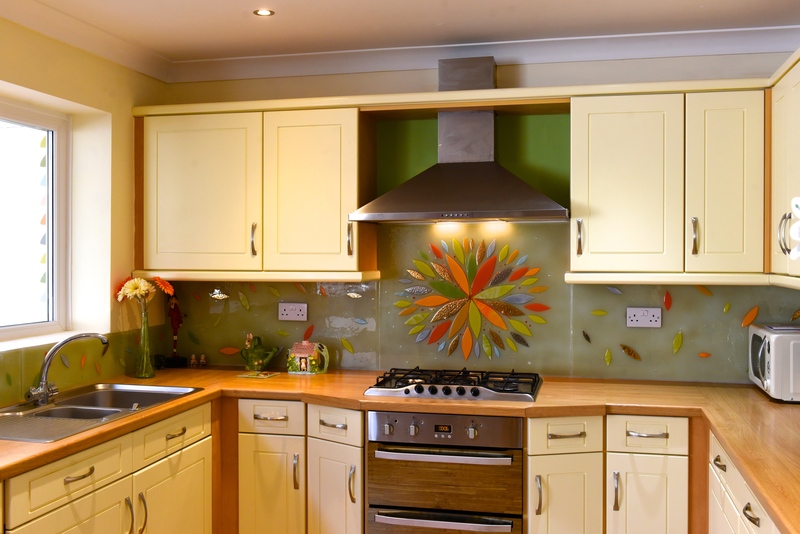 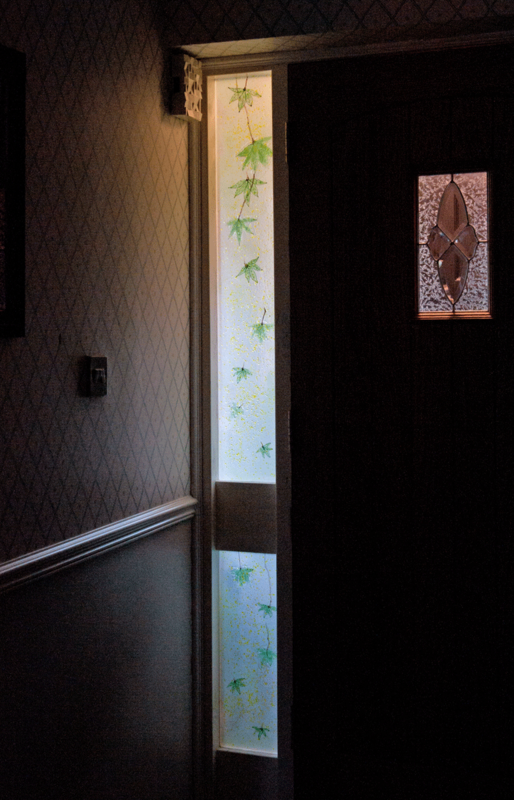 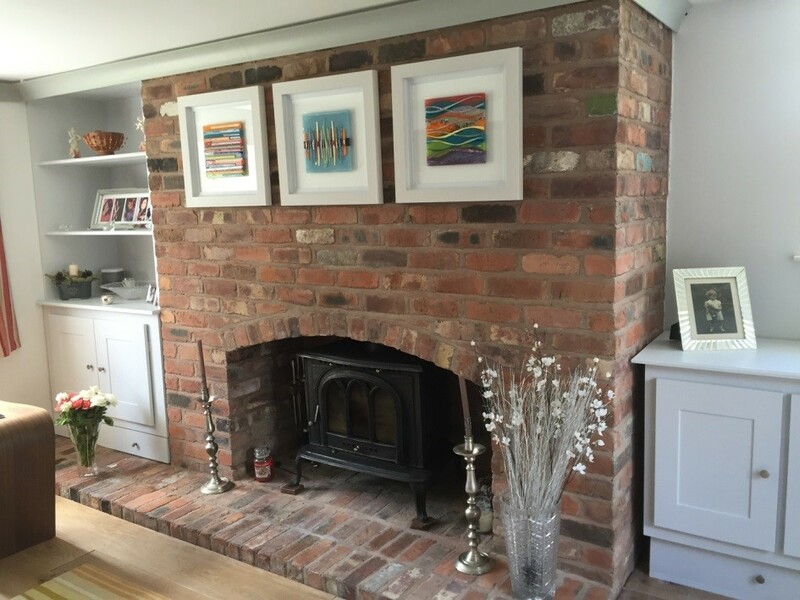 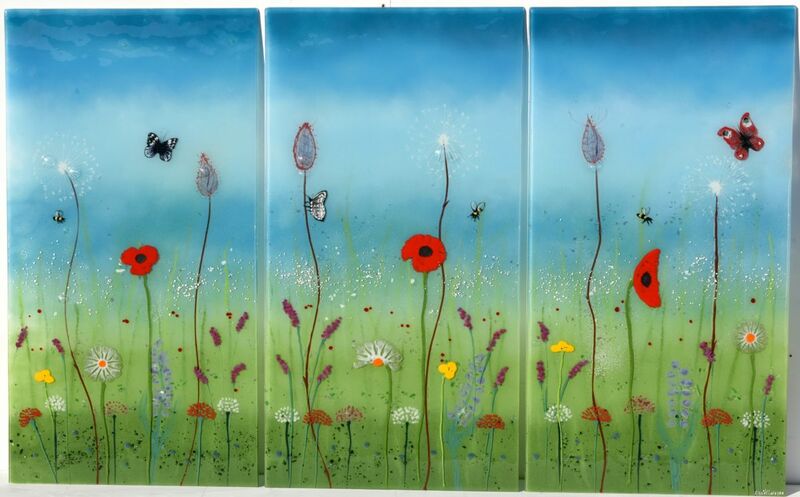 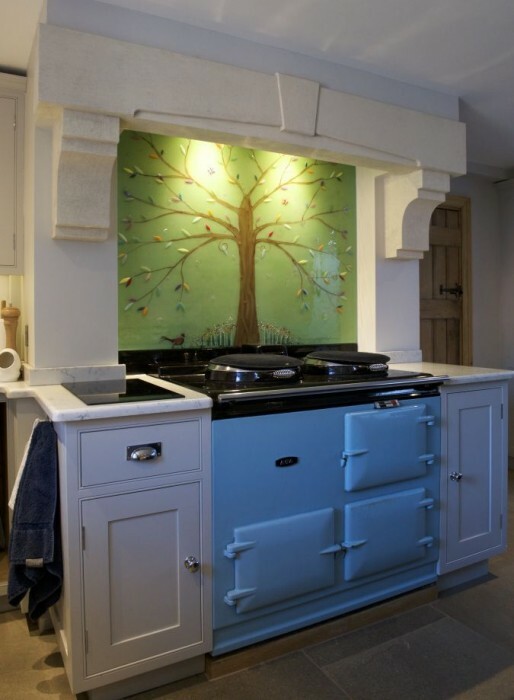 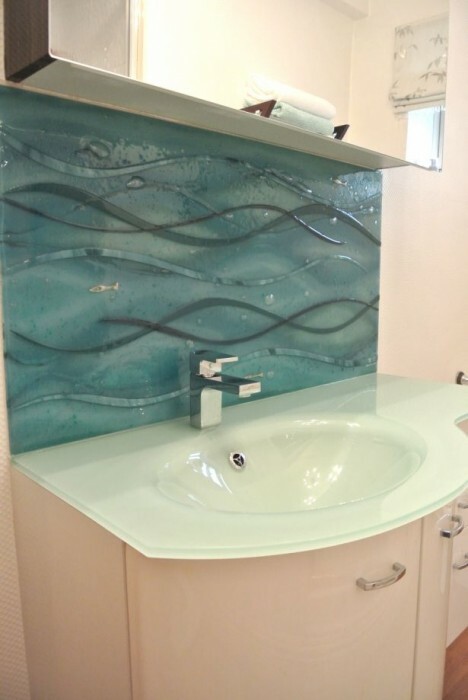 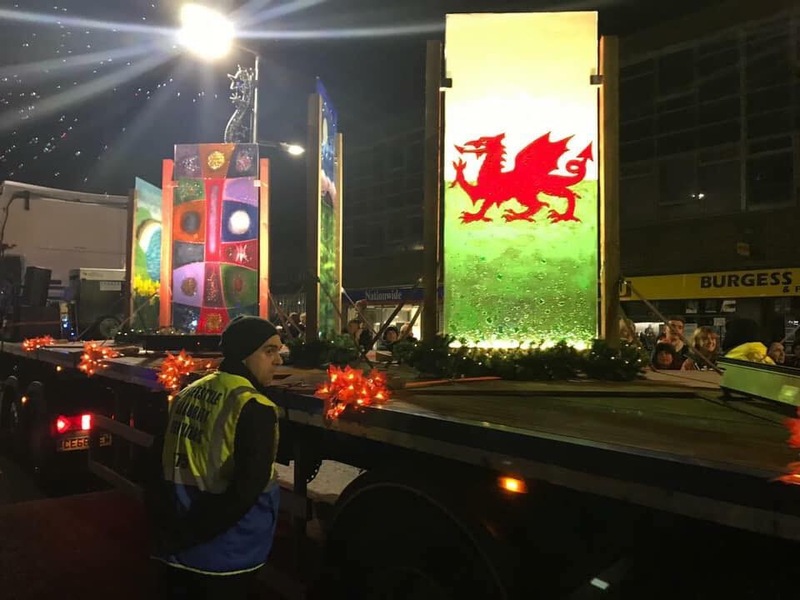 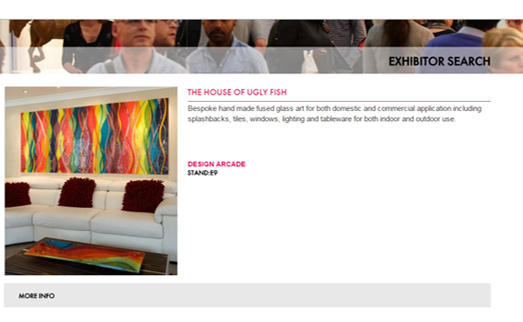 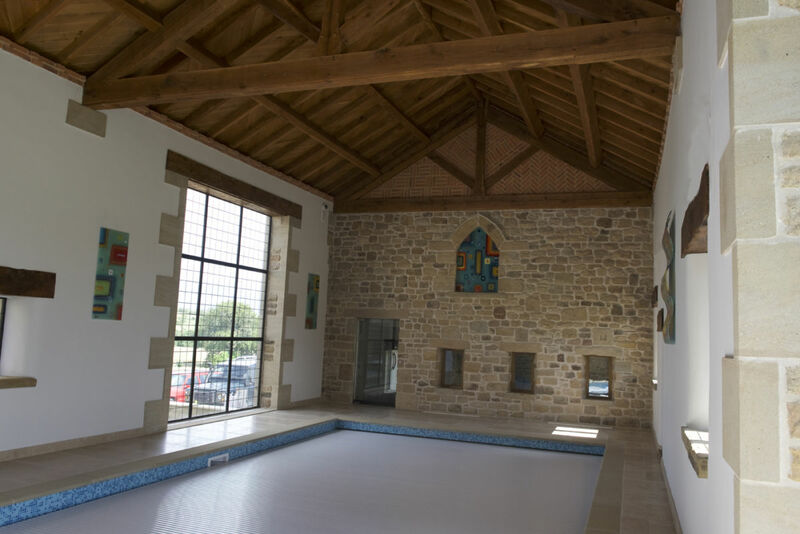 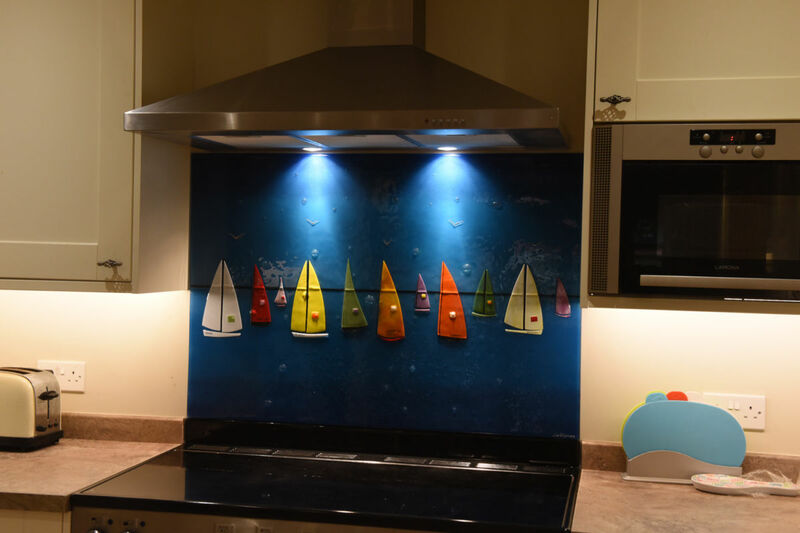 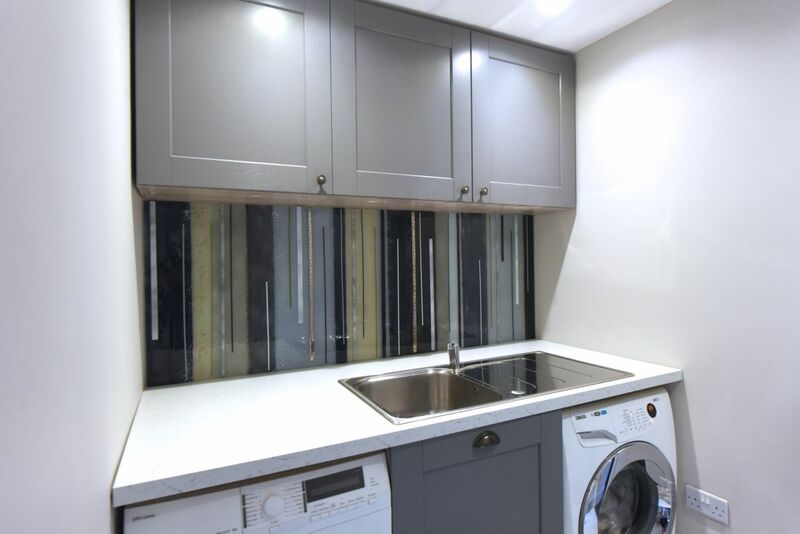 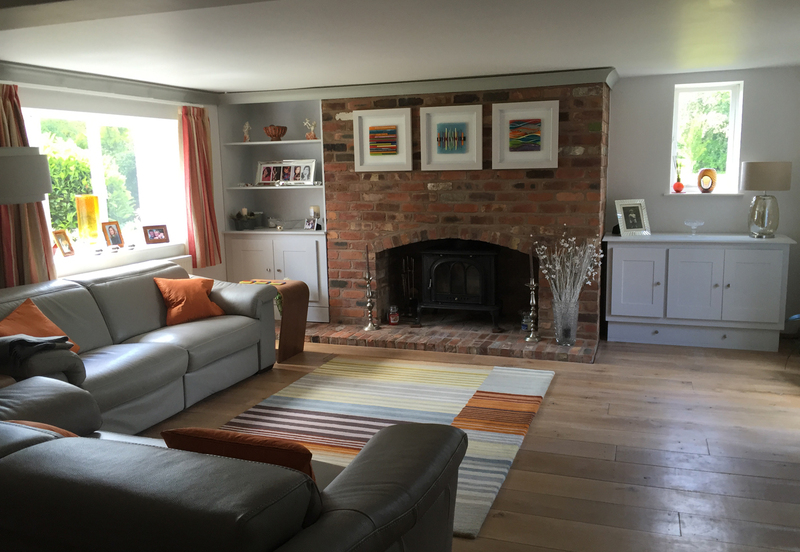 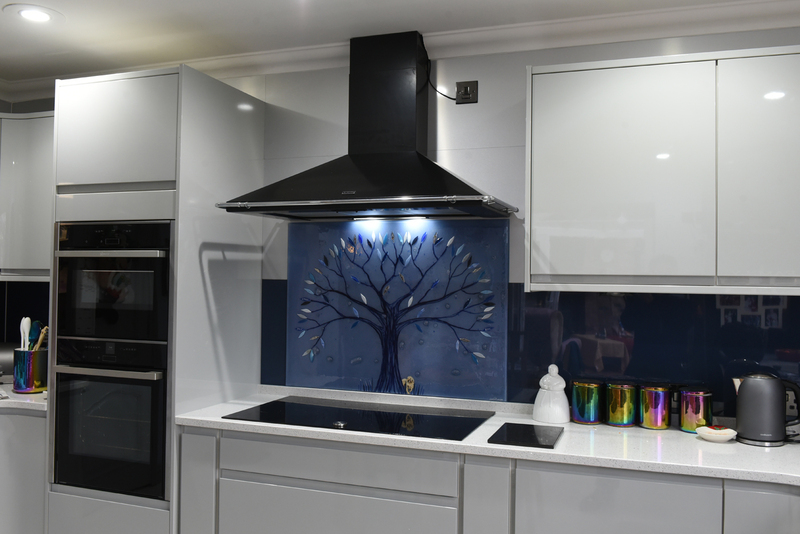 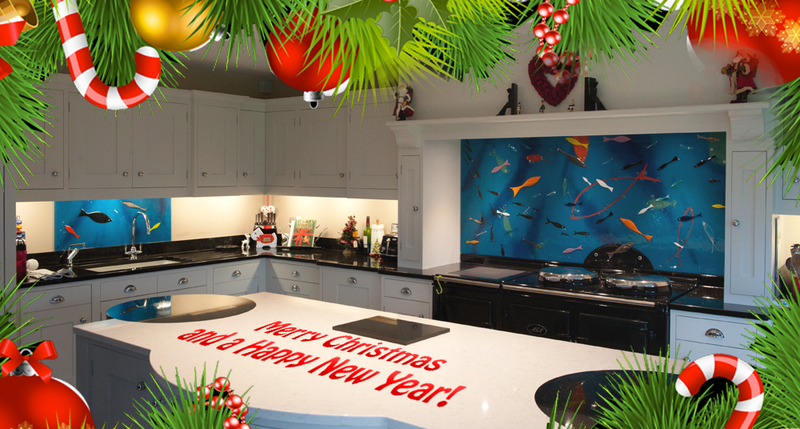 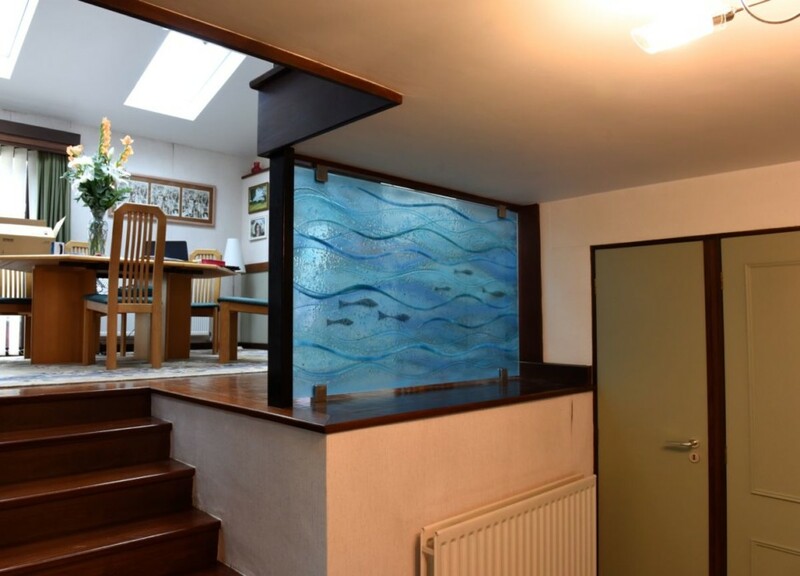 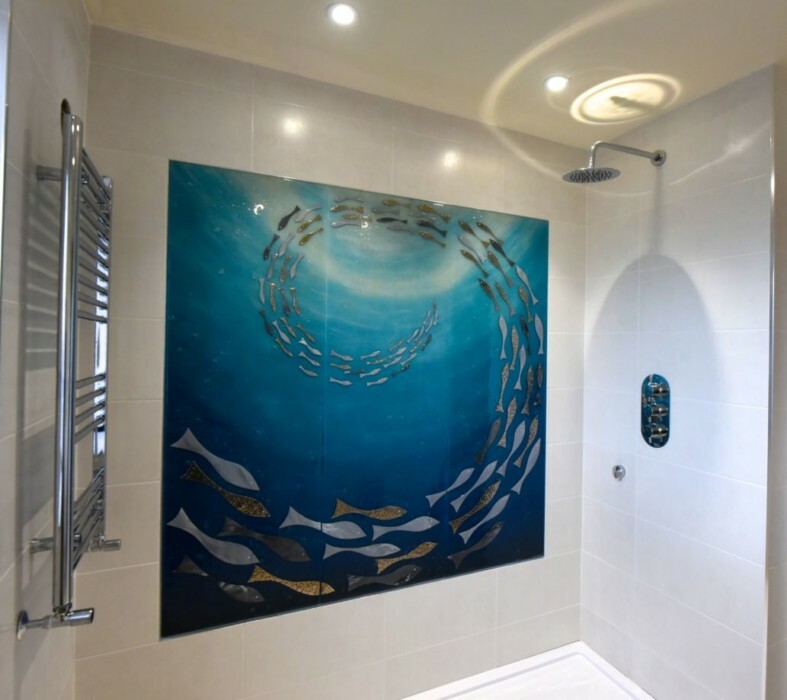 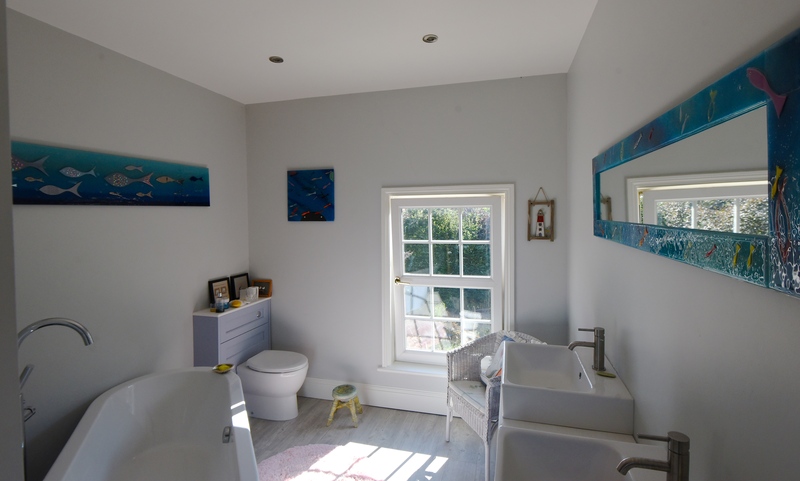 We here at The House of Ugly Fish are always ready and waiting to get started on brand new bespoke fused glass splashbacks, wall panels and more, so make sure that your name isn’t too far down our ever expanding list of customers. 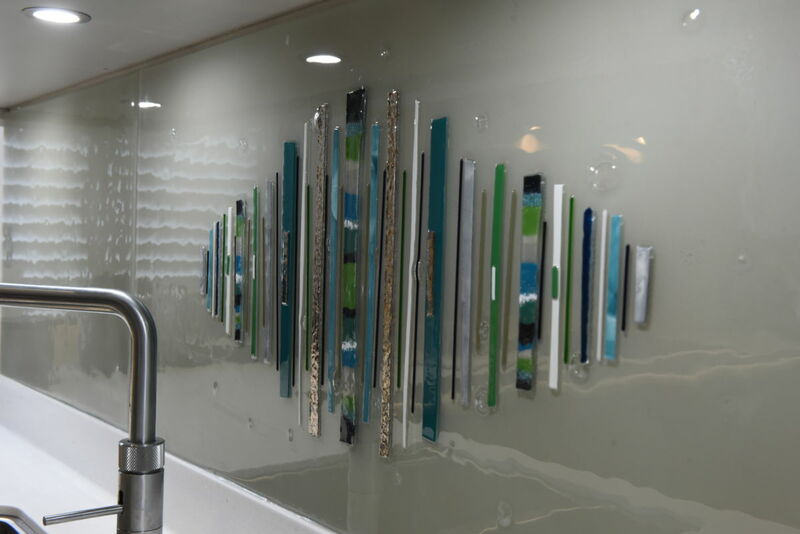 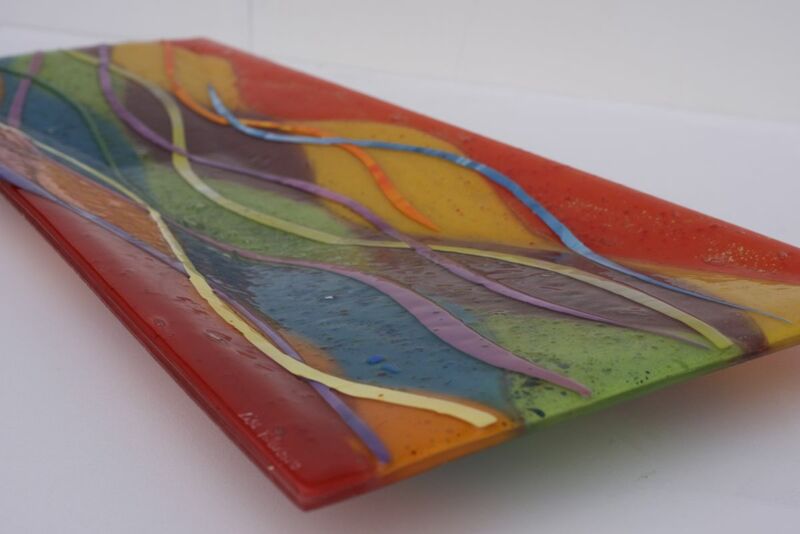 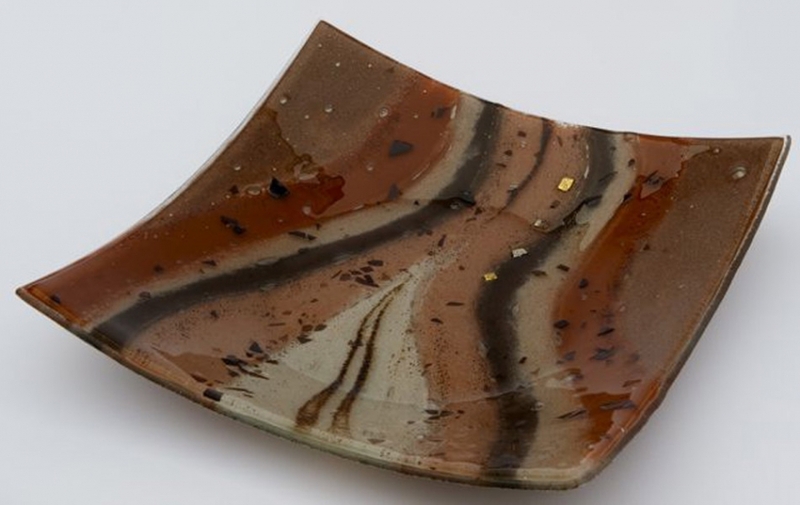 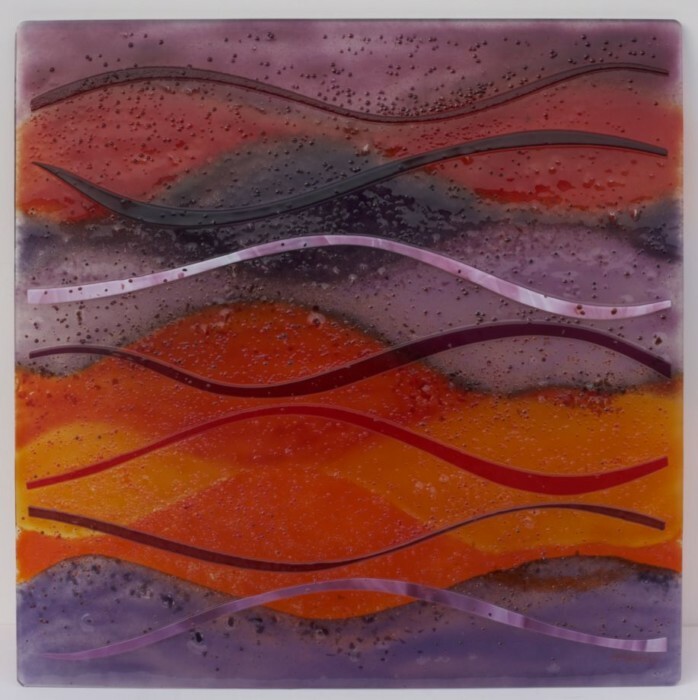 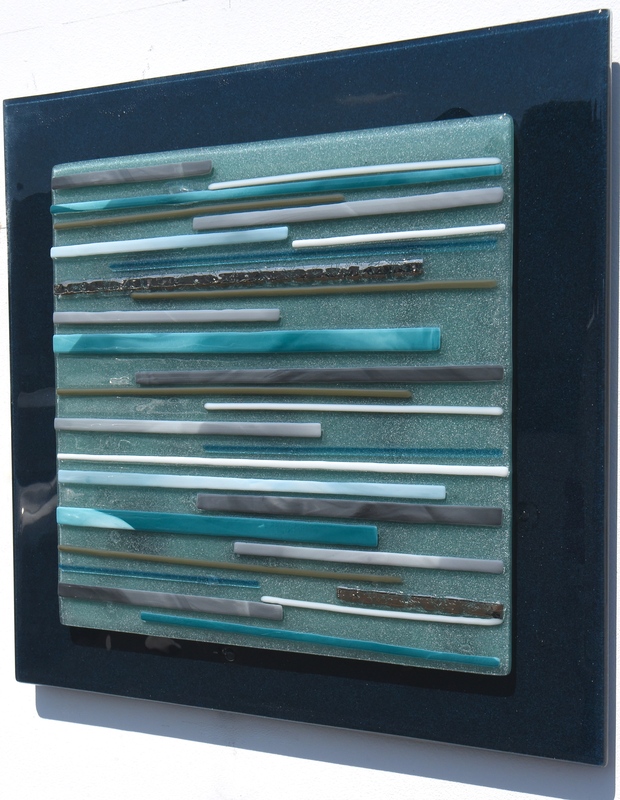 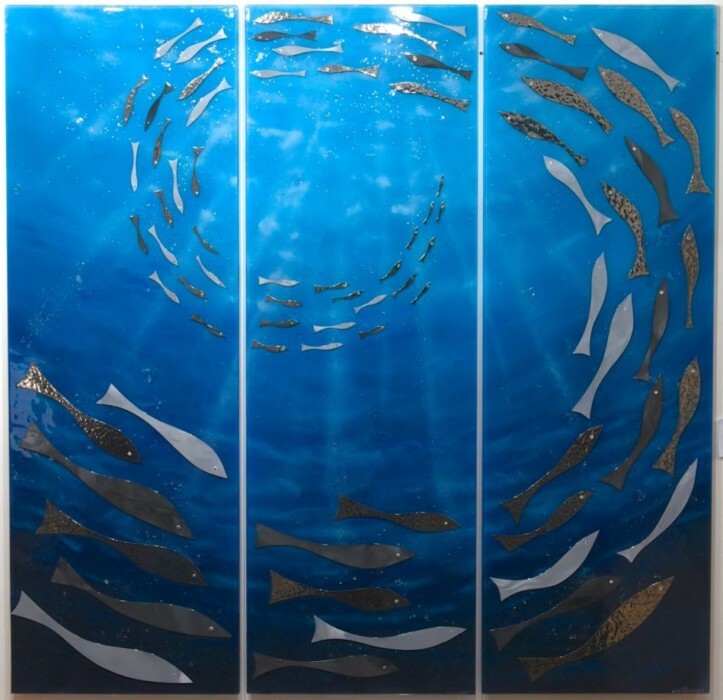 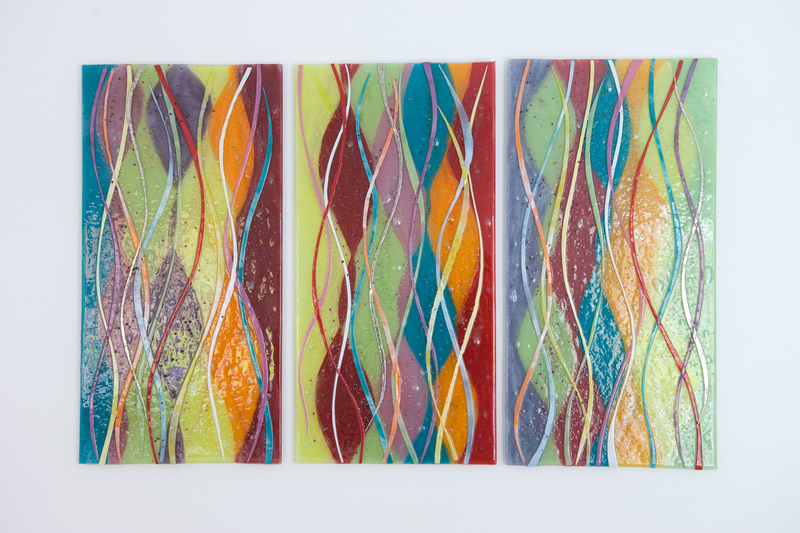 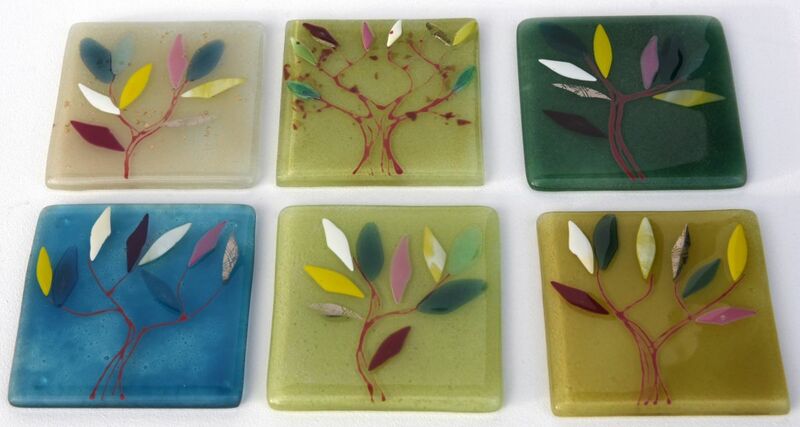 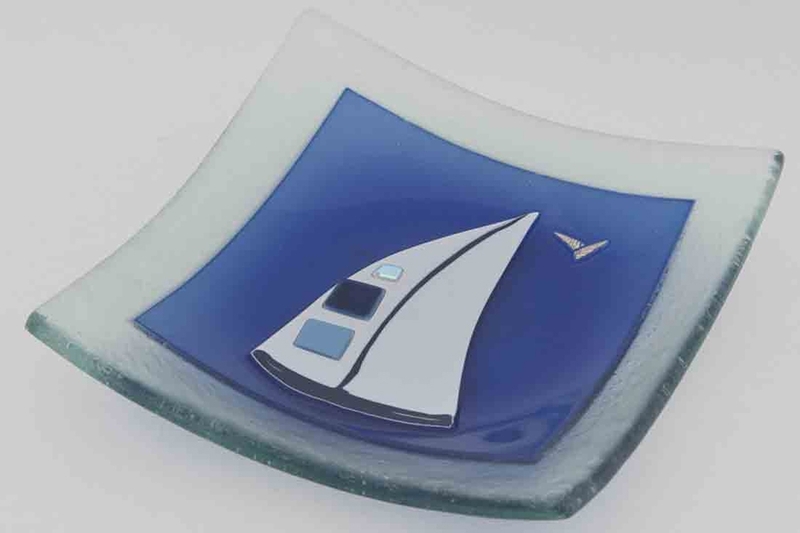 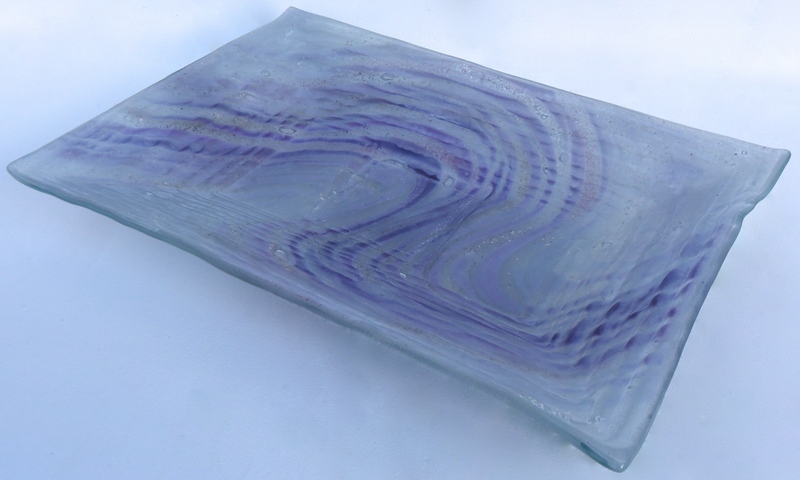 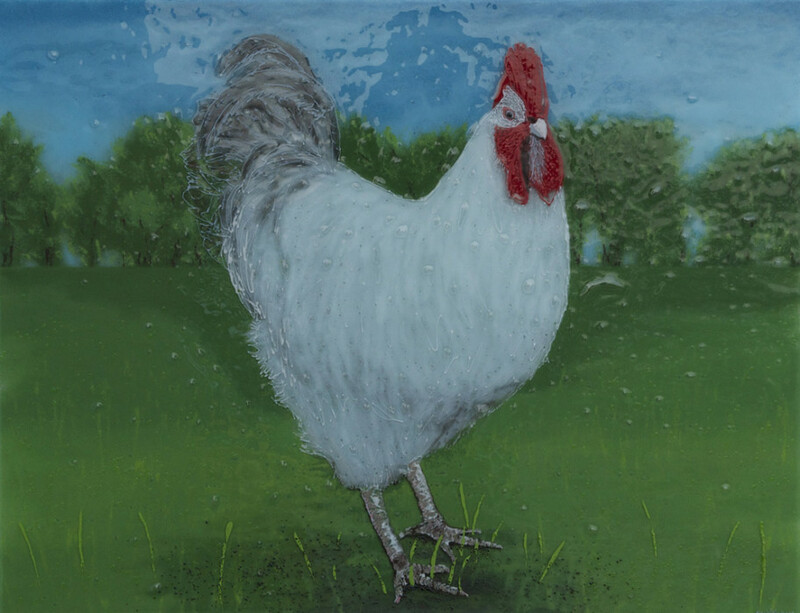 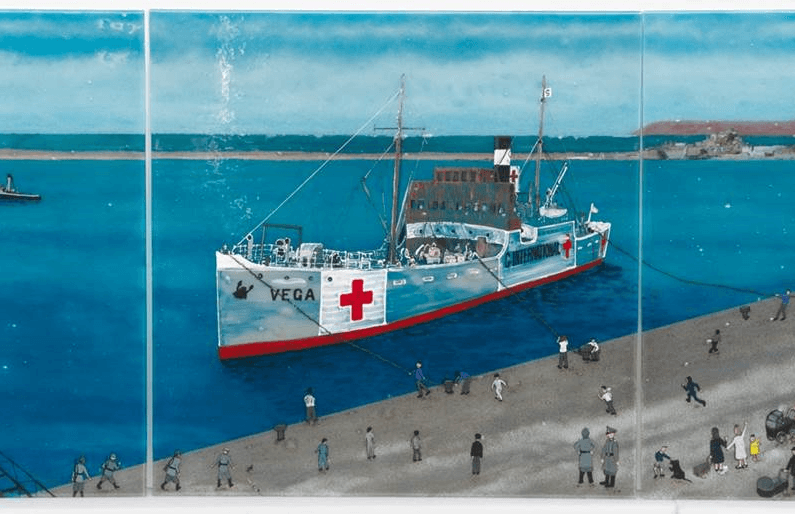 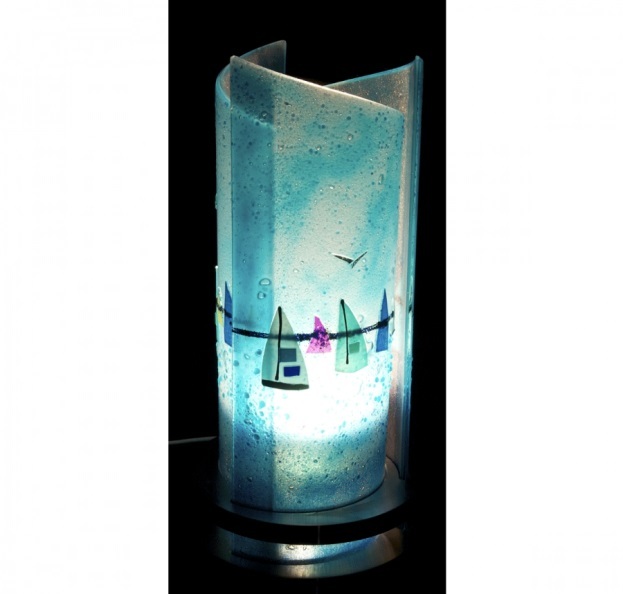 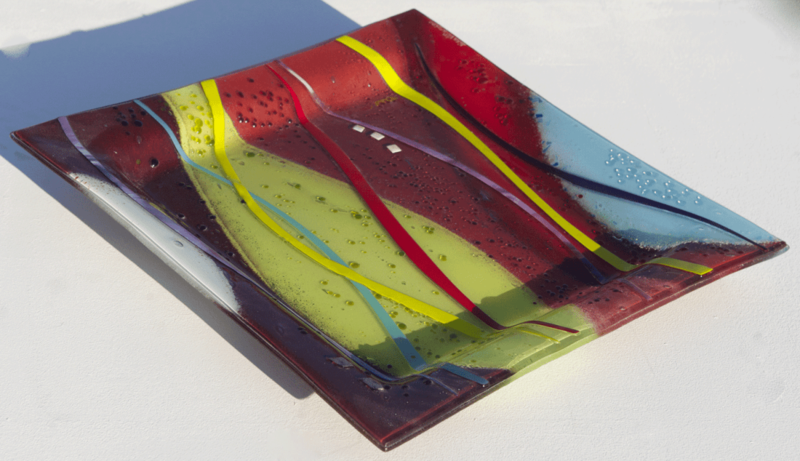 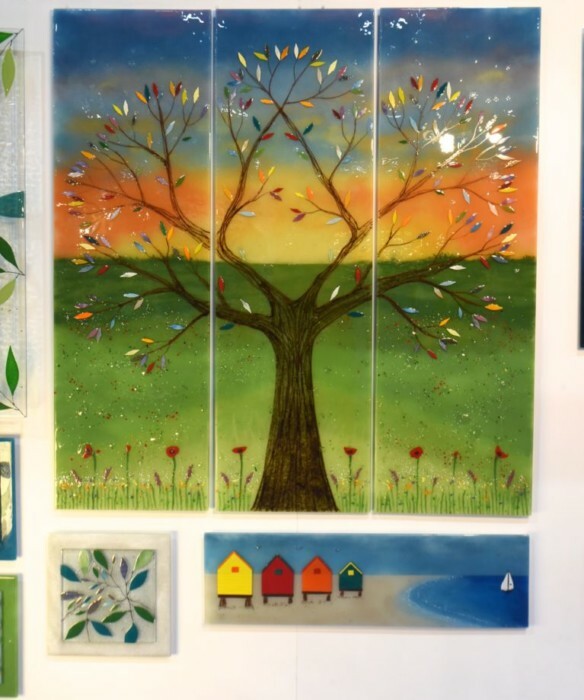 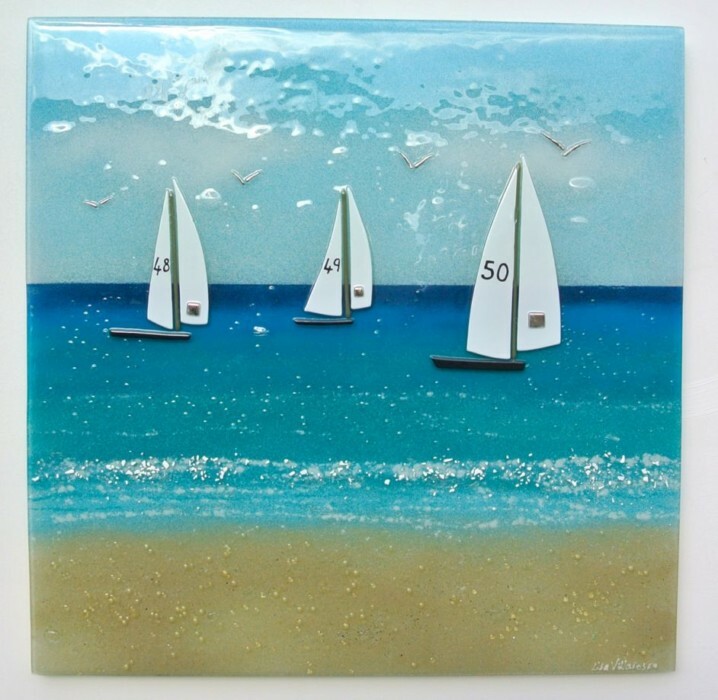 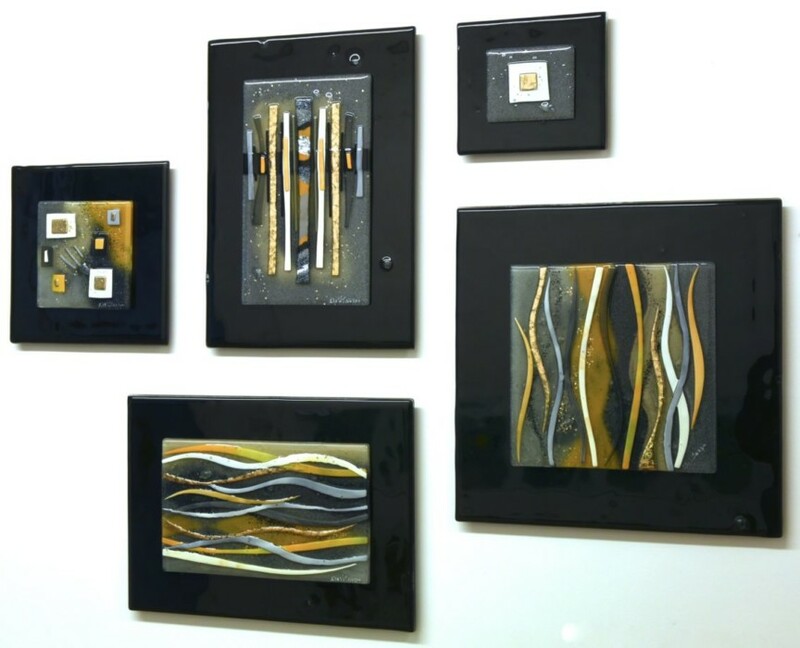 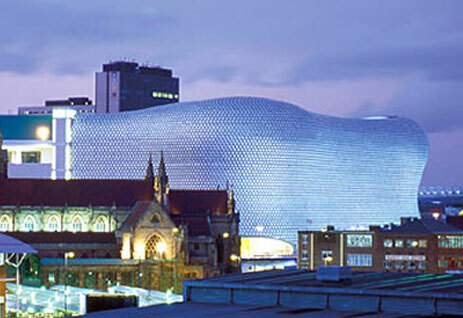 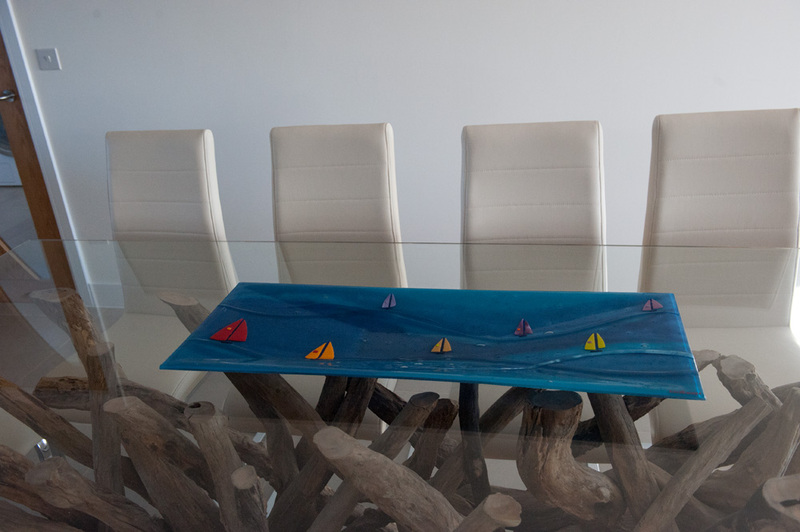 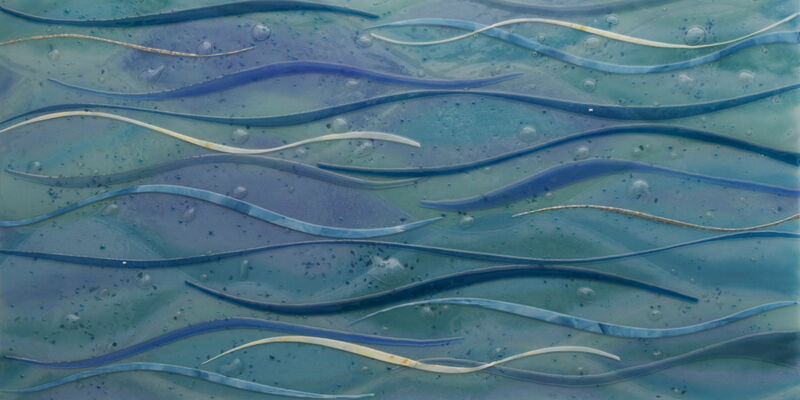 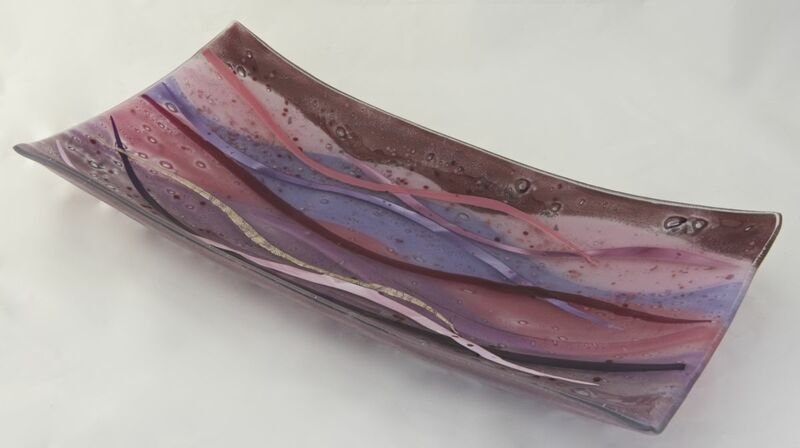 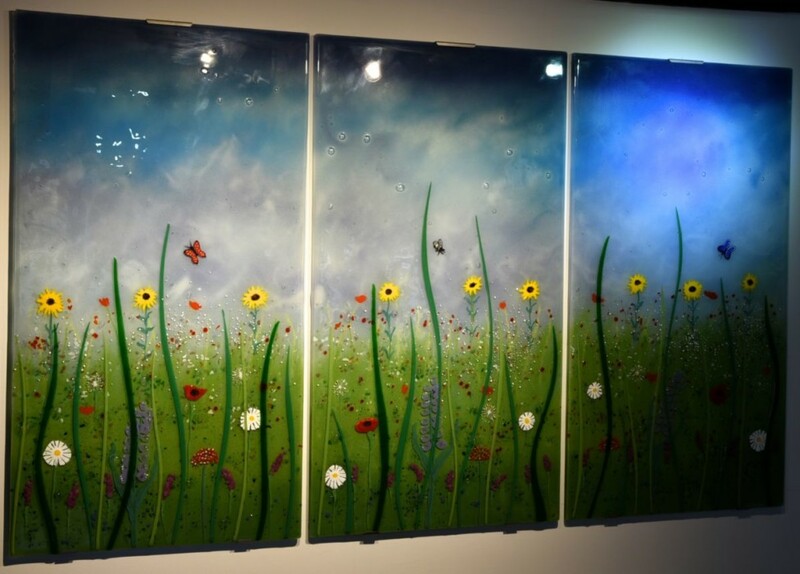 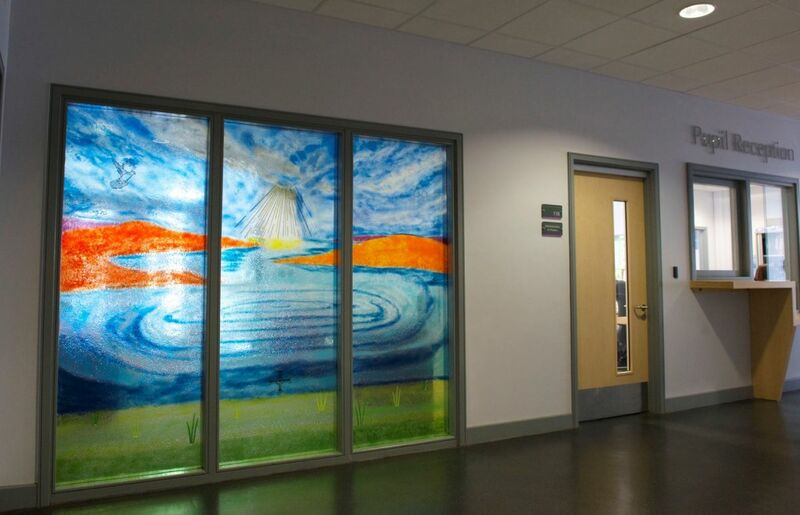 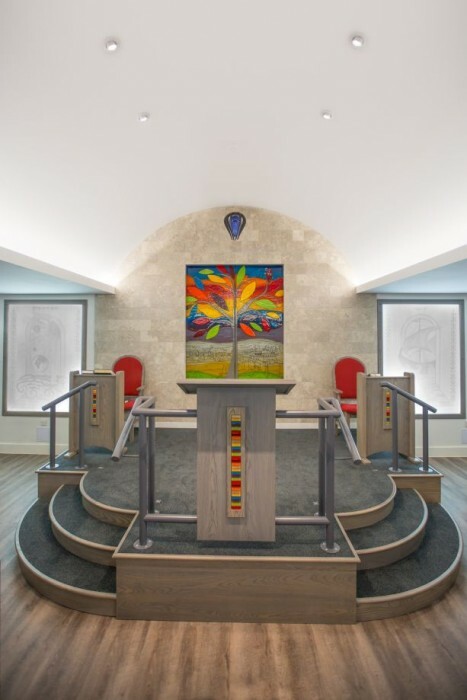 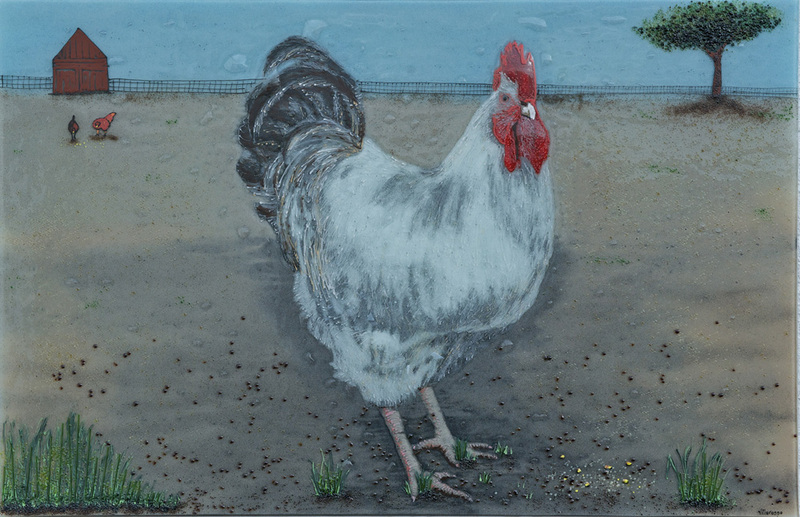 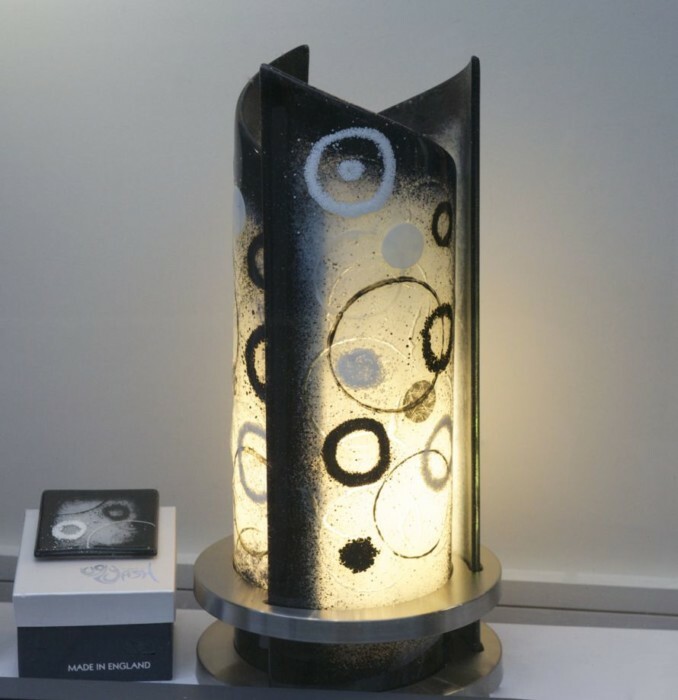 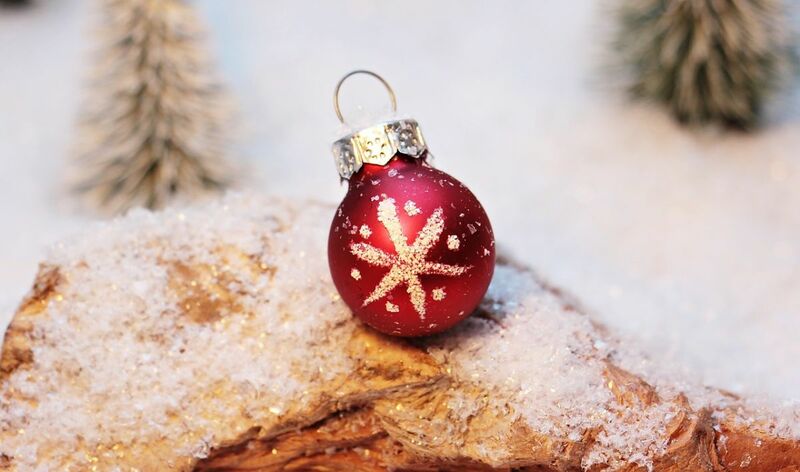 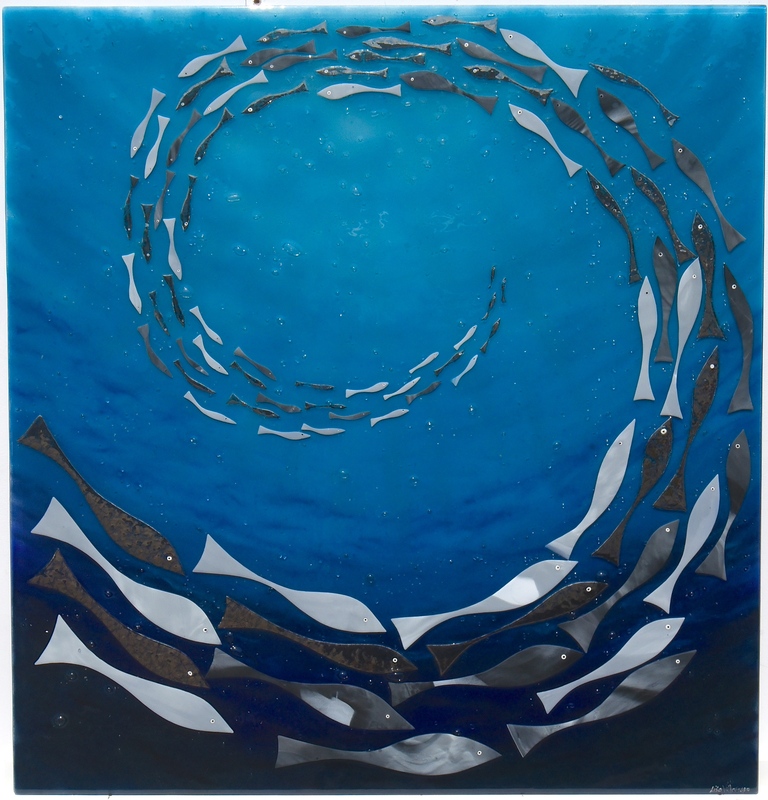 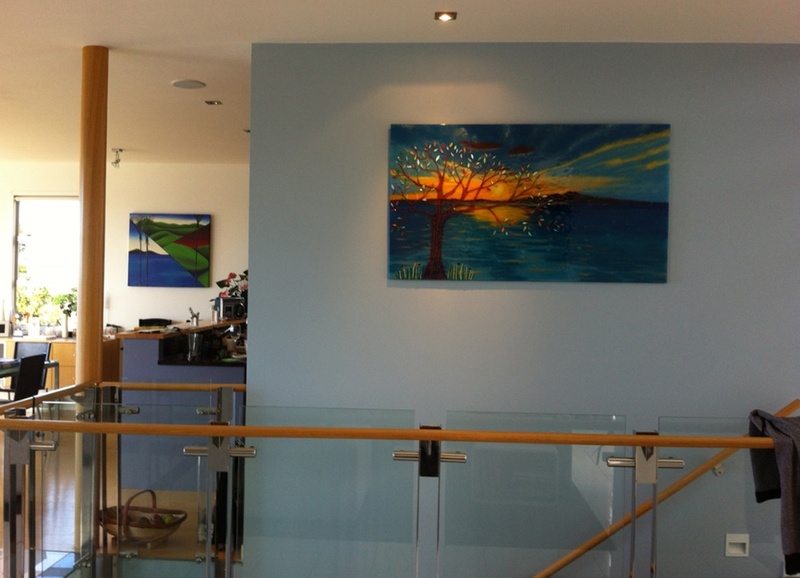 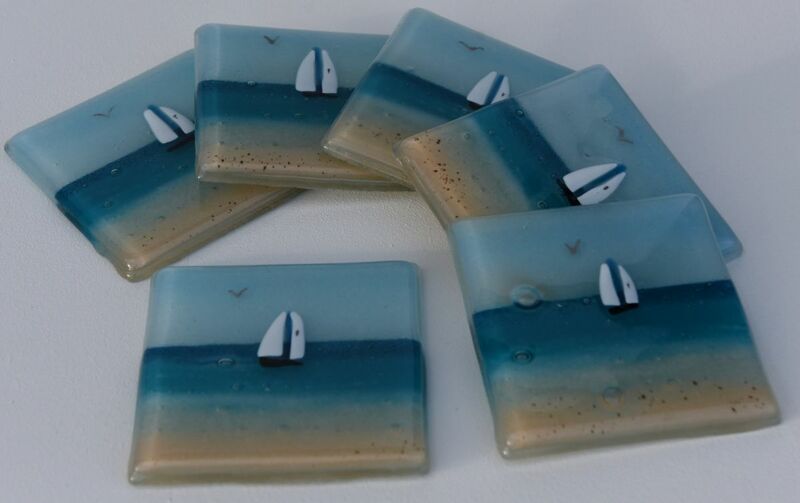 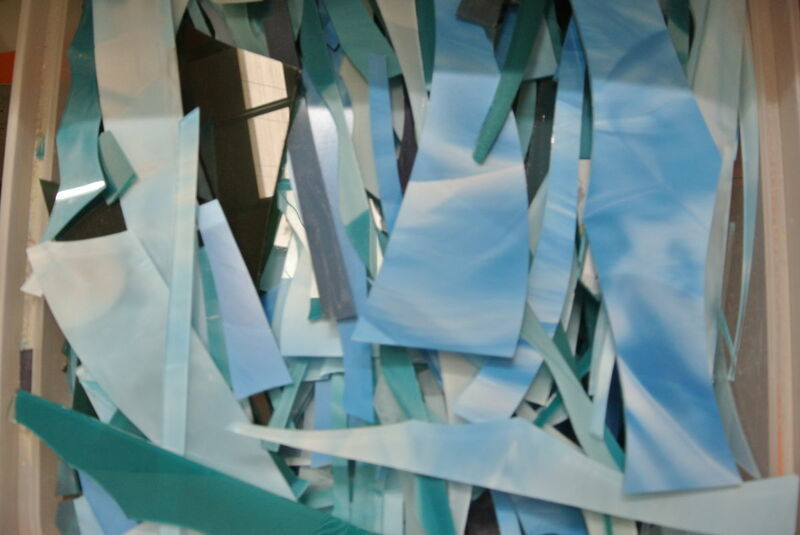 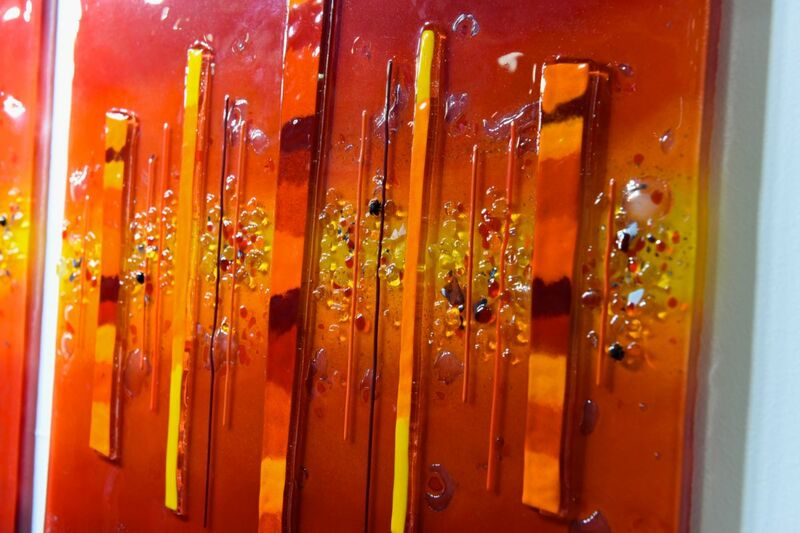 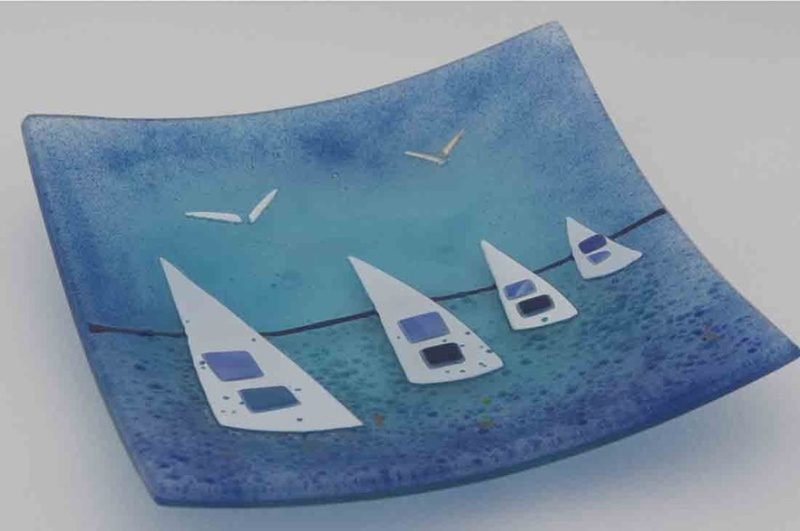 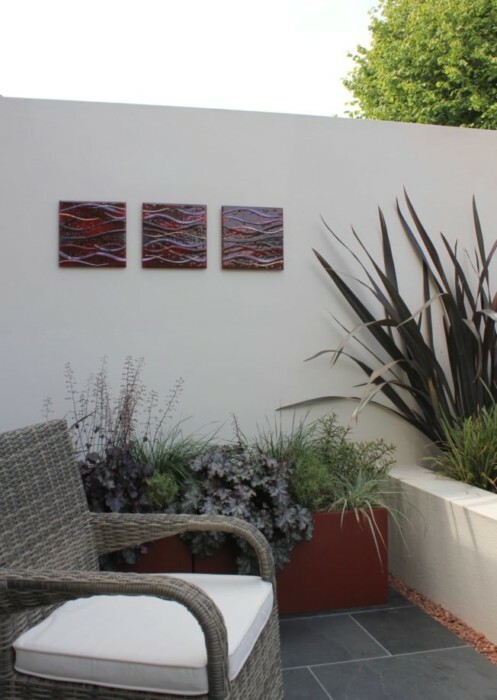 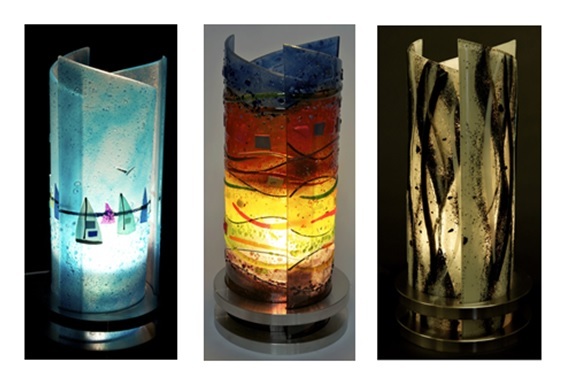 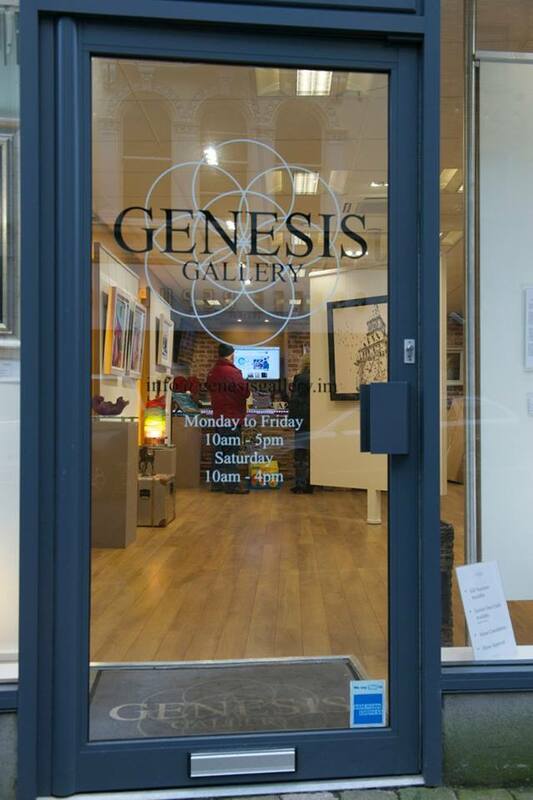 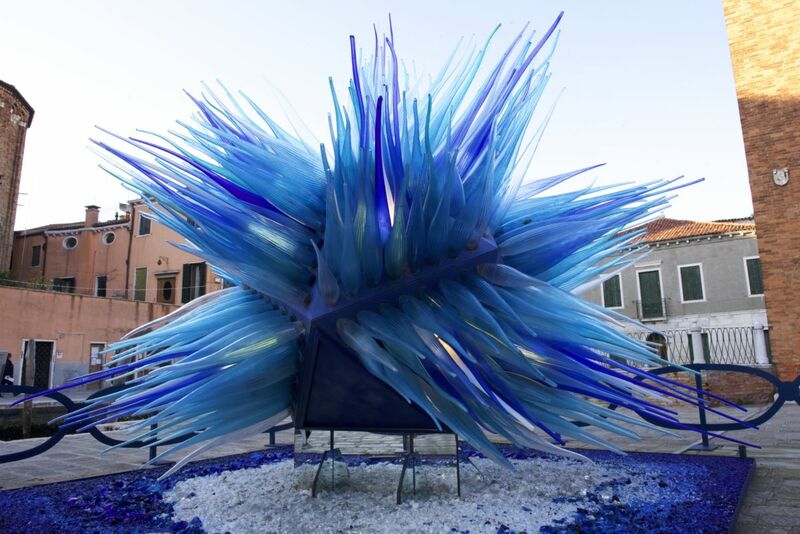 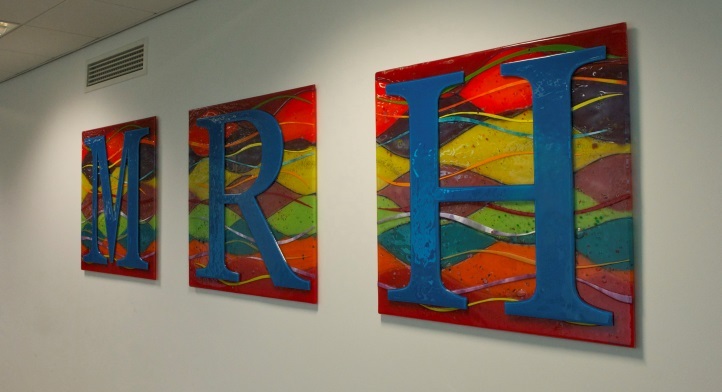 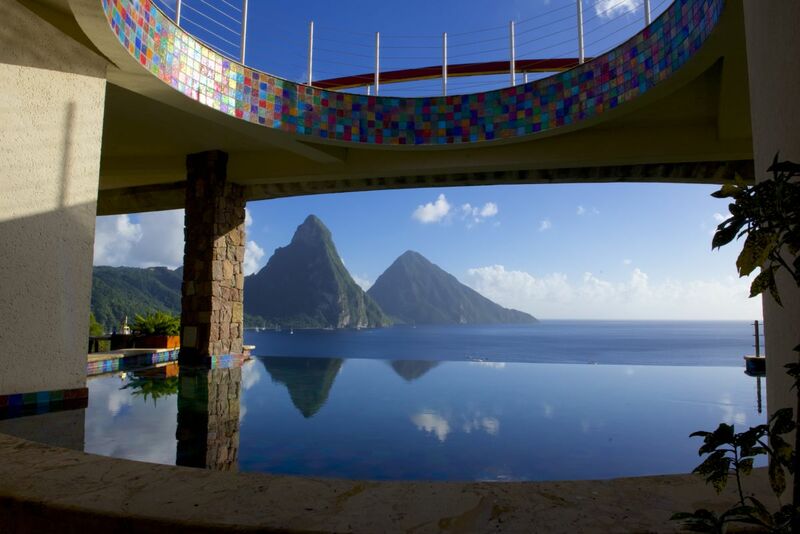 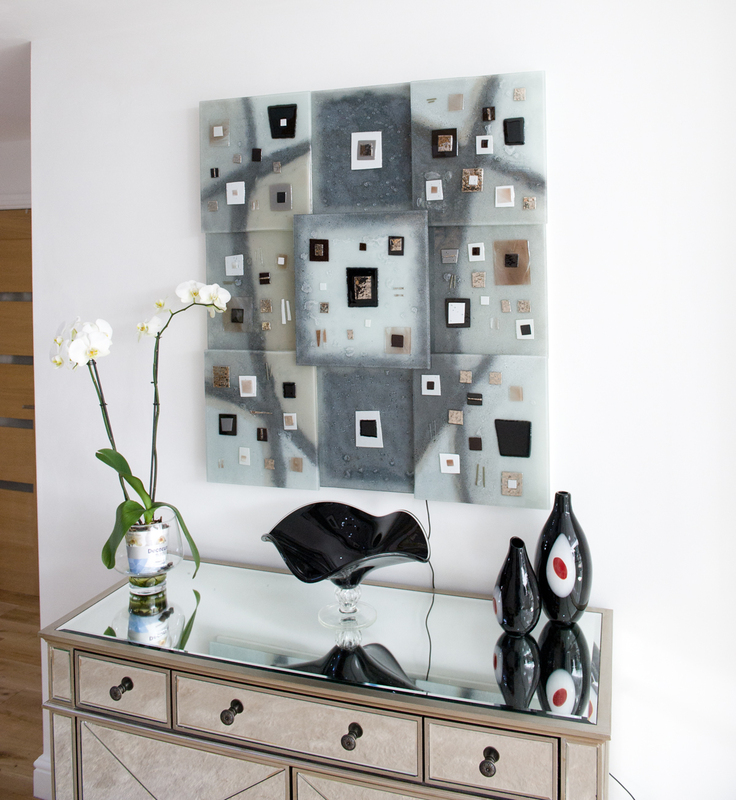 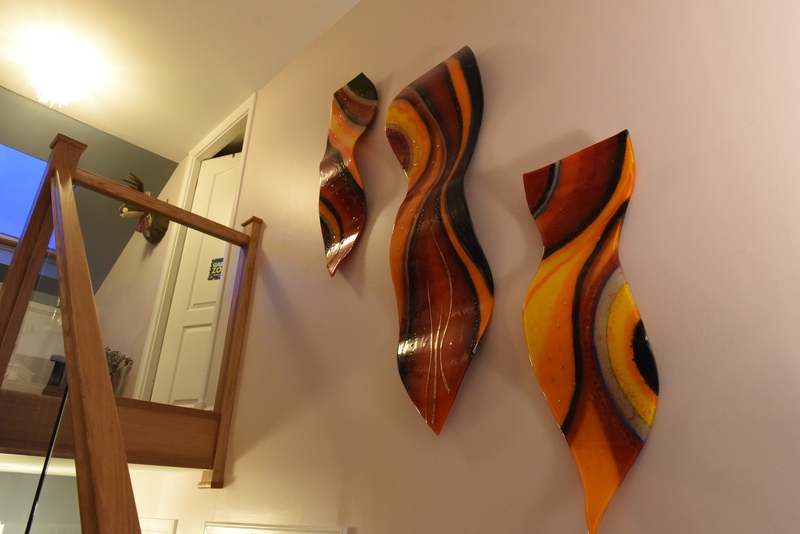 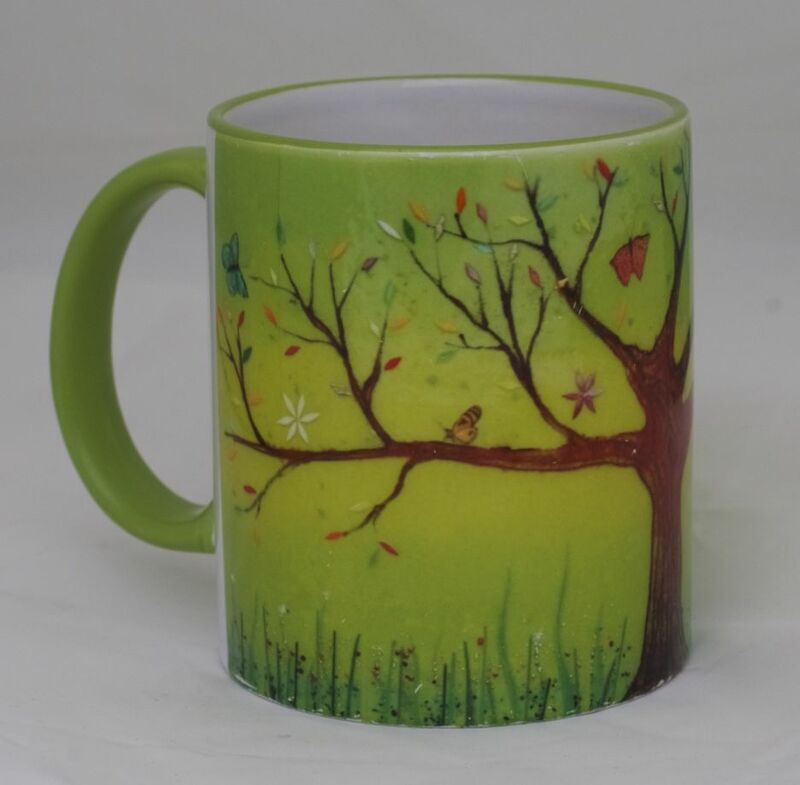 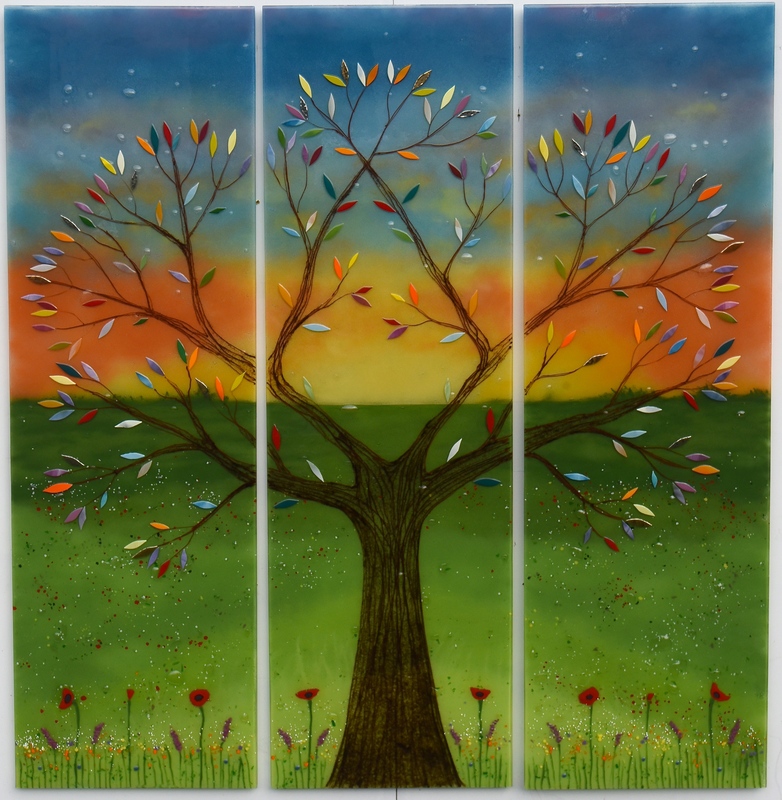 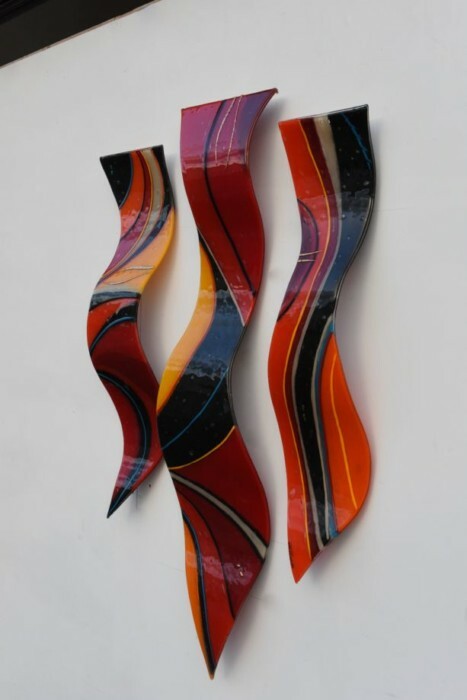 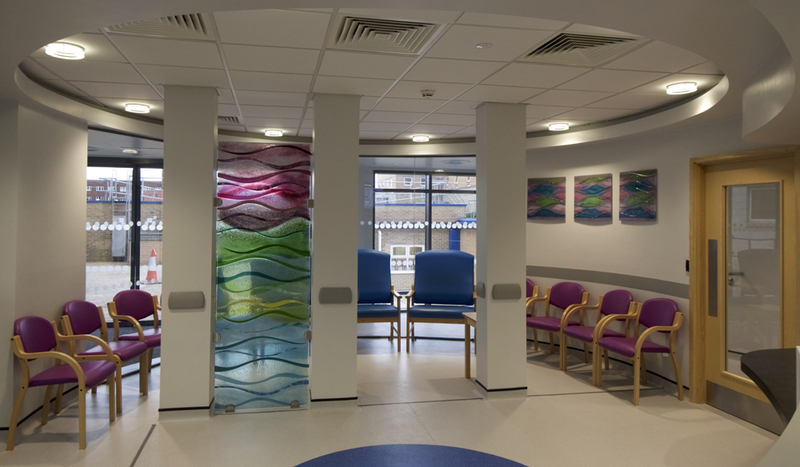 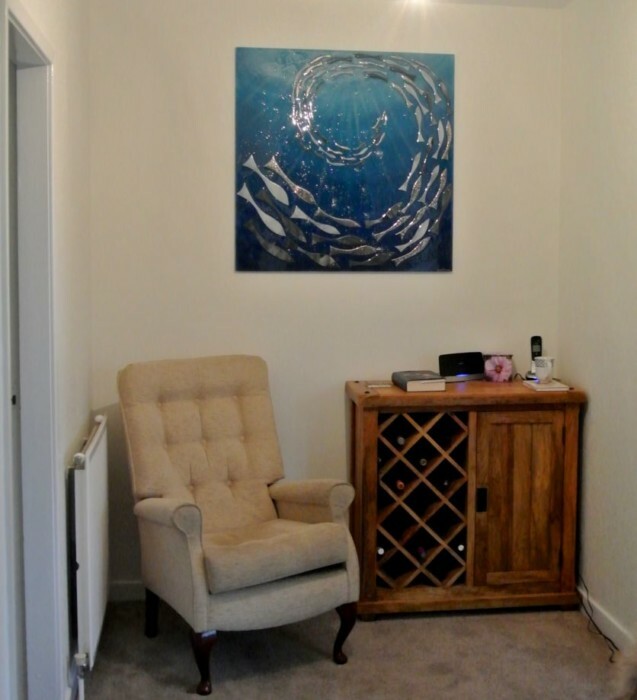 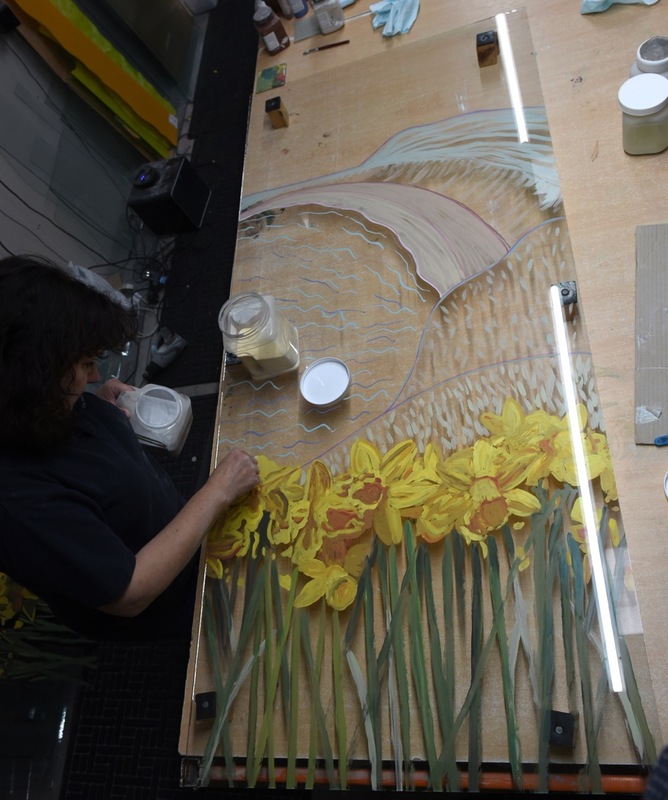 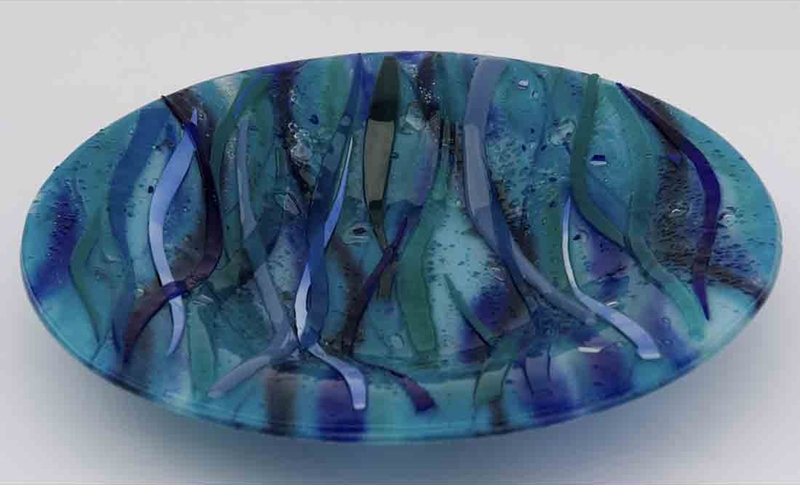 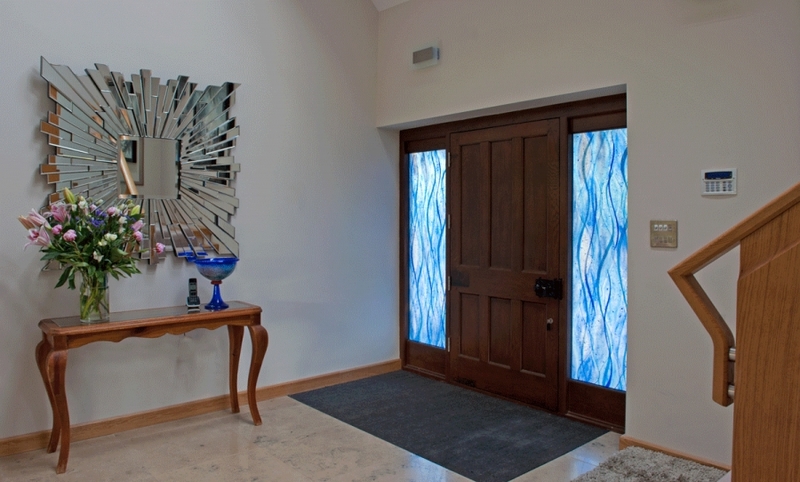 It would be our pleasure to bring the fused glass art of your dreams to life! 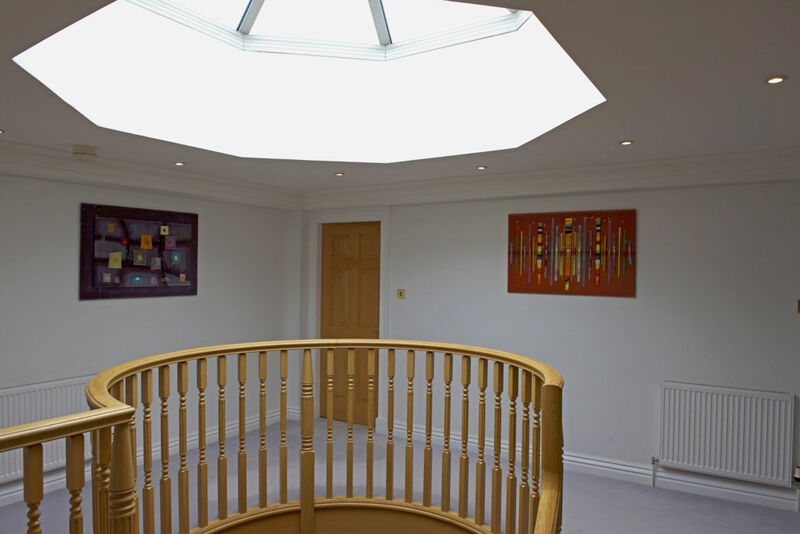 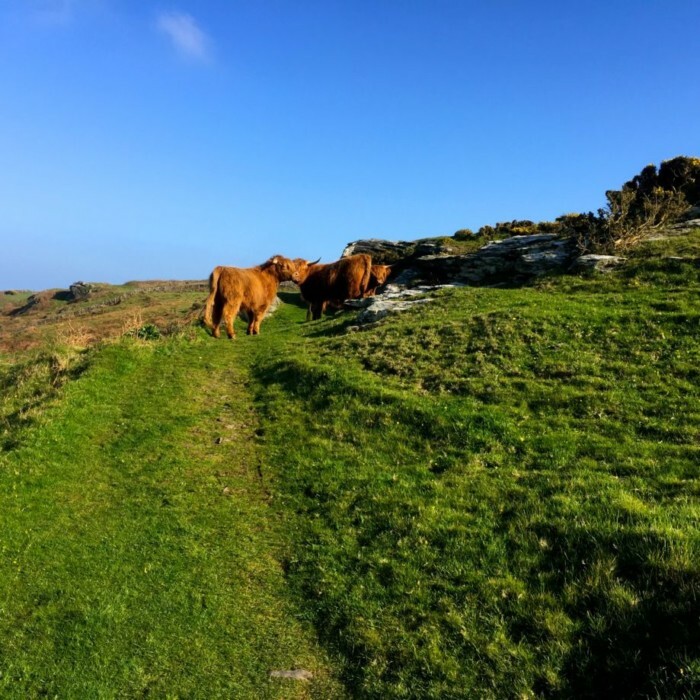 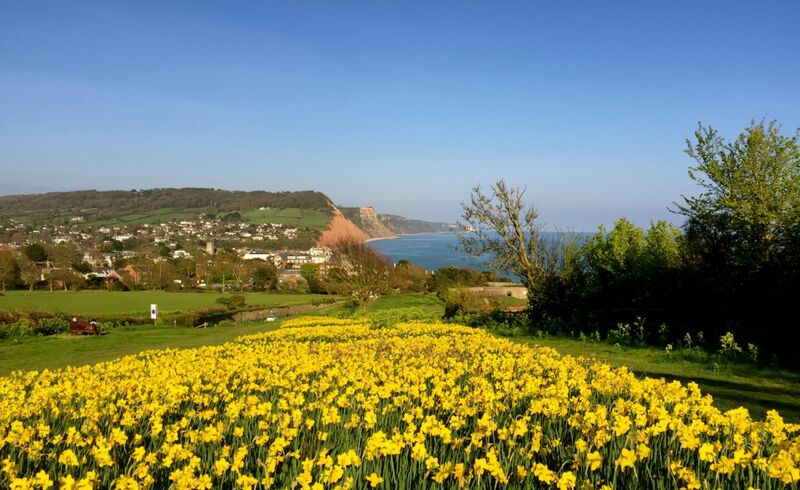 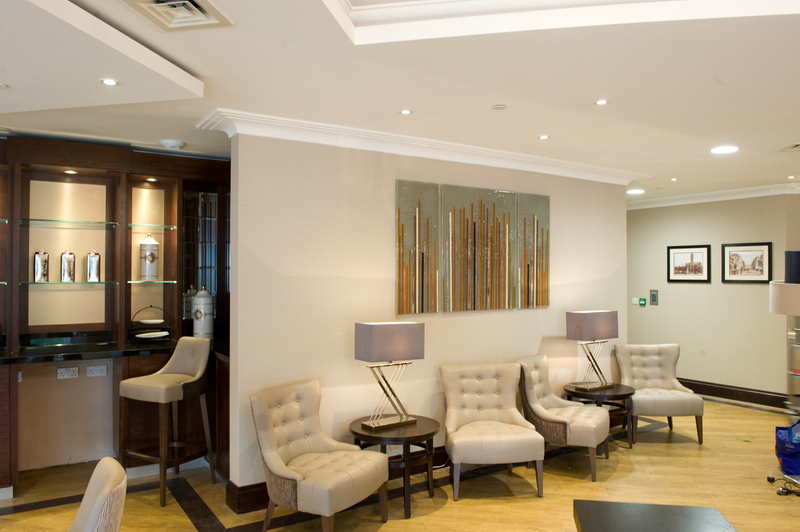 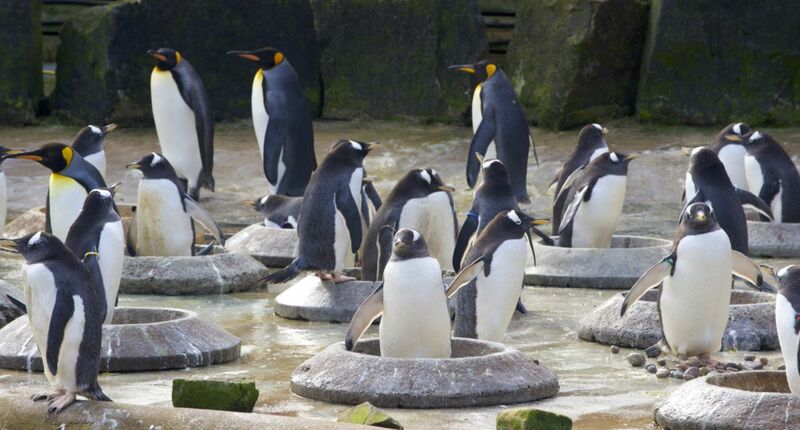 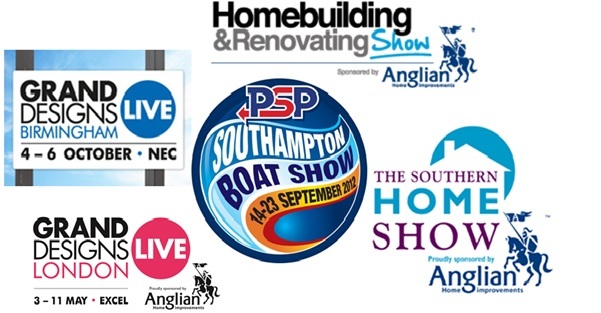 Don’t hesitate to get in contact as soon as you can, either by phone or by email. 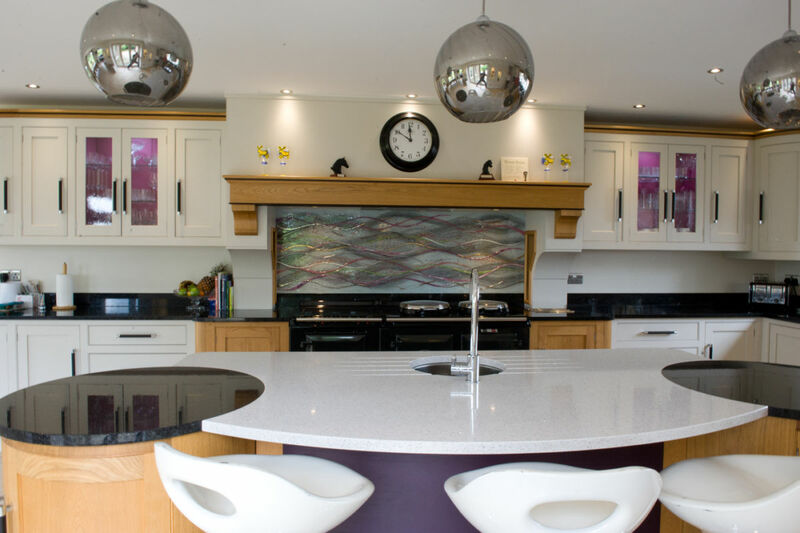 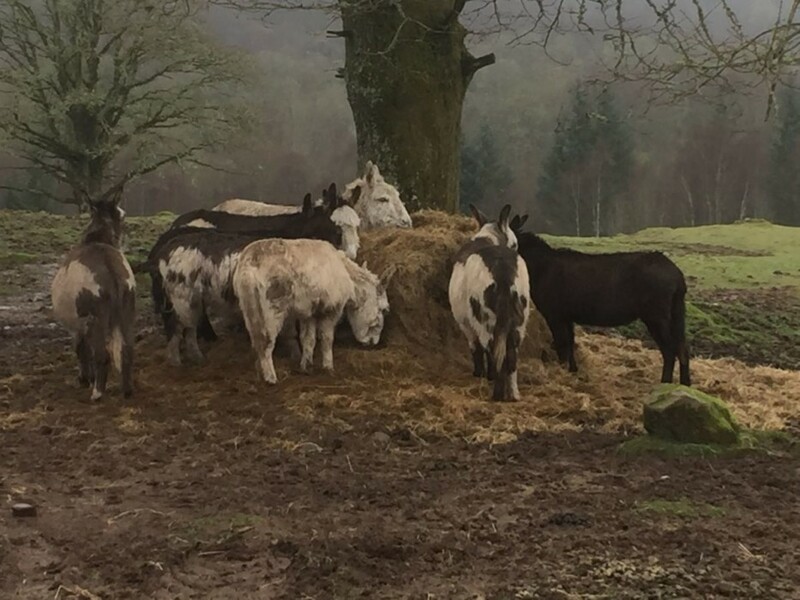 You can pick up the phone to discuss your every need and requirement or you can just as easily drop us an online enquiry via email. 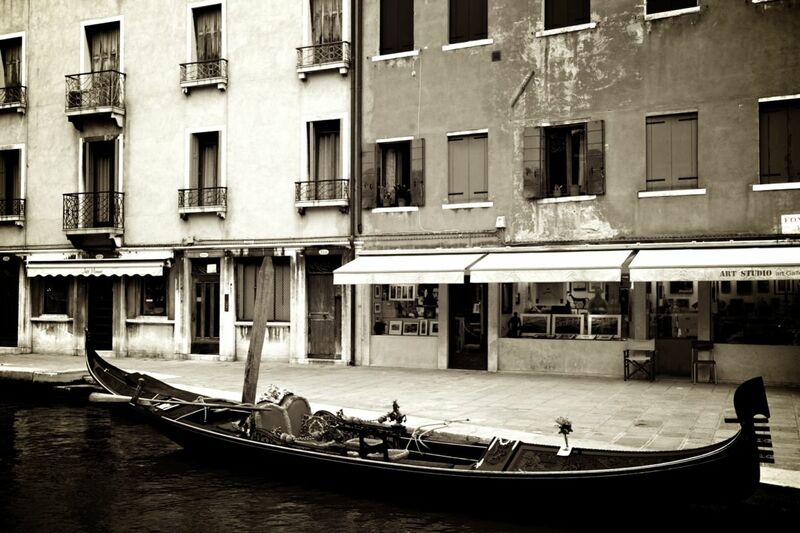 We’ll get back to you in no time at all.